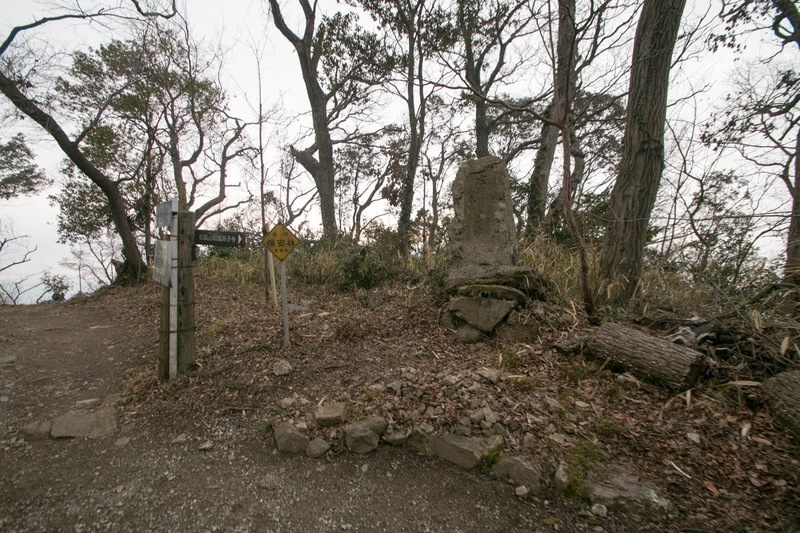 Shigisan castle (信貴山城) is located at the top of Shigisan mountain, a 400 meter high one exists at the border of Nara prefecture and Osaka prefecture. 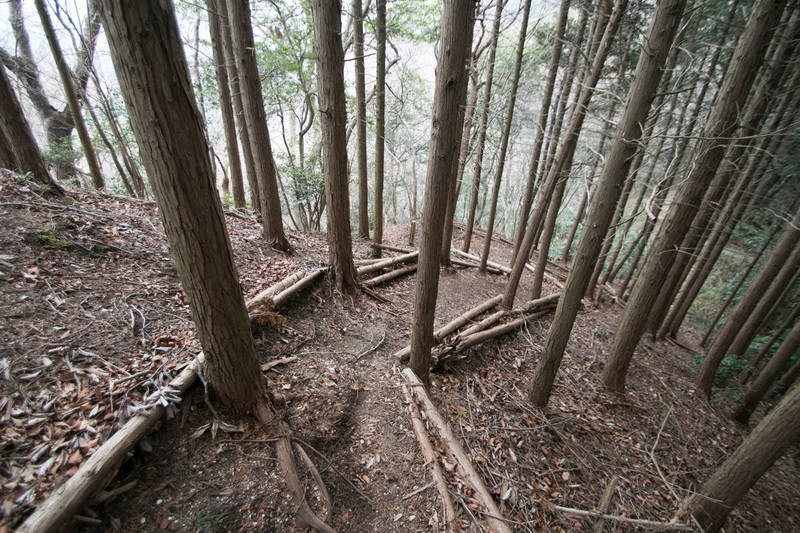 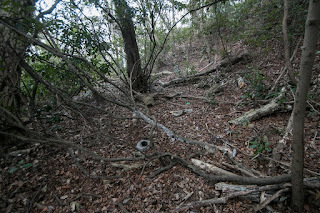 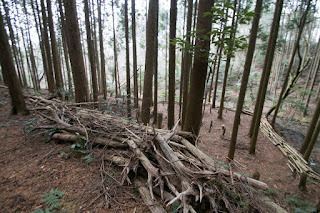 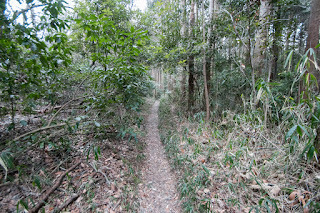 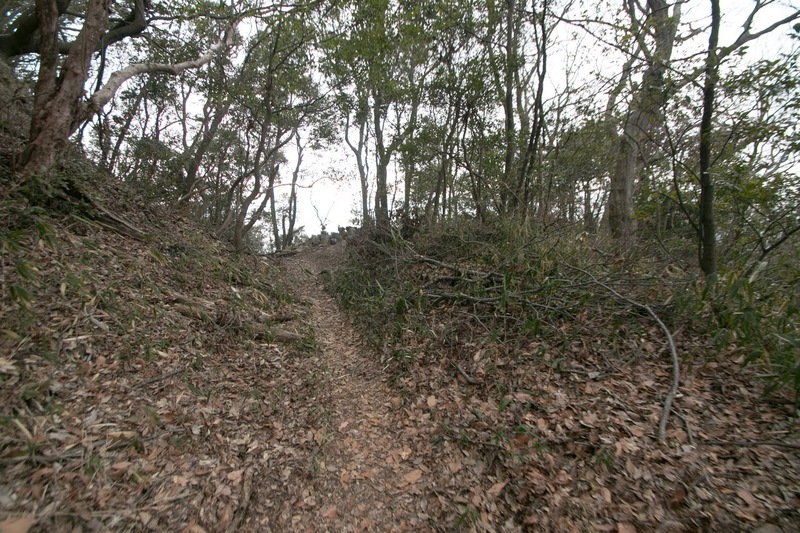 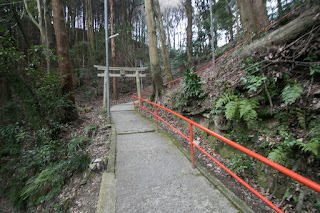 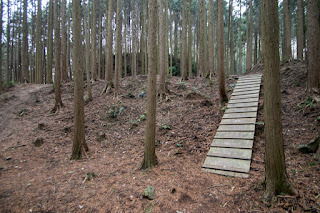 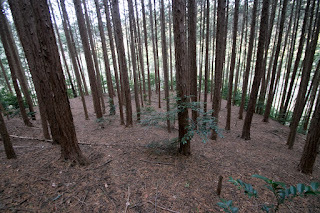 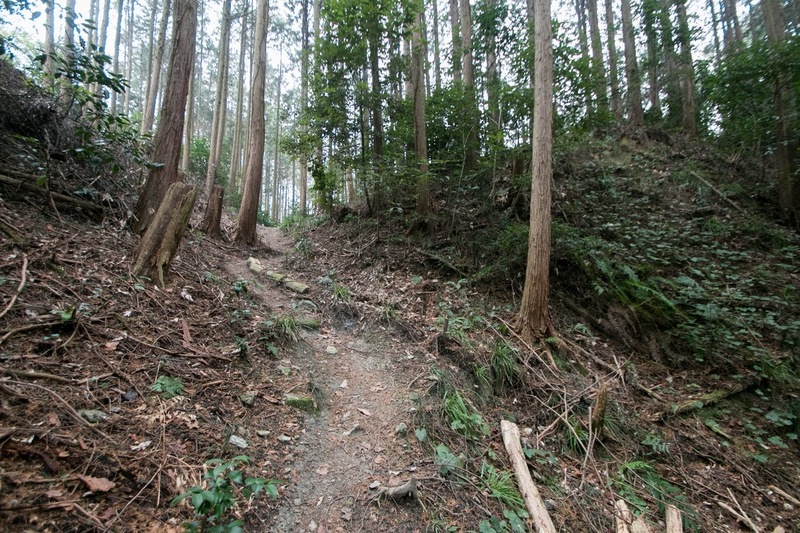 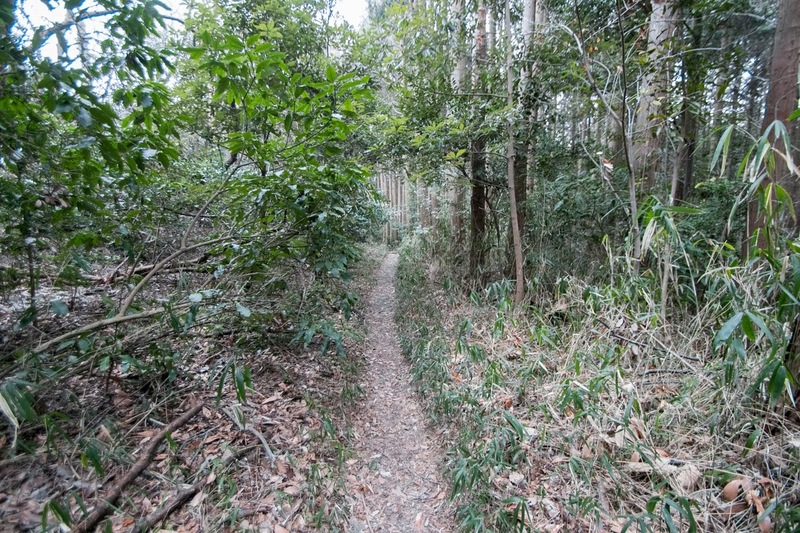 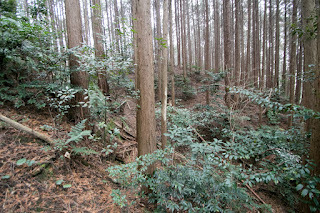 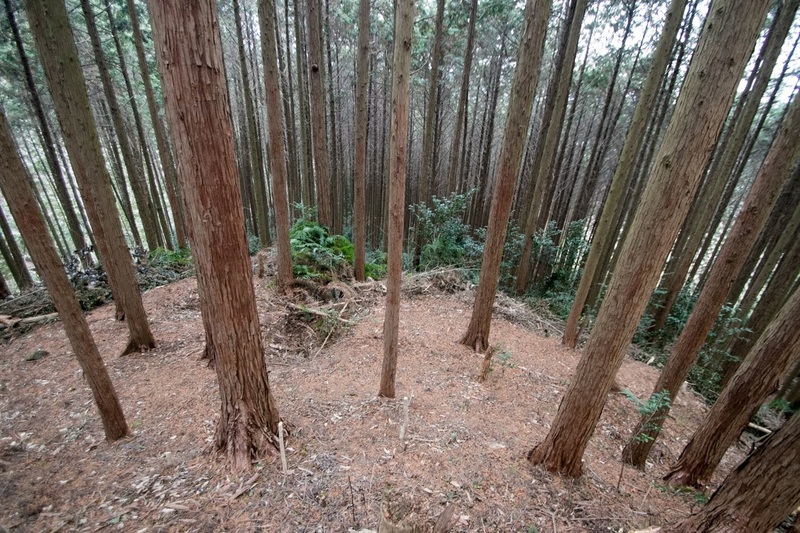 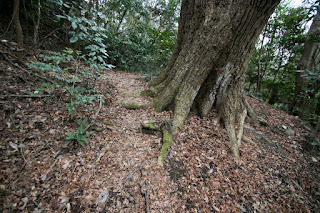 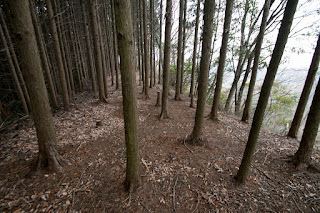 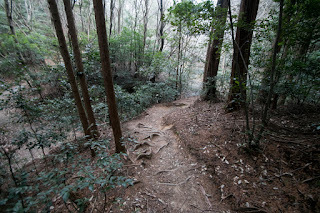 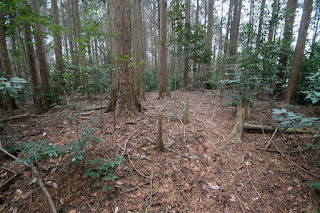 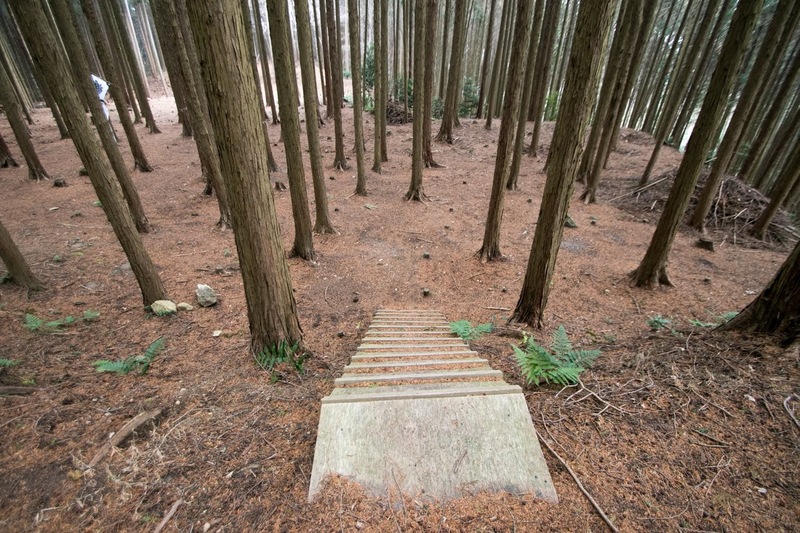 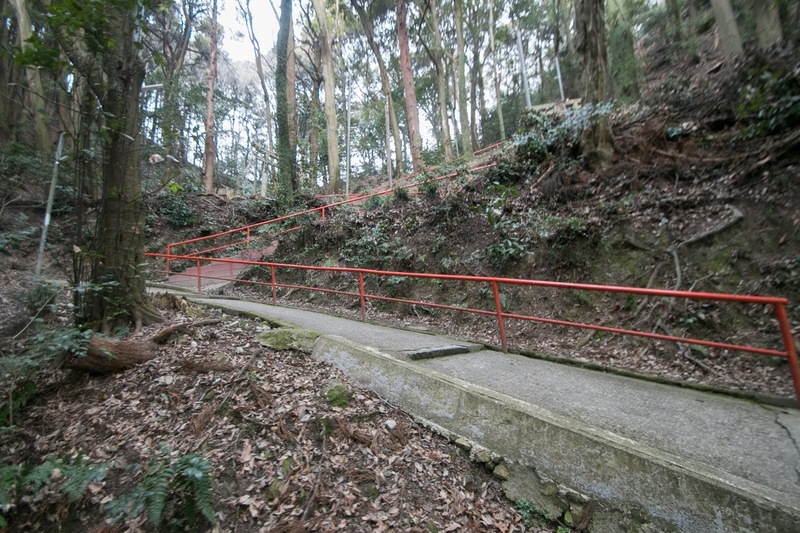 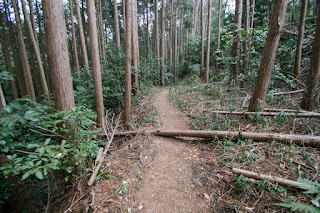 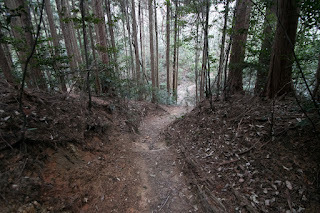 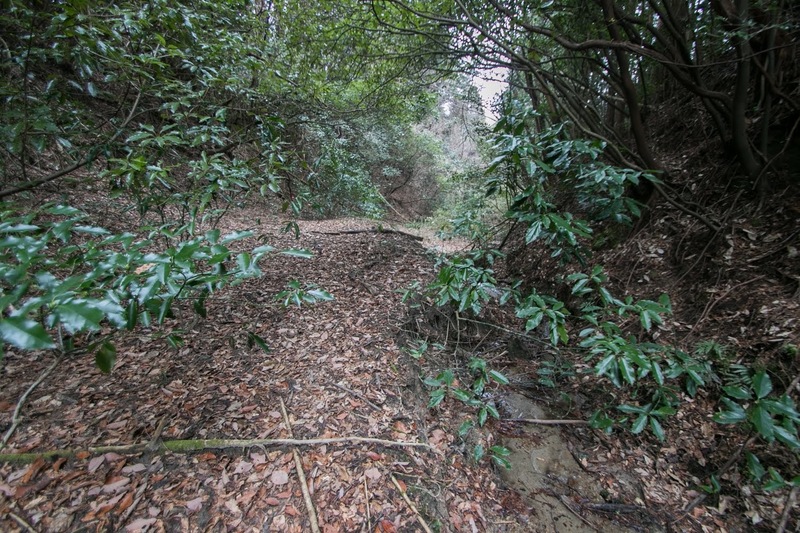 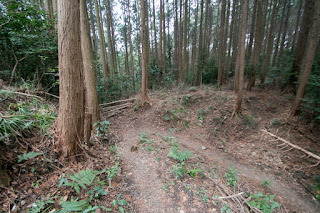 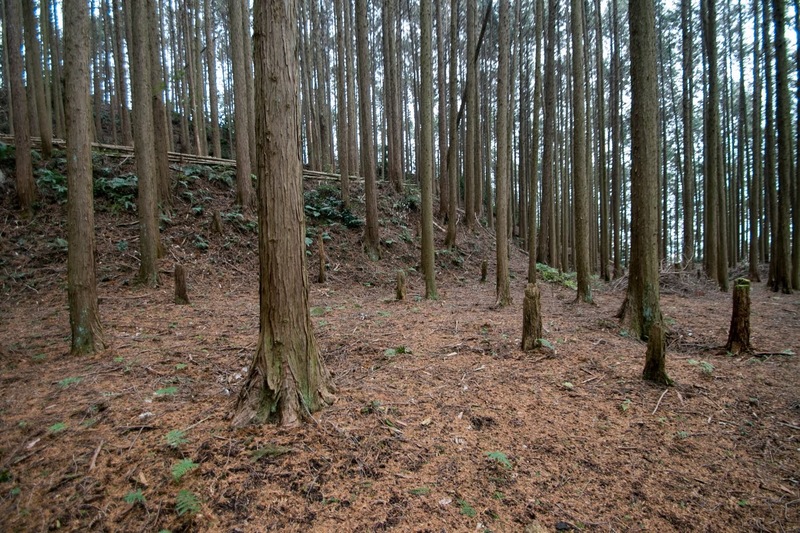 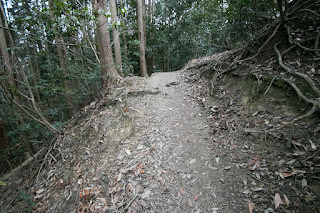 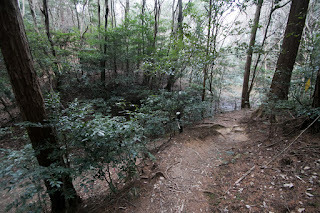 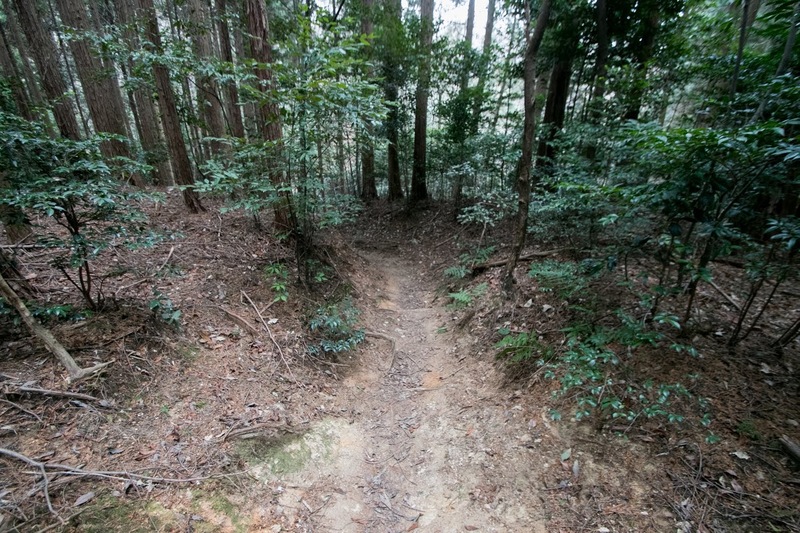 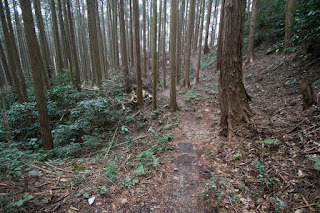 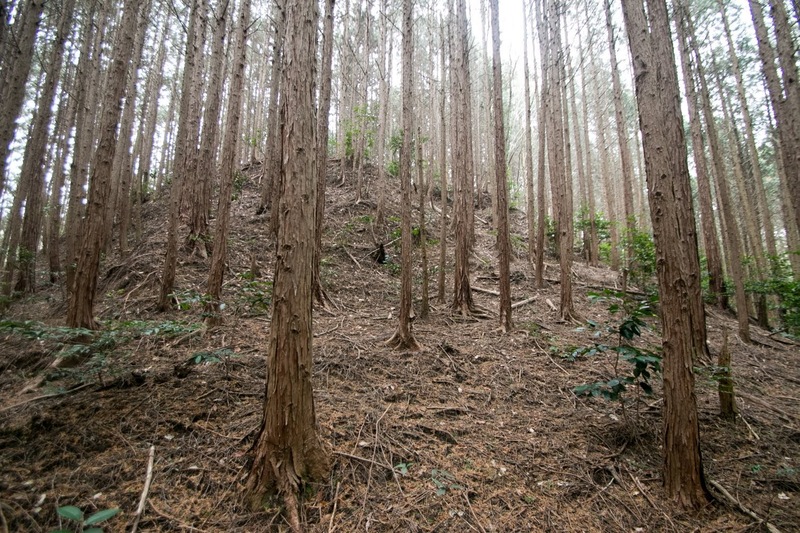 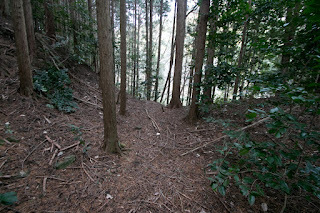 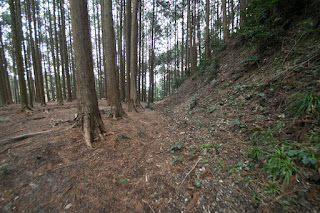 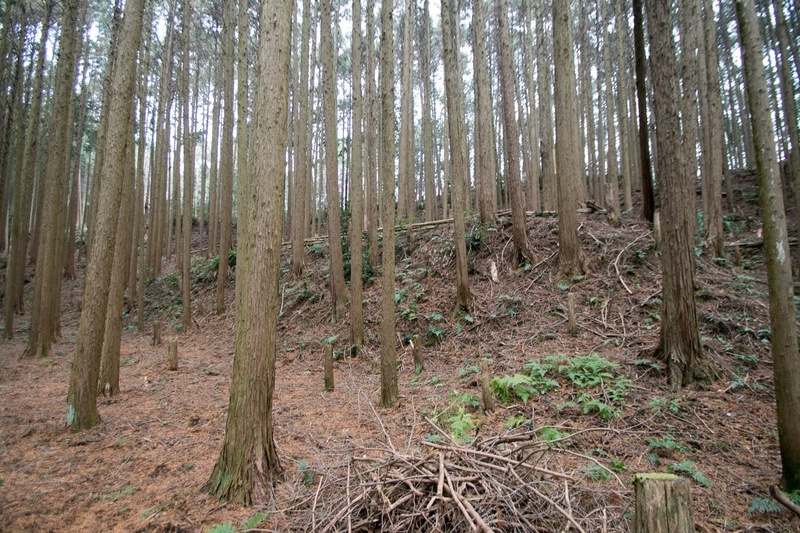 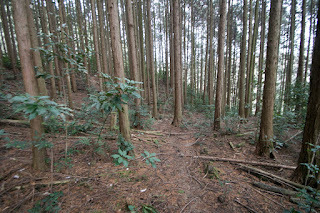 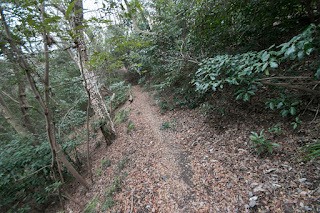 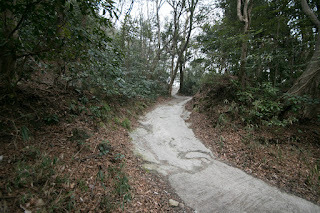 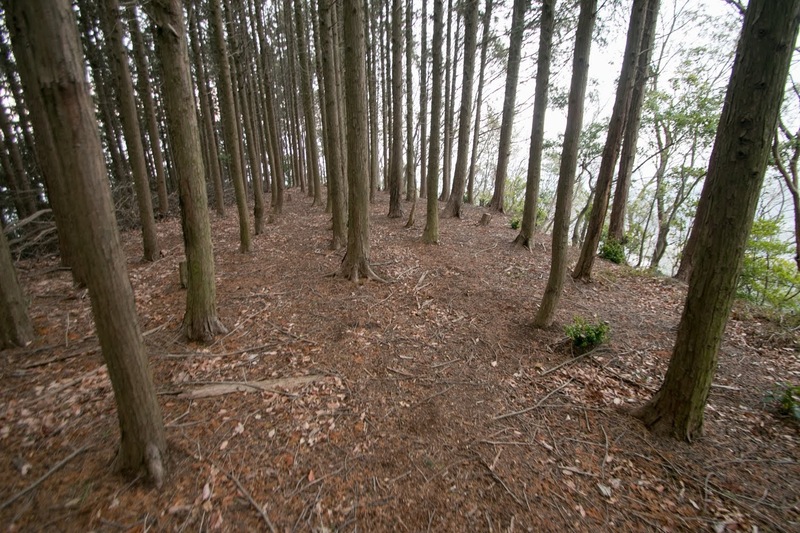 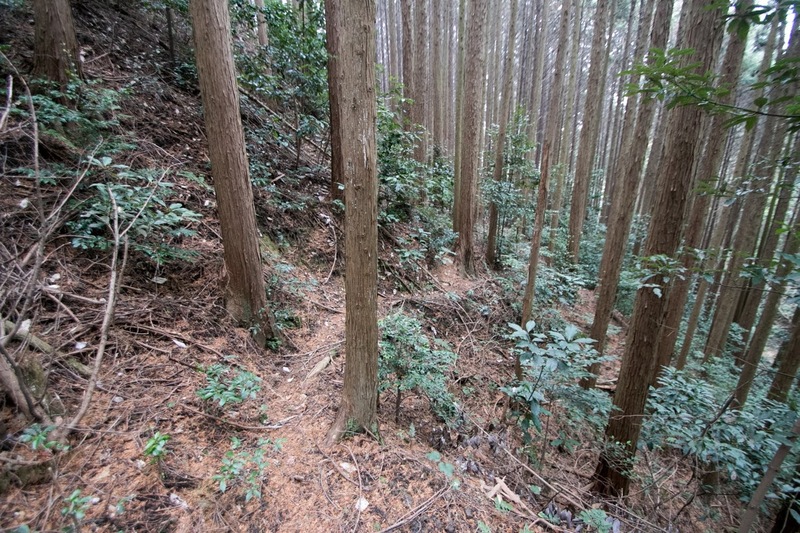 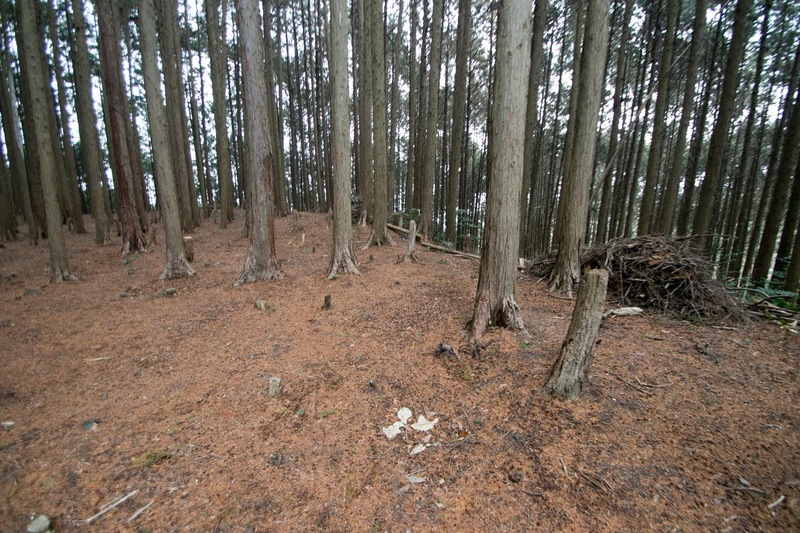 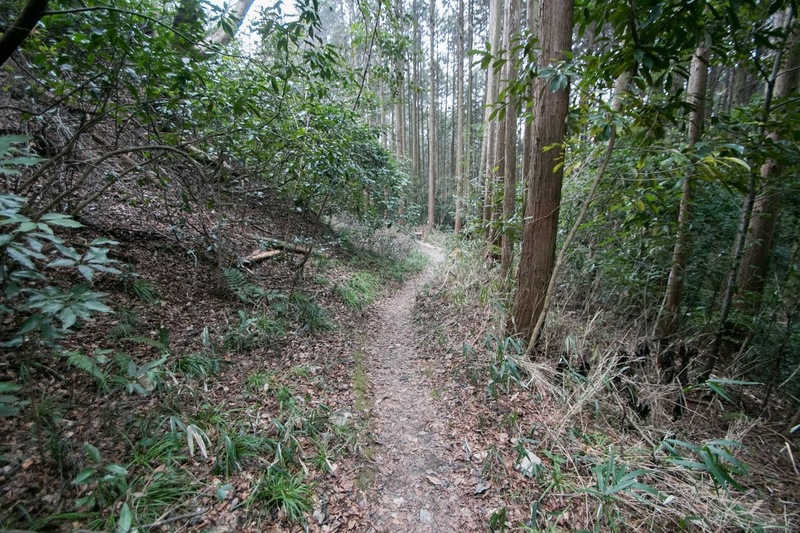 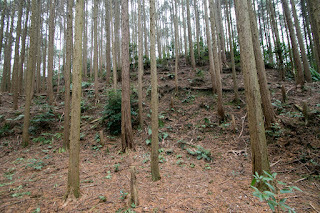 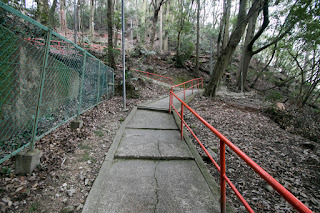 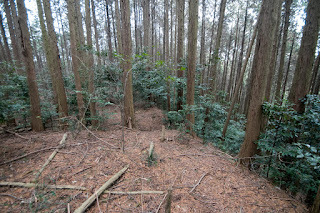 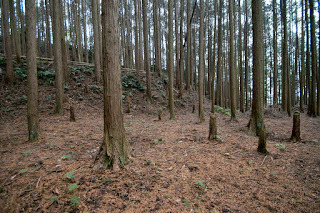 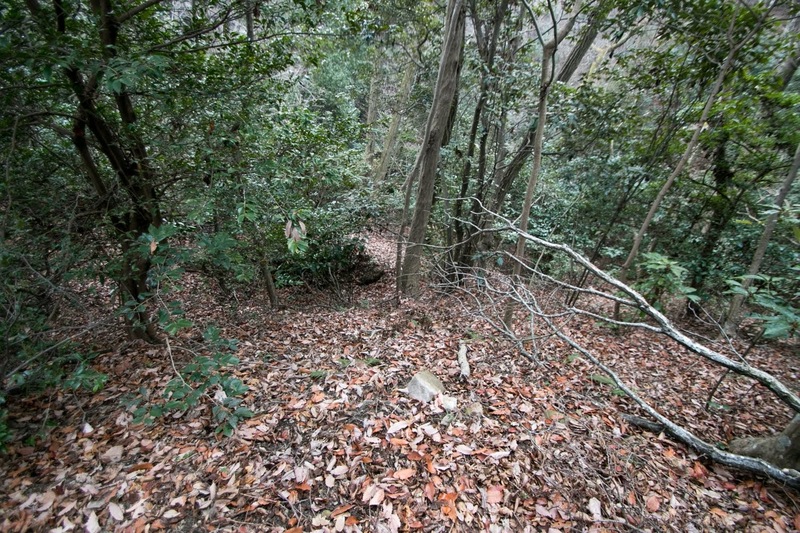 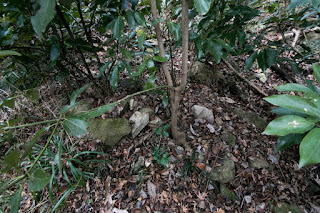 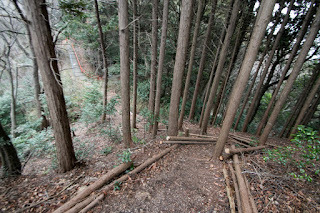 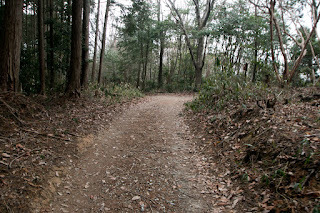 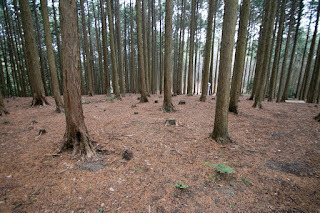 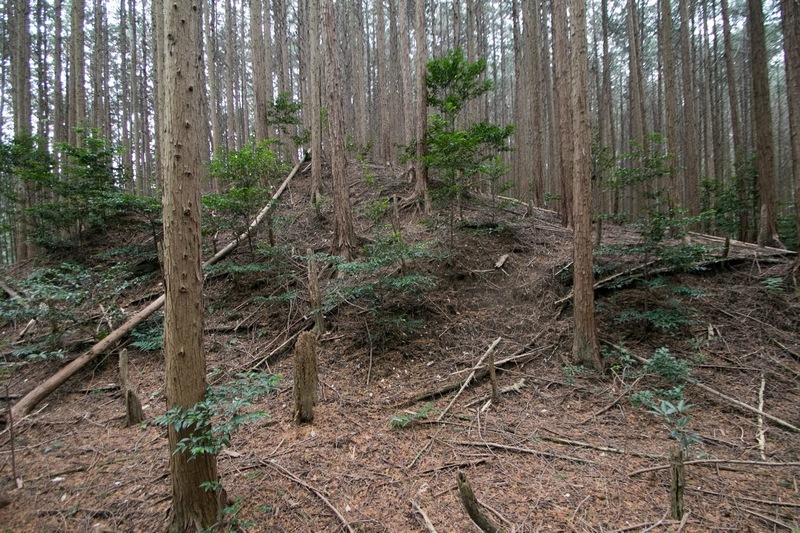 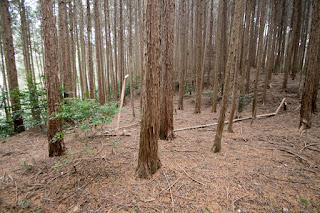 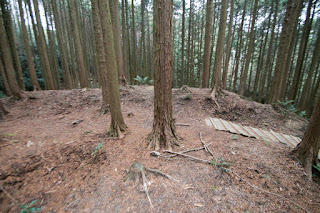 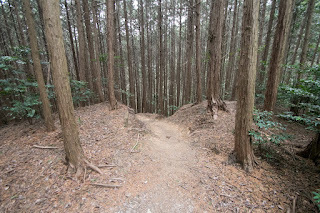 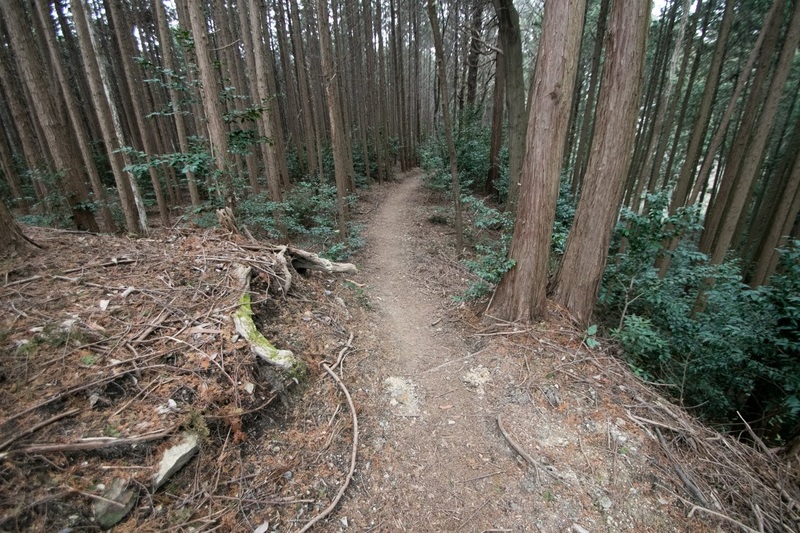 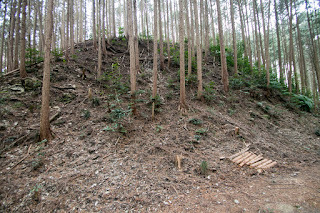 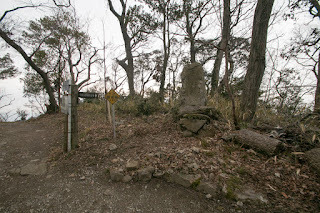 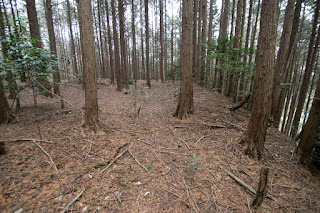 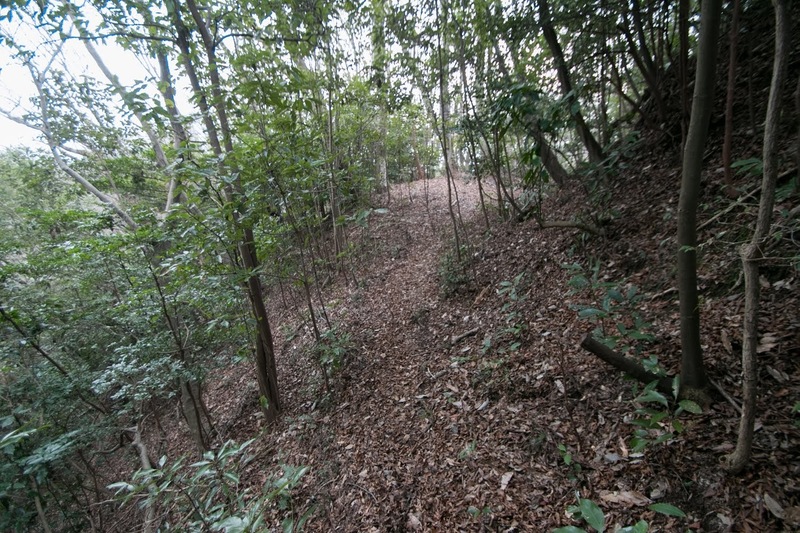 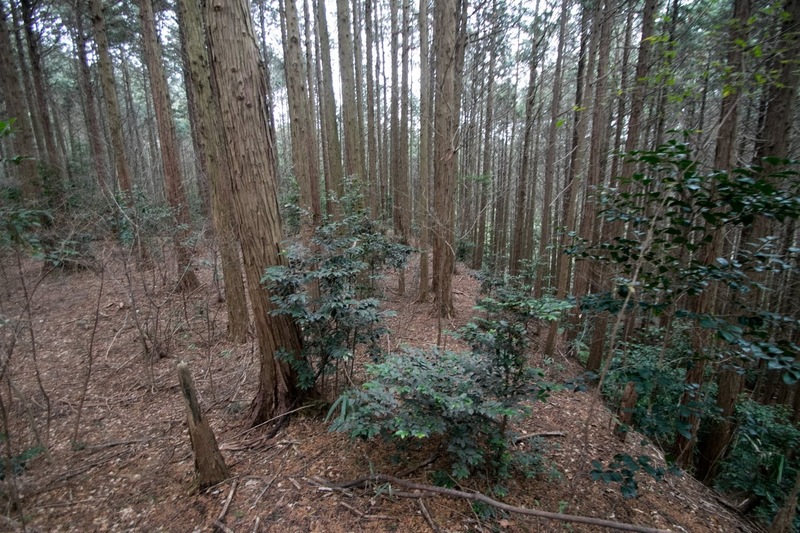 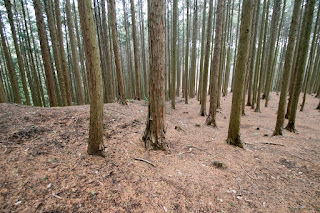 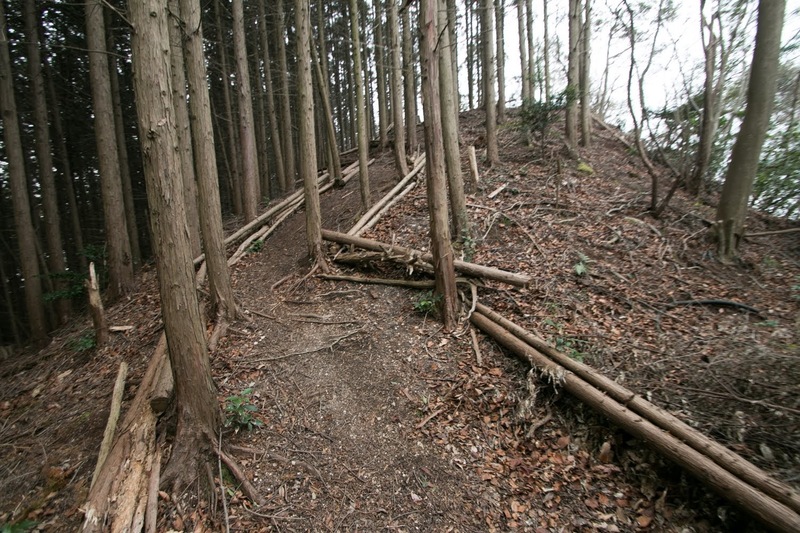 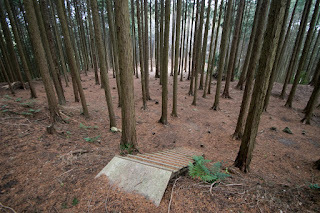 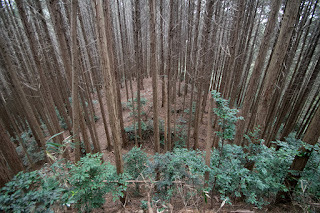 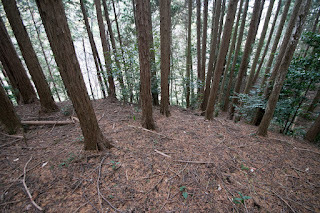 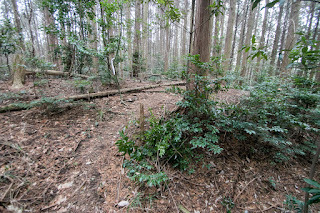 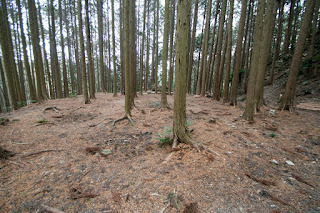 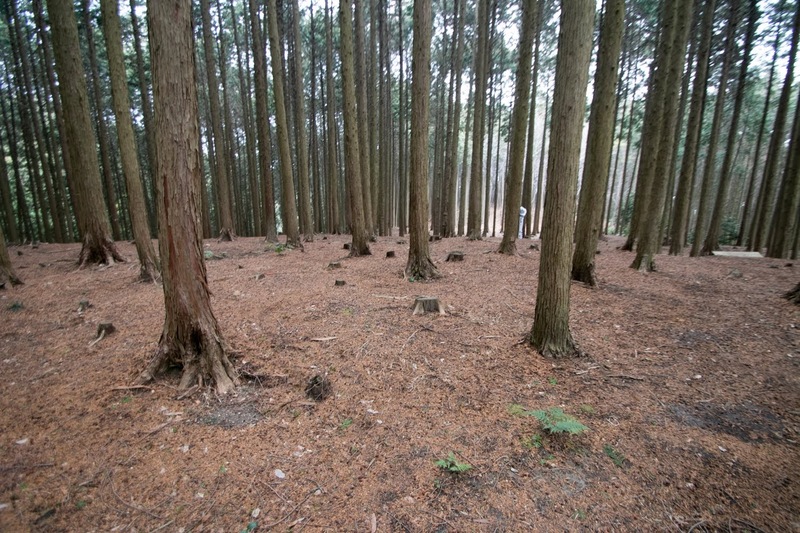 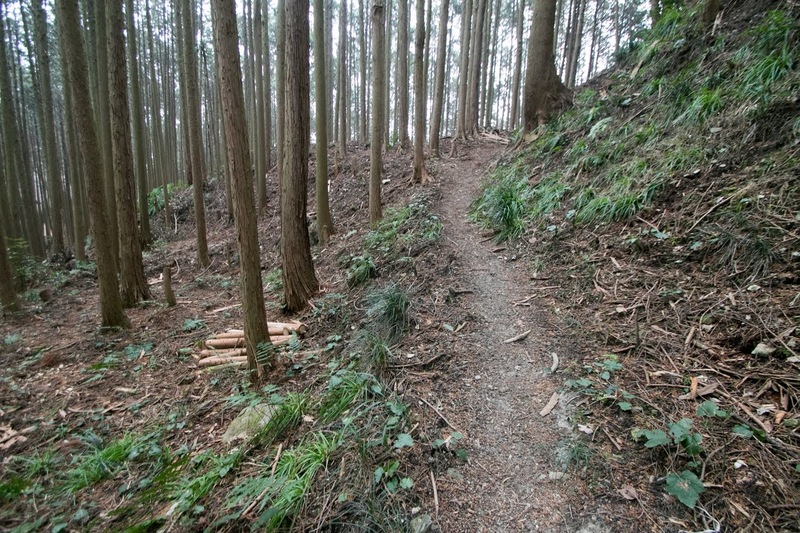 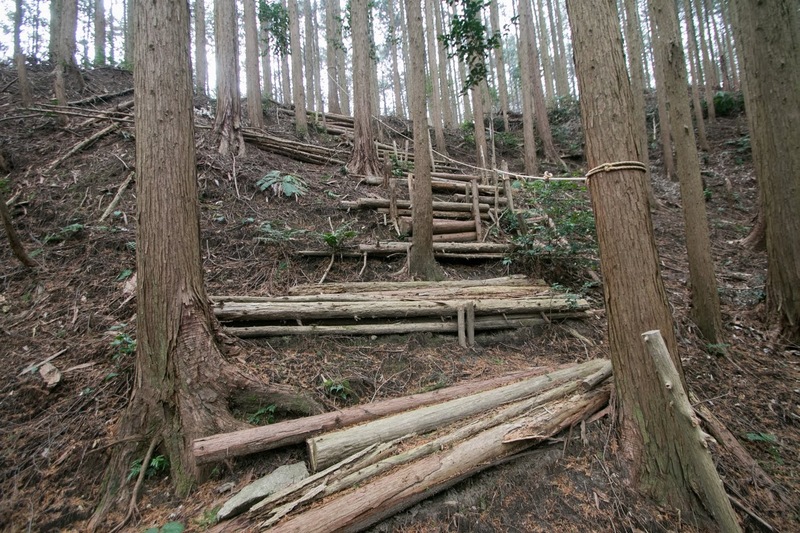 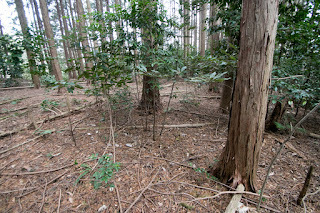 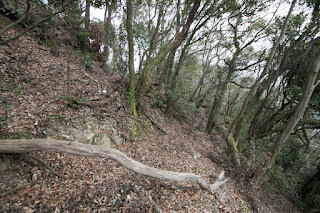 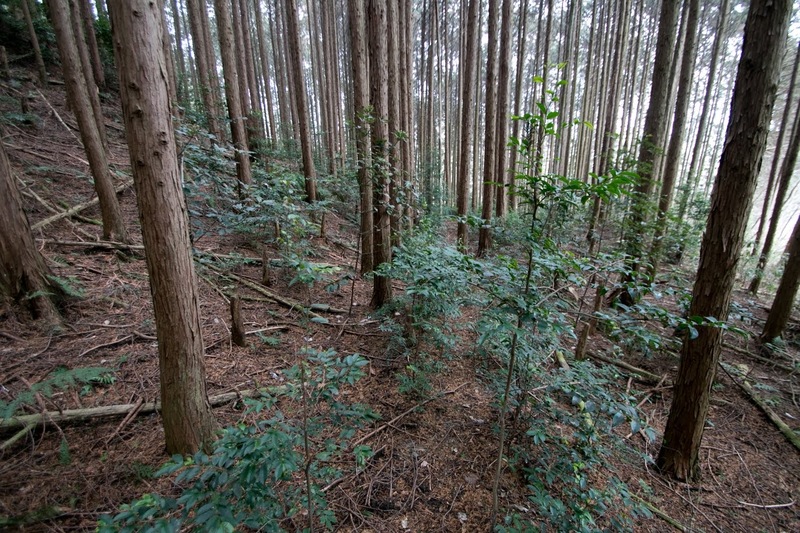 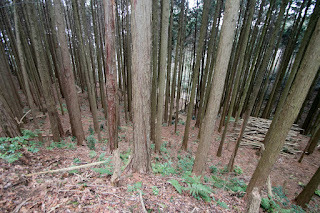 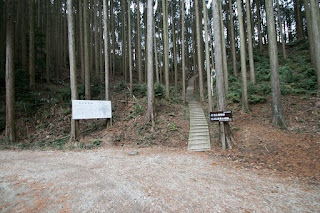 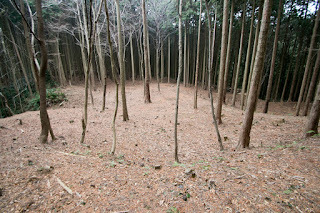 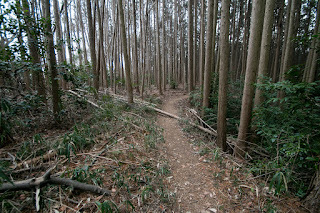 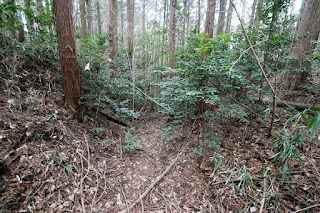 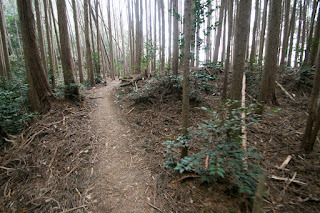 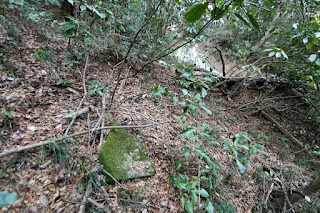 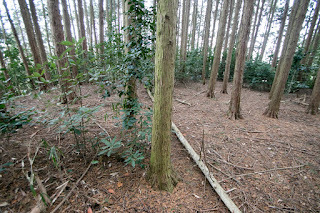 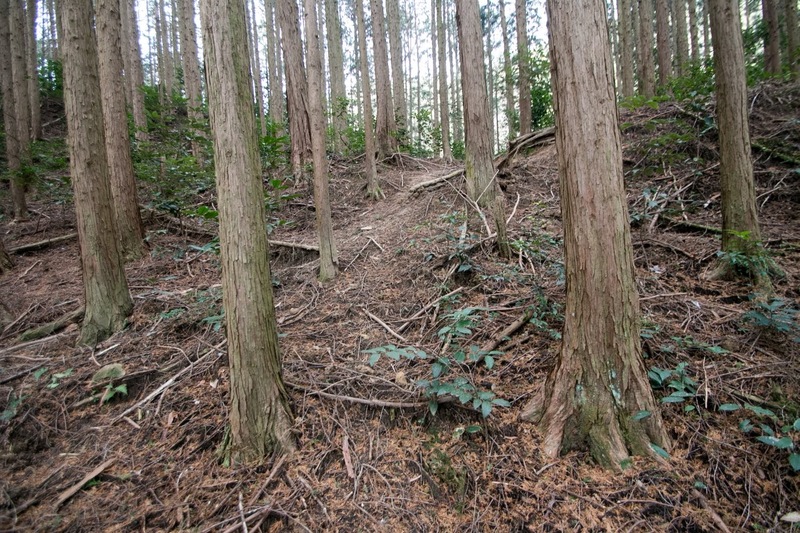 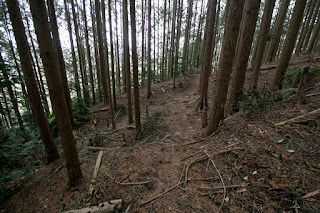 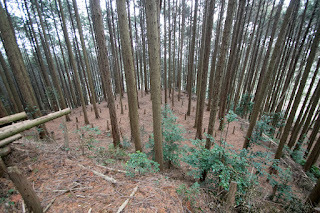 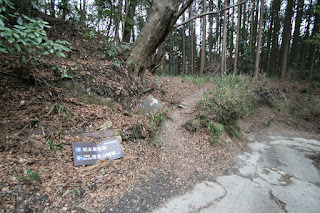 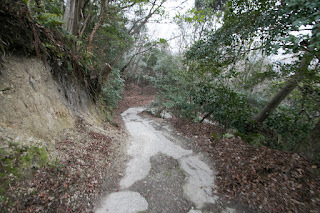 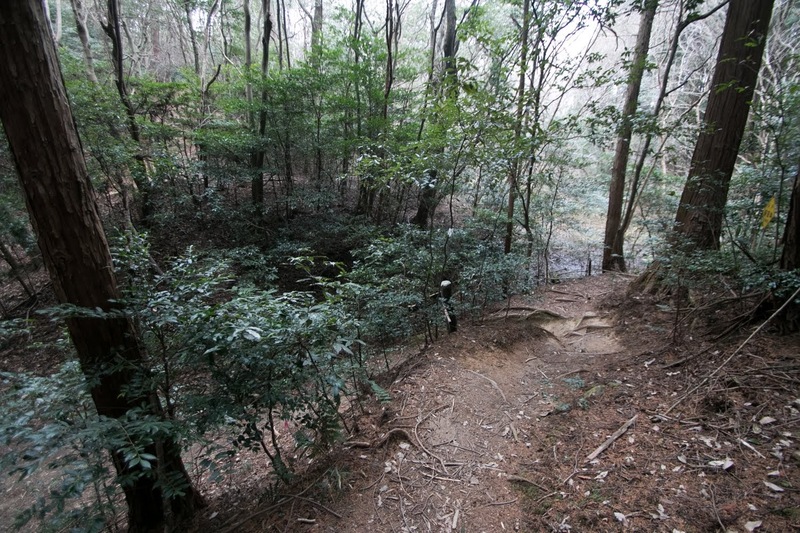 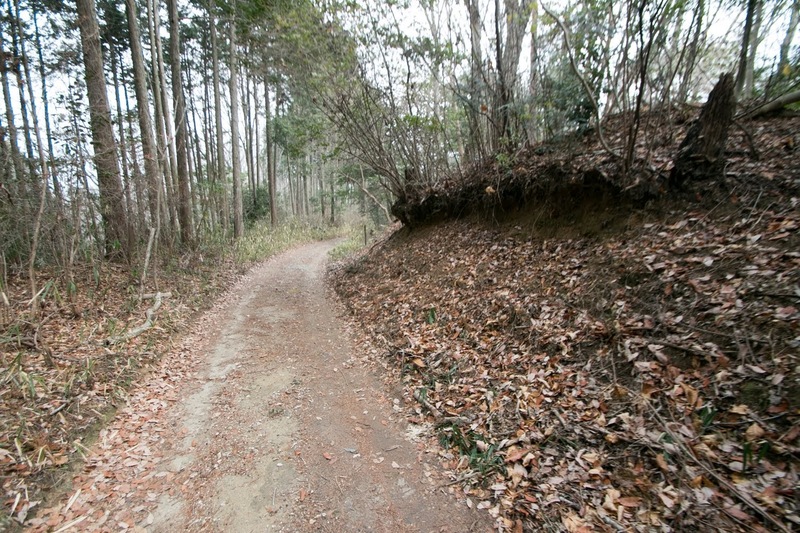 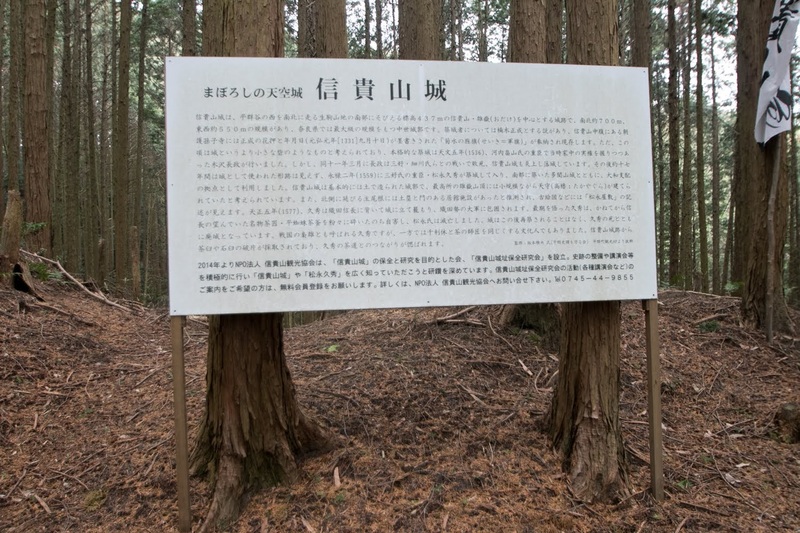 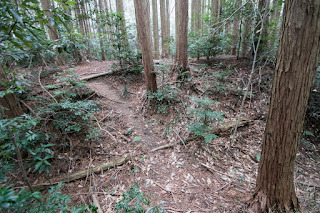 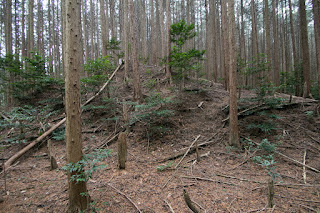 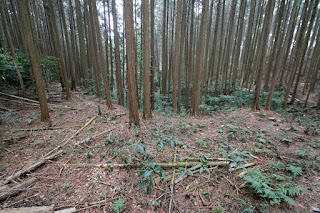 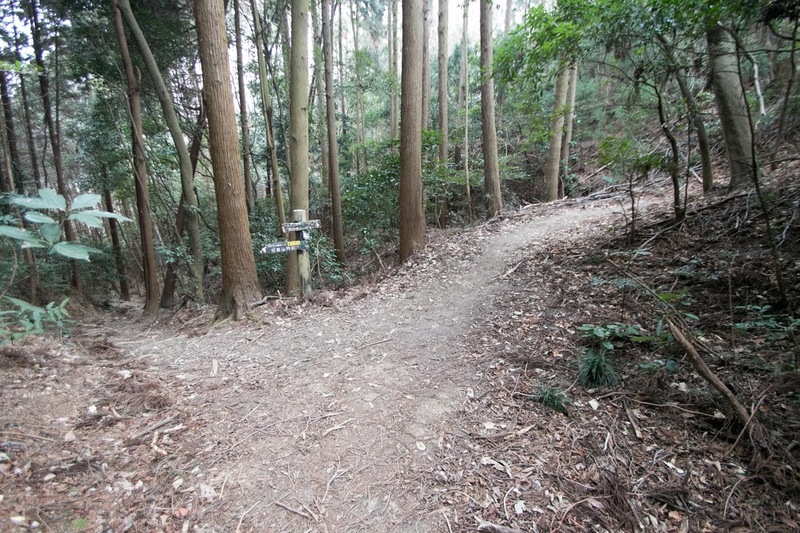 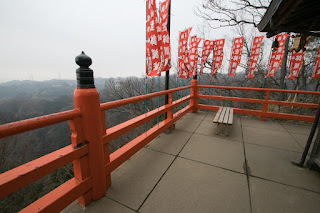 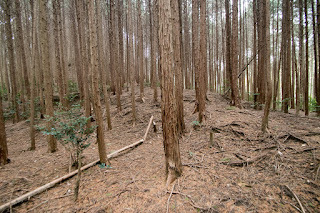 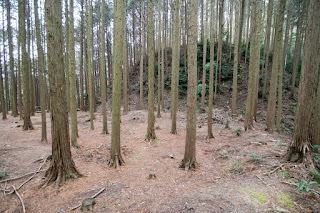 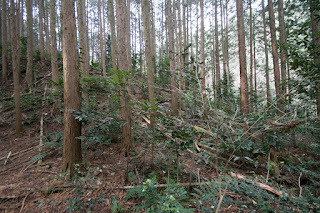 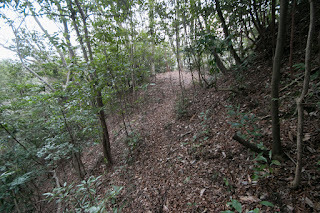 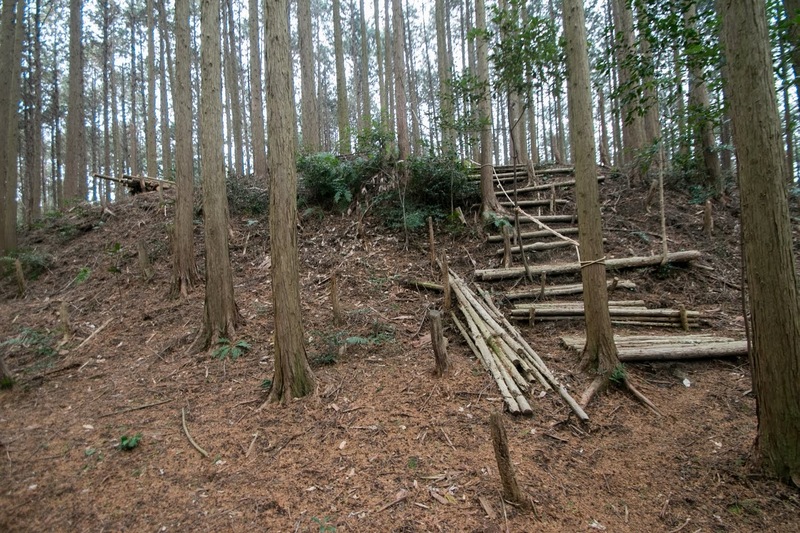 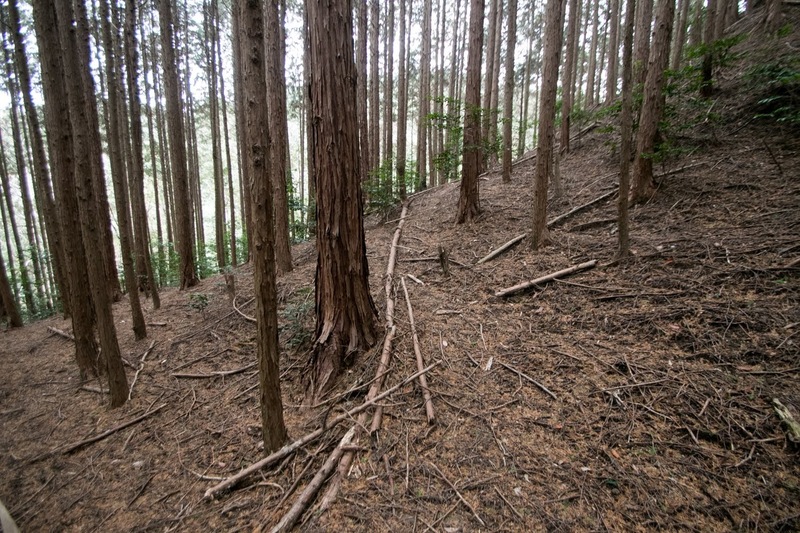 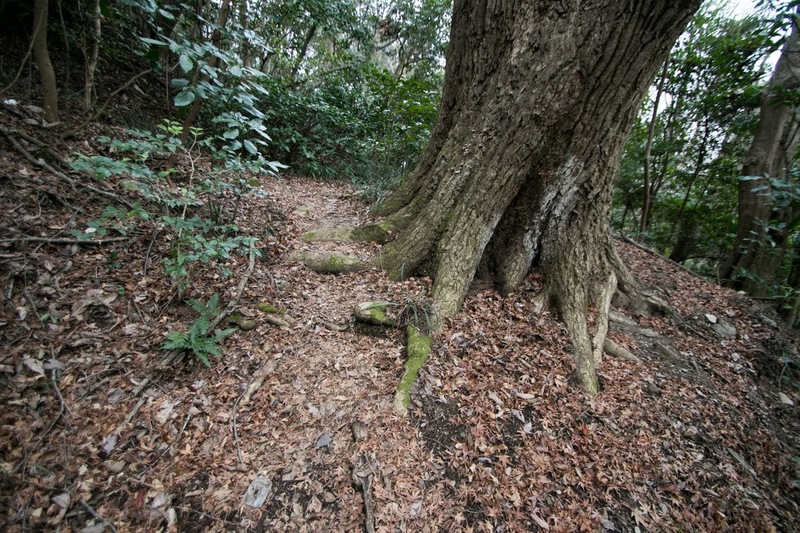 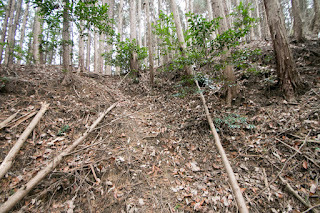 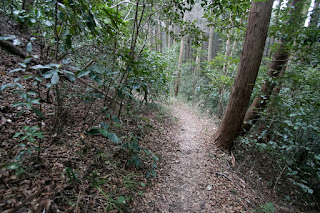 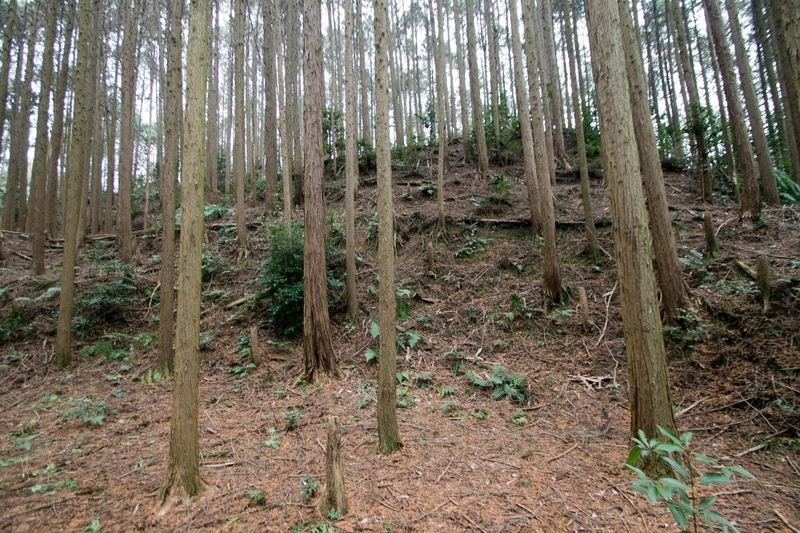 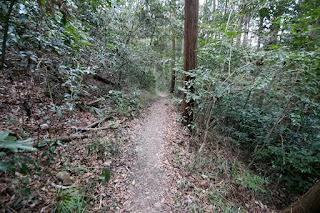 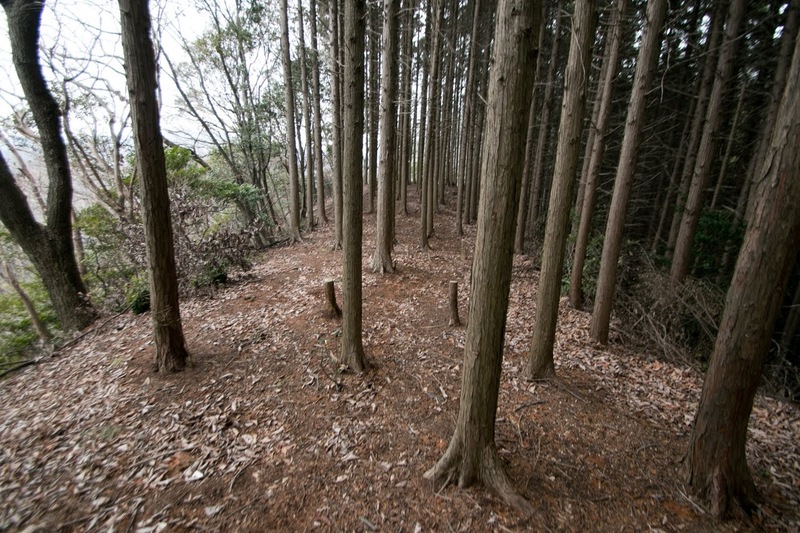 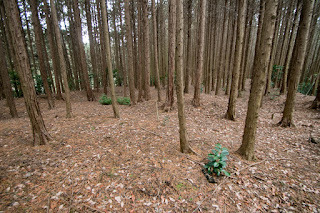 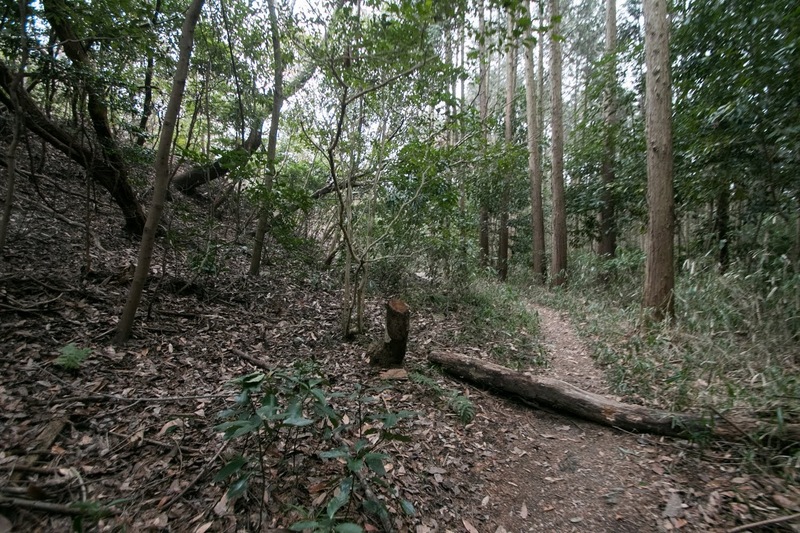 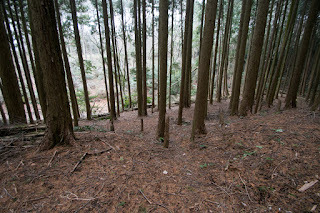 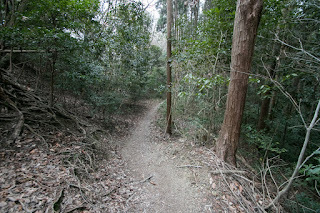 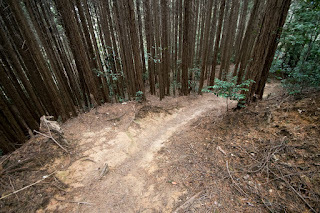 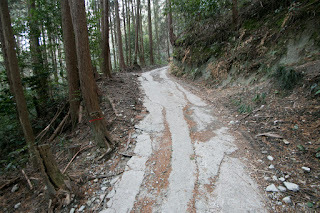 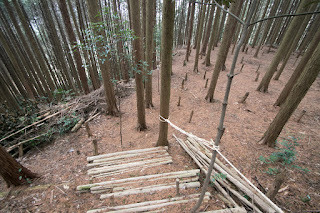 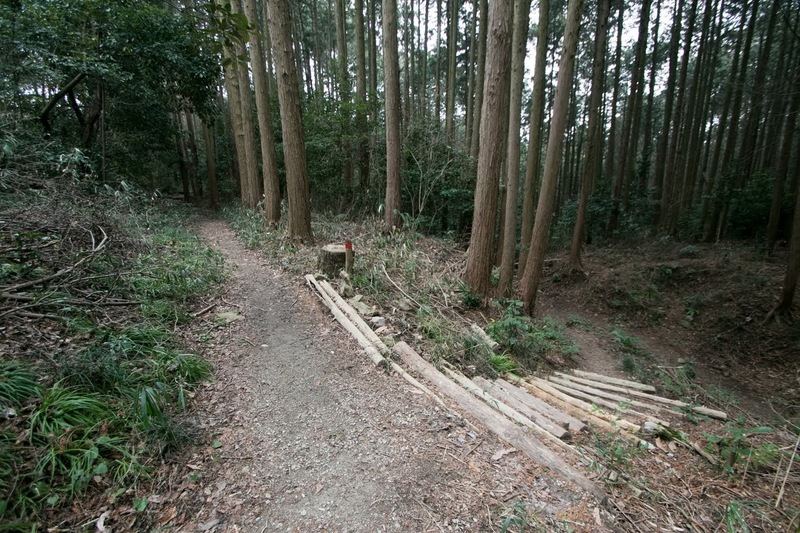 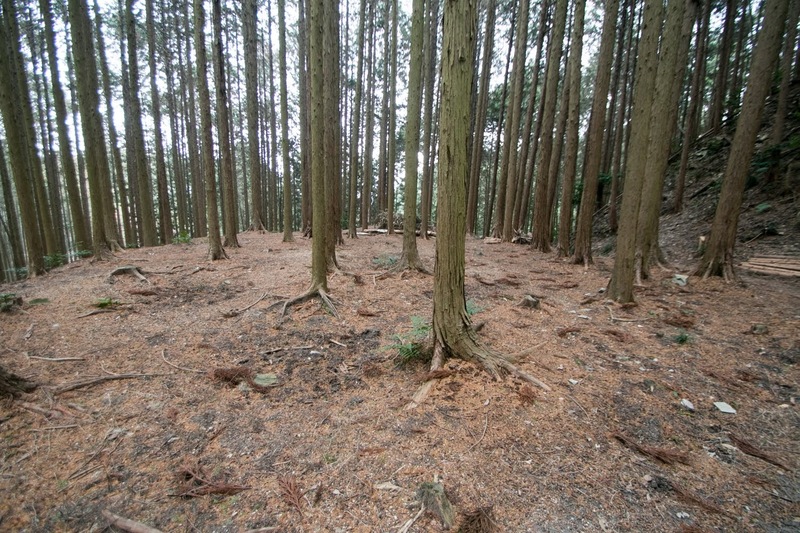 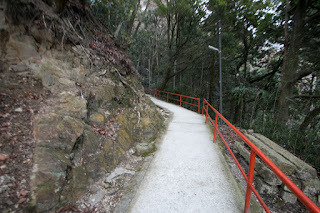 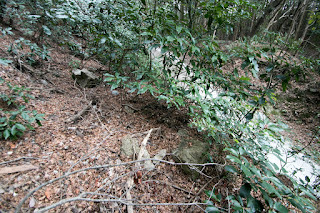 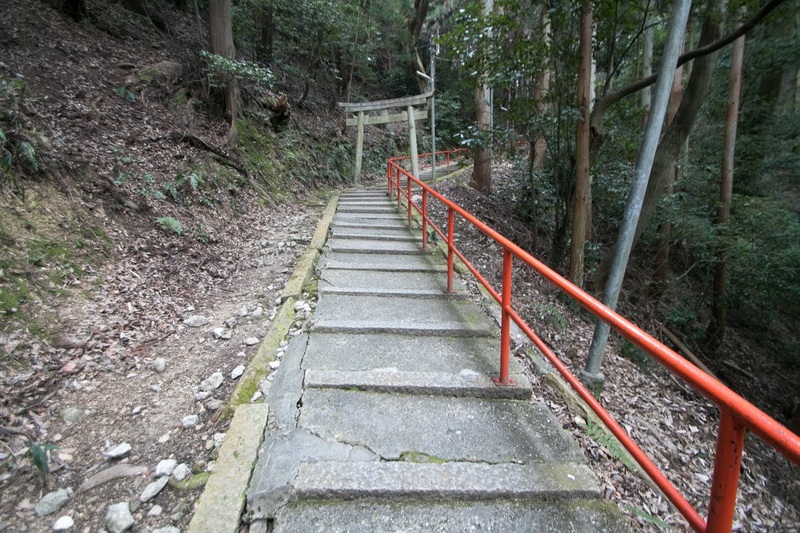 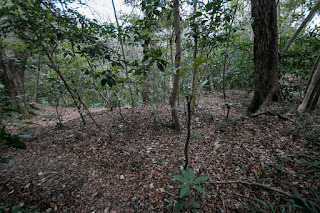 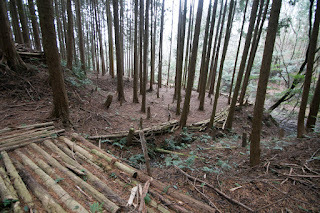 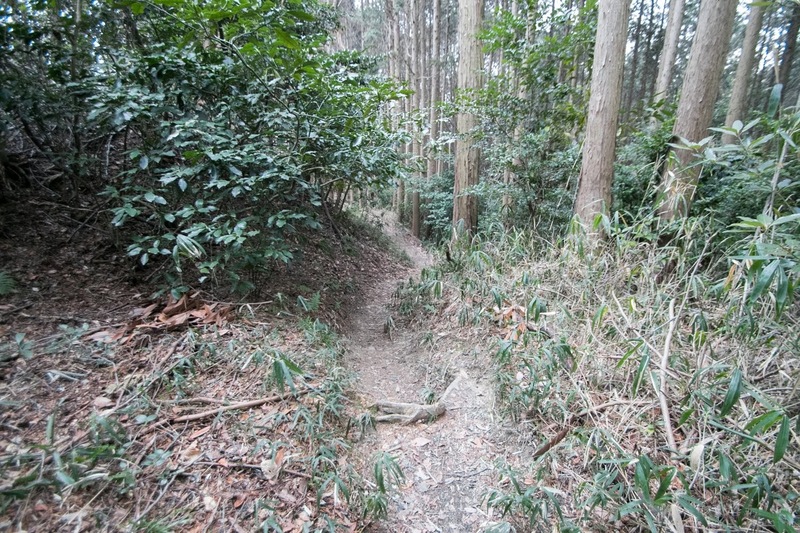 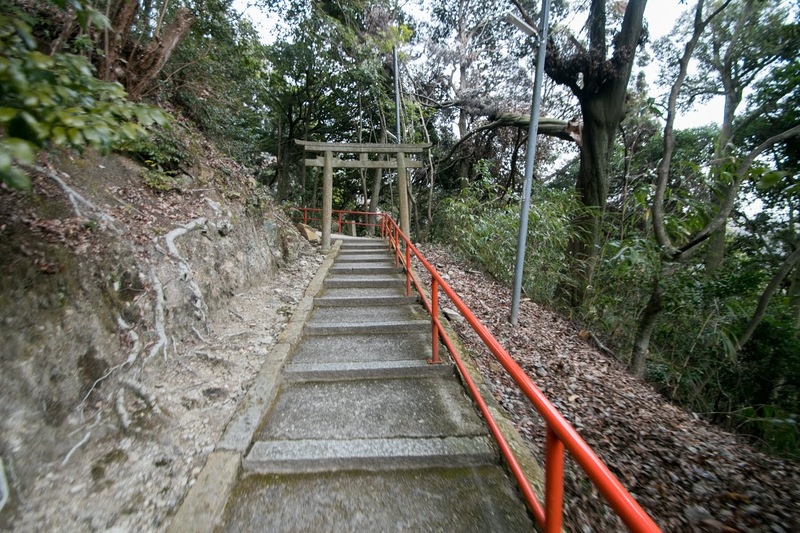 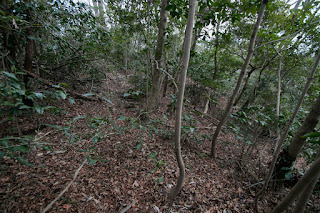 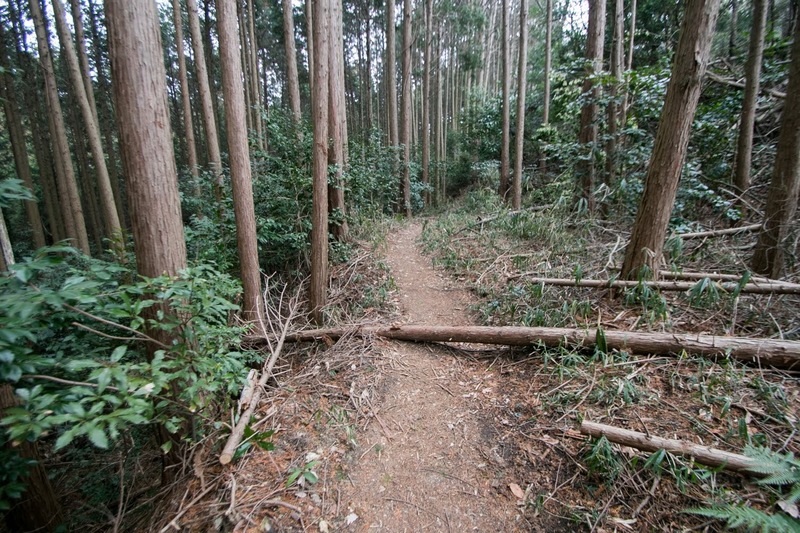 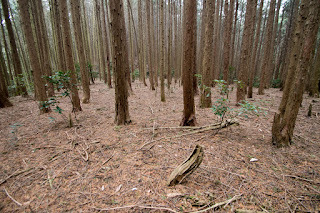 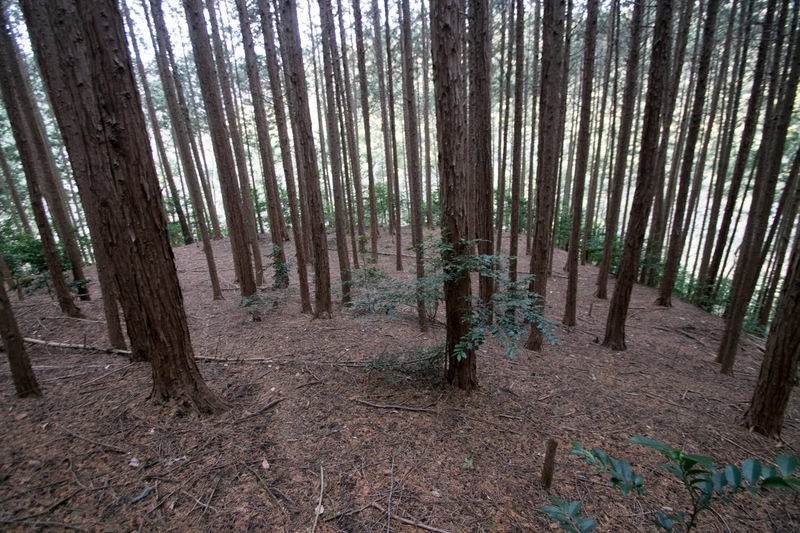 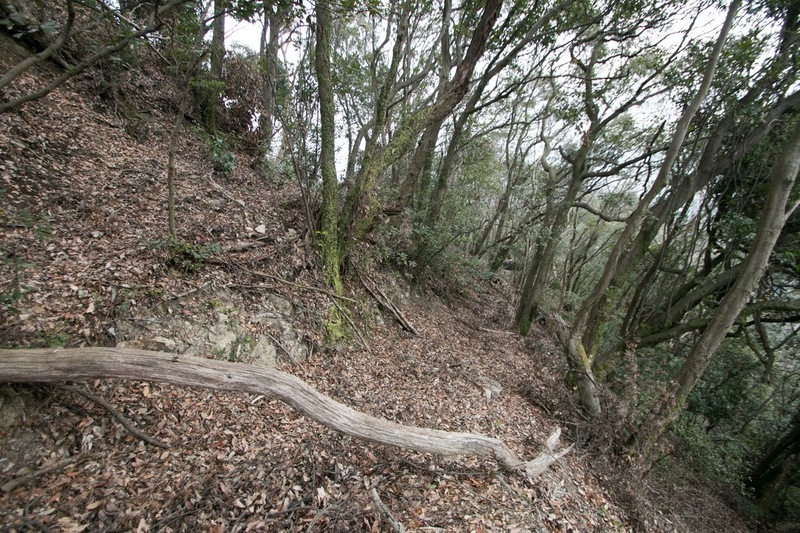 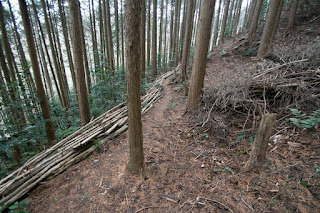 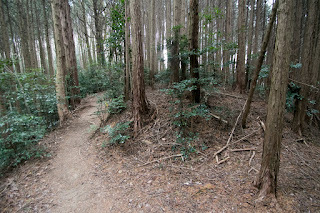 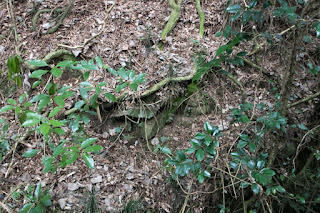 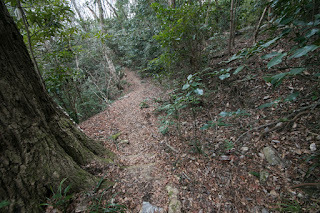 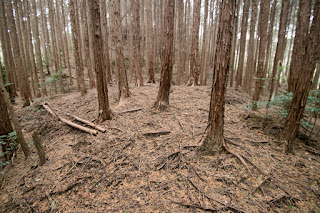 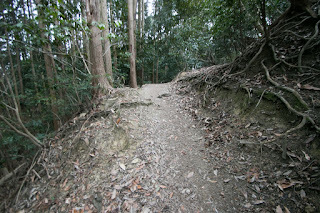 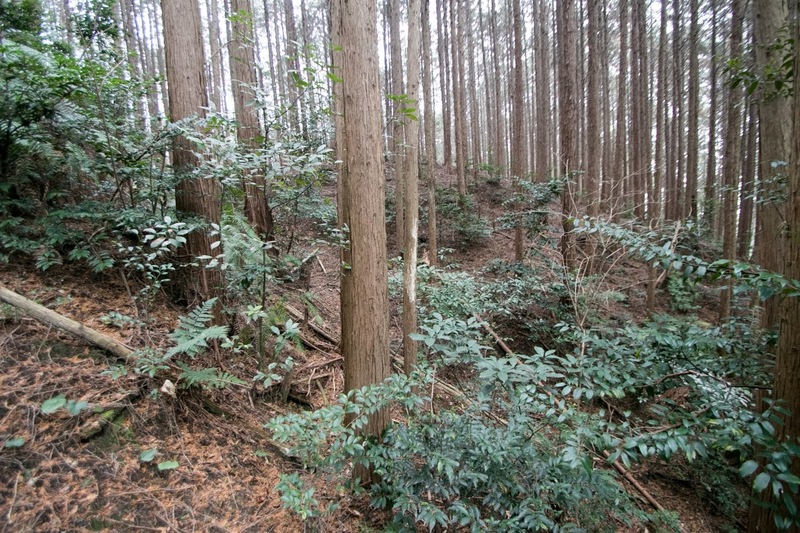 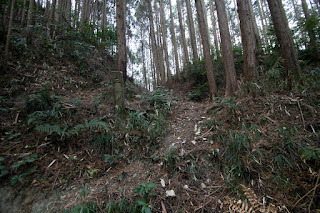 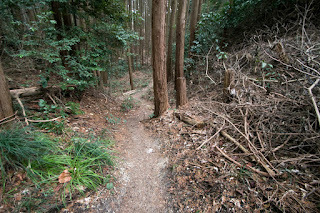 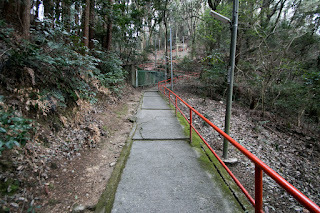 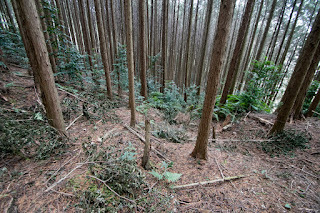 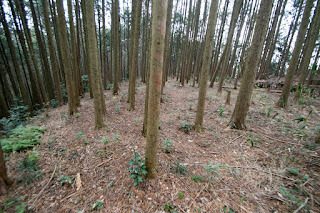 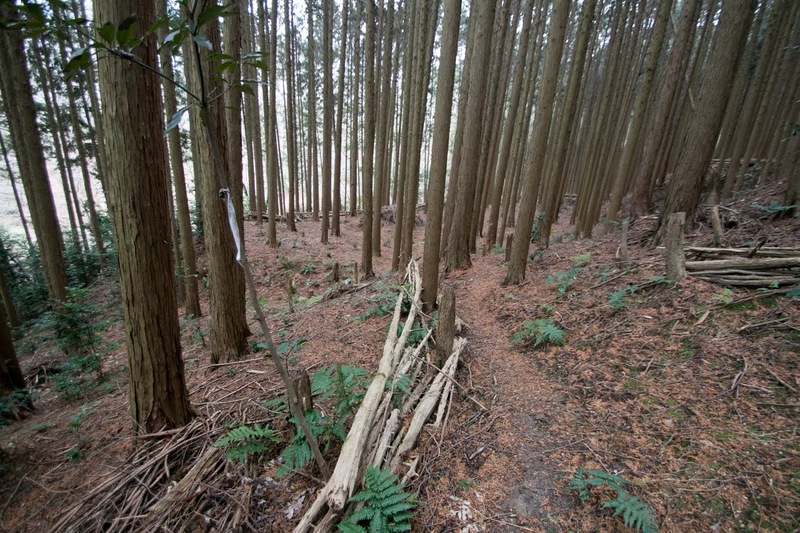 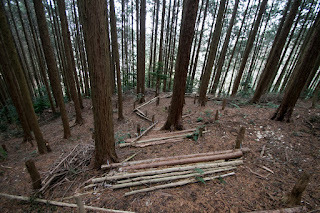 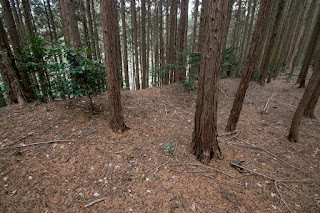 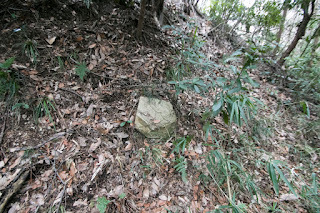 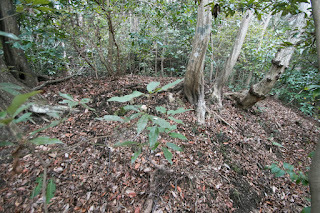 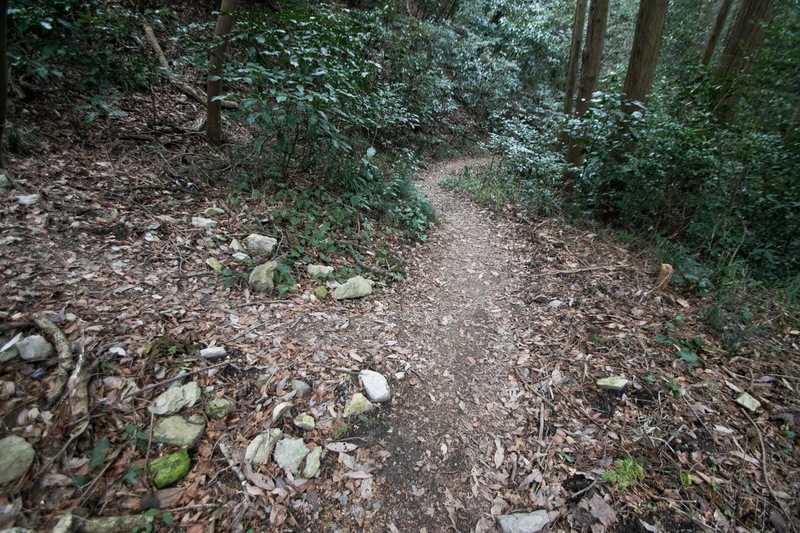 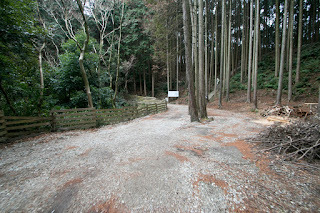 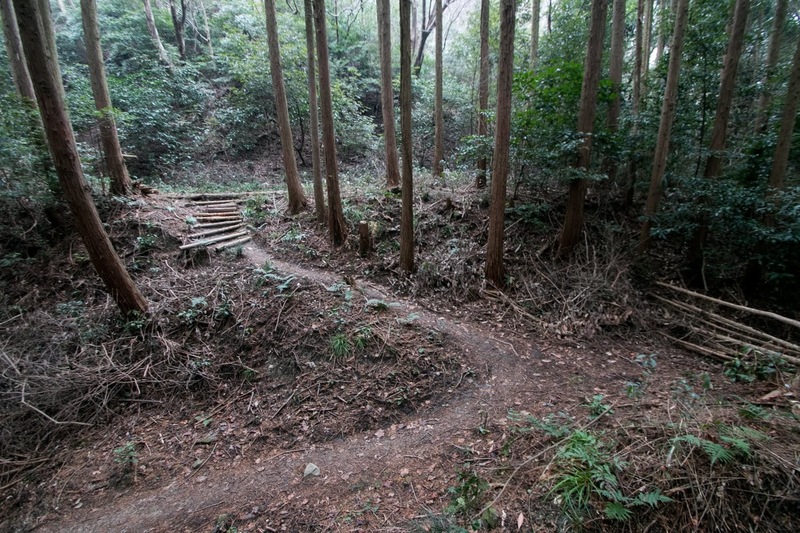 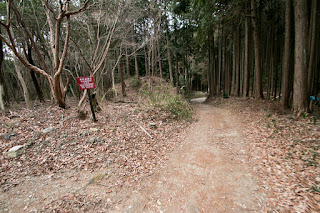 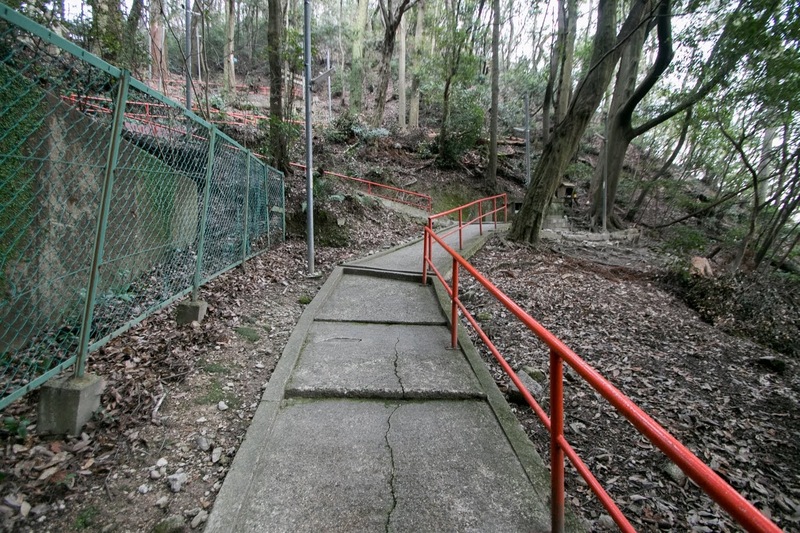 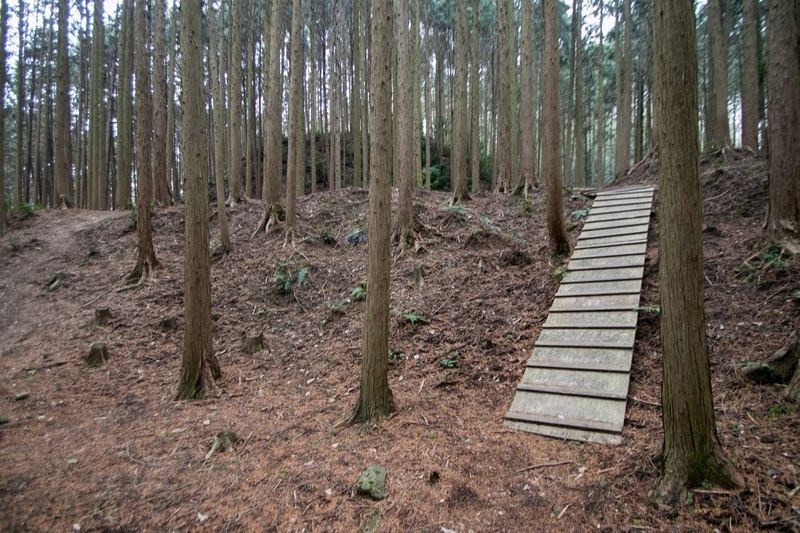 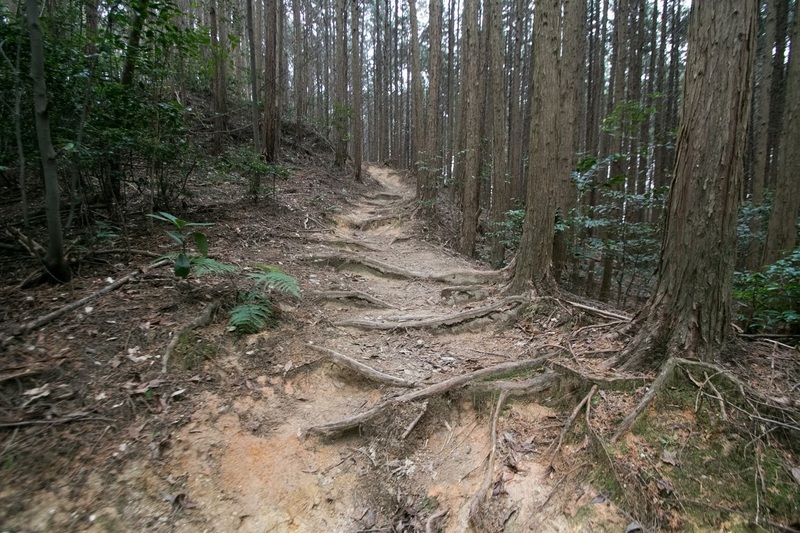 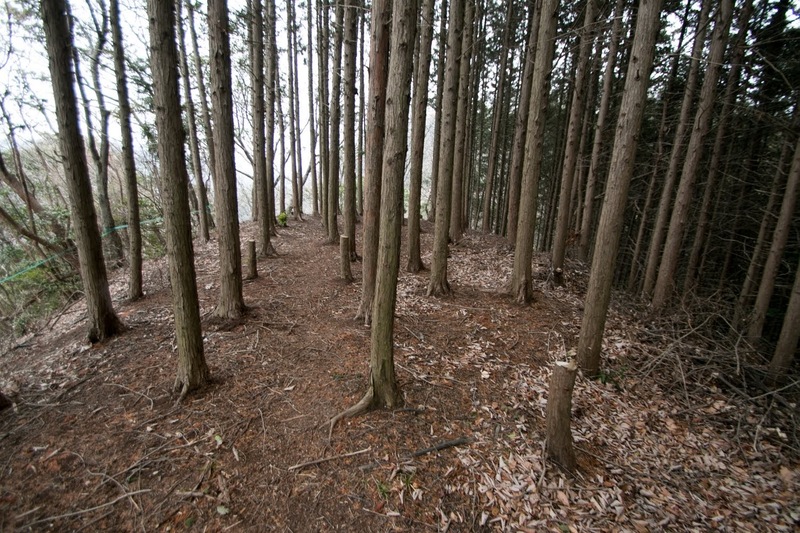 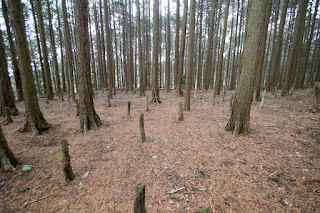 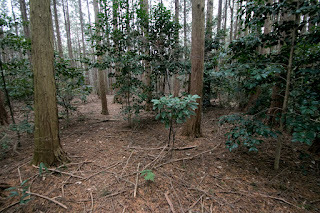 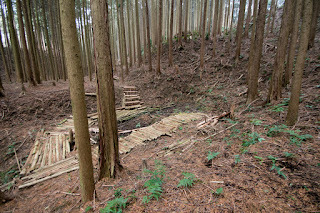 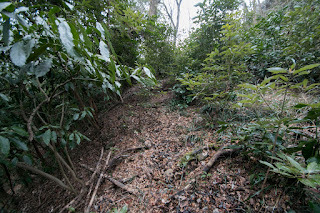 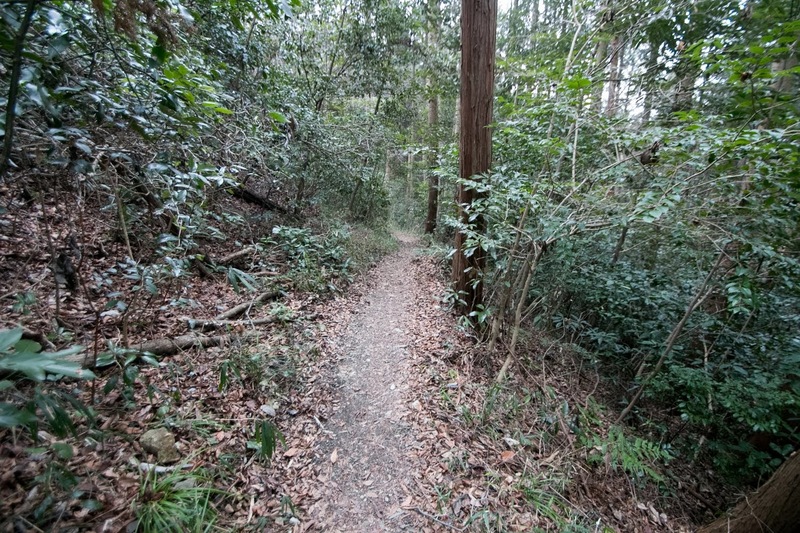 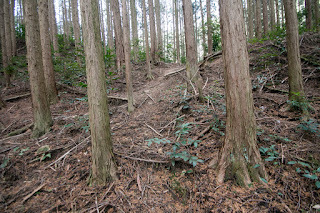 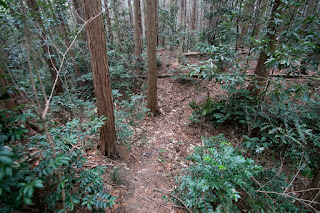 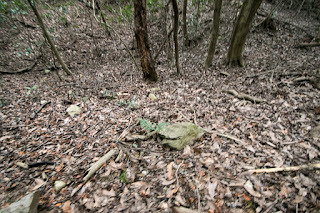 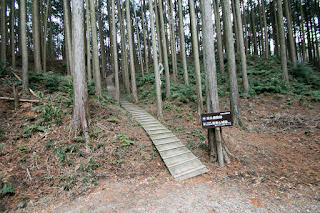 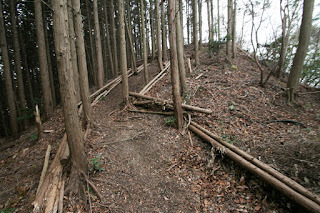 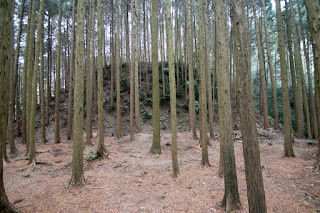 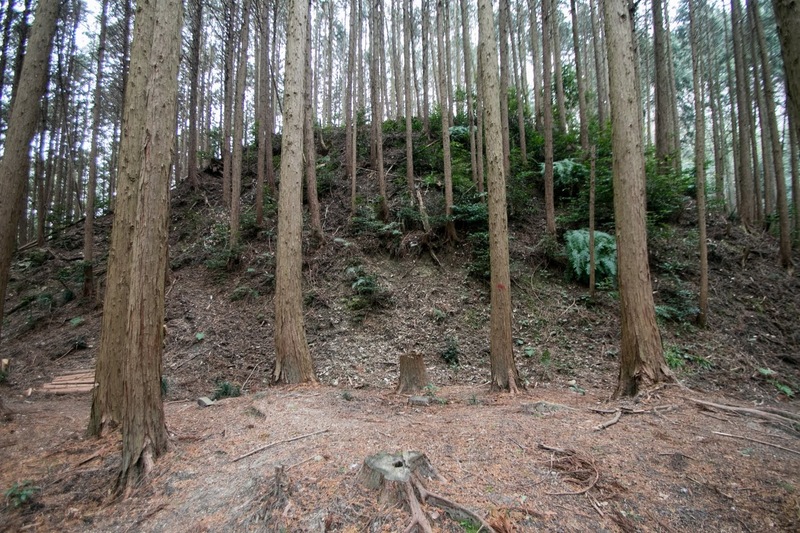 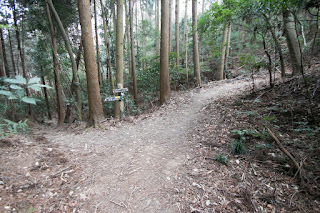 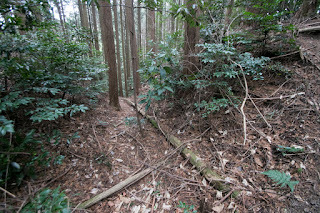 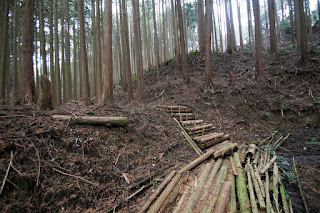 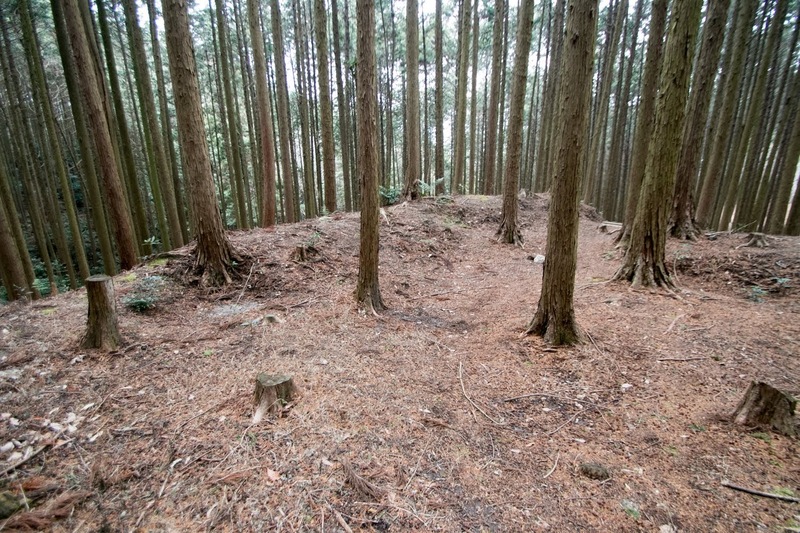 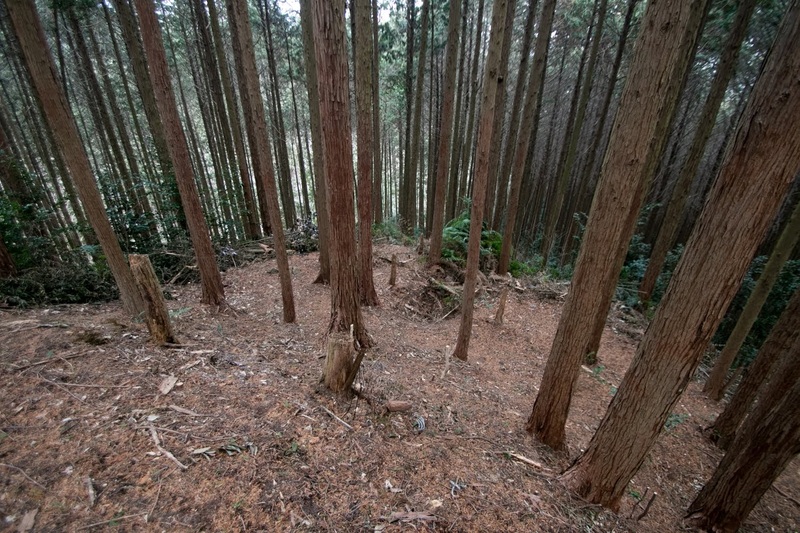 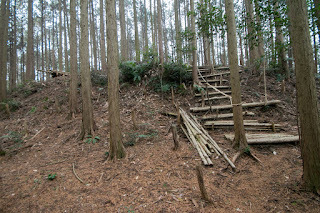 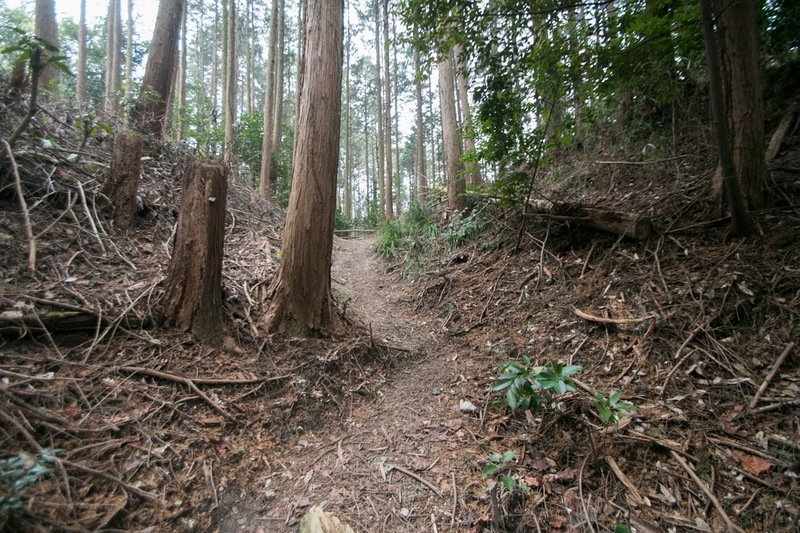 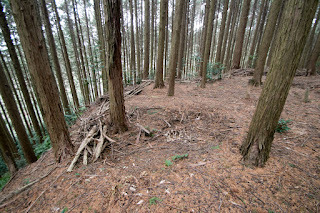 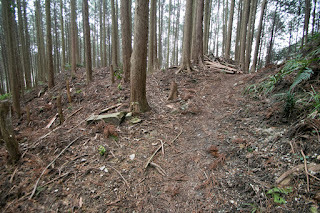 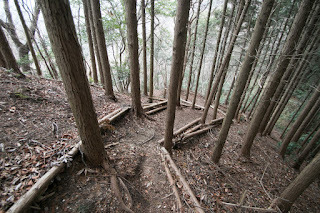 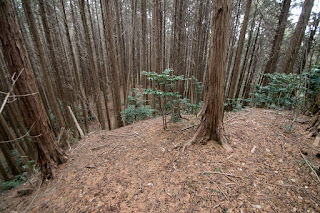 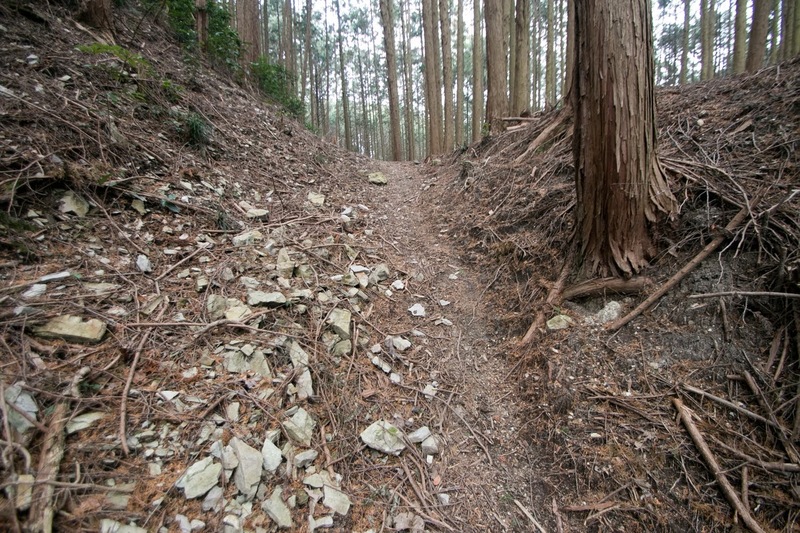 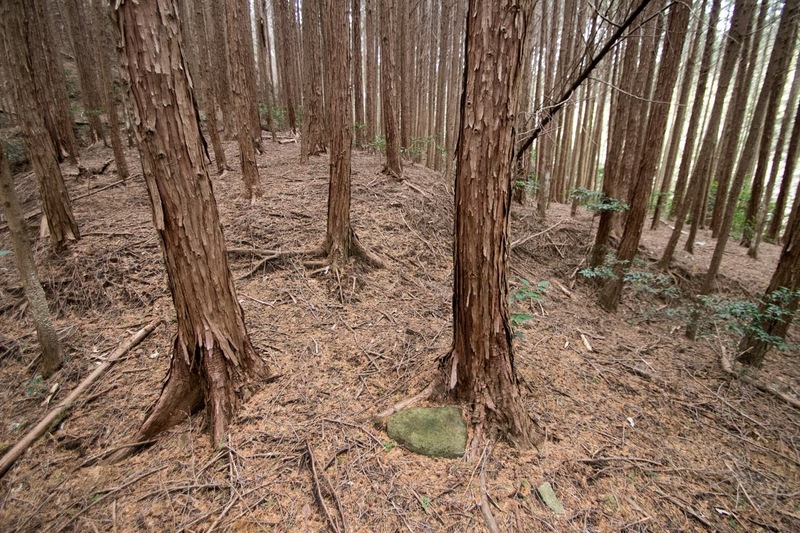 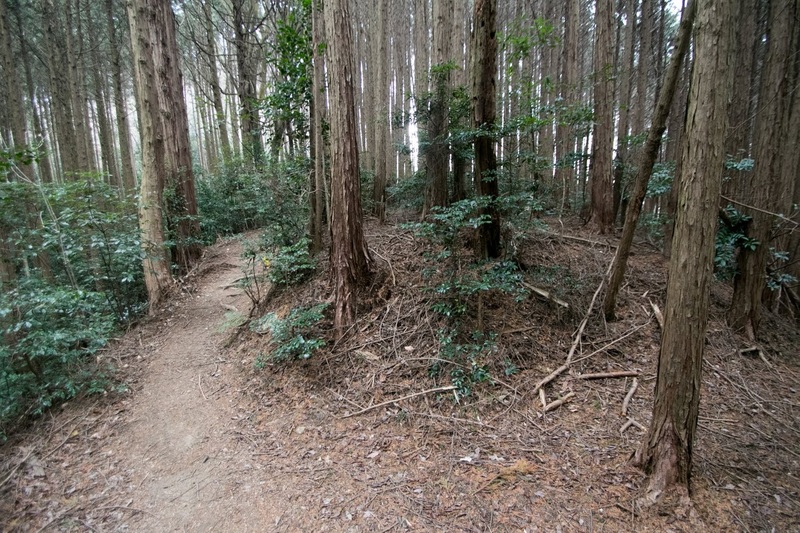 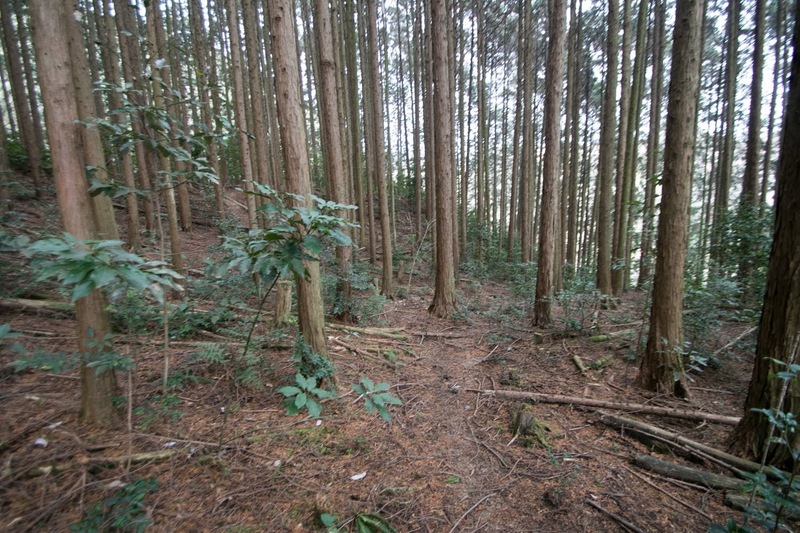 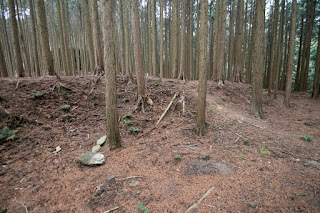 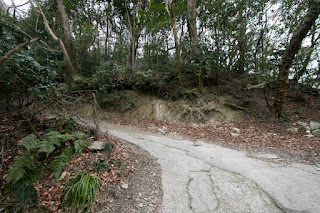 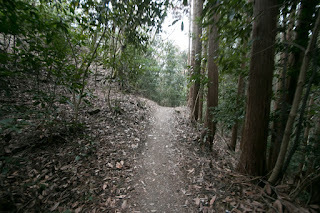 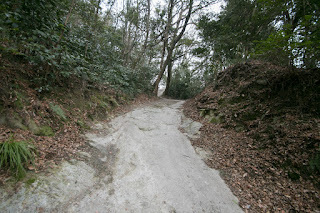 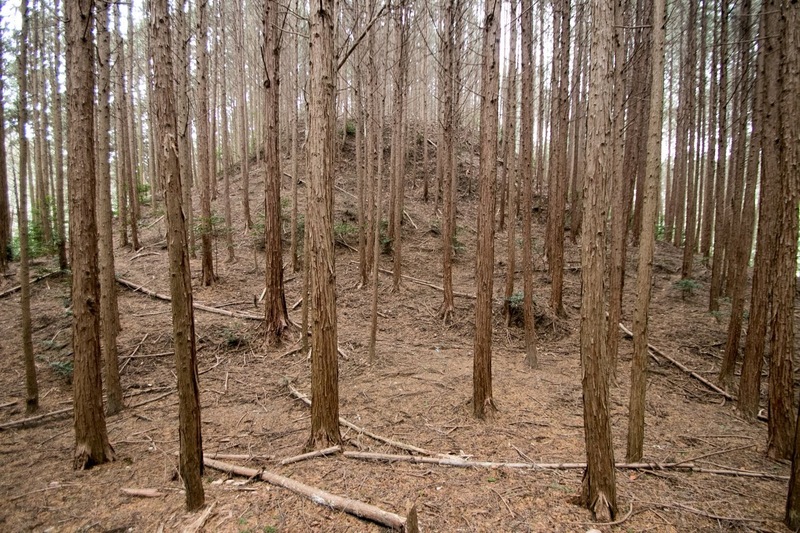 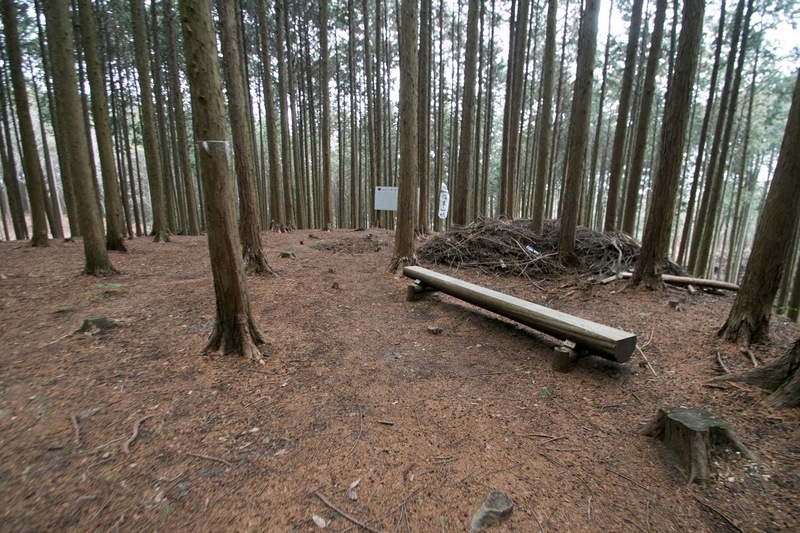 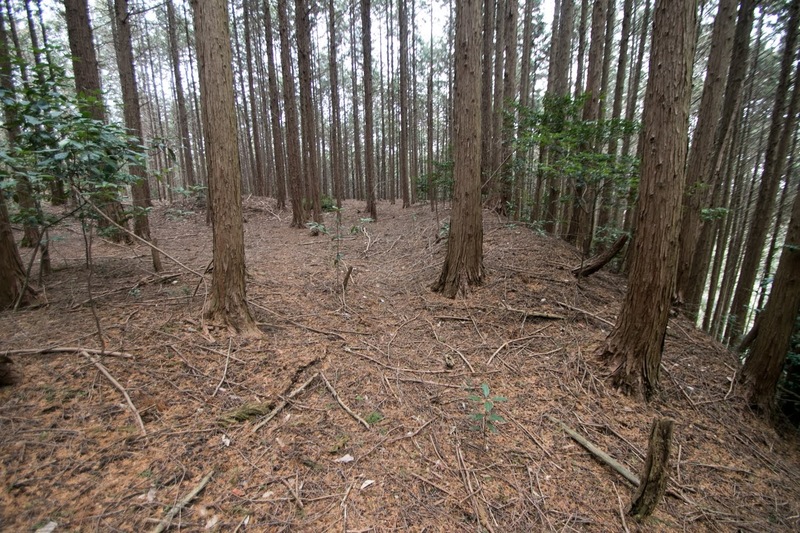 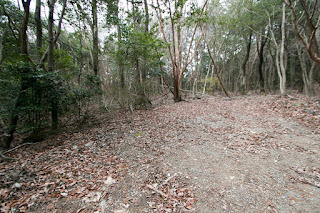 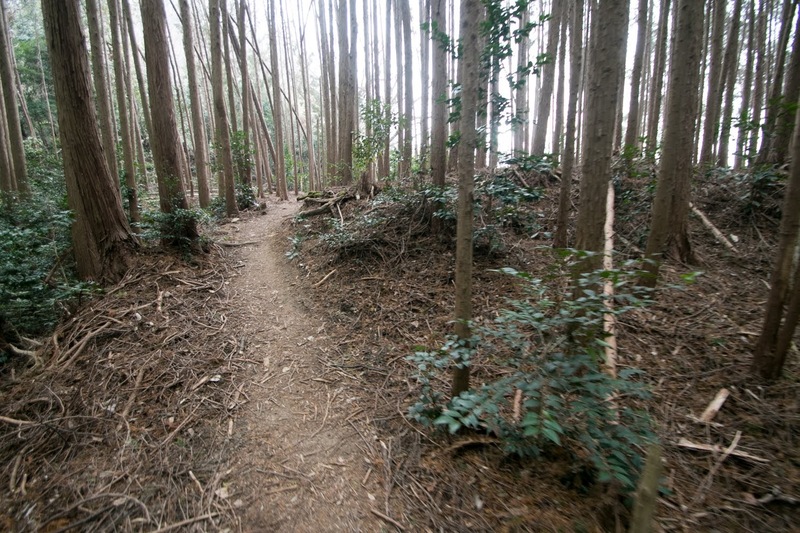 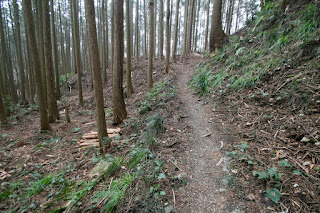 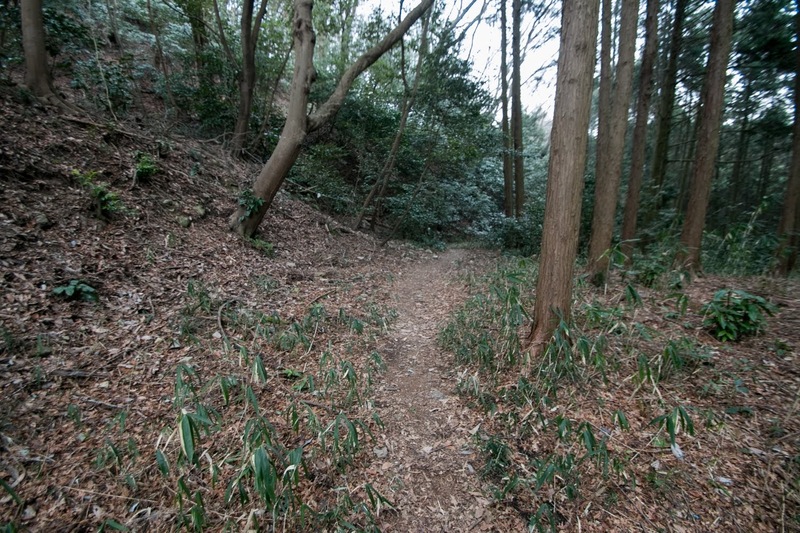 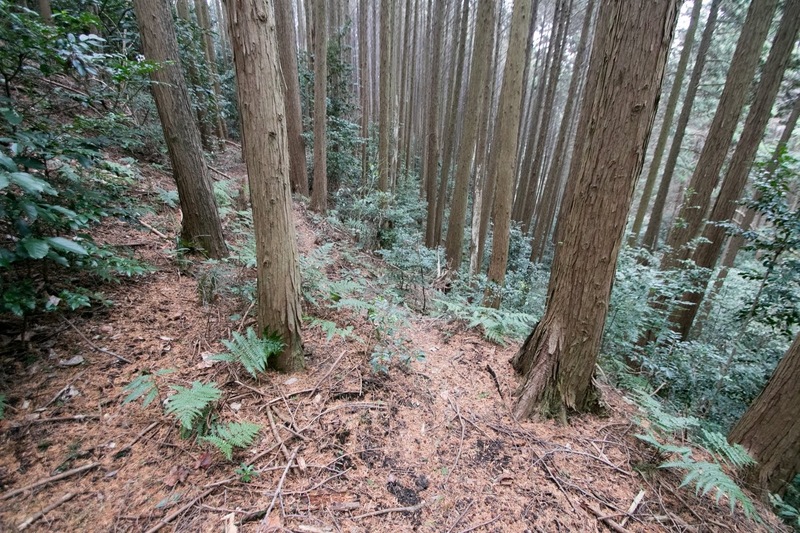 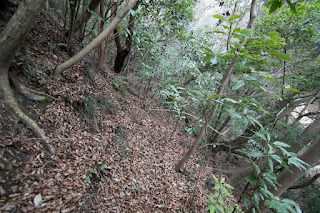 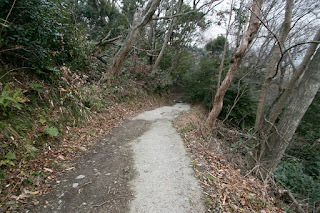 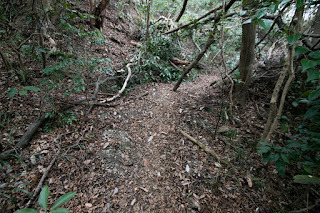 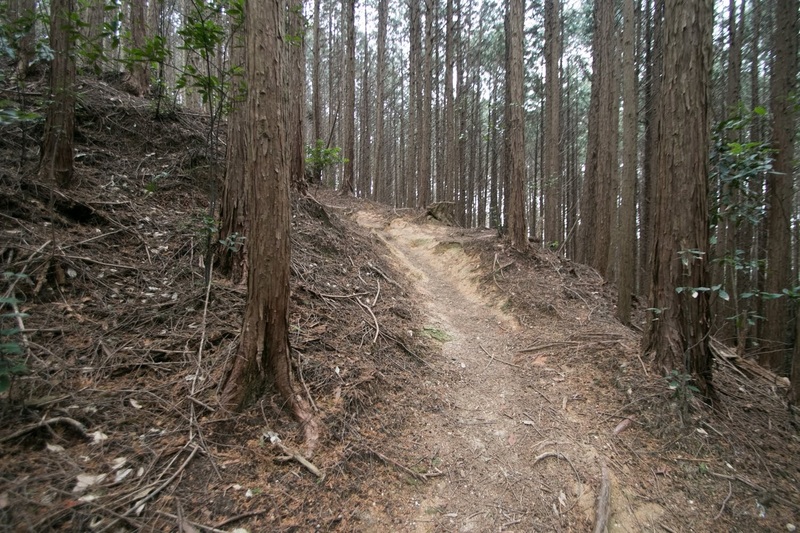 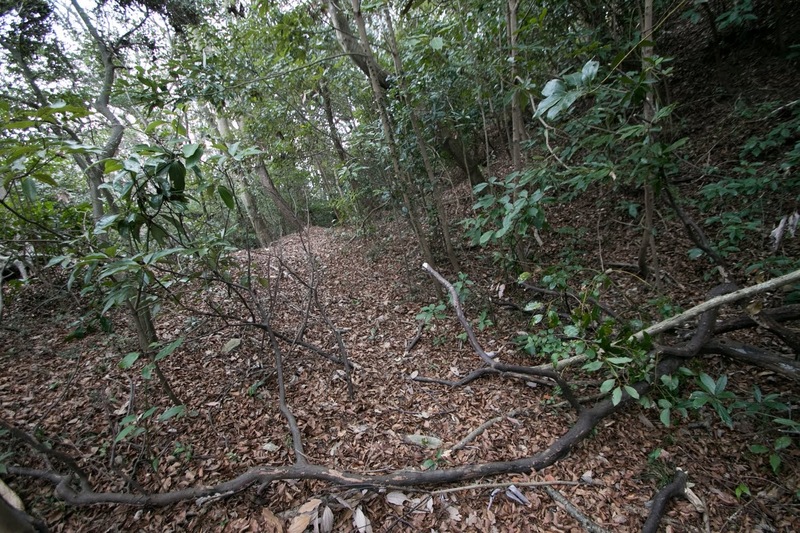 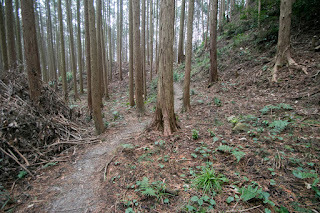 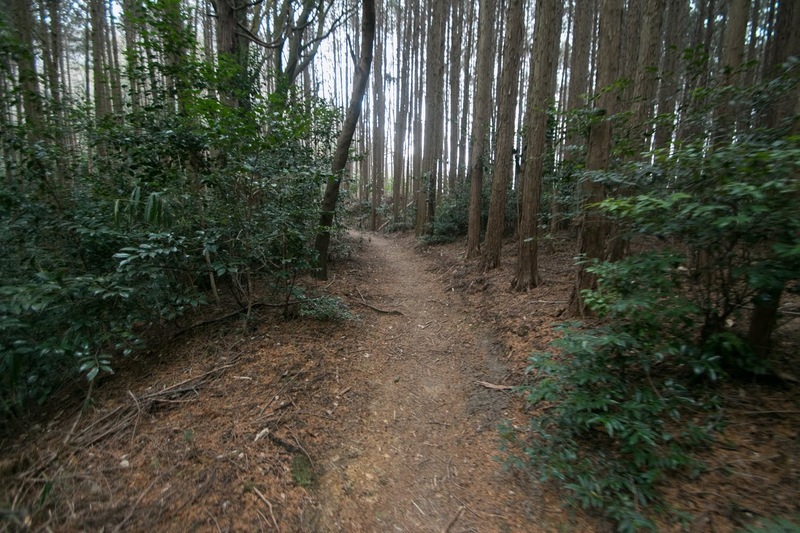 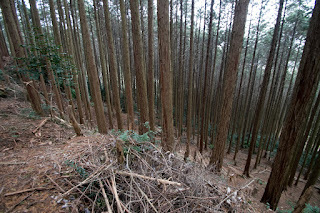 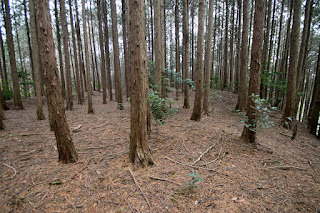 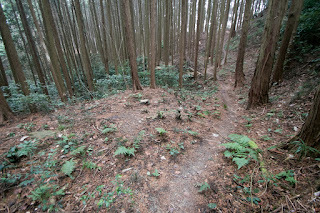 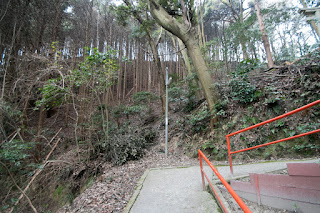 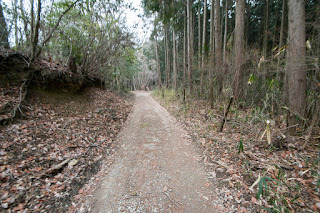 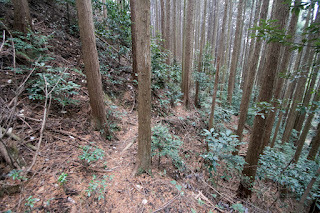 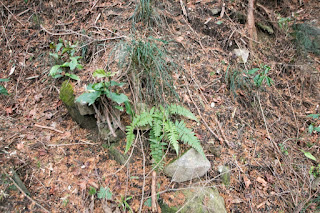 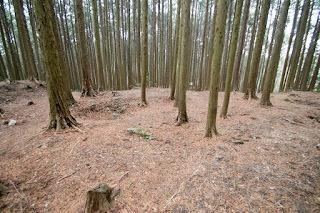 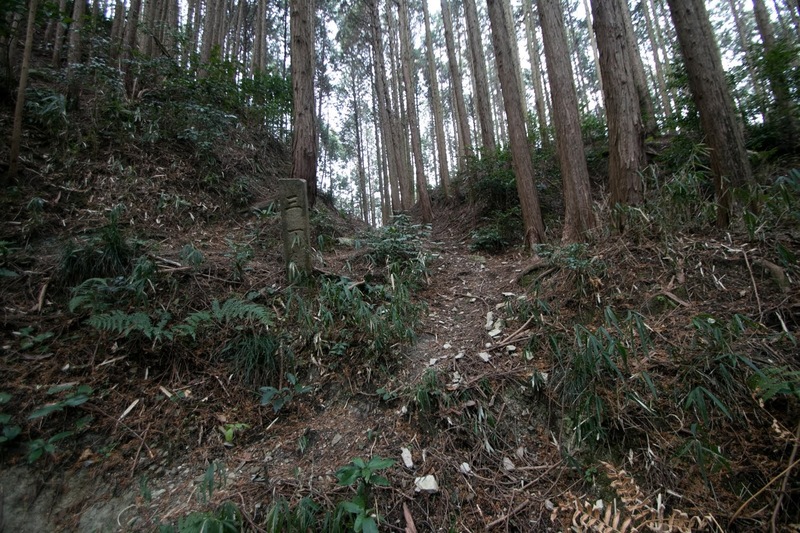 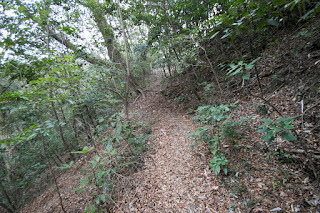 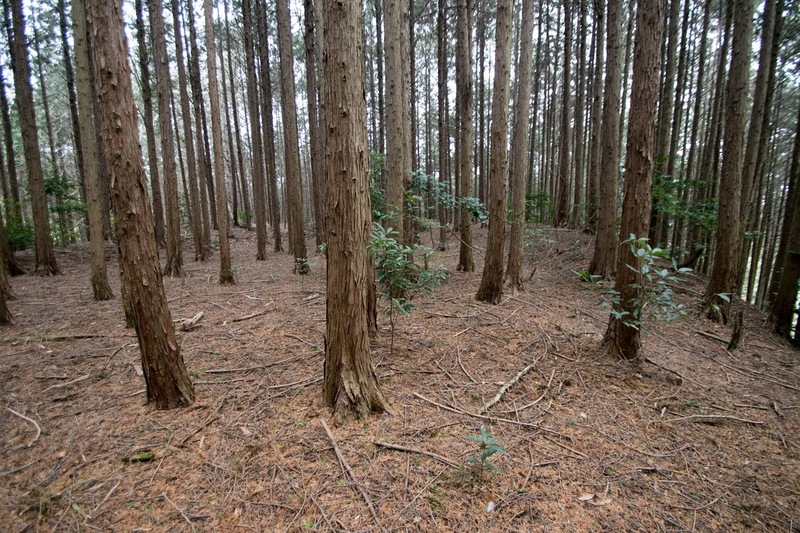 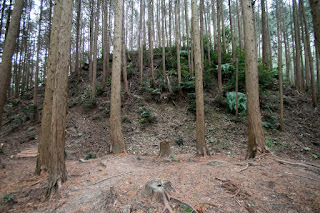 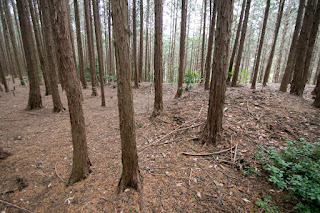 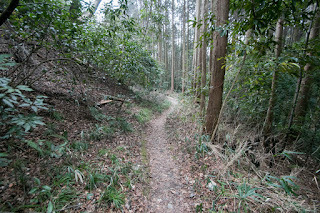 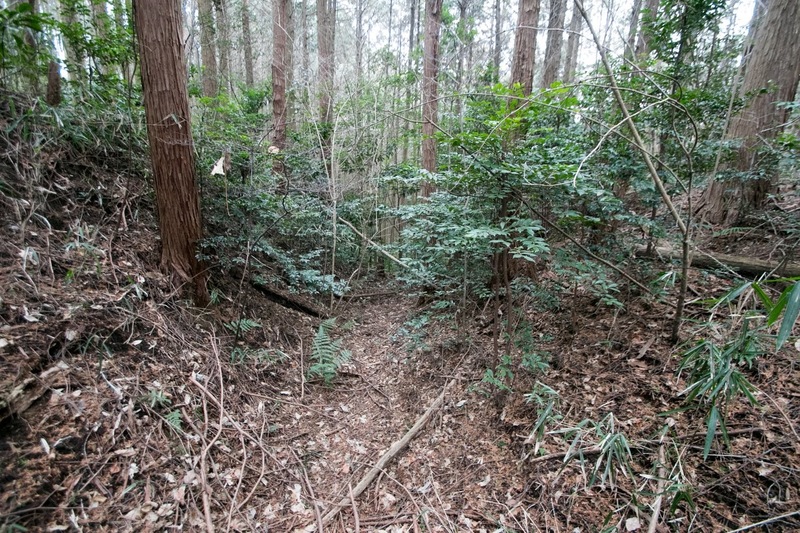 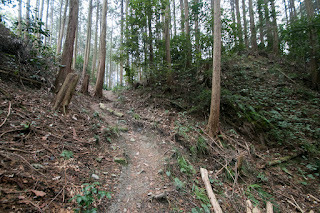 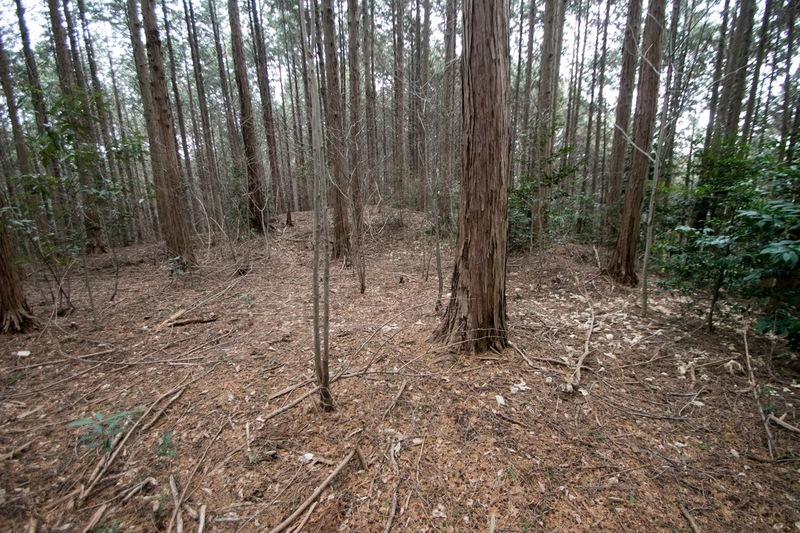 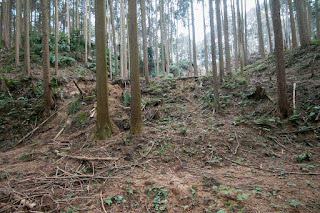 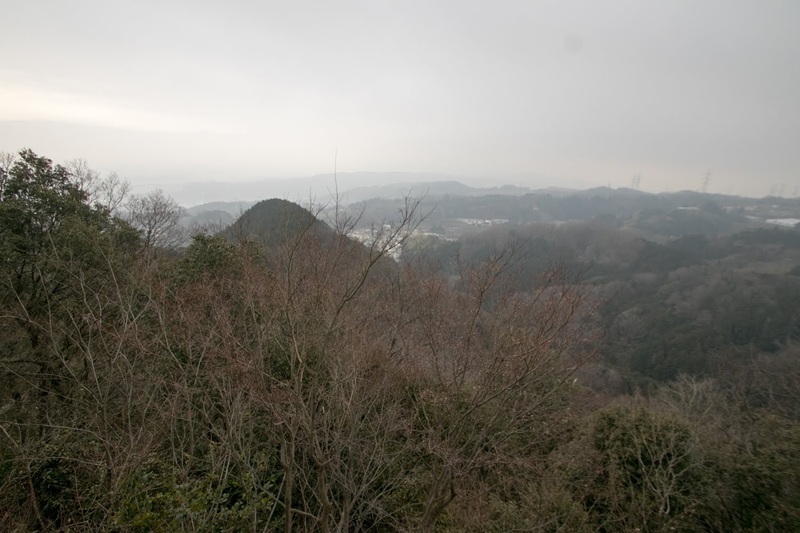 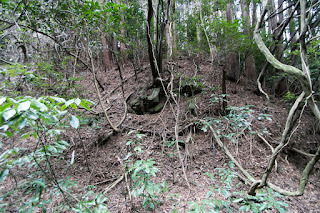 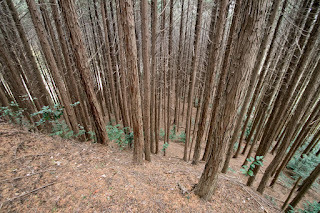 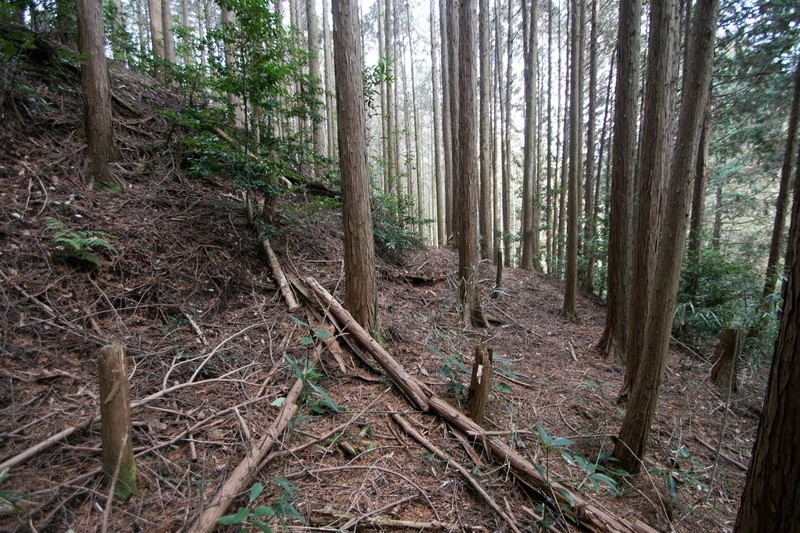 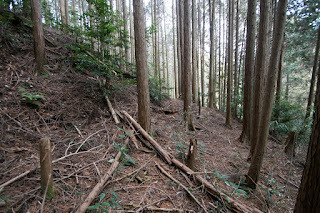 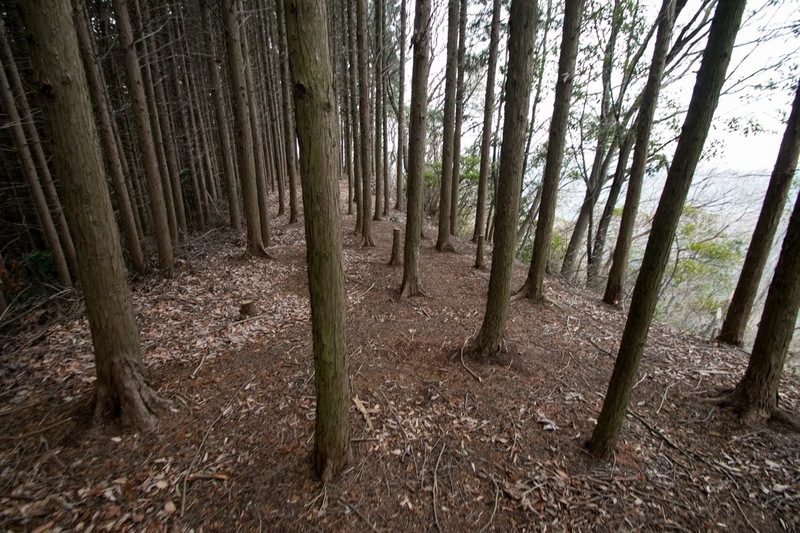 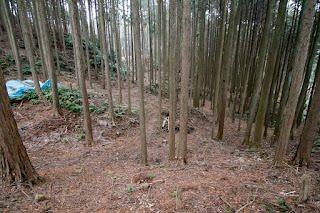 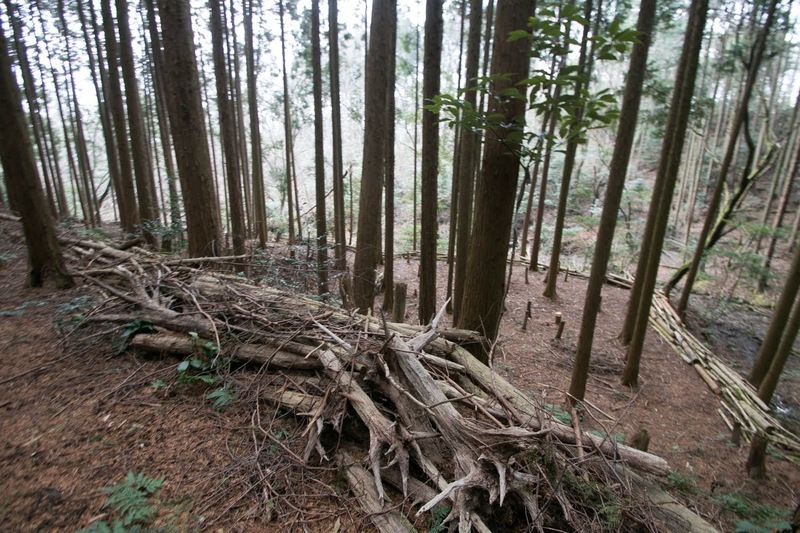 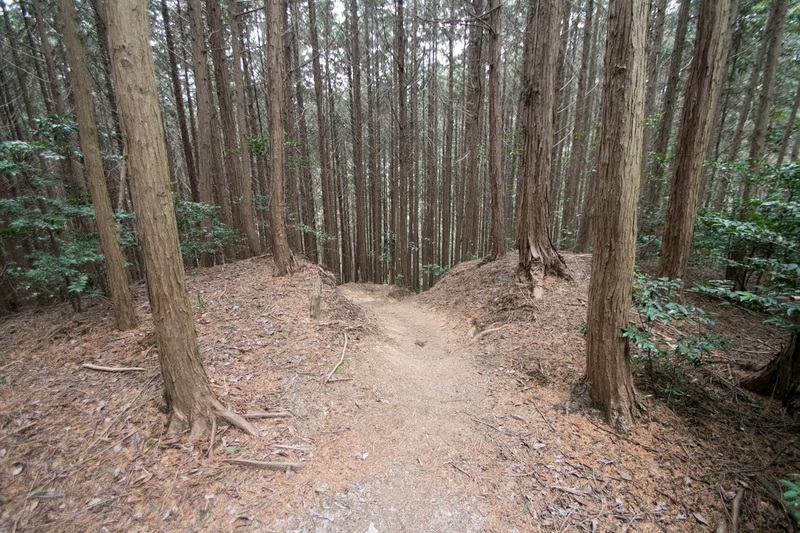 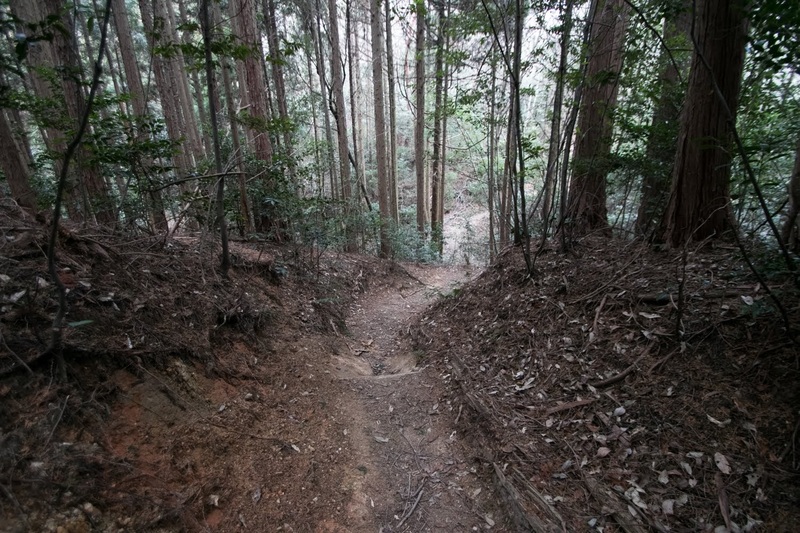 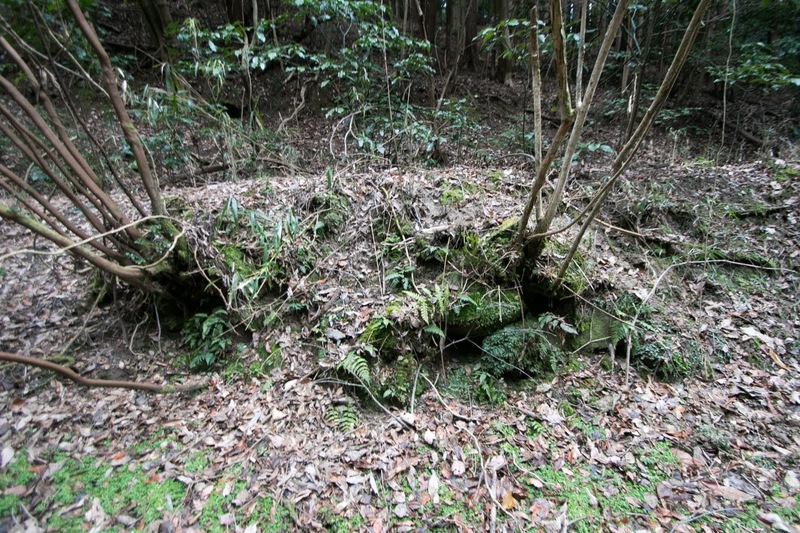 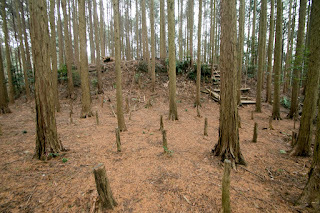 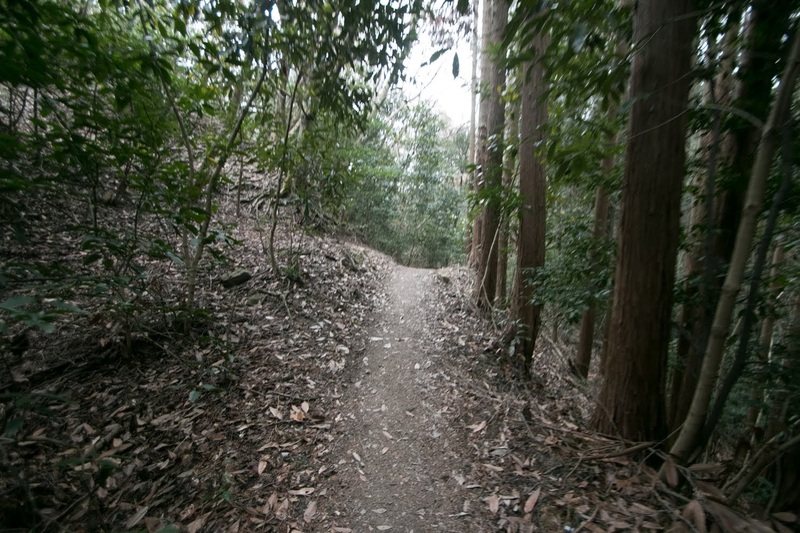 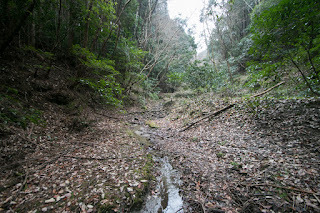 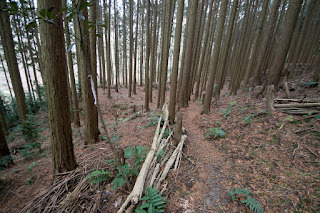 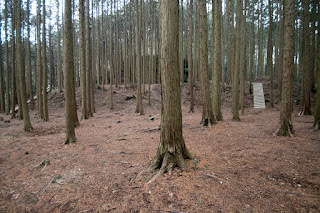 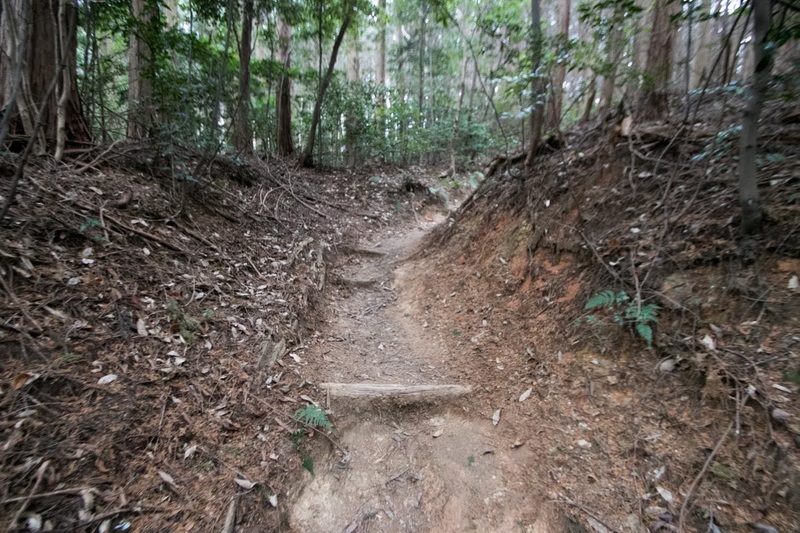 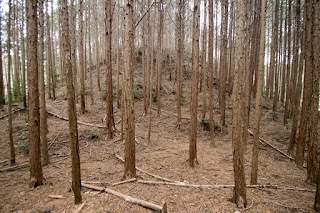 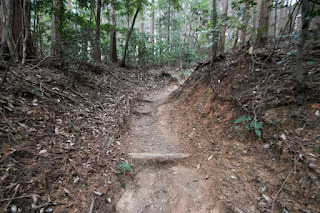 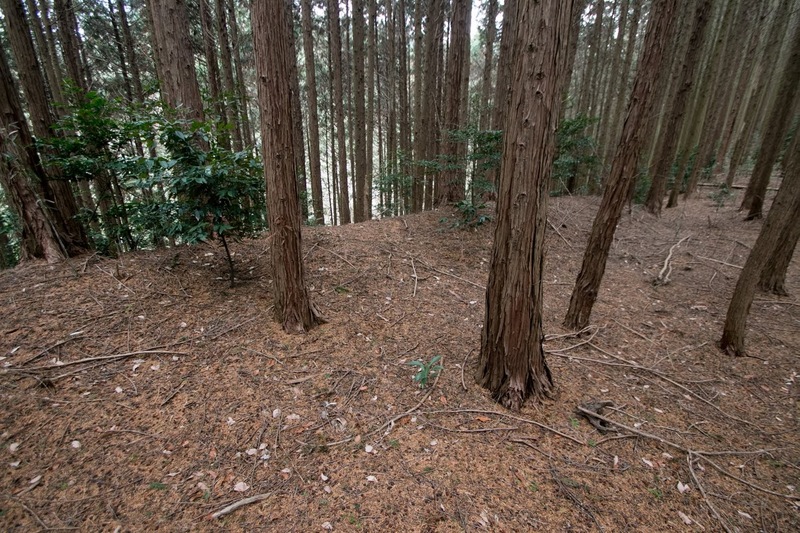 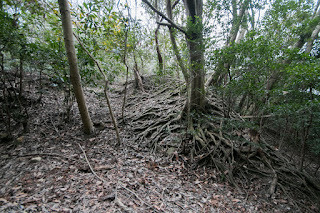 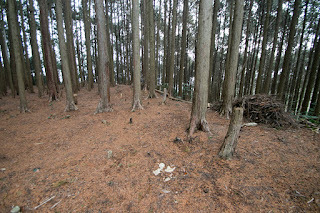 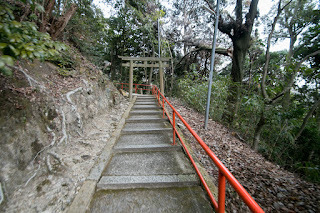 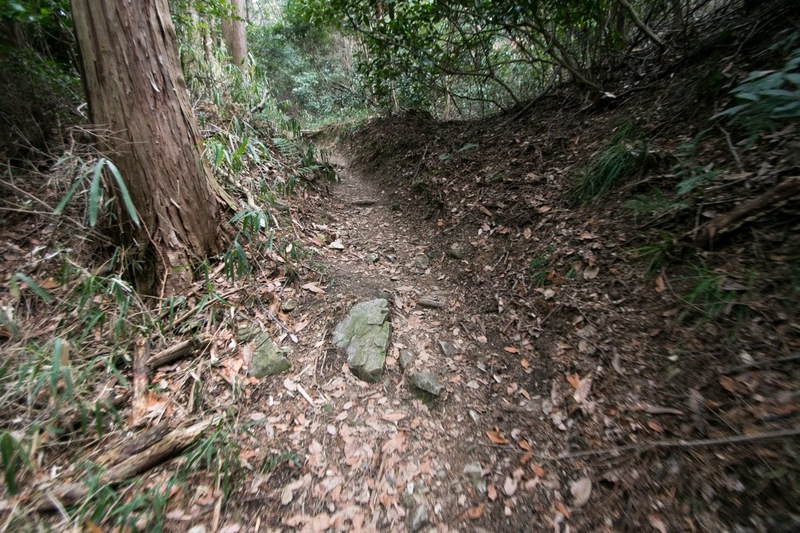 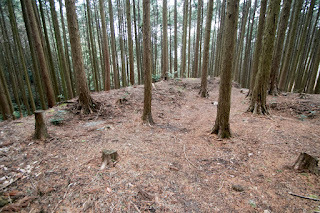 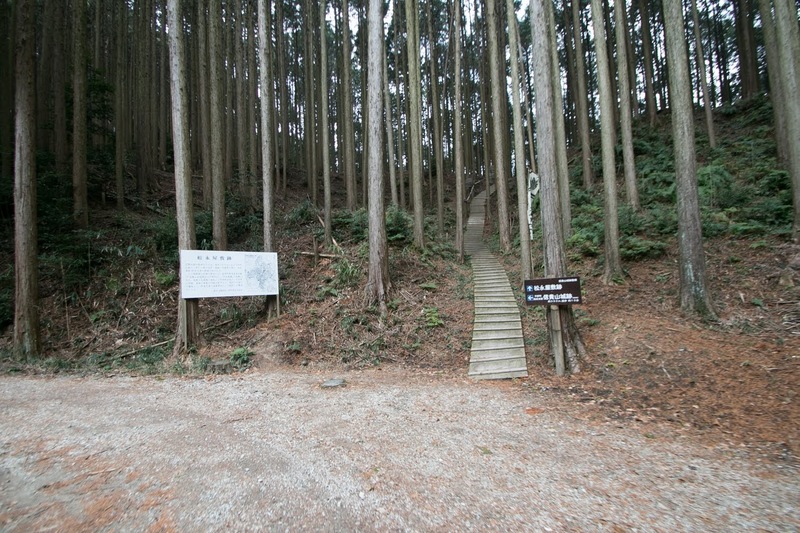 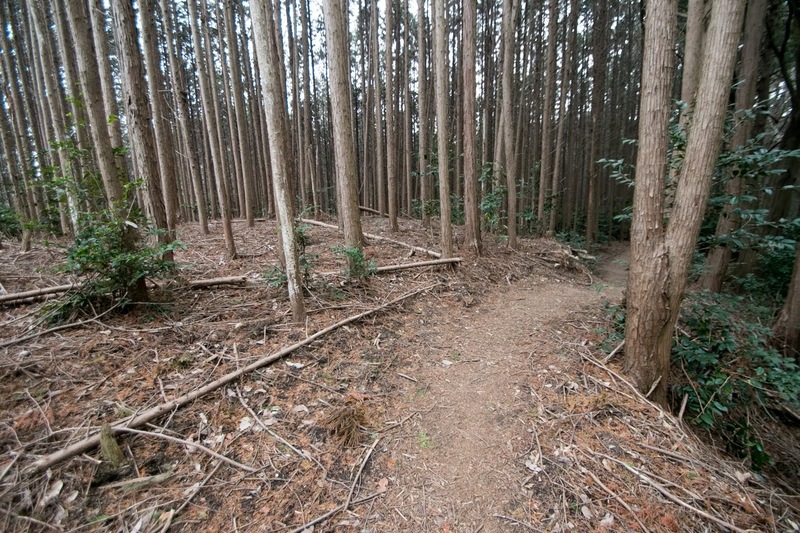 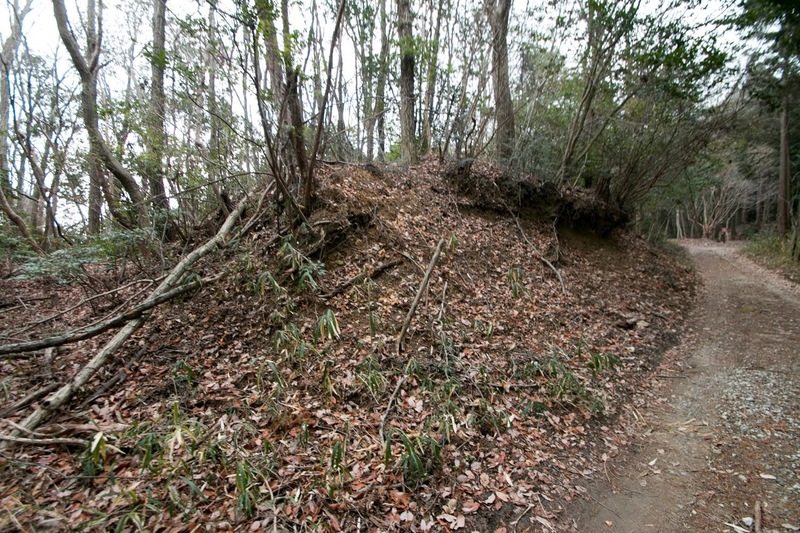 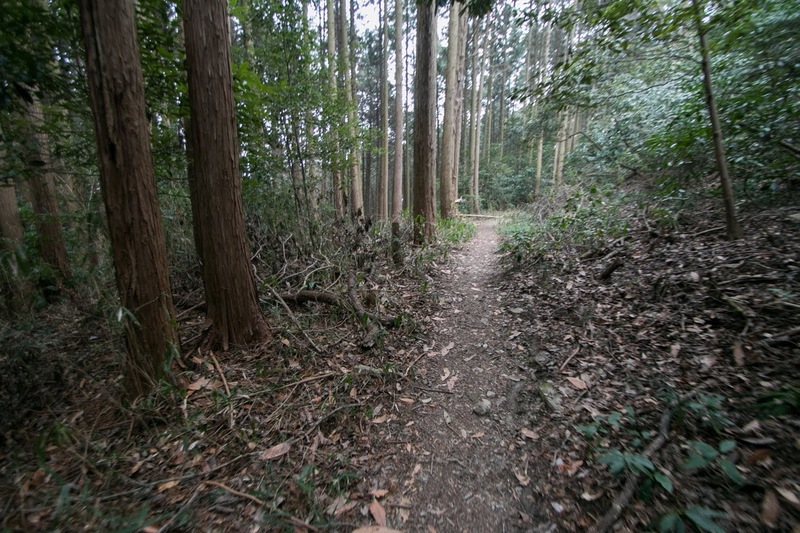 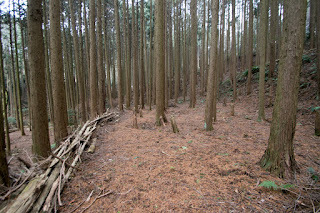 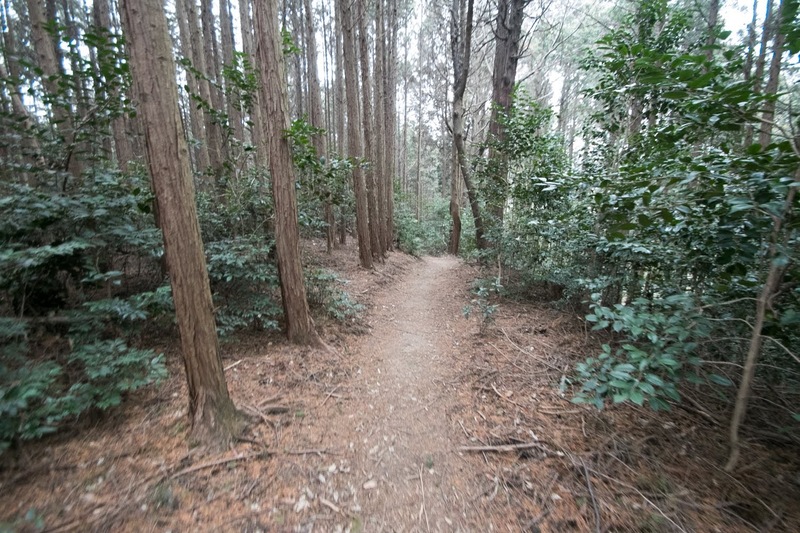 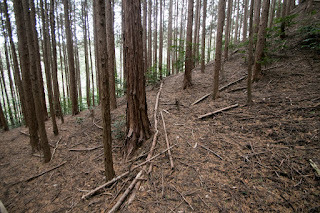 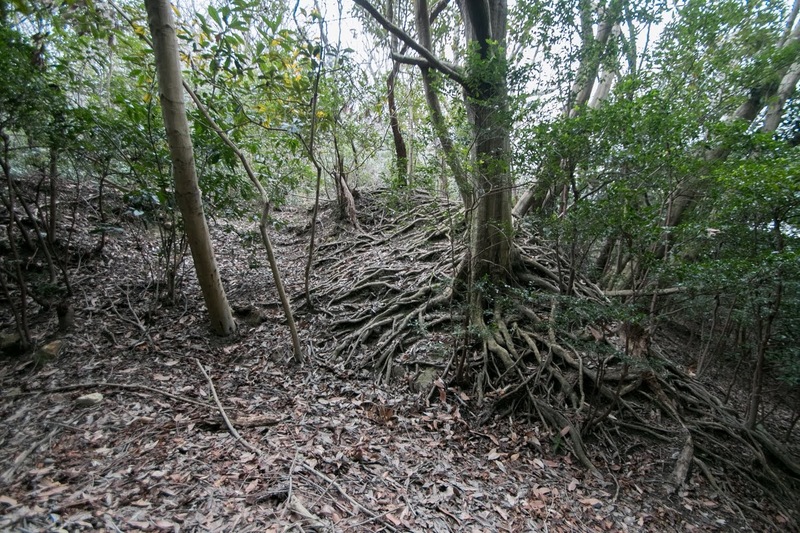 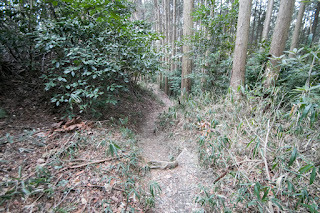 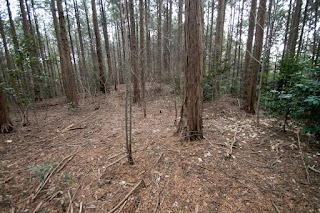 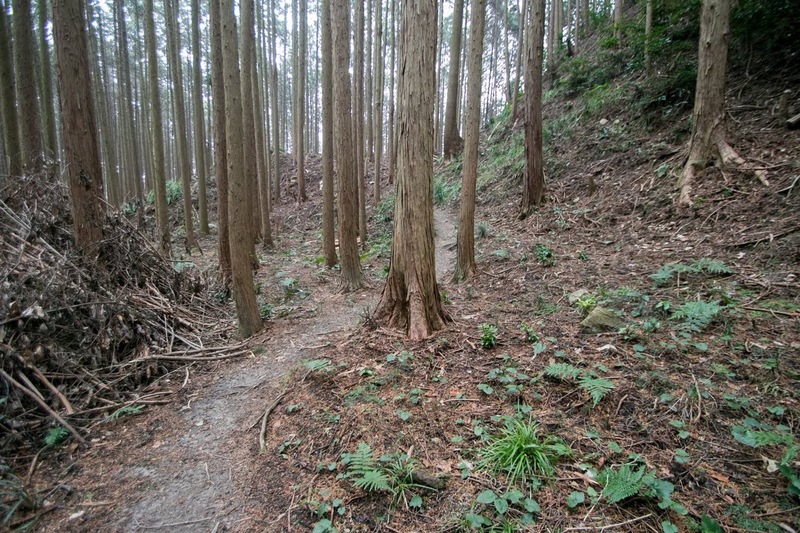 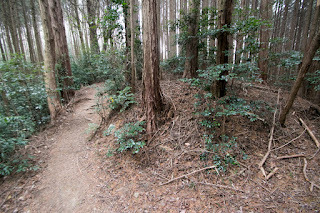 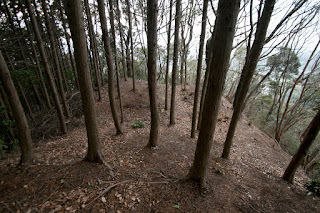 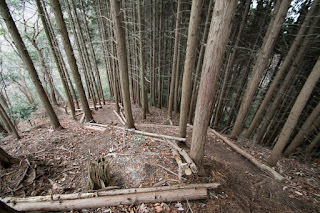 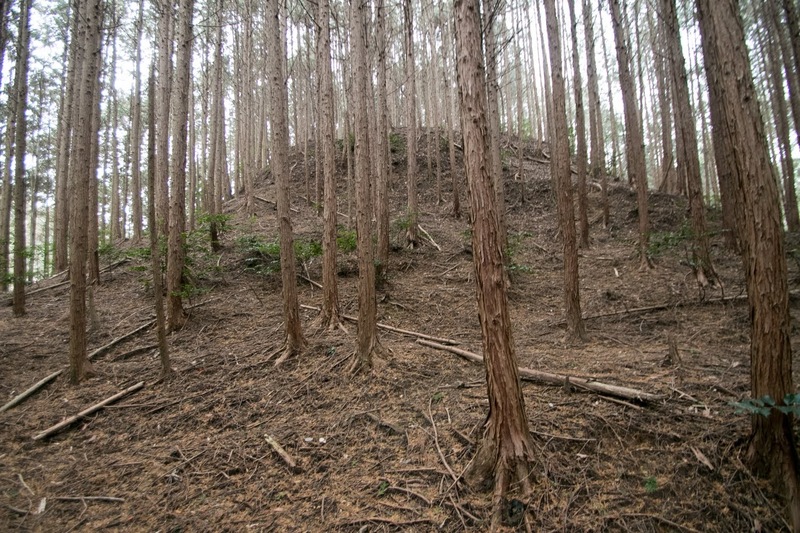 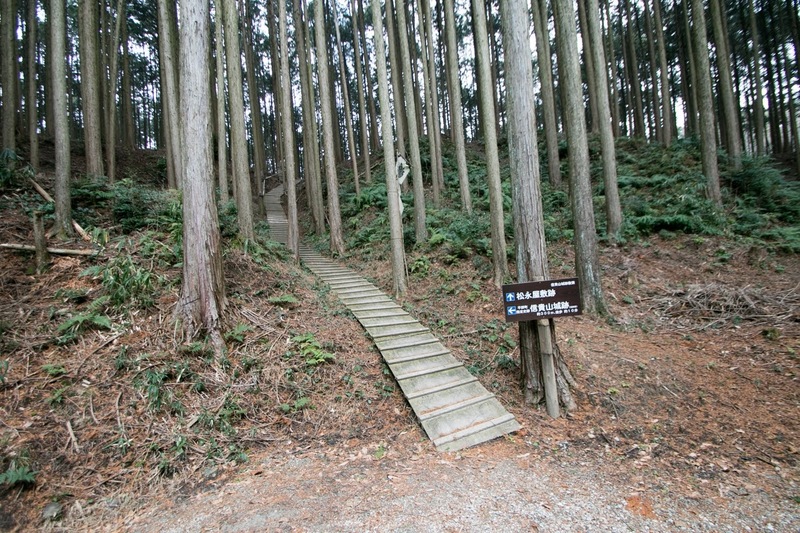 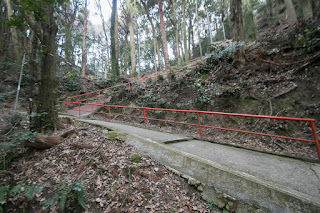 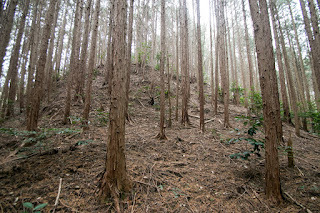 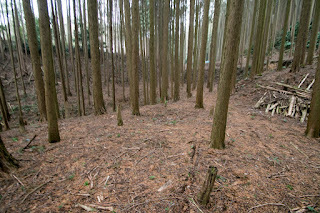 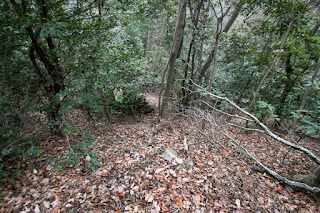 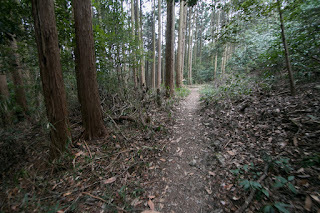 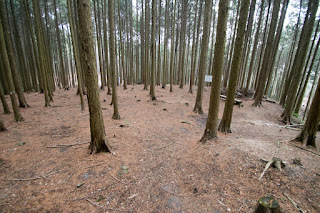 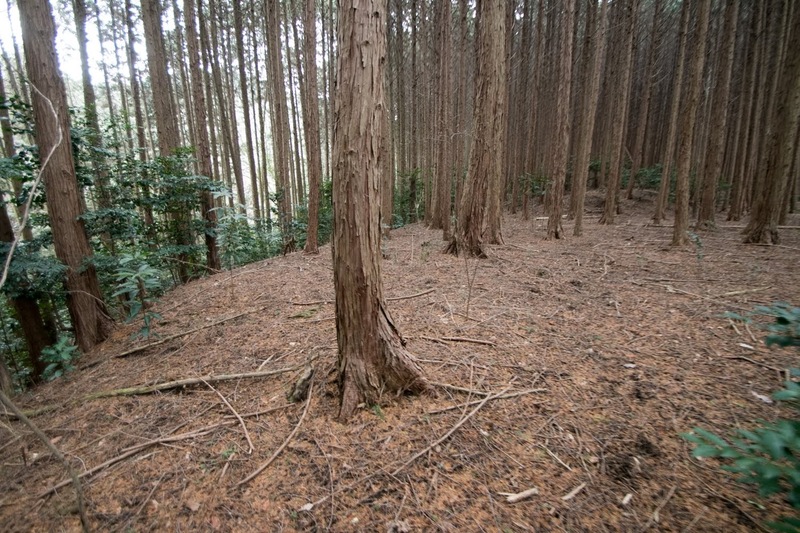 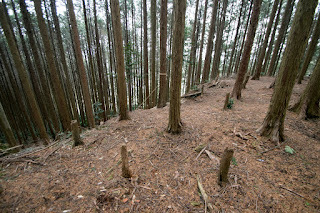 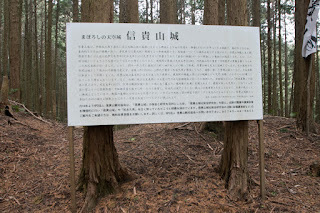 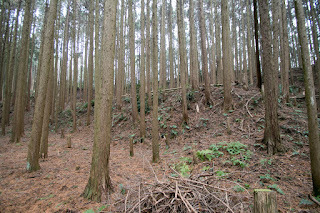 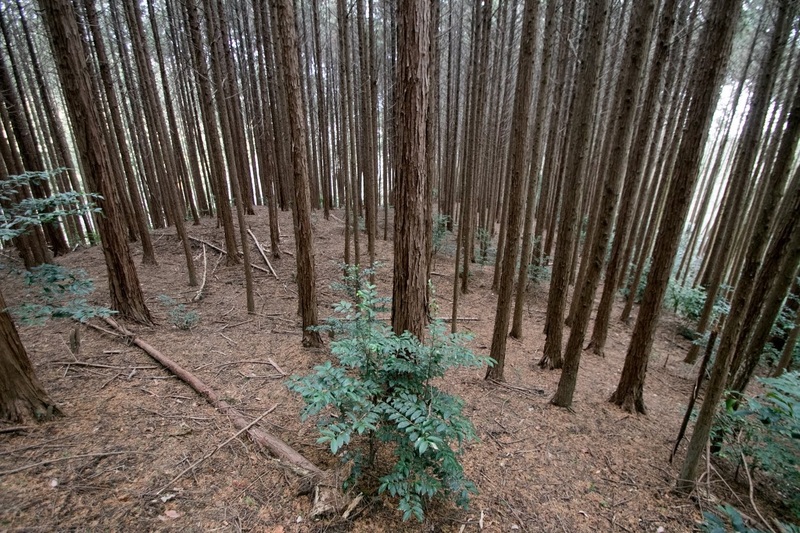 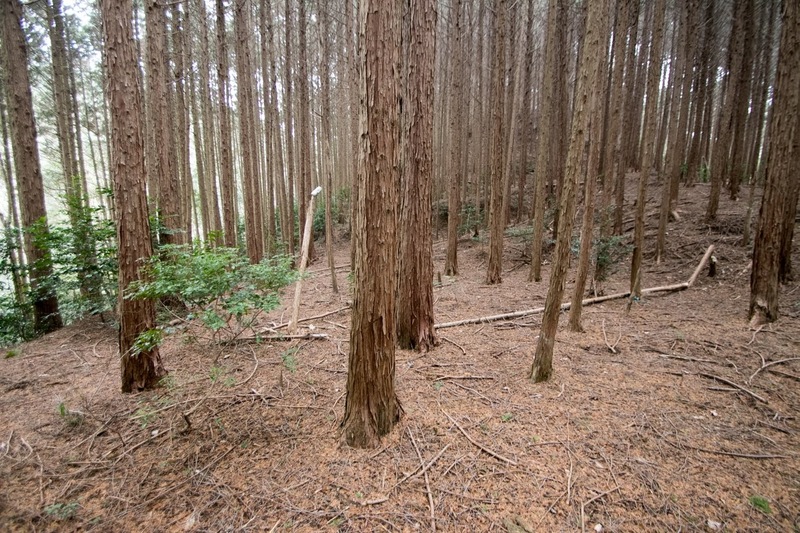 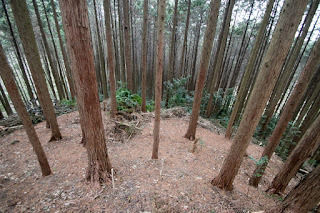 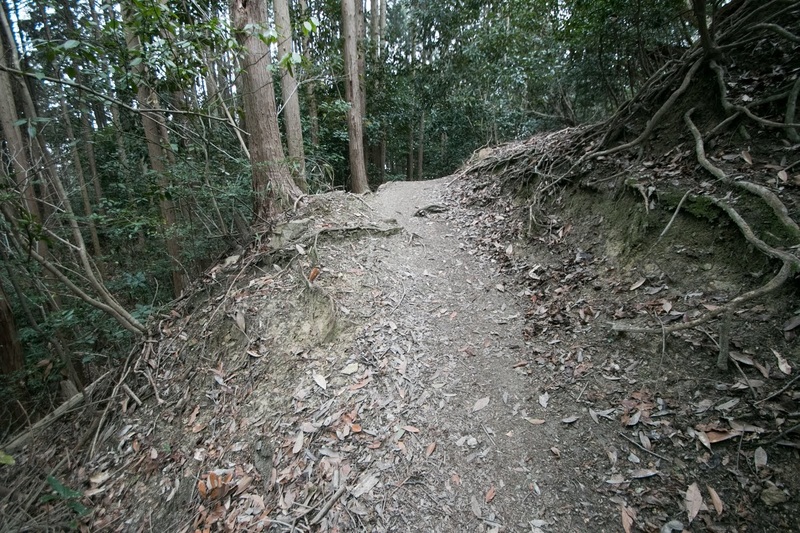 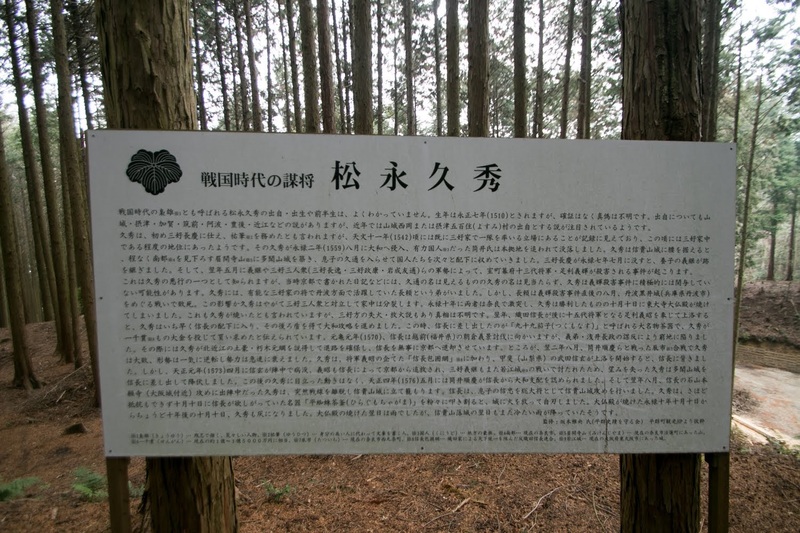 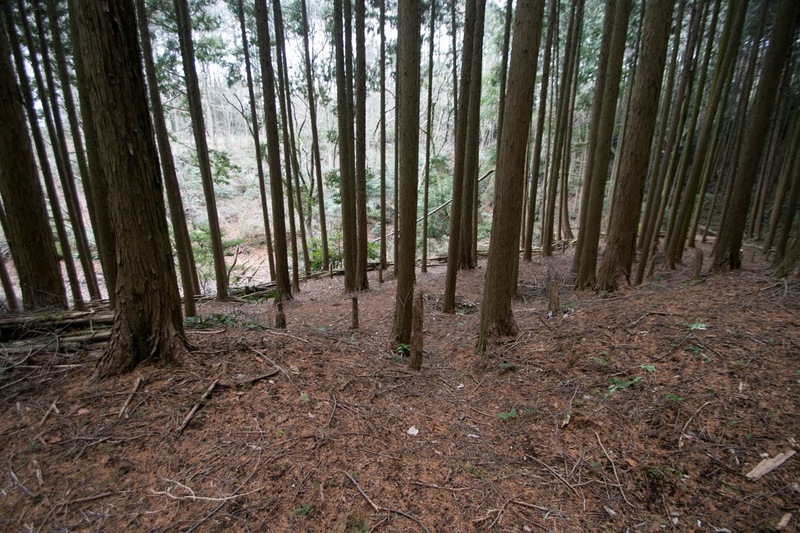 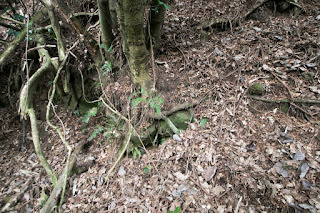 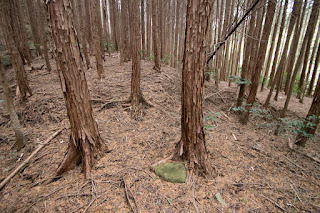 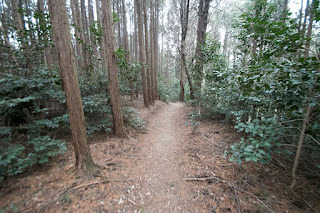 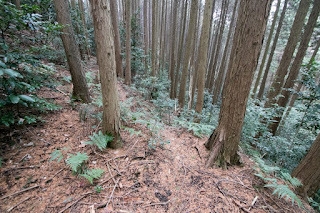 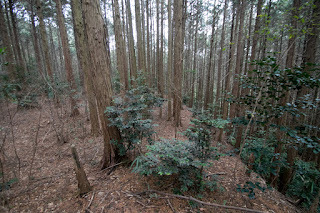 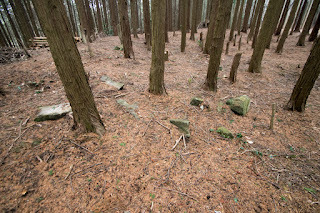 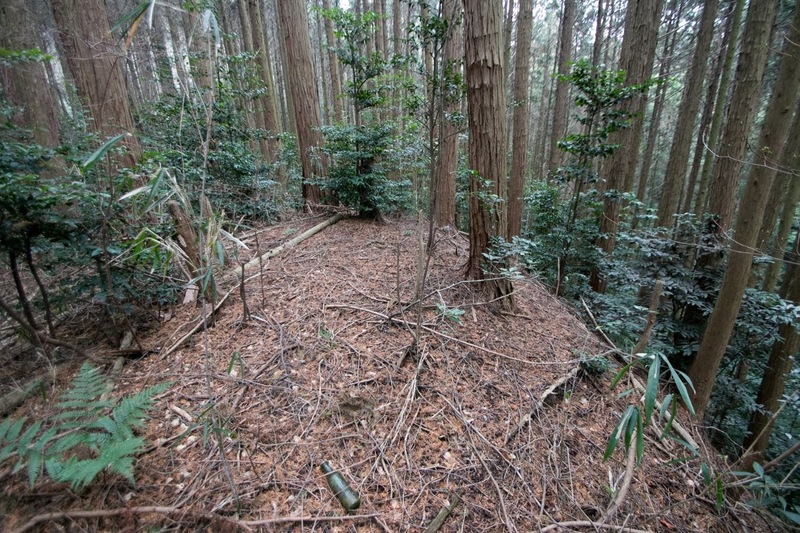 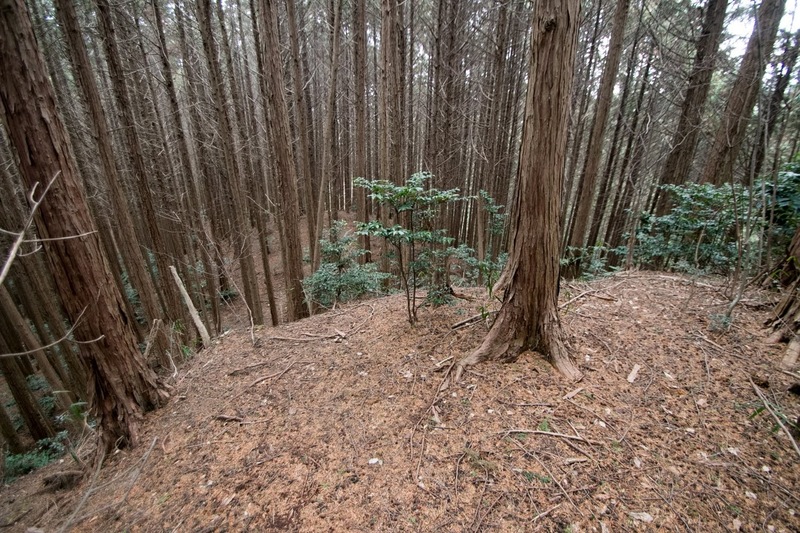 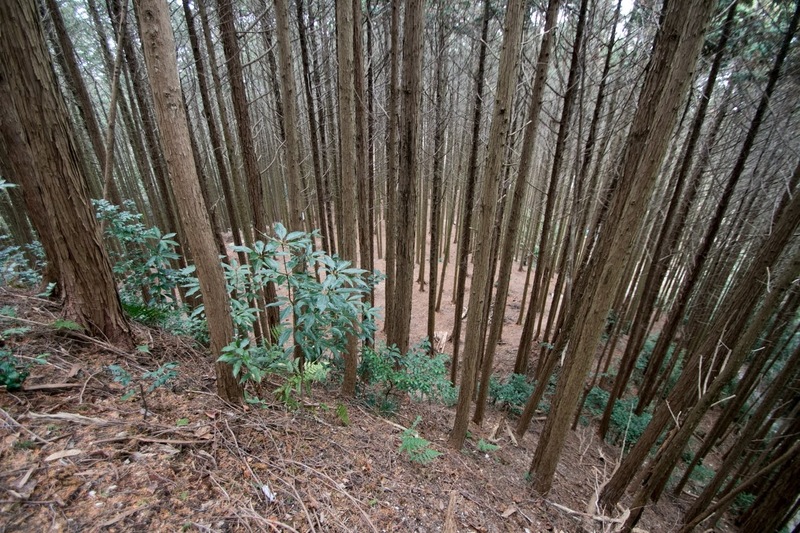 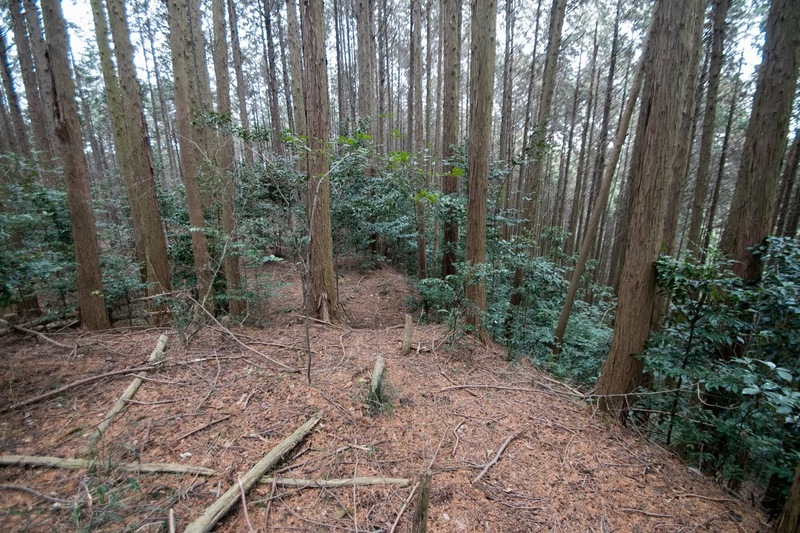 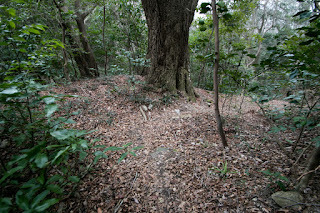 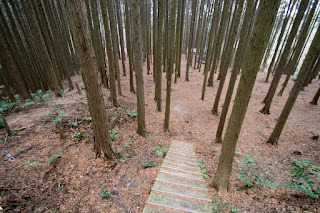 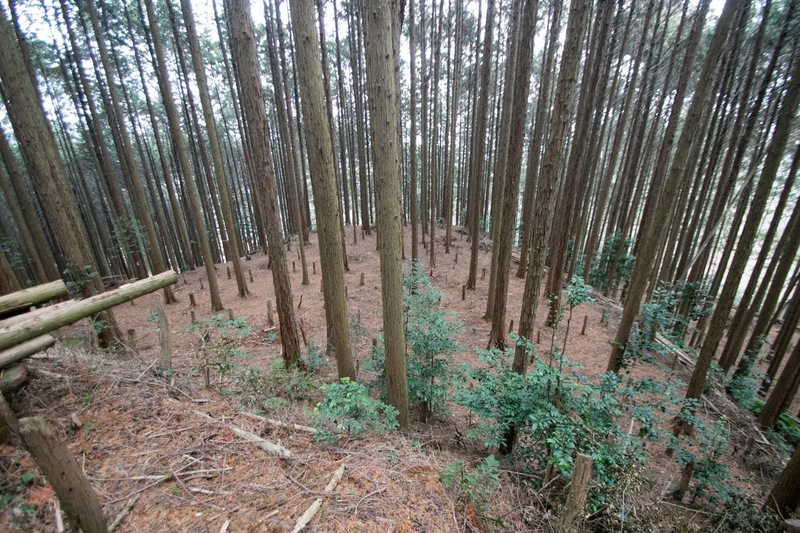 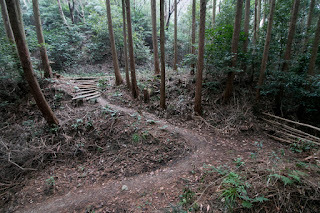 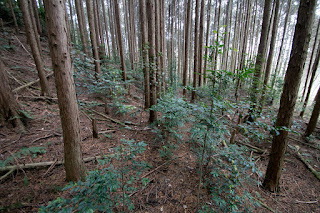 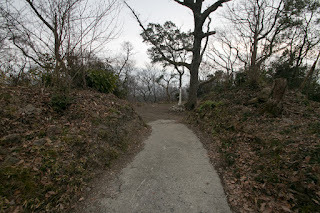 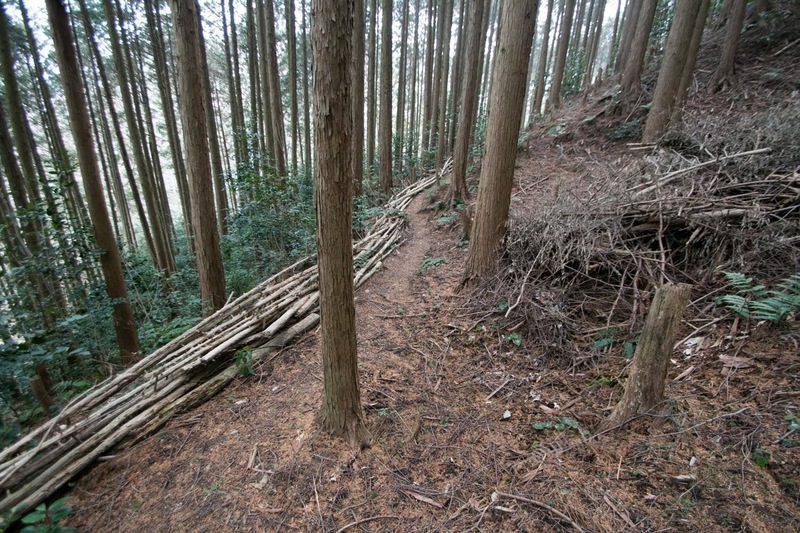 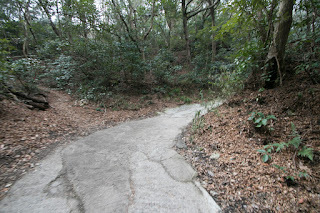 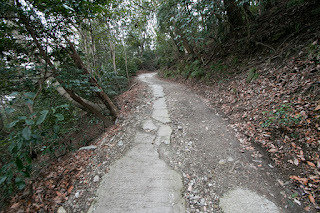 Shigisan mountain exists at just the north of narrow valley of Yamatogawa river which connects Nara basin and Osaka plain, thus it was a suitable place for outsider to intrude and govern Nara area. 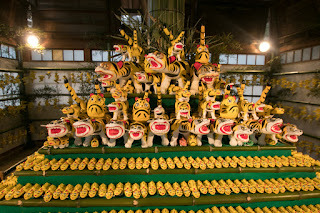 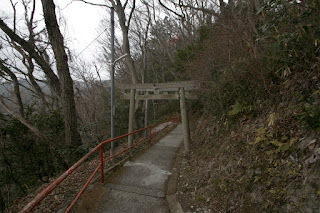 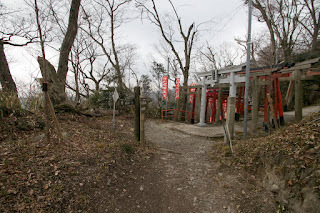 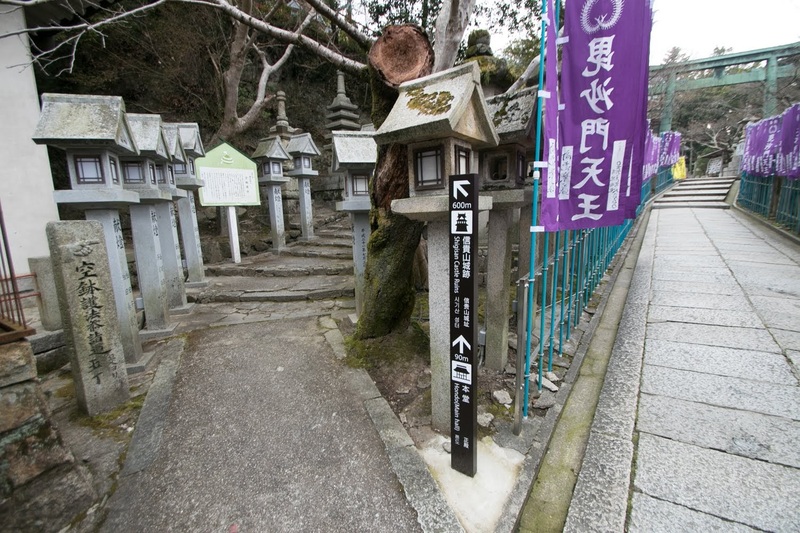 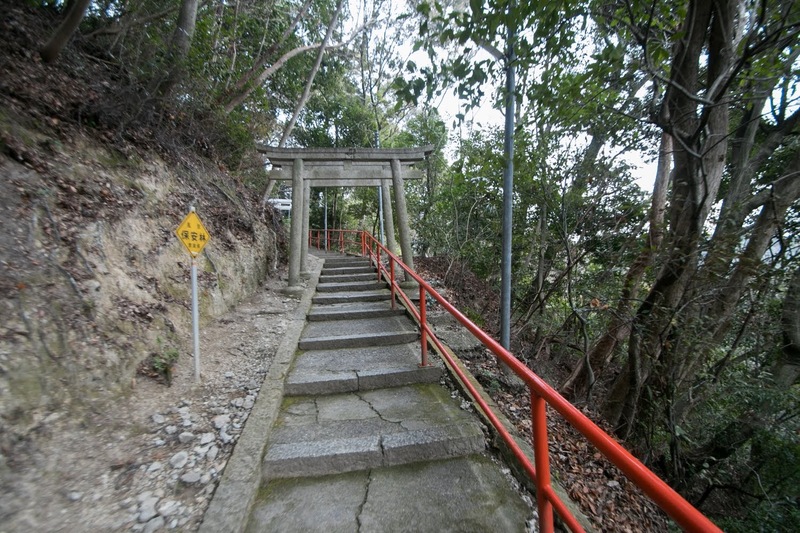 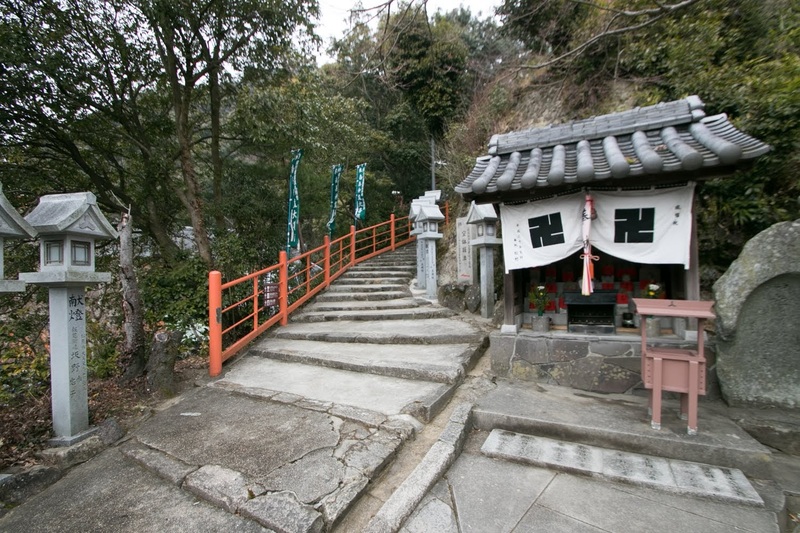 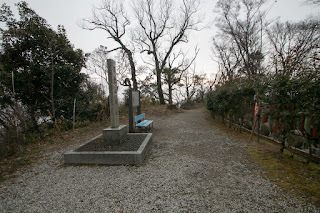 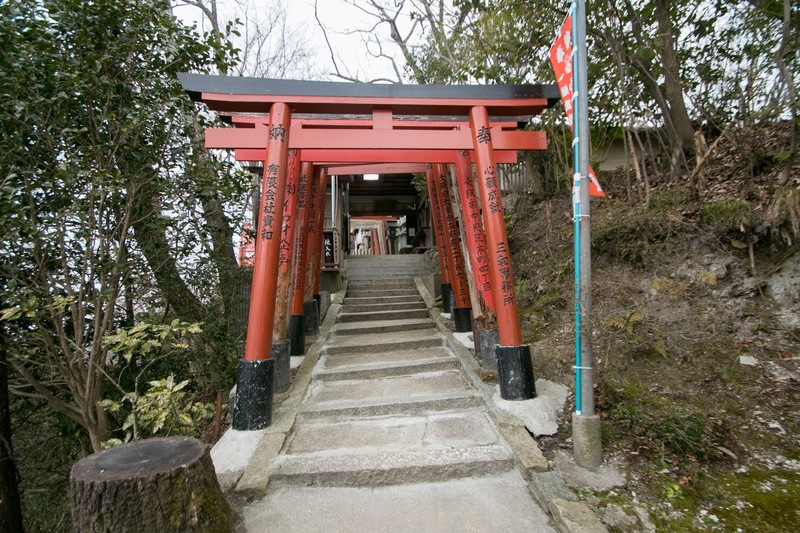 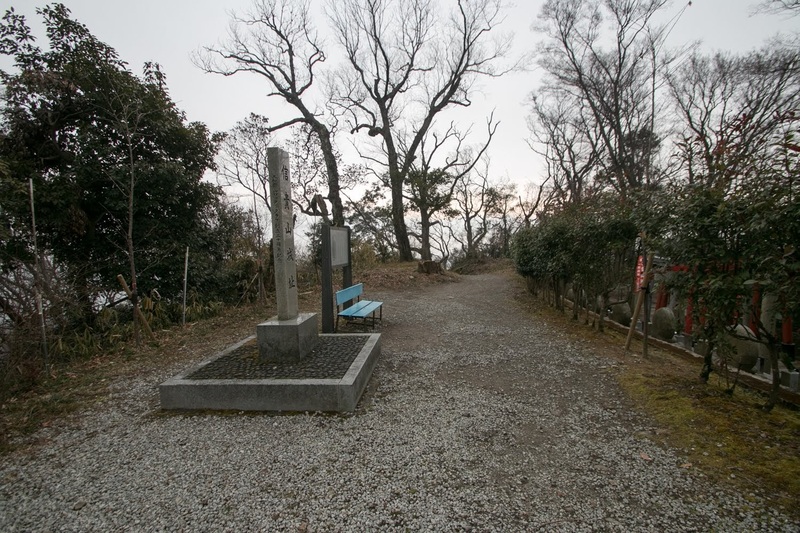 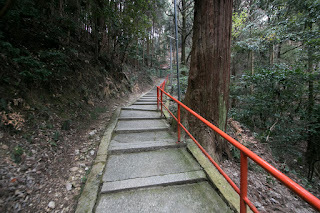 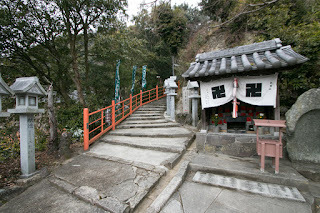 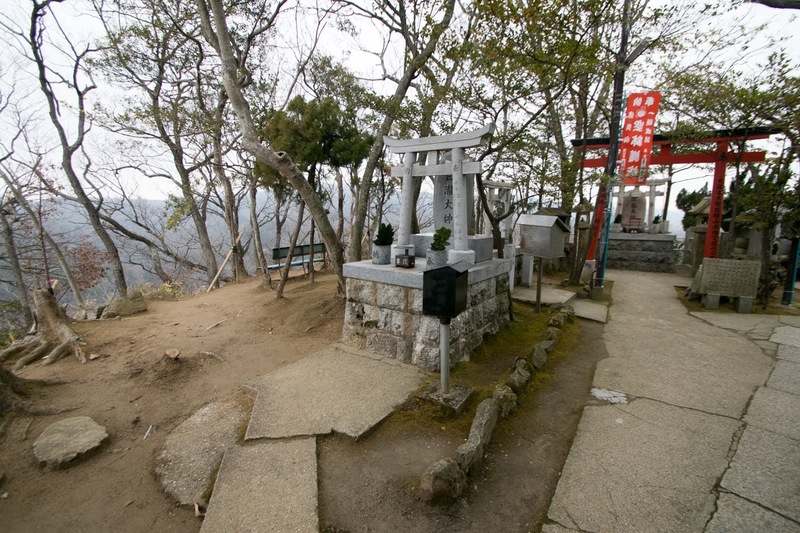 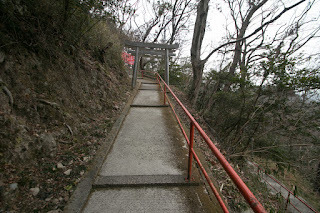 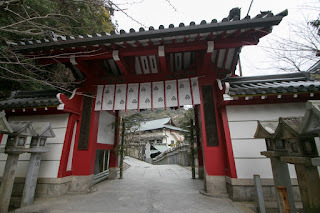 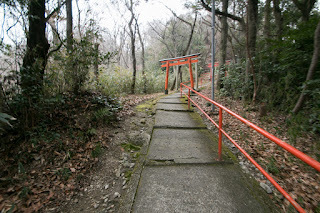 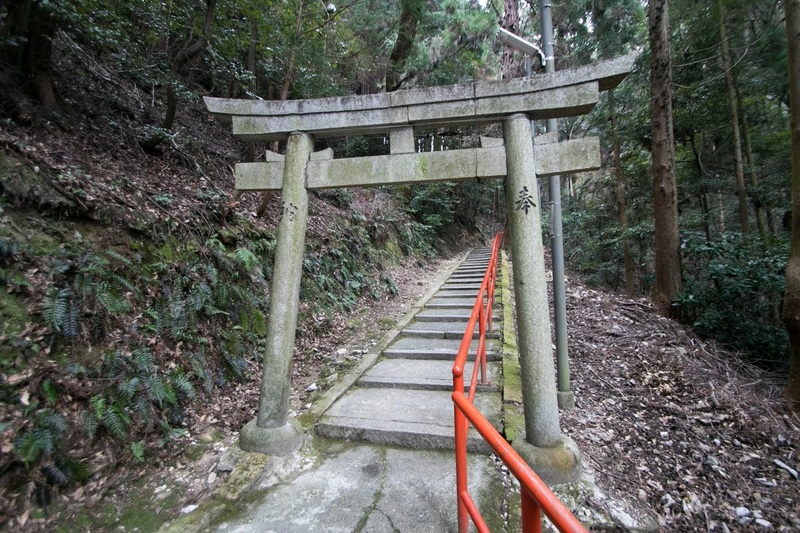 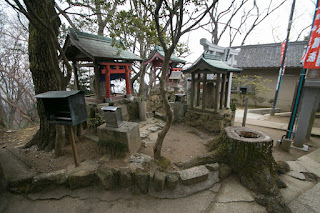 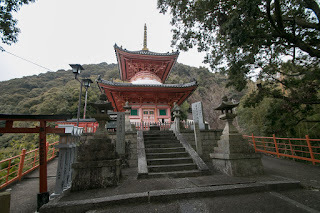 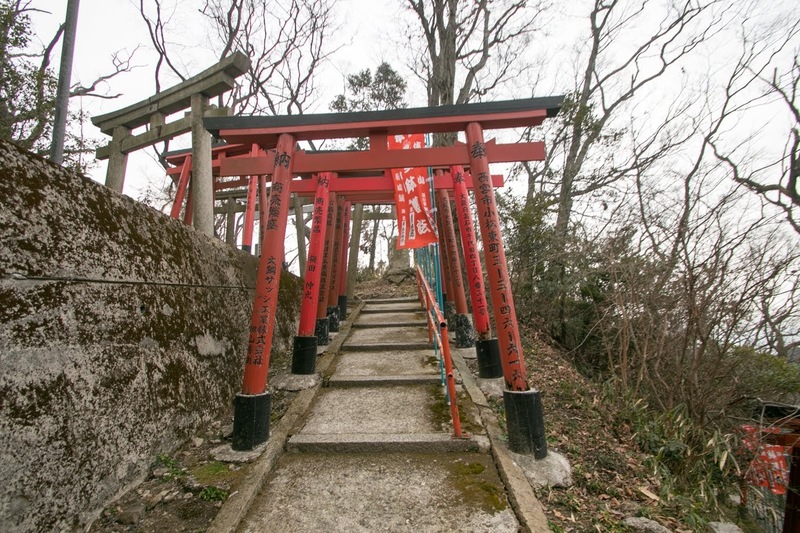 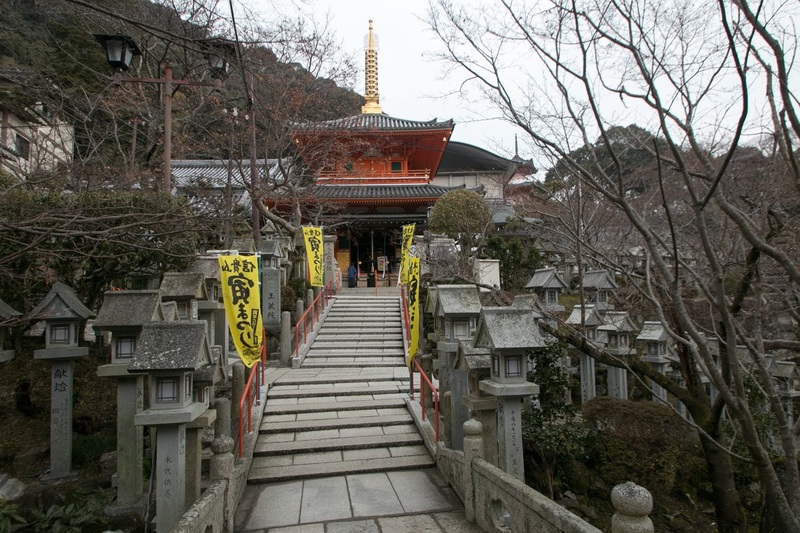 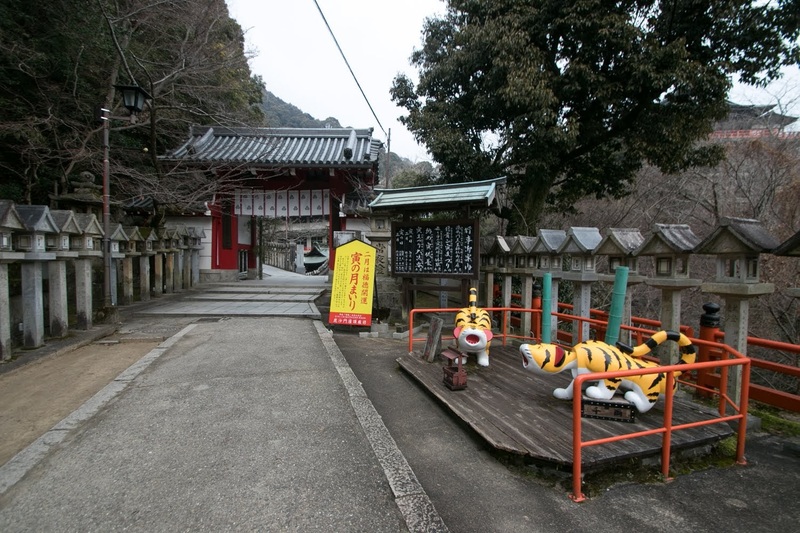 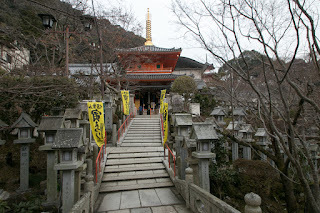 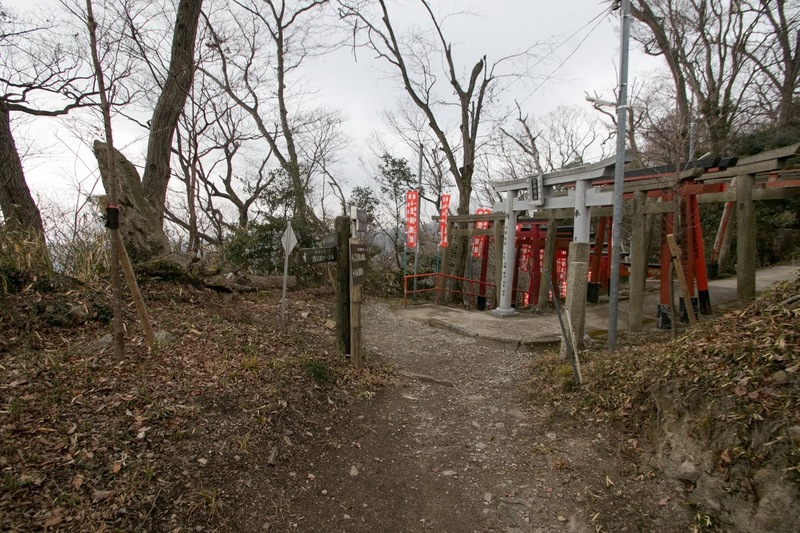 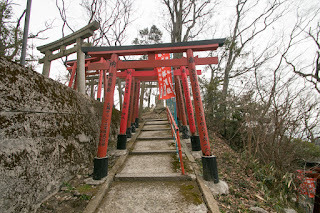 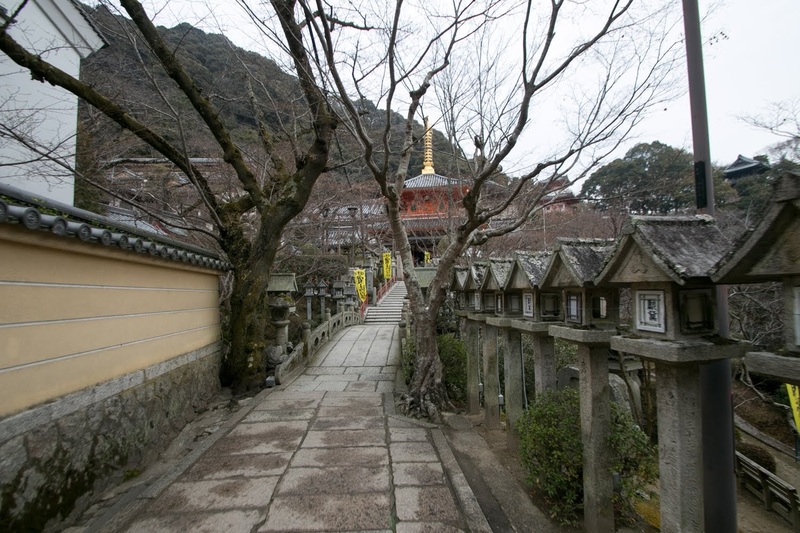 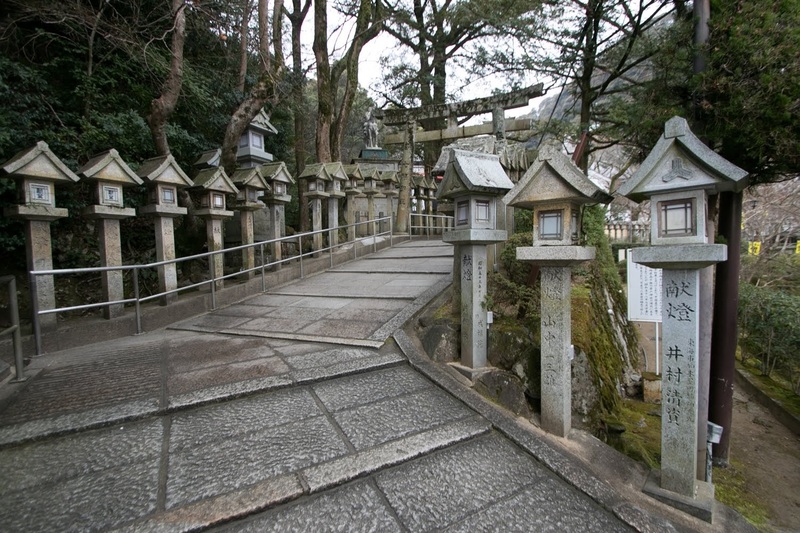 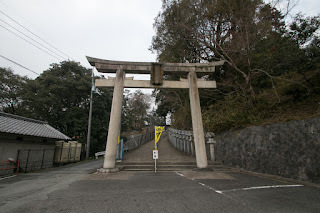 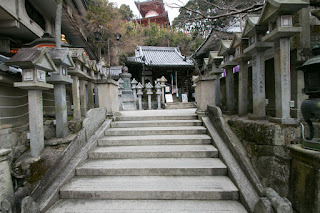 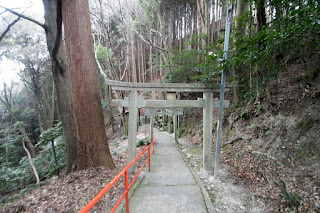 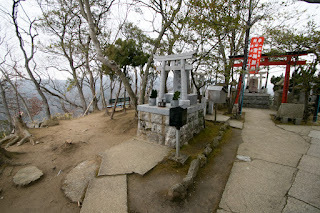 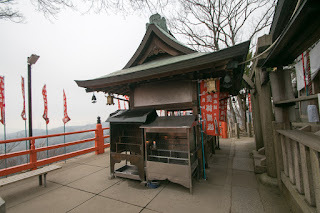 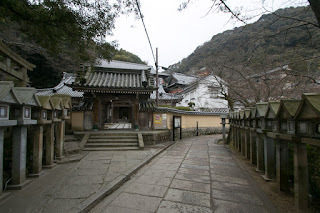 Further, there was a historical temple named Chogosonji at the halfway of the mountain, and had gathered adoration from people. 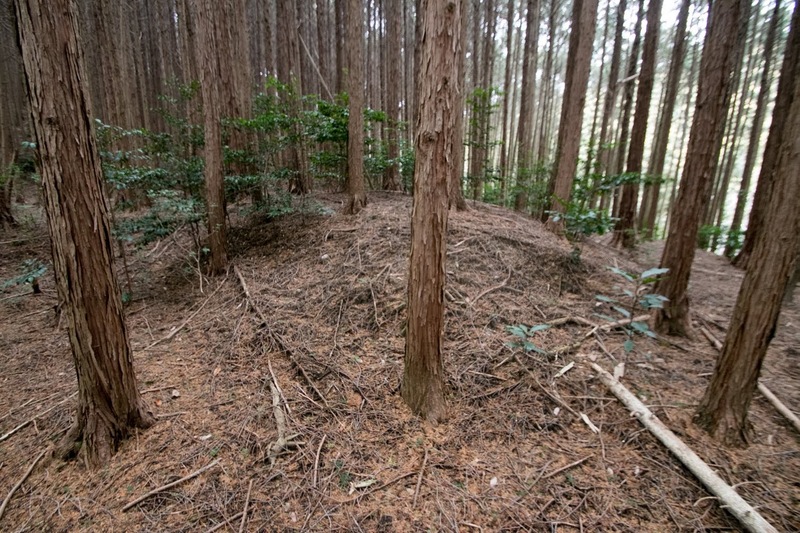 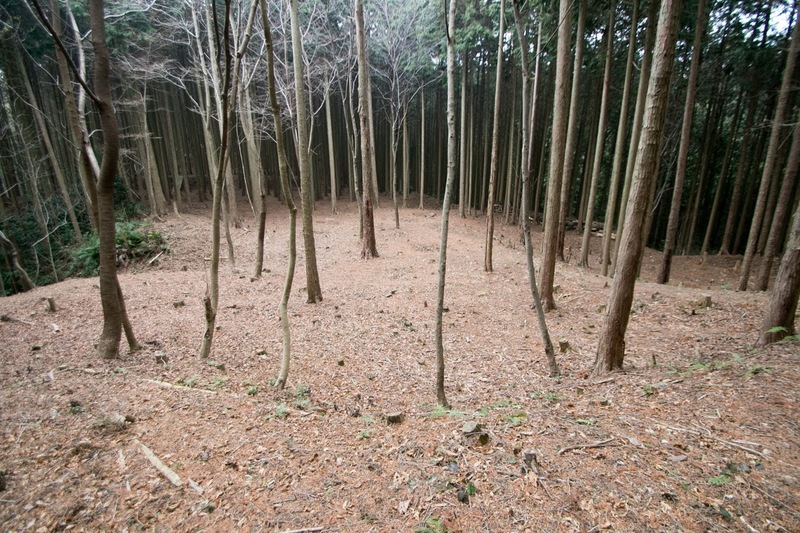 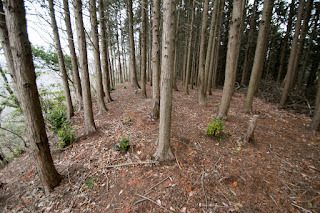 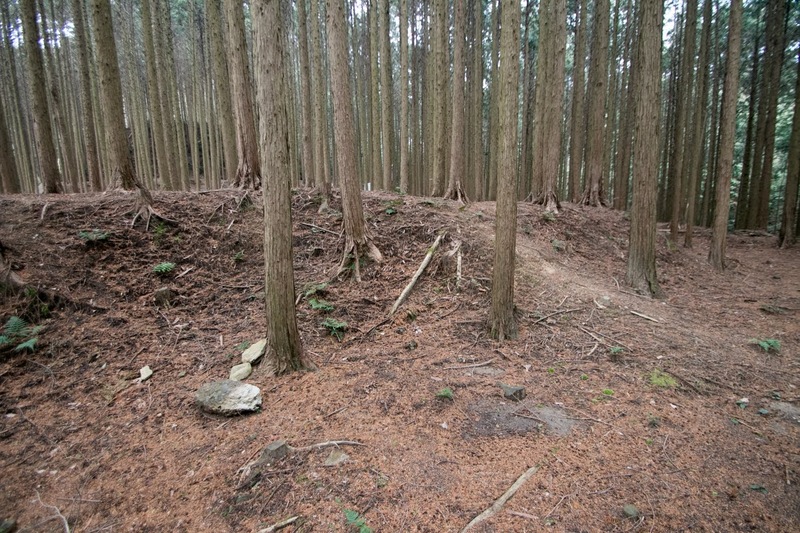 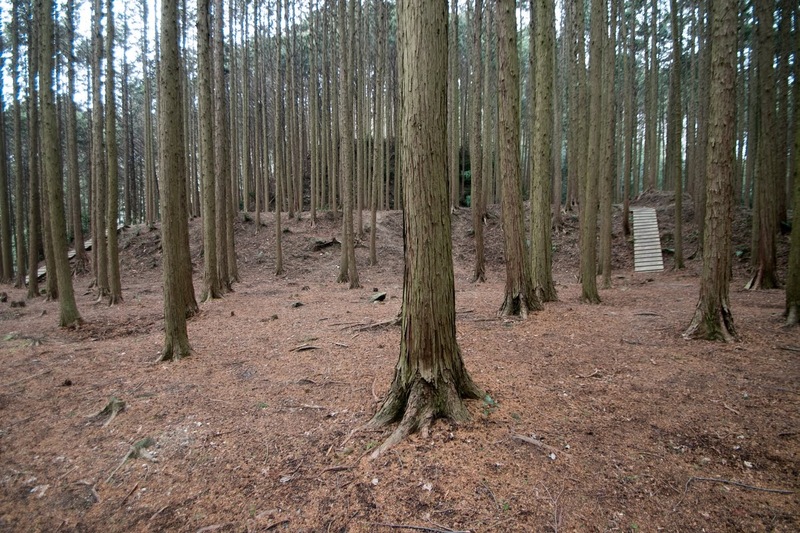 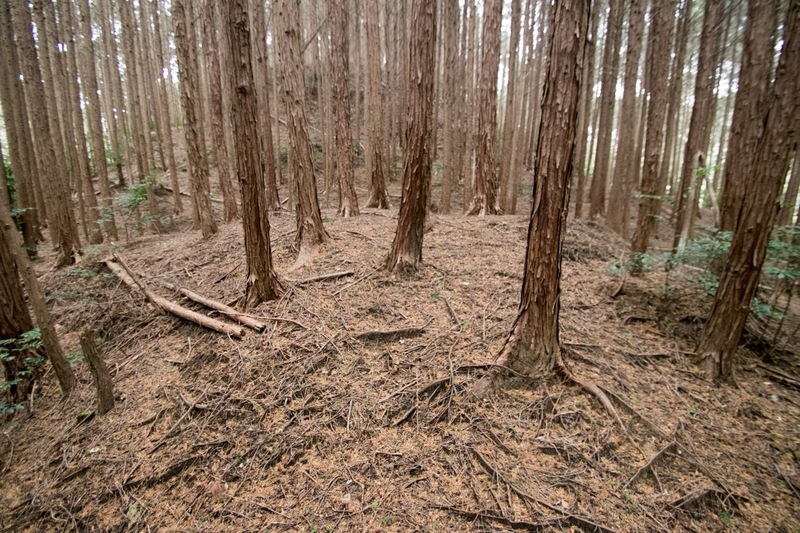 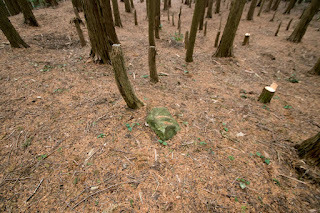 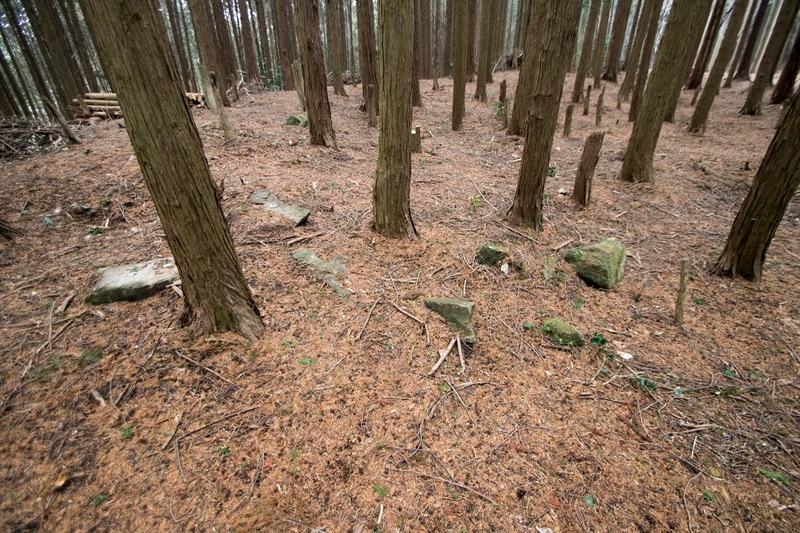 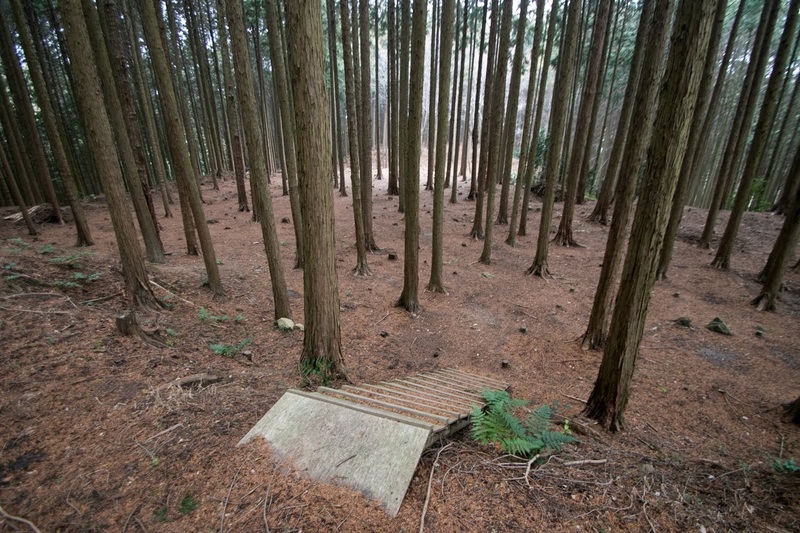 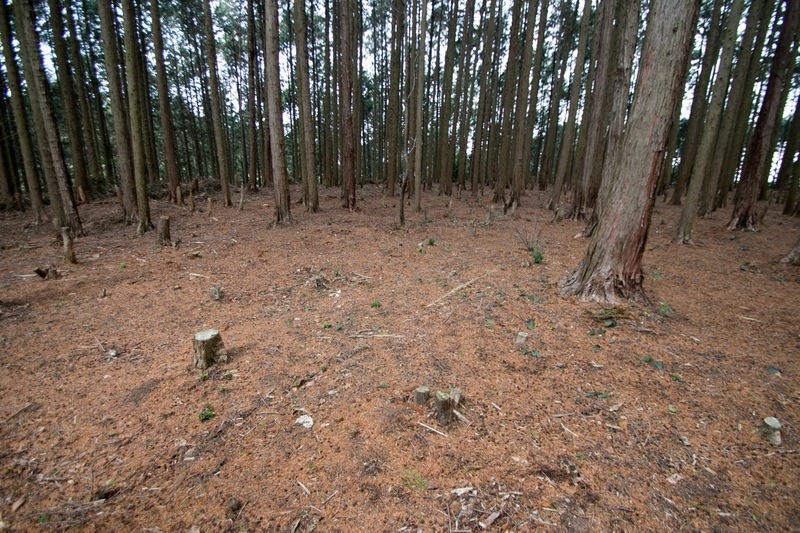 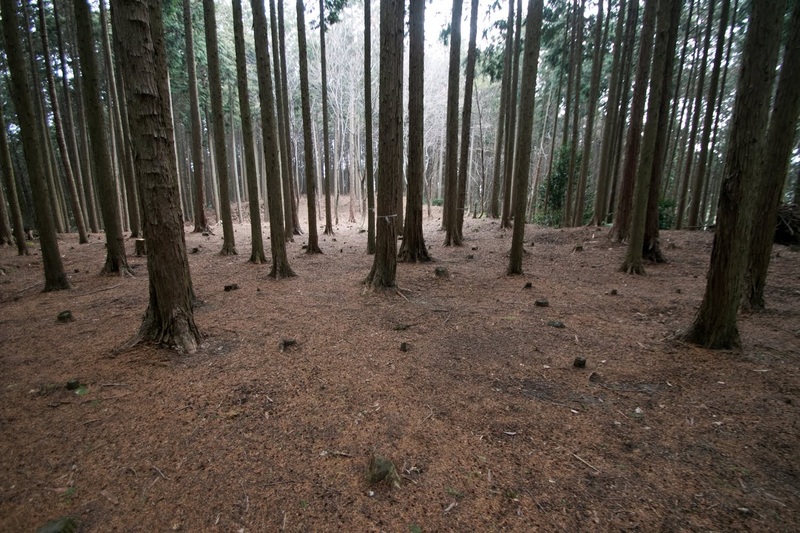 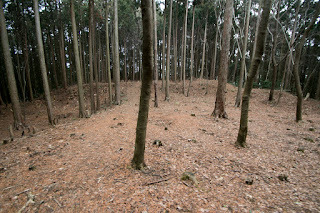 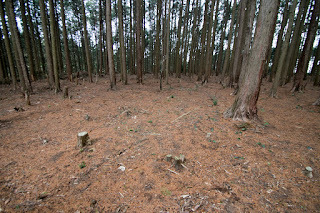 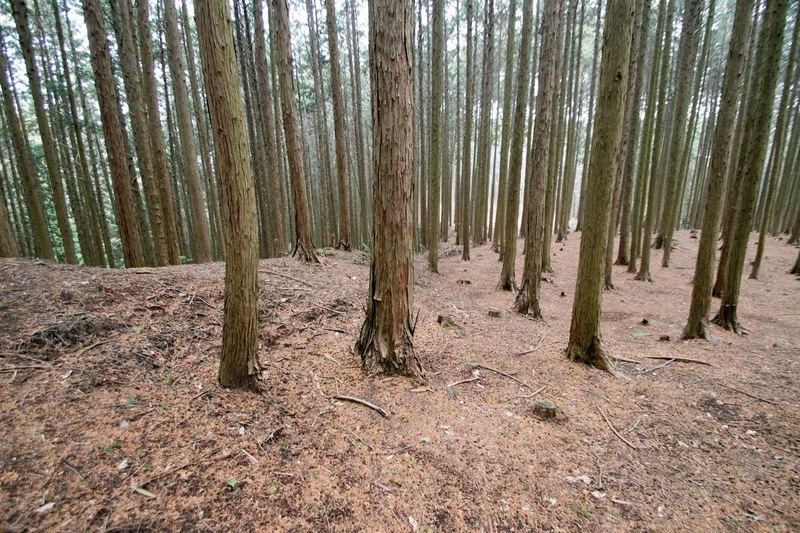 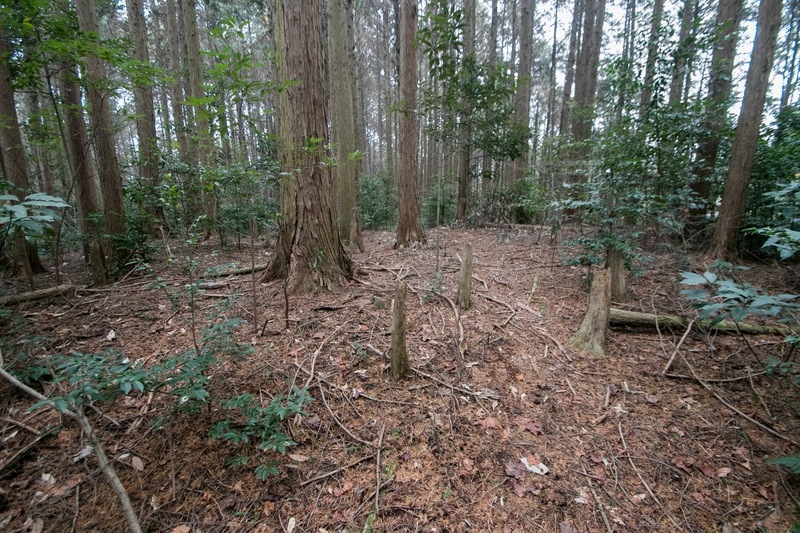 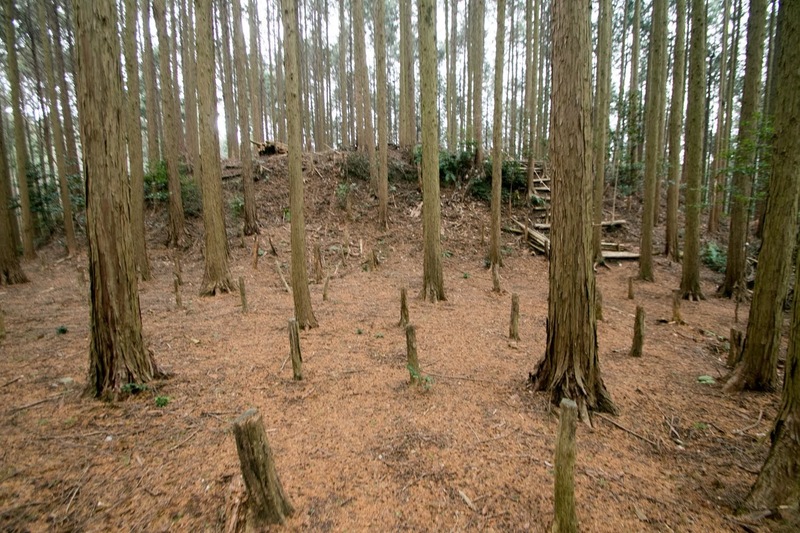 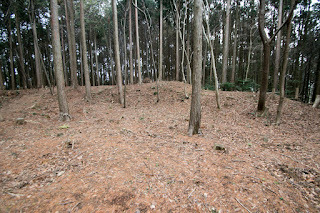 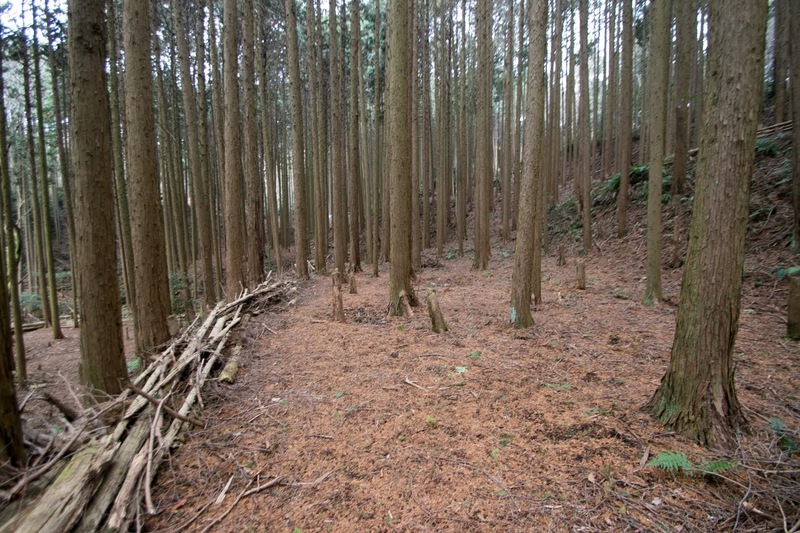 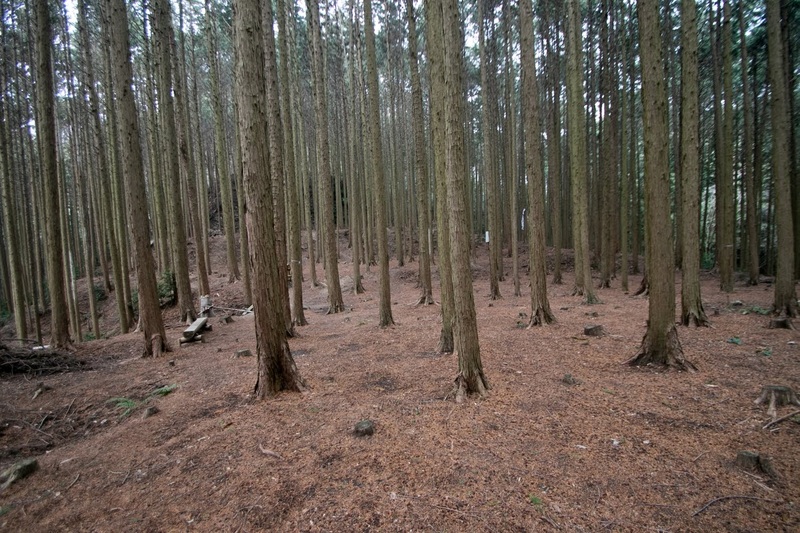 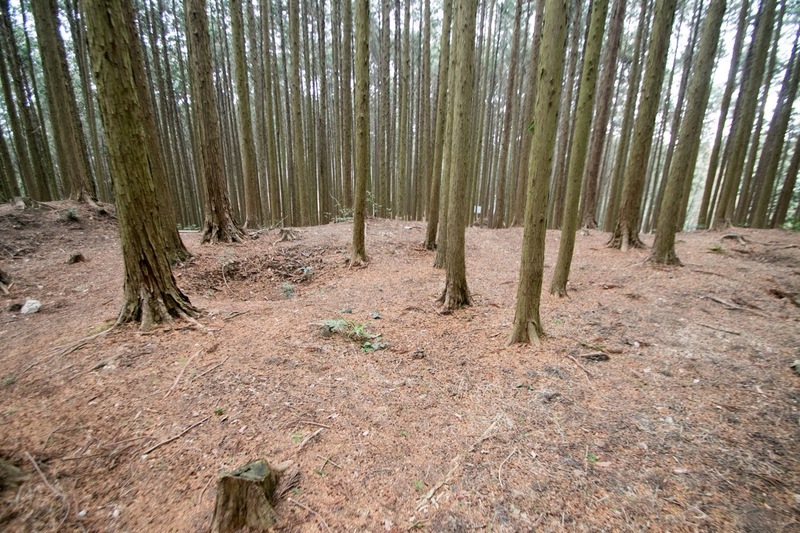 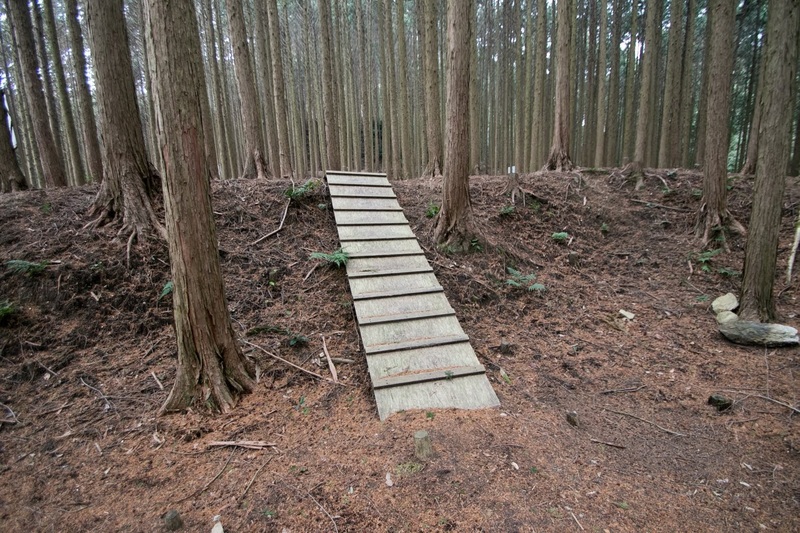 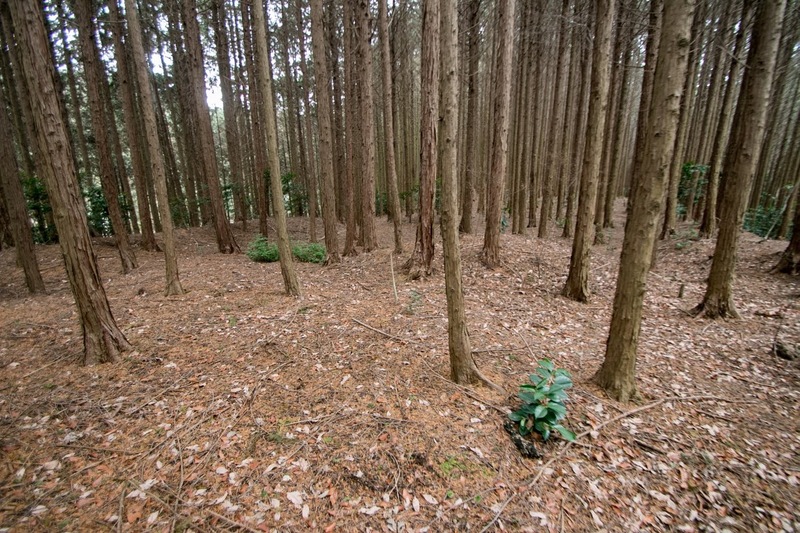 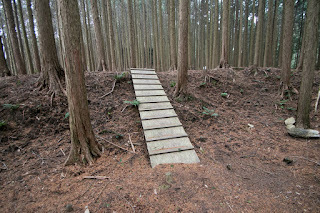 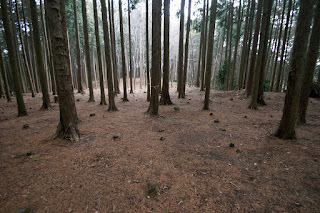 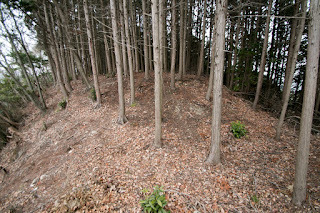 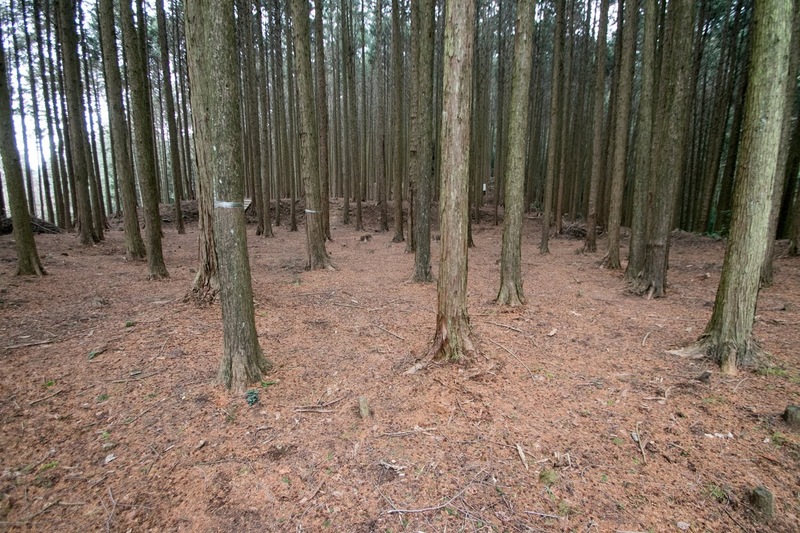 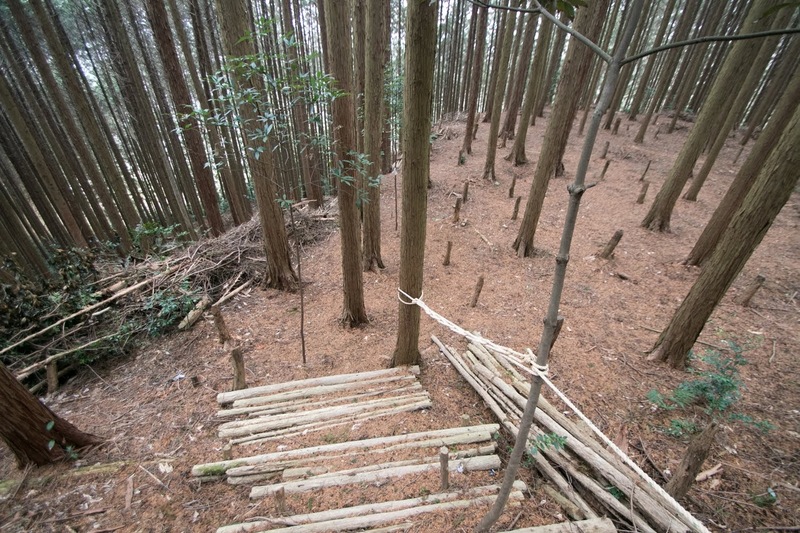 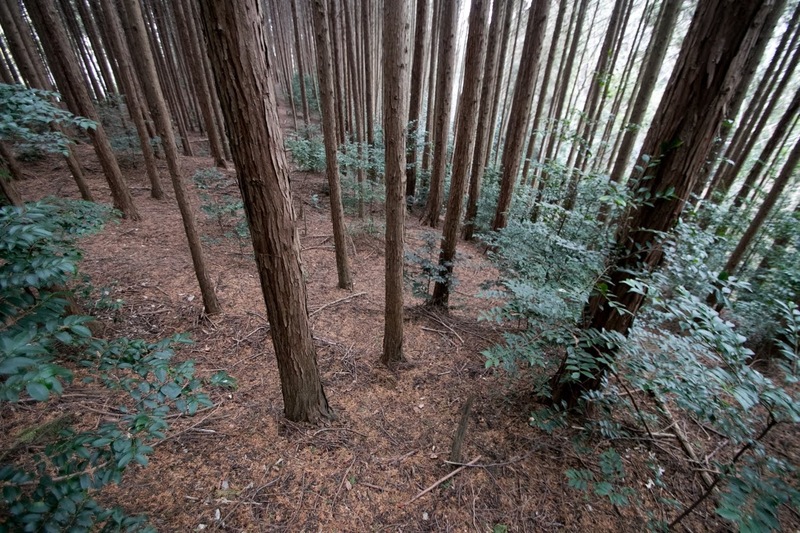 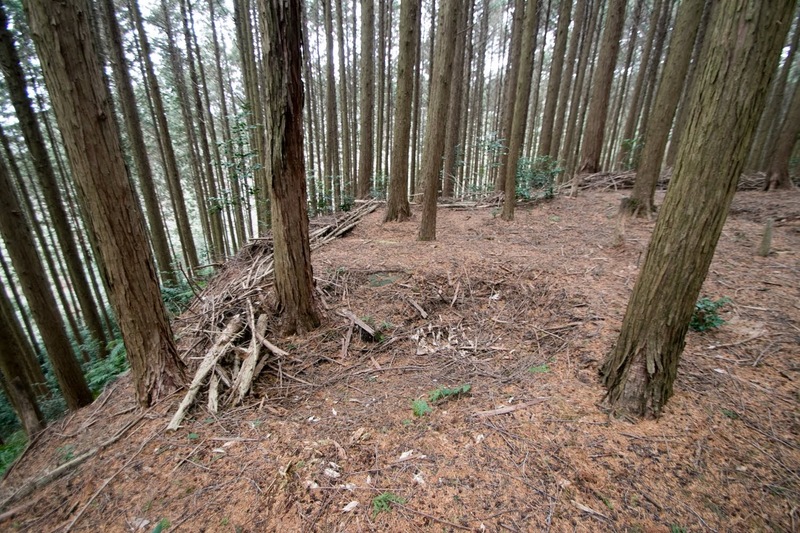 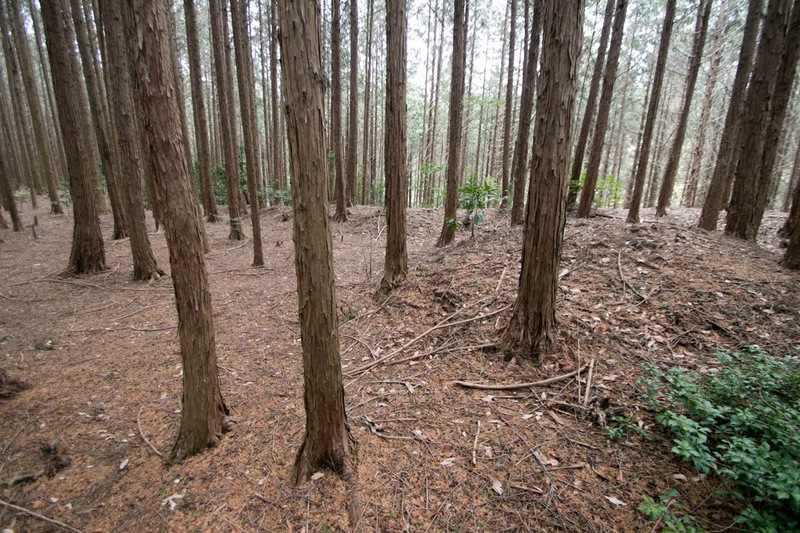 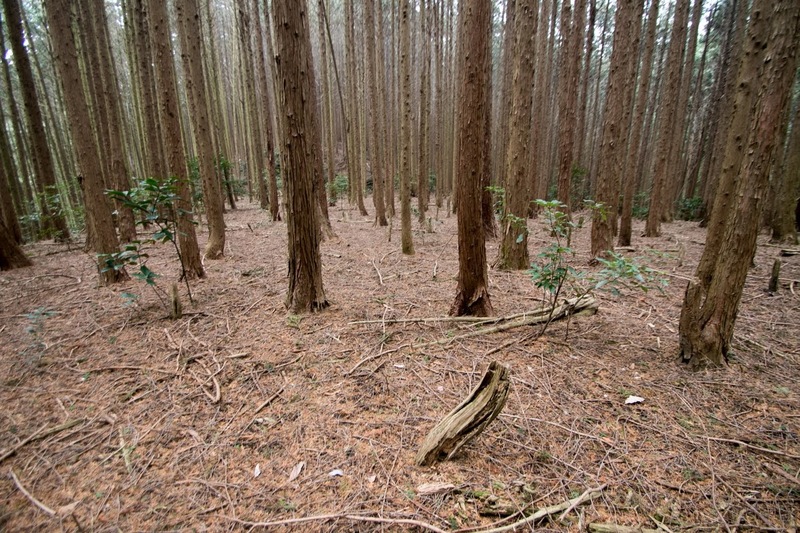 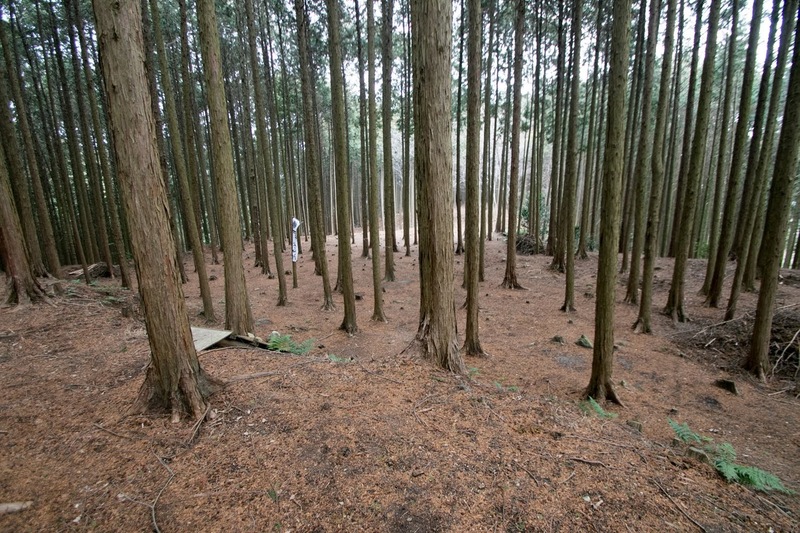 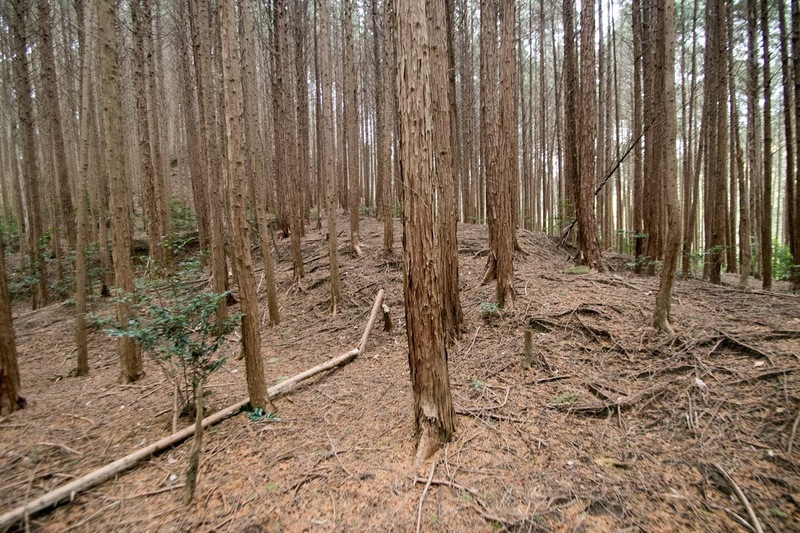 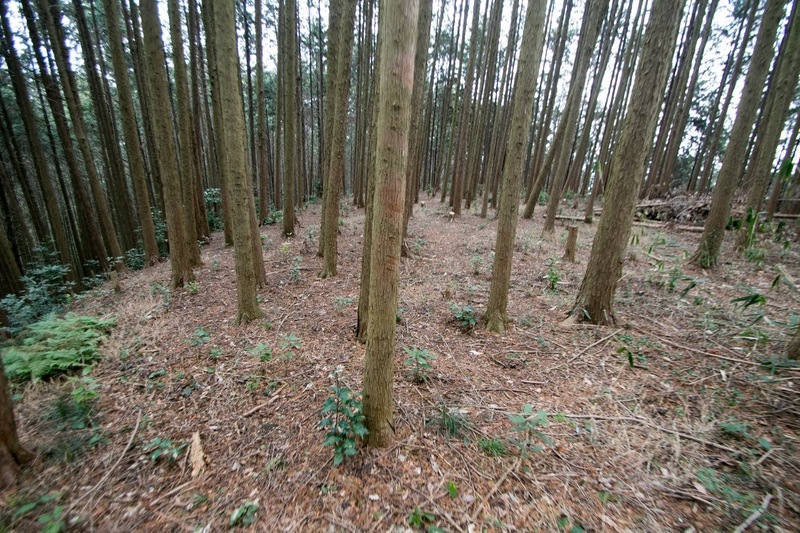 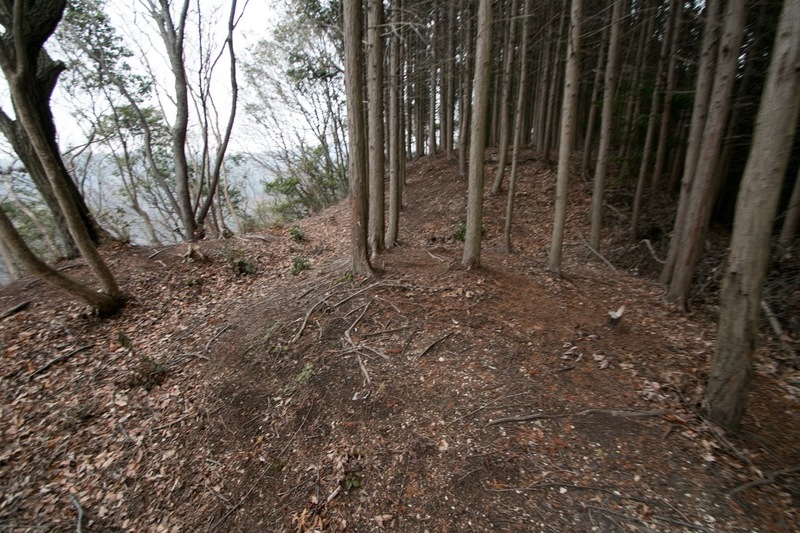 In medieval area, there had been no central authority in Yamato country (Nara prefetrue). 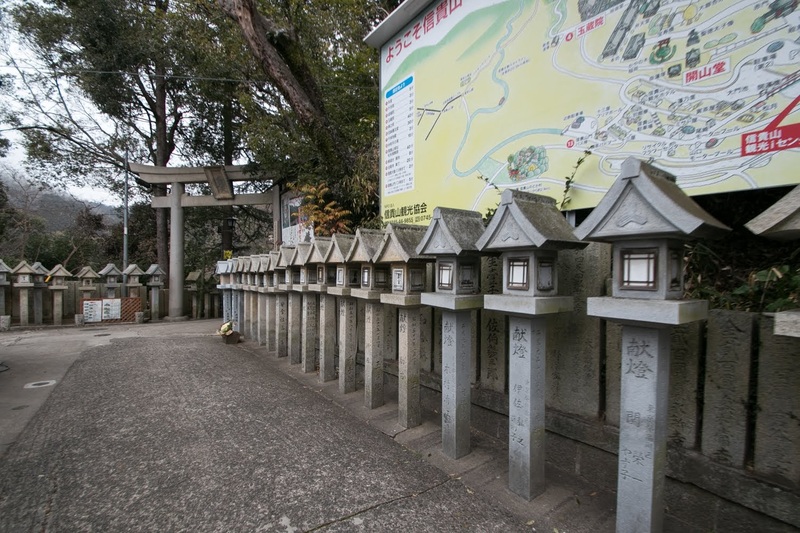 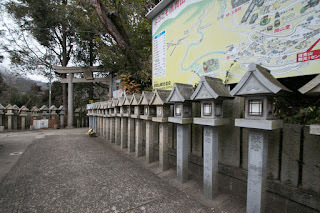 North part of Nara basin is held by large traditional temples and temples built at Nara era (8th century) such as Kofukuji, and southern half of the basin and surrounding hilly area were kept by large local lords such as Tsutsui clan, Akiyama clan or Ochi clan. 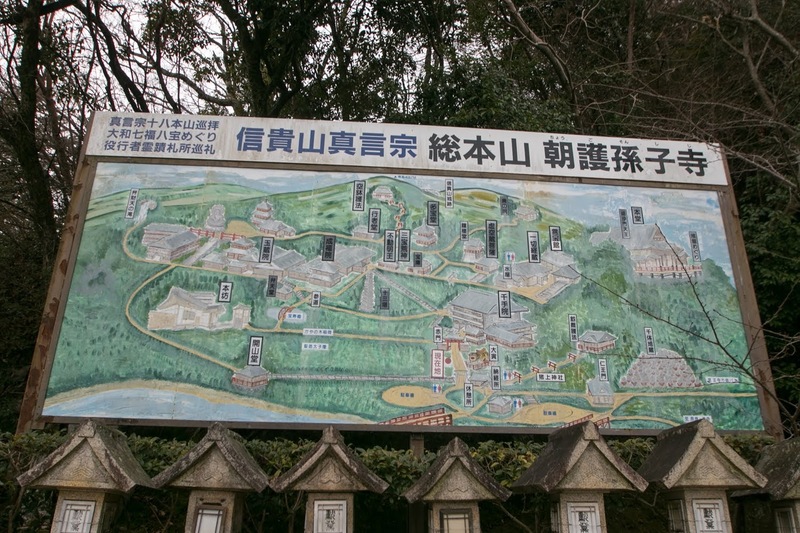 But Yamato country is located between Kyoto city, the political center and Osaka city or Sakai city, the economic center, thus central powers tried to seize Yamato country.and sent their generals to Yamato country. 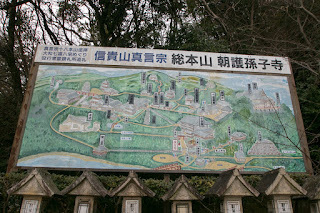 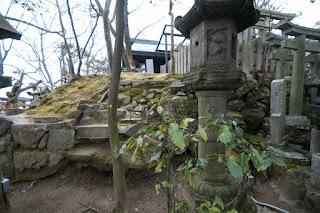 Shigisan castle was originally built by Nagamasa Kizawa (1493-1542), a talented general of this area in 1536. 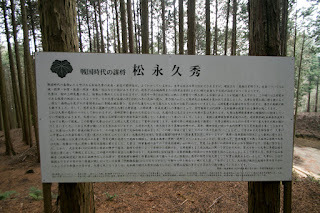 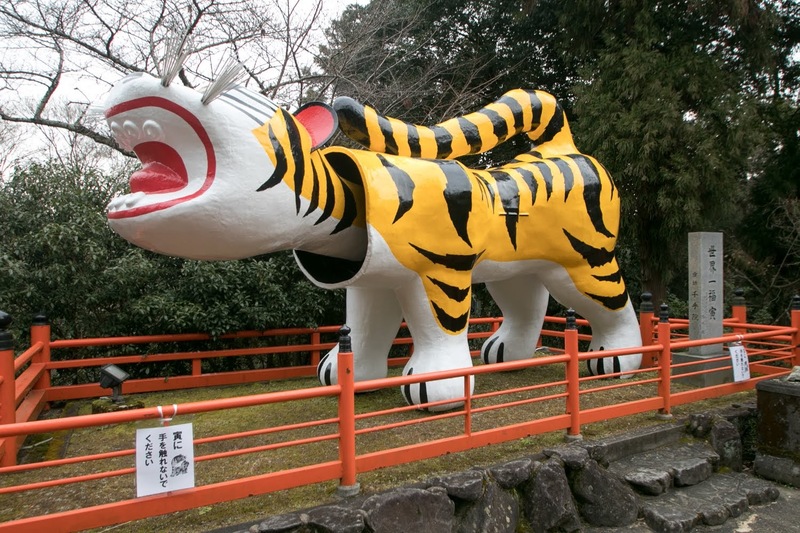 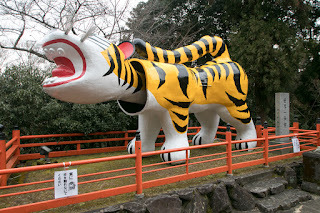 Nagamasa was originally a retainer of Hatakeyama clan, a vassal of Hosokawa clan which virtually established their own government under the puppet Shogun at the beginning of 16th century. Using trick Nagamasa virtually seized Hatakeyama clan, and aimed at expansion into Yamato country utilizing Shigisan castle. But Nagamasa failed to make up his own government and was opposed by Hosokawa clan and Hatakeyama clan, and at last died in the battle in 1542. 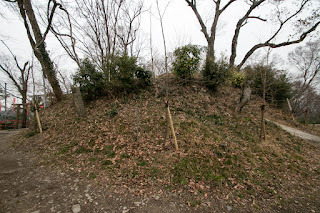 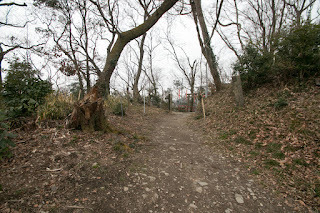 After the death of Nagamasa, Shigisan castle was not used for a while, but in 1559, Hisahide Matsunaga (1510-1577), a general of Nagayoshi Miyoshi (1522-1564), moved from Takiyama Castle (Hyoto prefecture) to Shigisan castle and significantly expanded it as his residence. 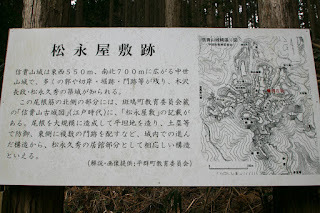 Hisahide Matsunaga was a elder brother of Nagayori Matsunaga (?-1565), who activated at battles under Nagayoshi Miyoshi and promoted to the commander of Yagi castle of Tanba province (western part of Kyoto prefecture) and deputy governor of province. 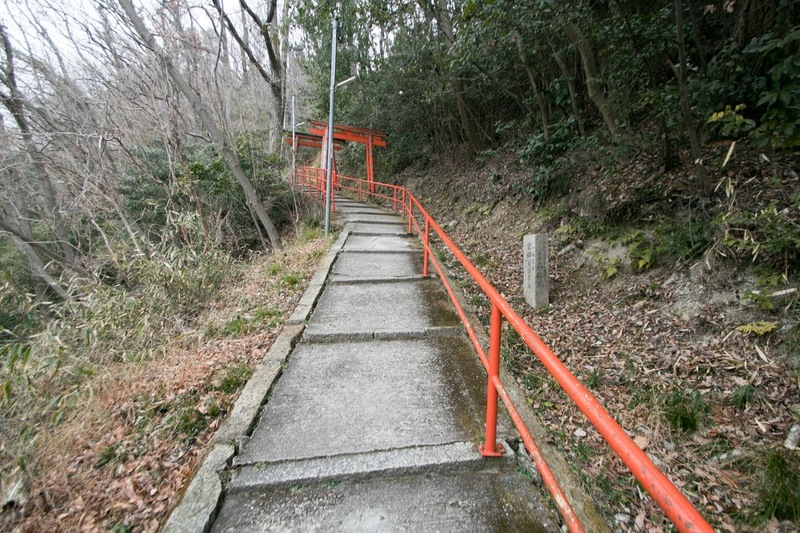 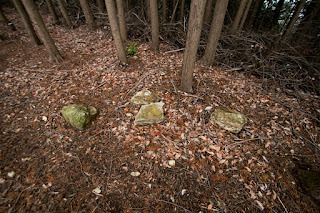 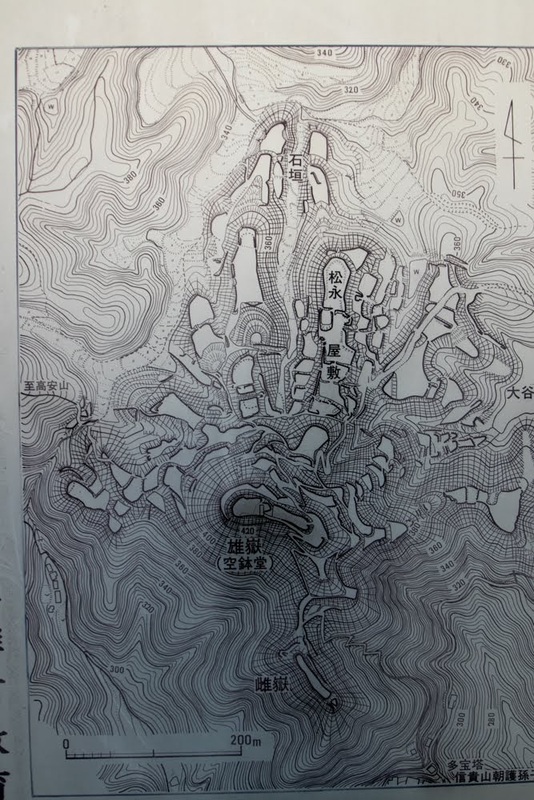 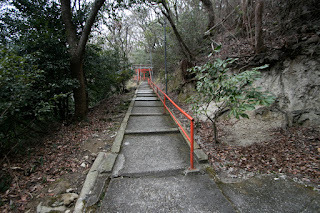 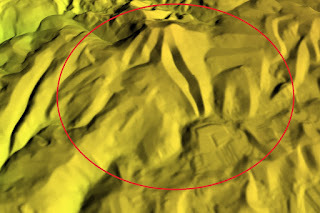 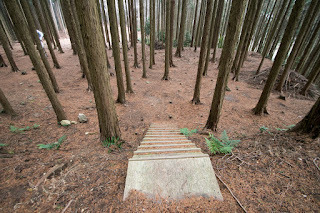 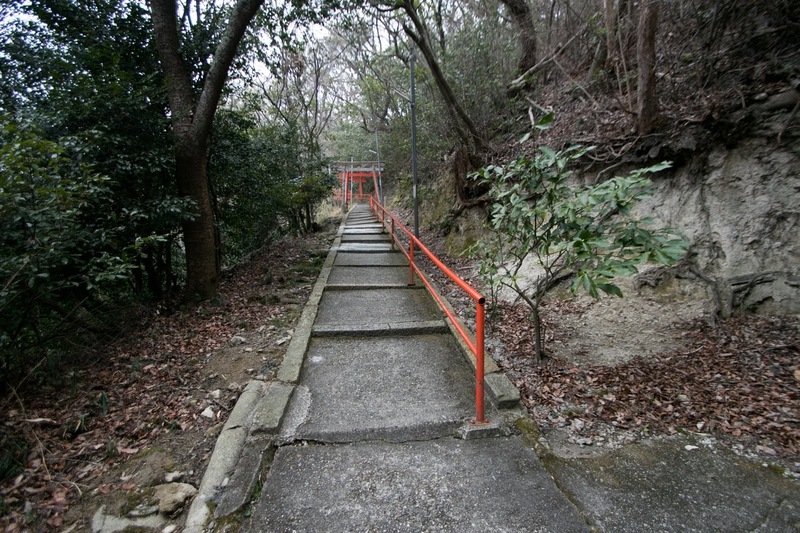 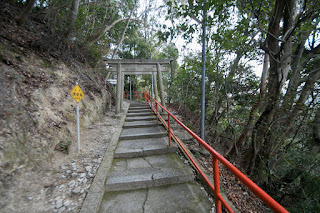 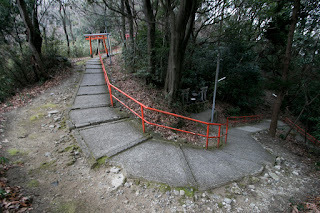 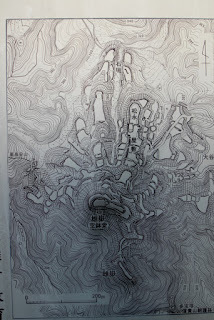 The central area is located at the top of the mountain, and at the edge of central area there still exist a basement of 10 meter square which is thought to be the basement of main tower. 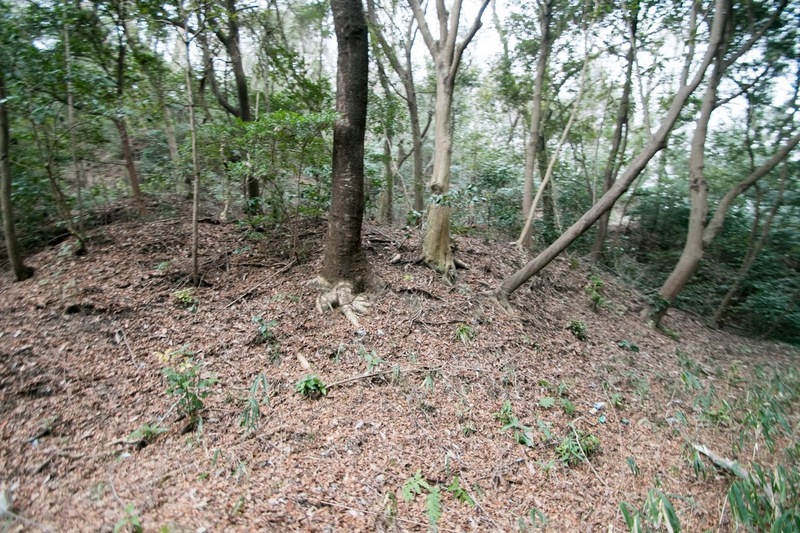 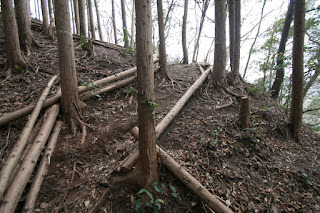 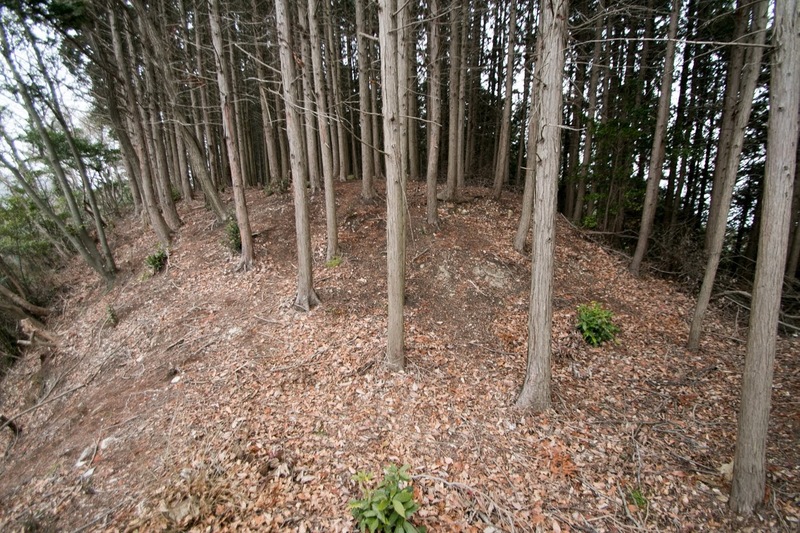 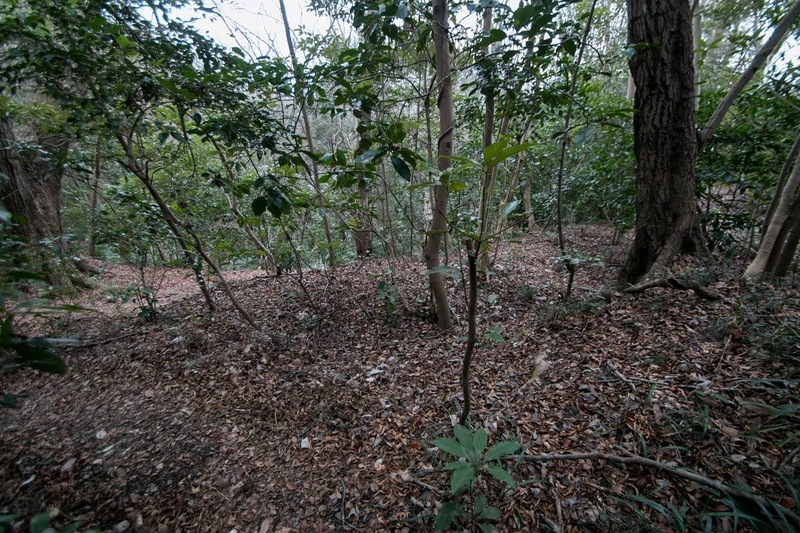 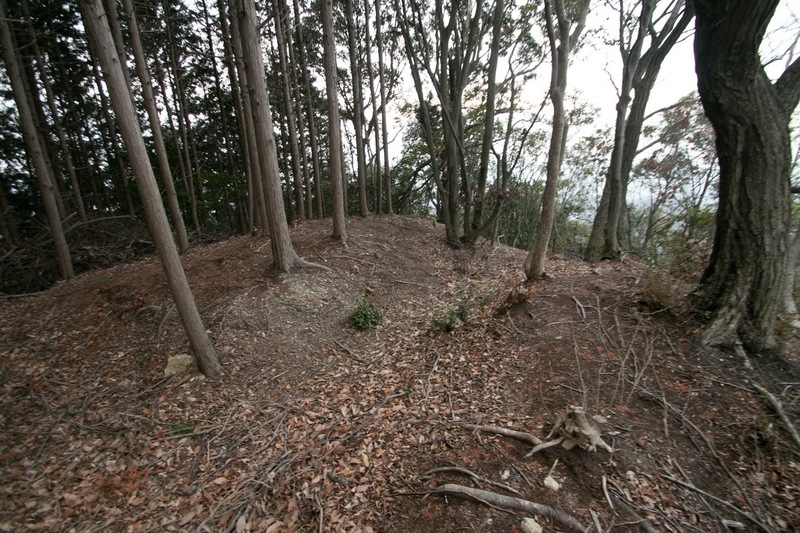 Many terraces were built along the north slope of the mountain, and on the halfway there is a group of large terraces guarded by deep dry moats and tall clay walls called as Matsunaga Yashiki. The total size of the castle reached over 500 meter square, and became one of the largest castle in Yamato province. The origin of Hisahide is unknown, but he served to Nagayoshi from youth. 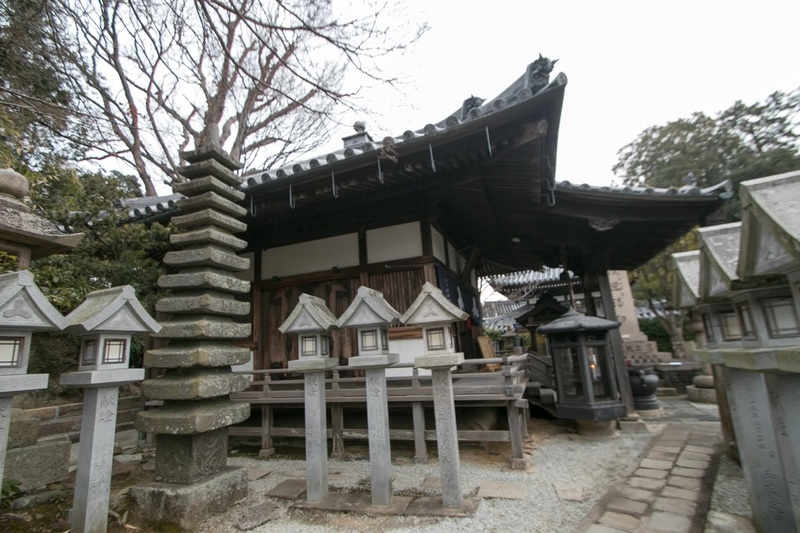 Miyoshi clan was originally a commander of Hosokawa clan, As above Hosokawa clan was one of the highest class retainer of Muromachi shogunate, and established their government virtually under the name of Shogun at the beginning 16th century. But due to continuous internal conflict the authority of Hosokawa clan became weak then Nagayoshi expelled Hosokawa clan and build his own government in 1549. 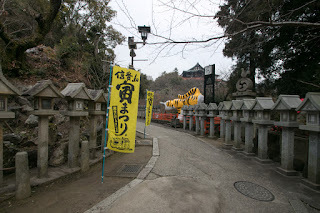 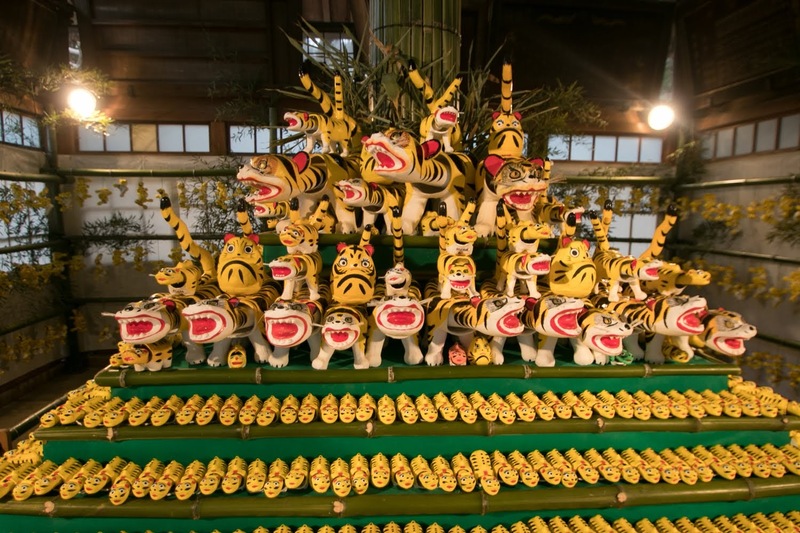 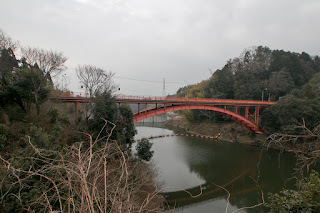 Being supported by his talented brothers such as Jikkyu Miyoshi (1527-1562), Fuyuyasu Atagi (1528-1564) and Kazumasa Sogo (1532-1561), authority of Miyoshi clan centered on Akutagawasan castle (Osaka prefecture) and Iimori castle (Osaka prefecture) seemed stable. 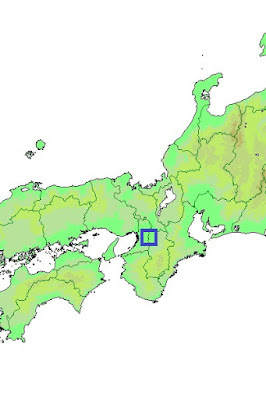 Under Nagayoshi, Hisahide fought all around Kinki area and promoted to the vassal of Miyoshi clan. 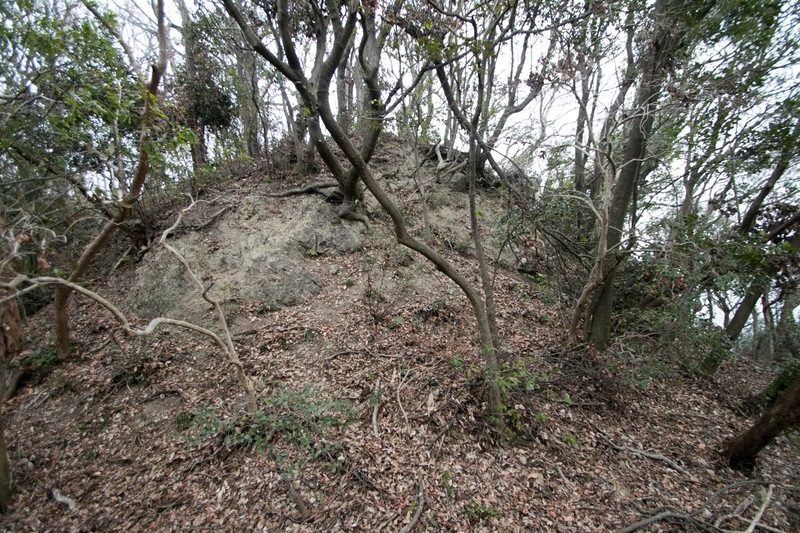 Hisahide entered Yamato province and made pressure to local lord such as Toichi clan or Tsutsui clan from Shigisan castle and Tamonyama castle (Nara prefecture), which was built at north edge of current Nara city. But these brothers supported Nagayoshi died in short time, and replacing Hisahide further gained his power in Miyoshi clan. 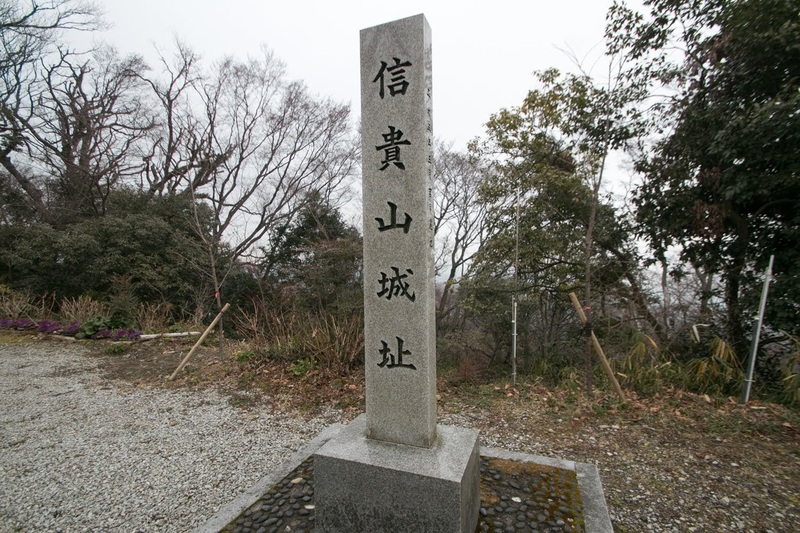 Finally Nagayoshi died in ill only at 42 years, then Hisahide seized real power of Miyoshi clan and operated the clan cooperating with three relatives of Miyoshi clan, named as “Miyoshi Sanninshu”. 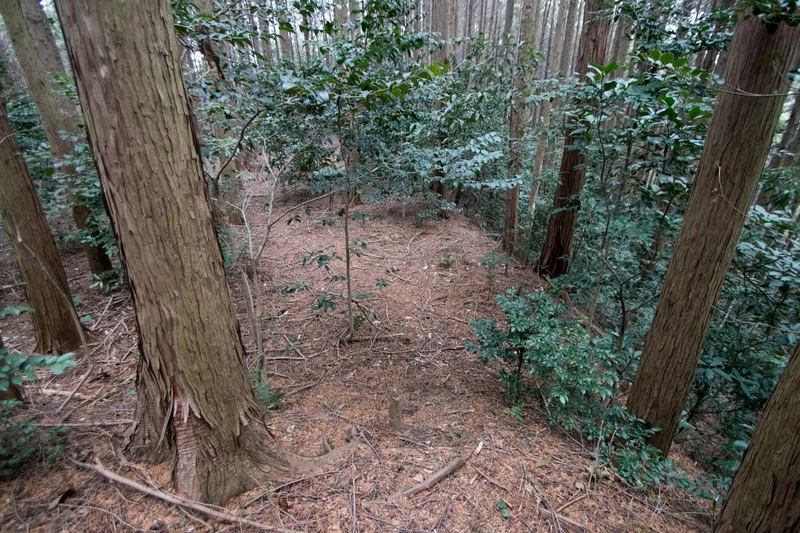 It is said that Hisahide made a slander of Fuyuyasu to Nagayoshi and let him to kill Fuyuyasu, and finally poisoned Nagayoshi. After the death of Nagayoshi, Hisahide and Miyoshi Sanninshu managed the government. 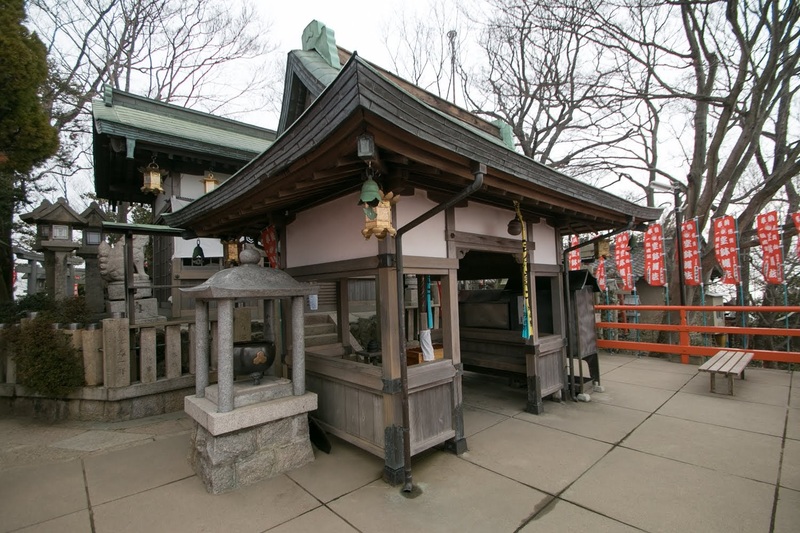 Utilizing the death of Nagayoshi, Yoshiteru Ashikaga (1536-1565), the 13th Shogun of Ashikaga Shogunate placed by Nagayoshi, aimed to leave the influence of Miyoshi clan and establish his own power. 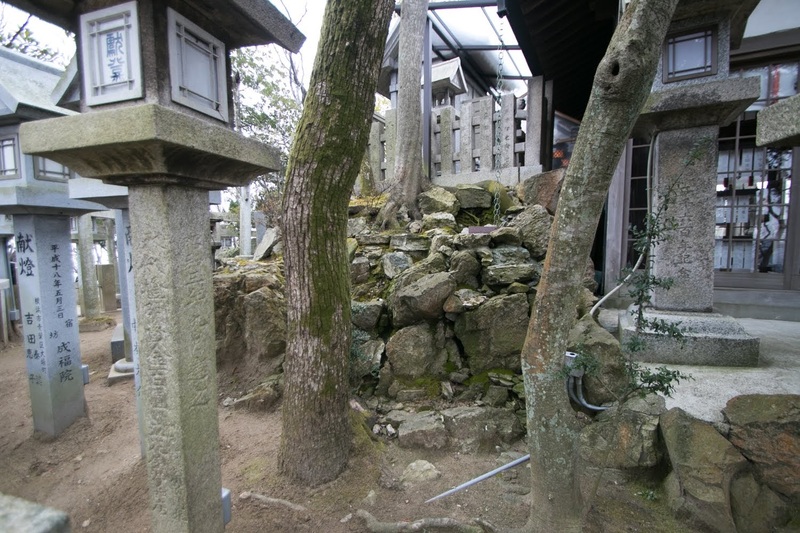 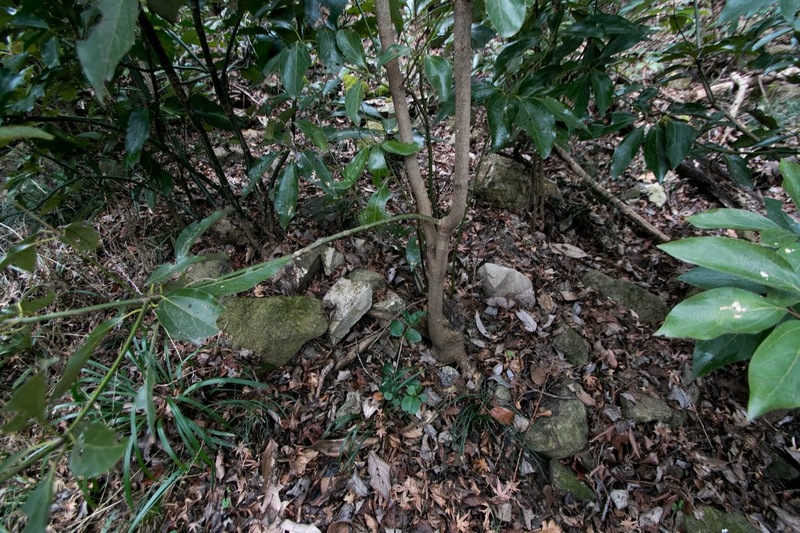 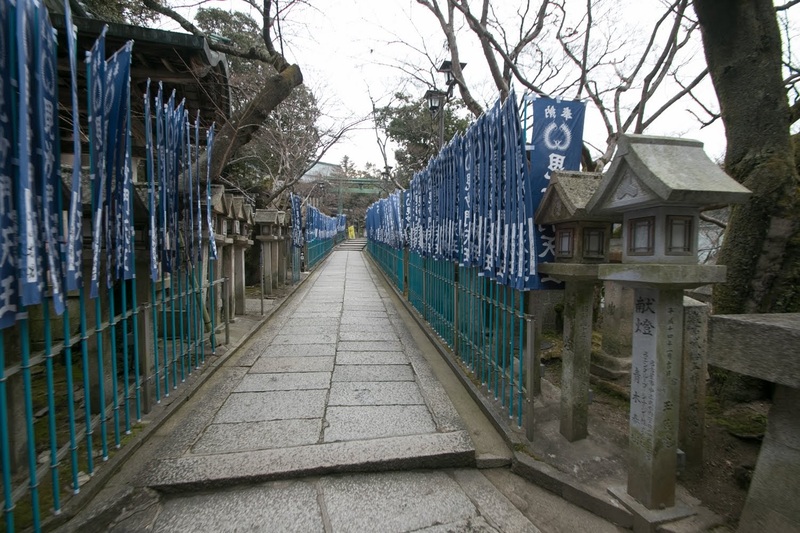 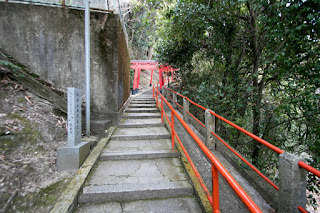 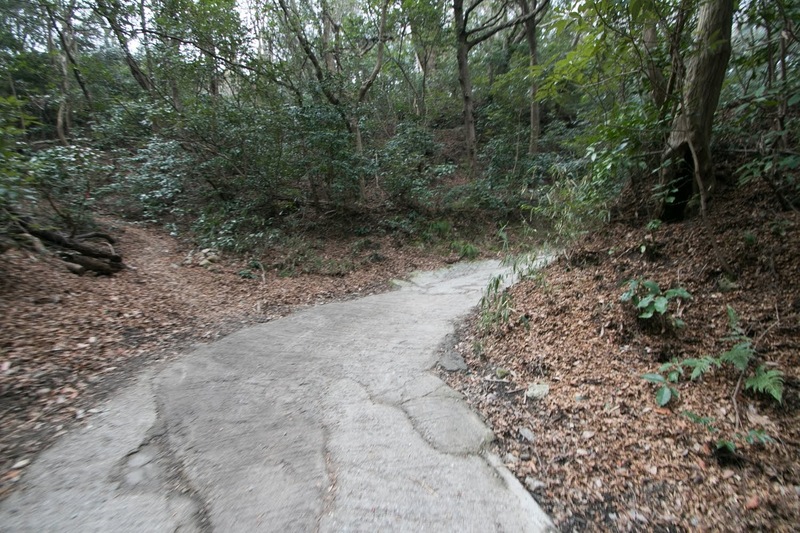 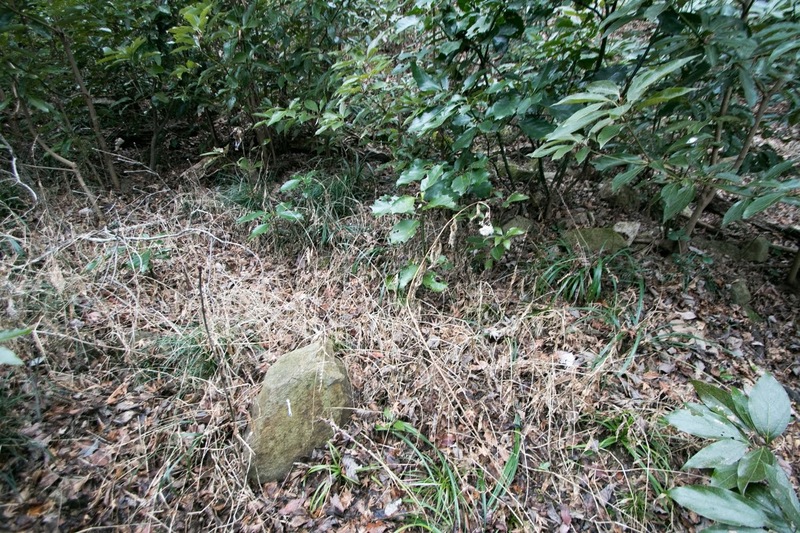 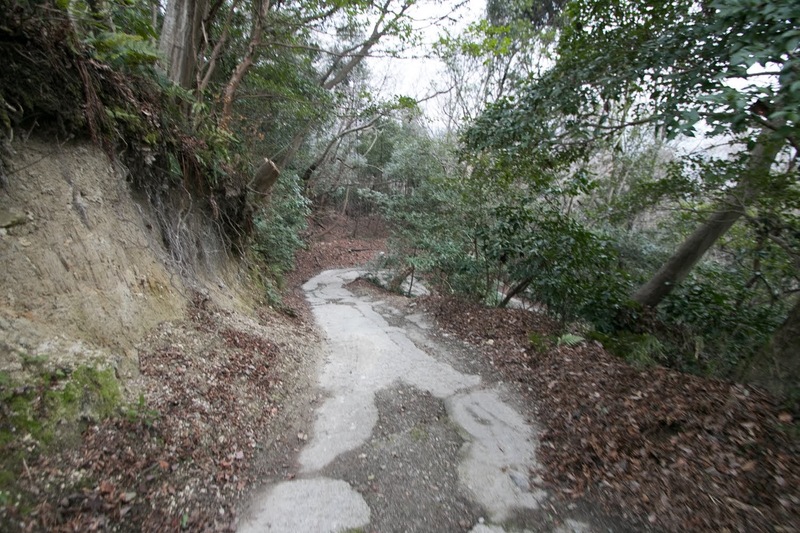 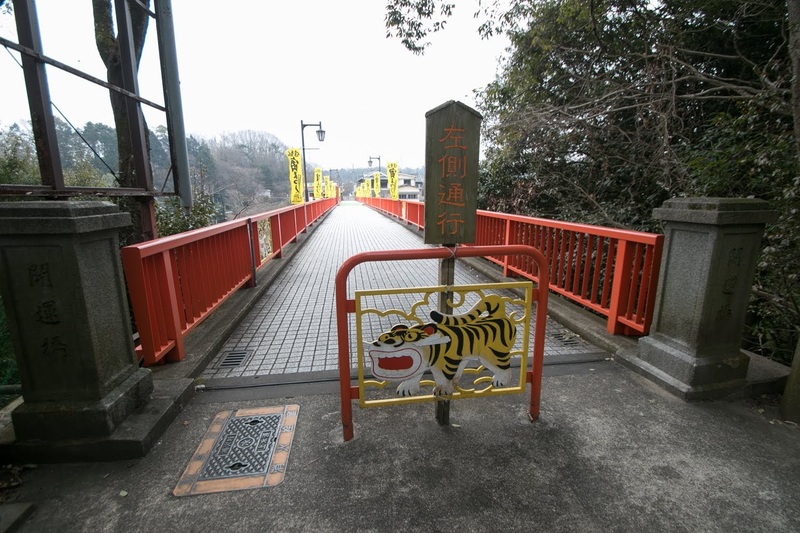 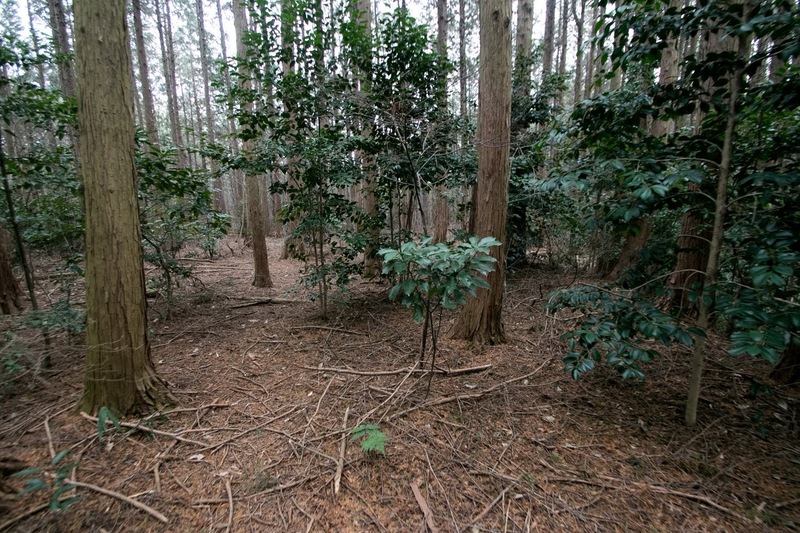 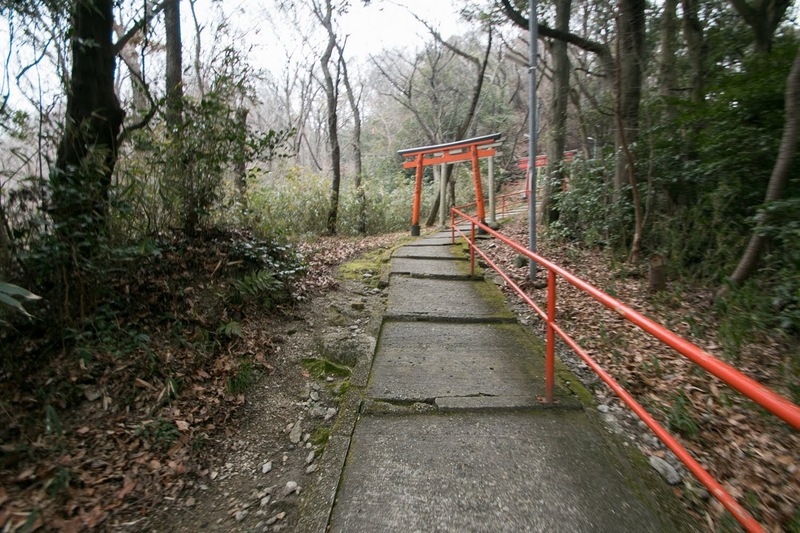 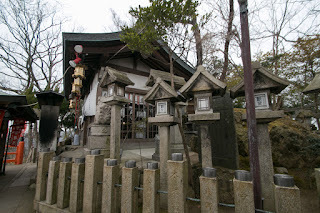 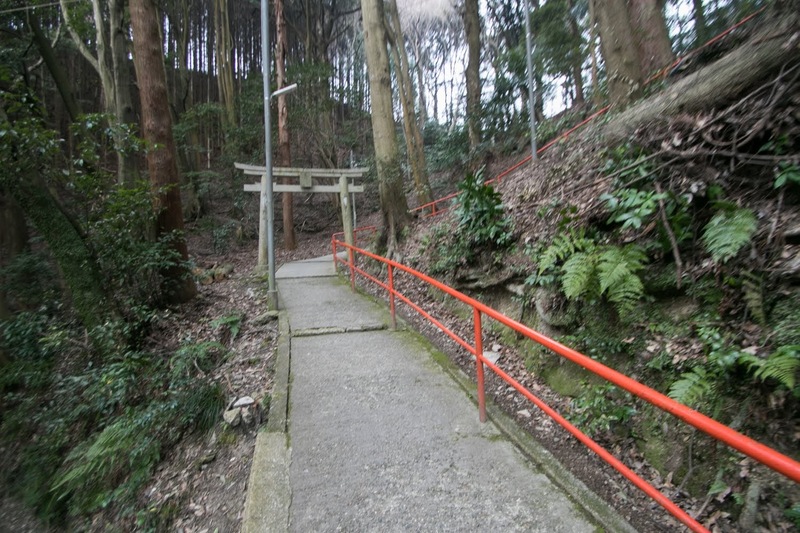 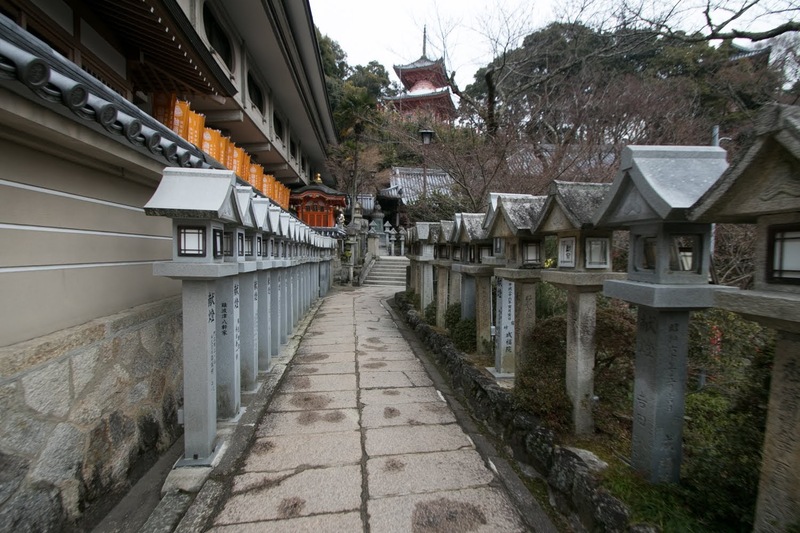 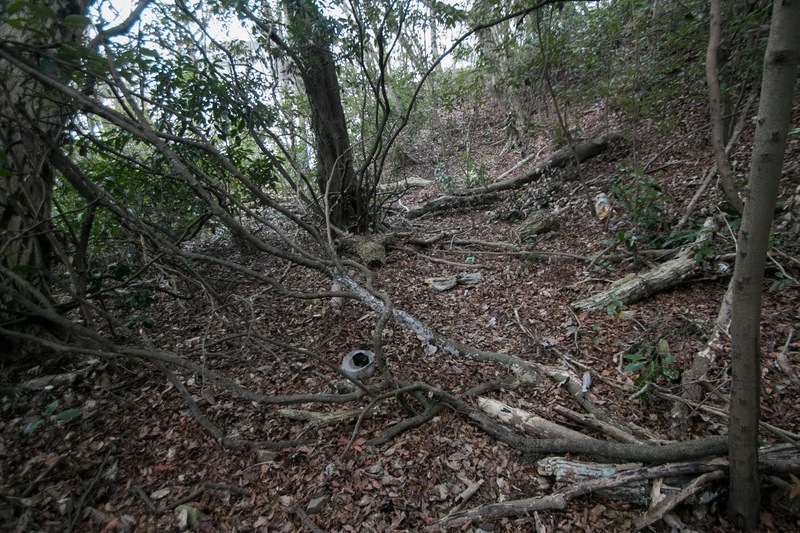 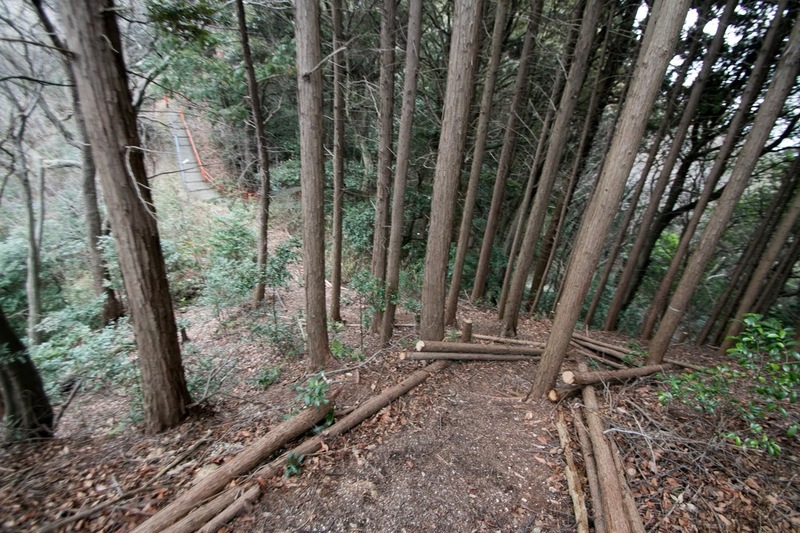 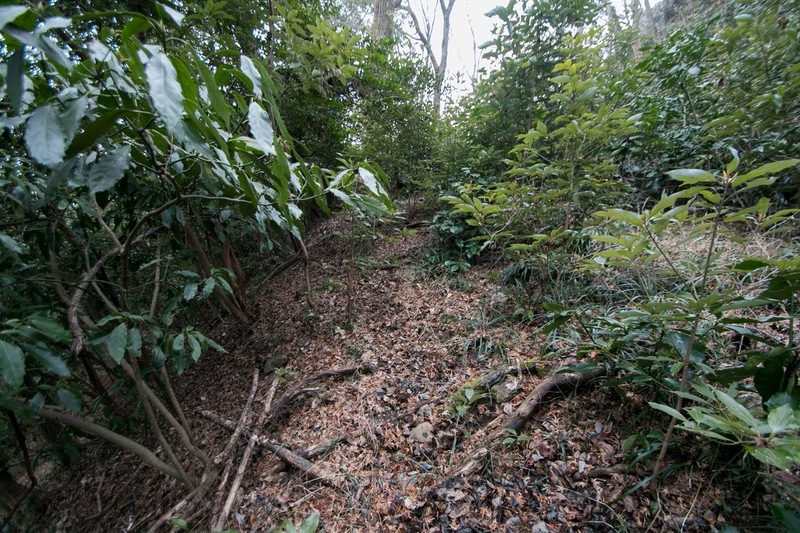 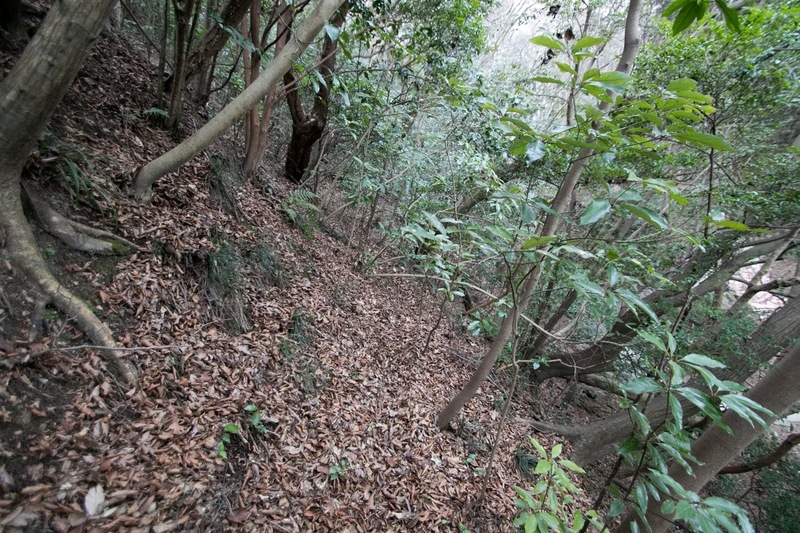 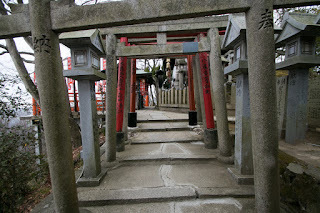 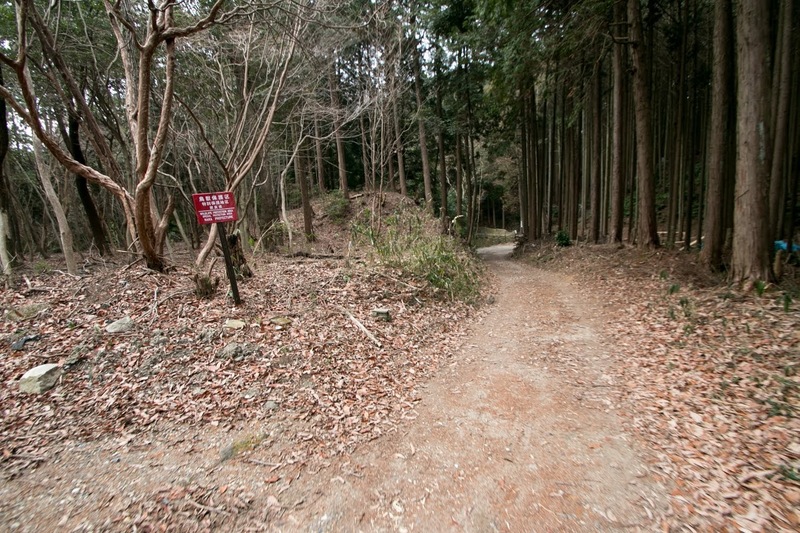 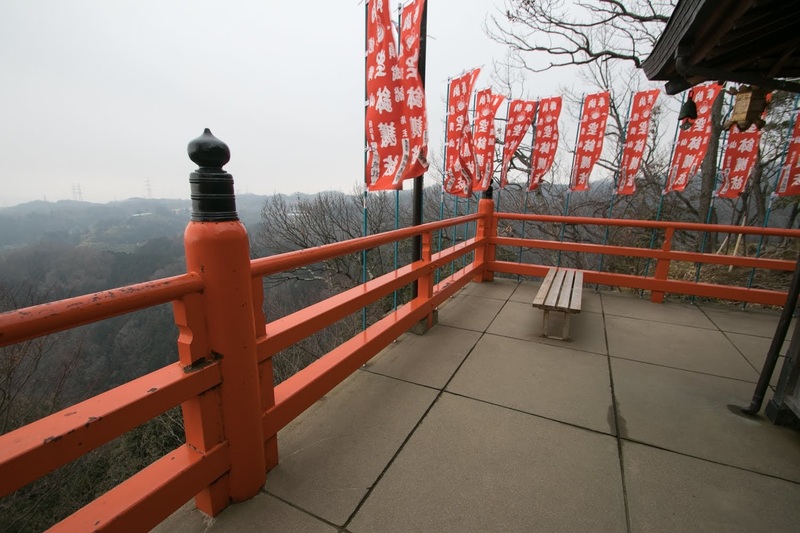 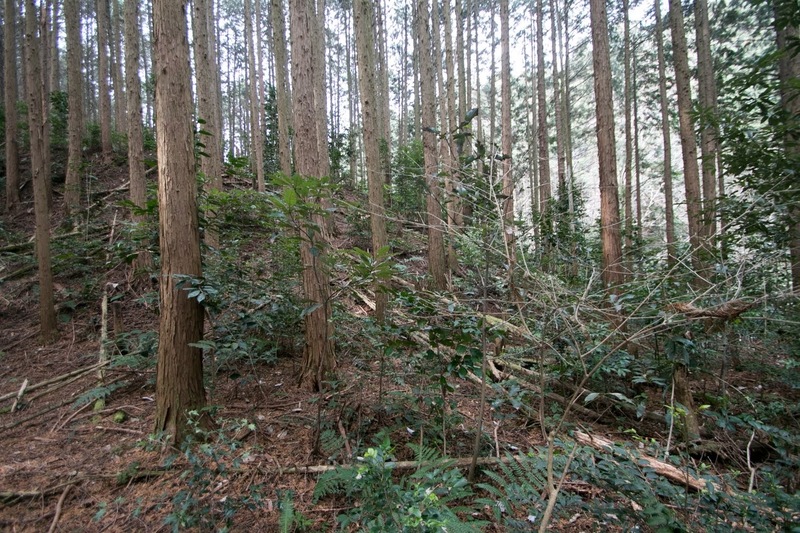 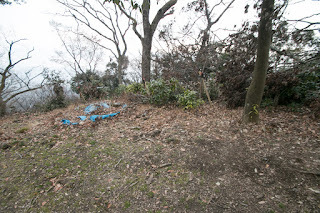 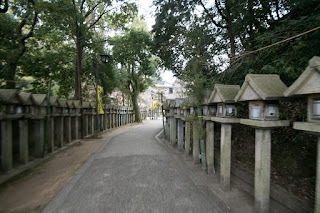 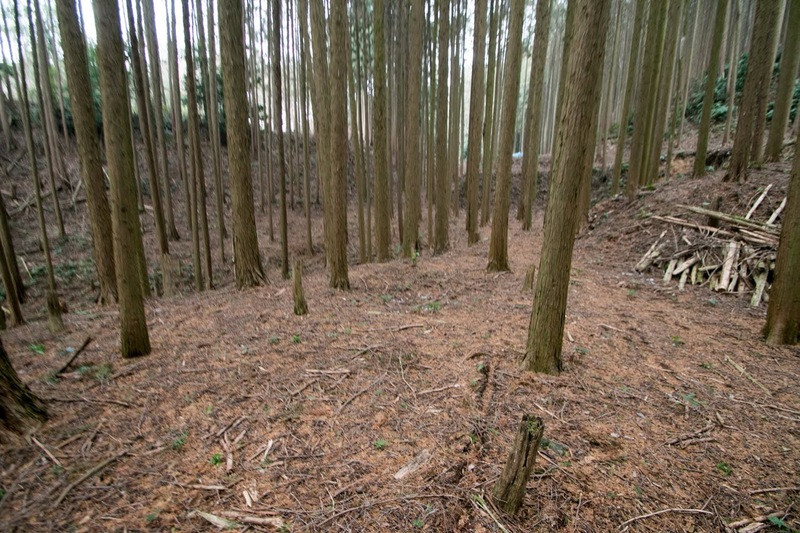 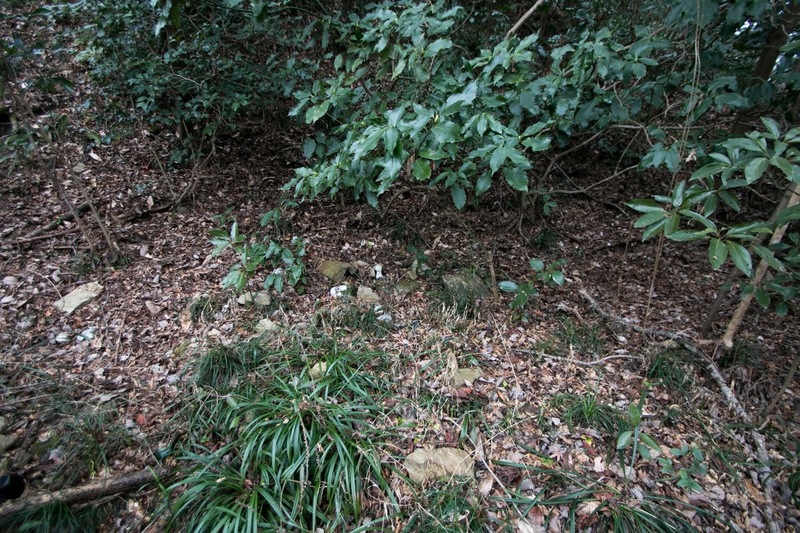 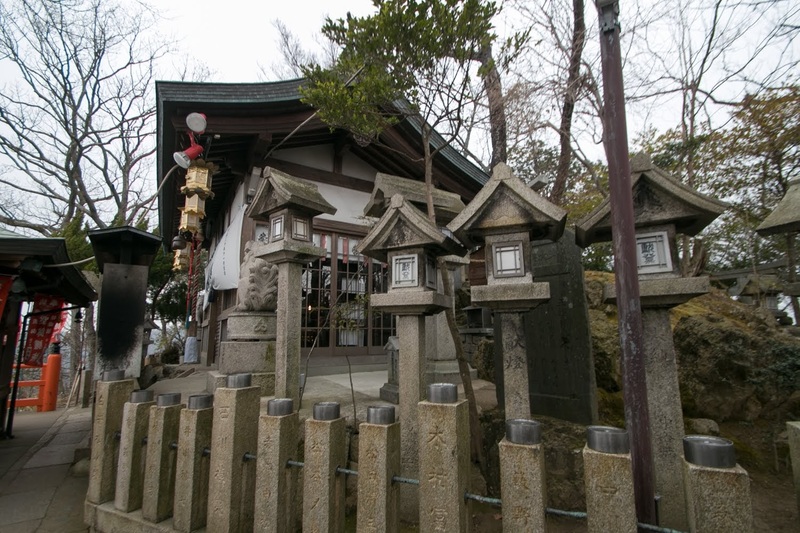 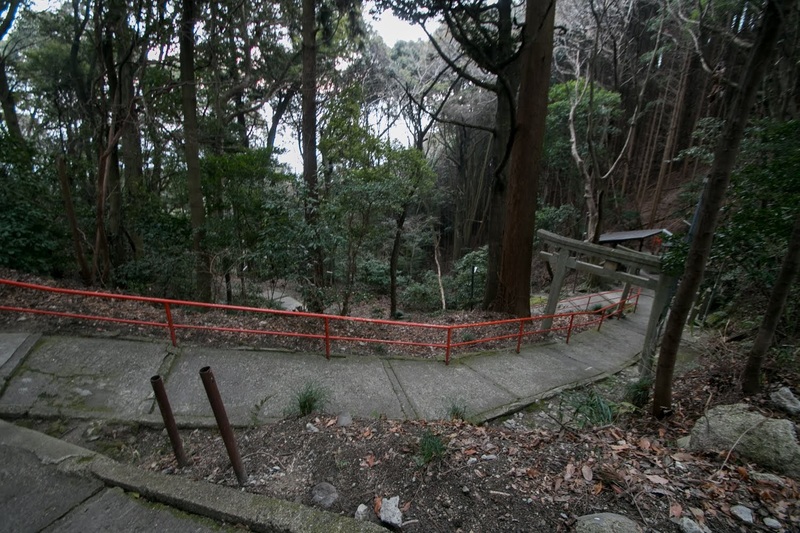 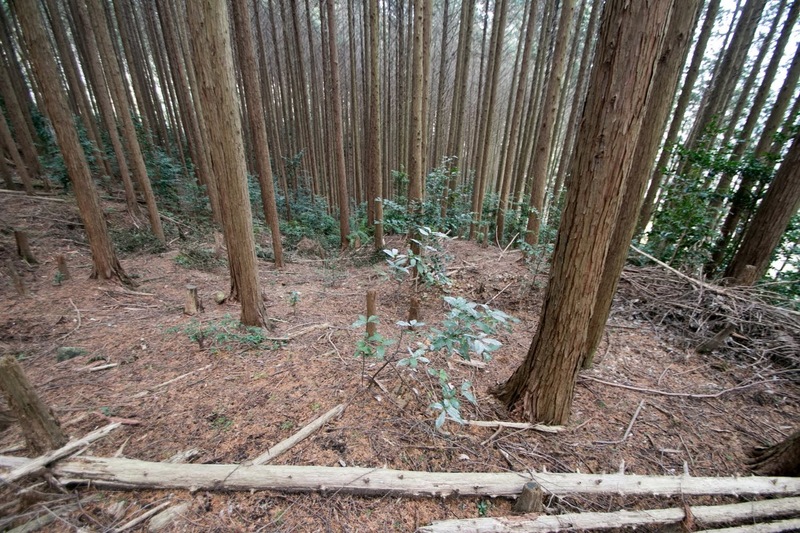 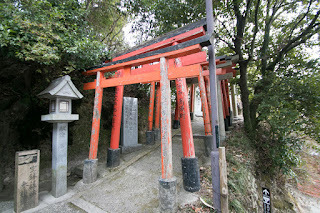 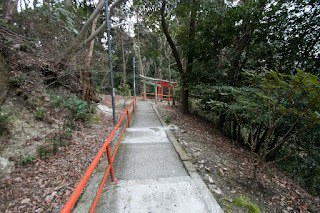 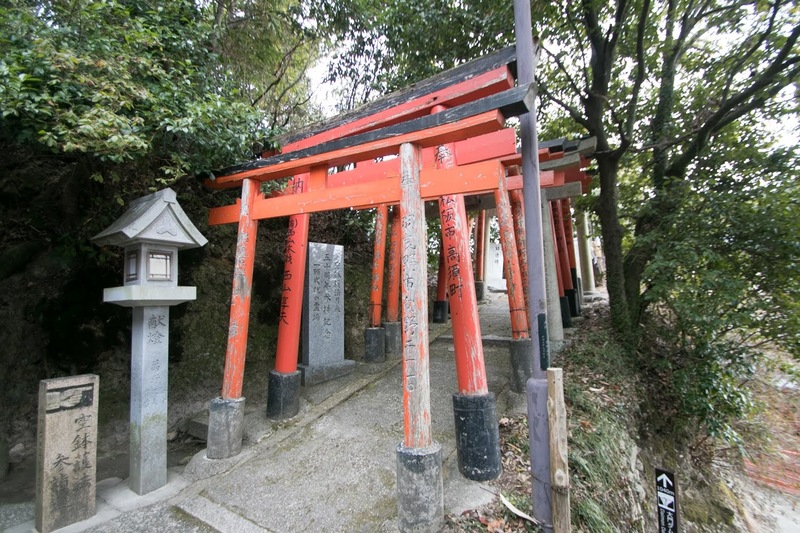 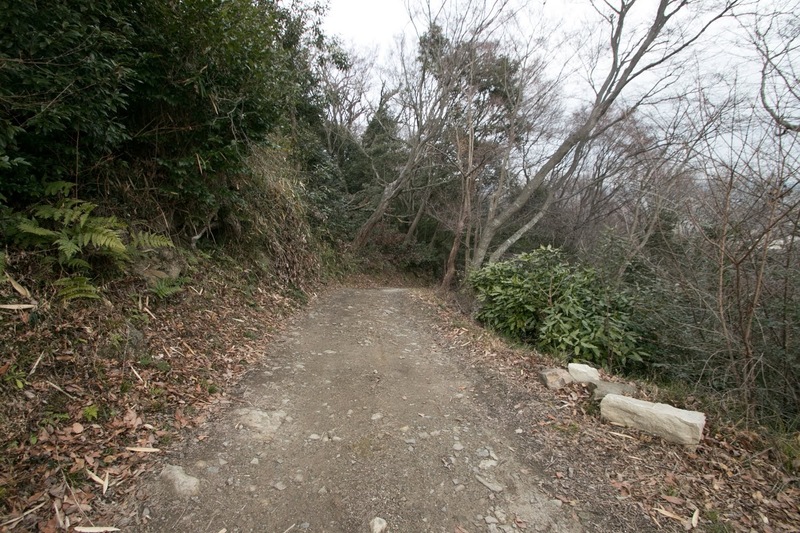 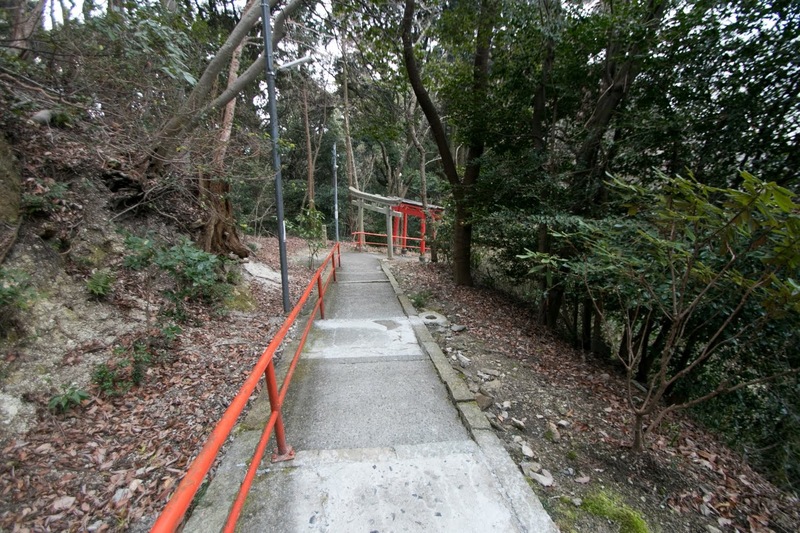 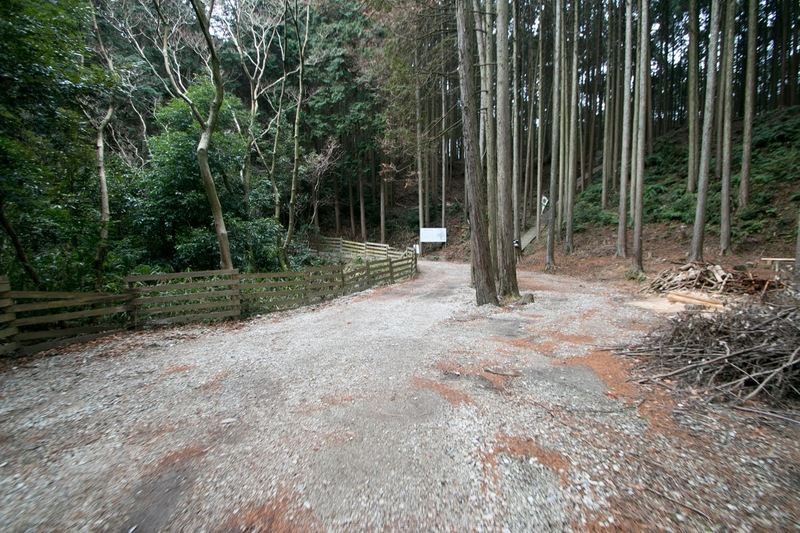 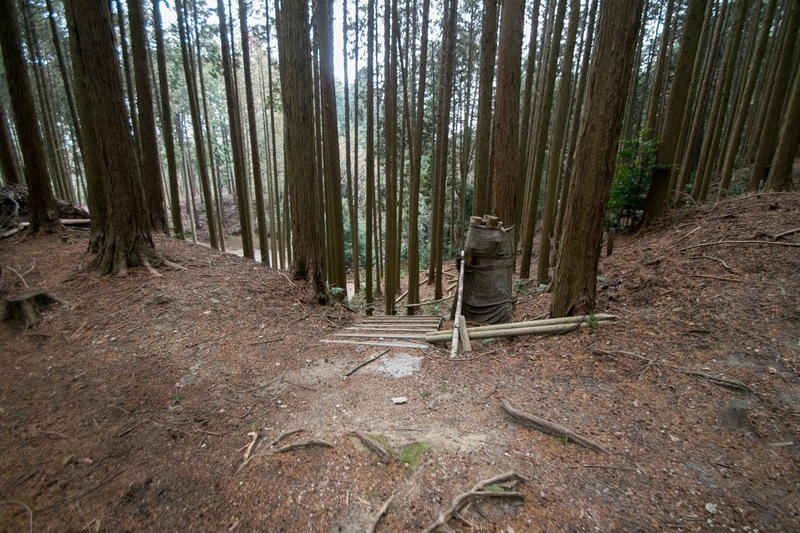 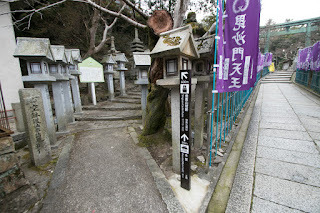 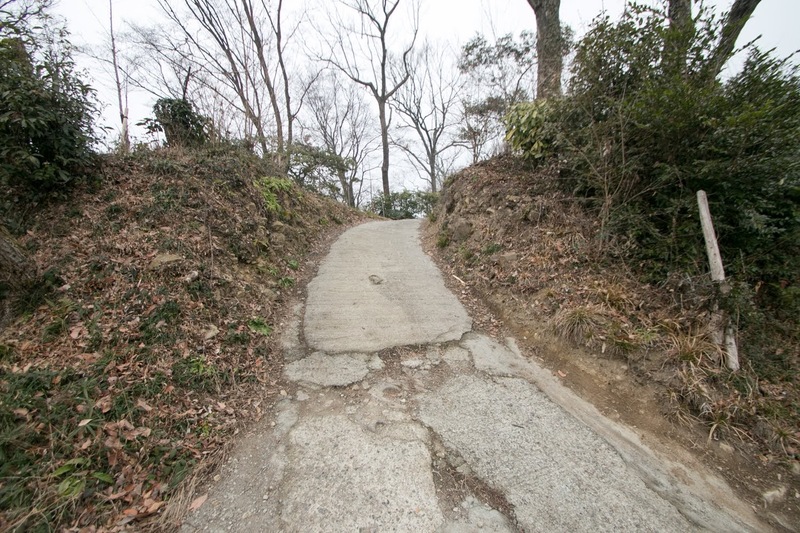 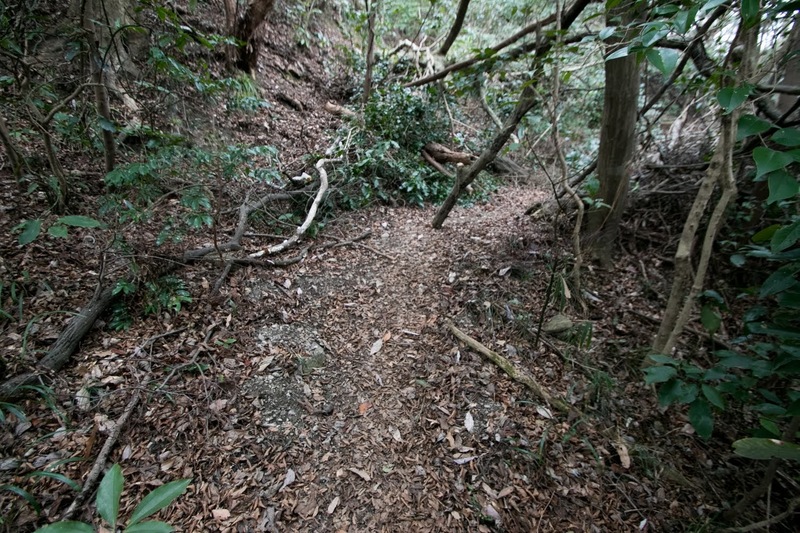 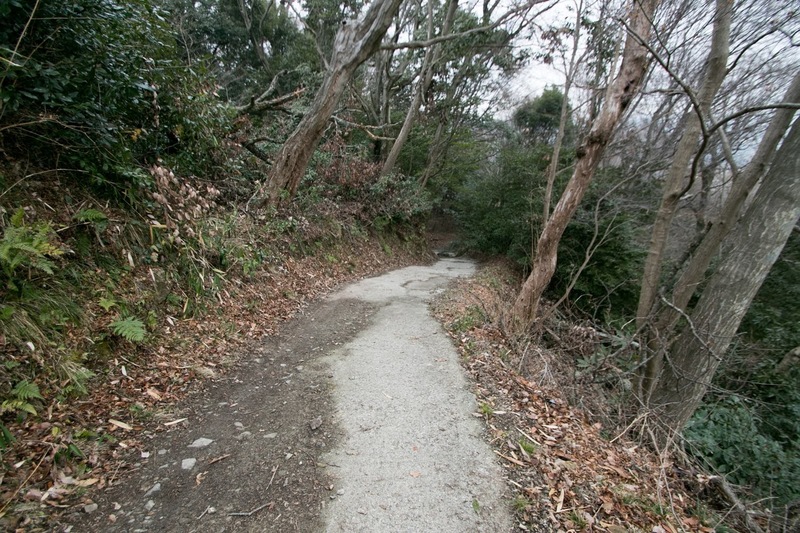 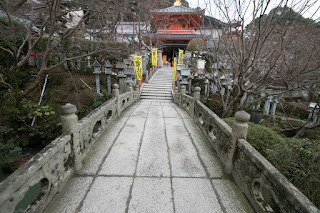 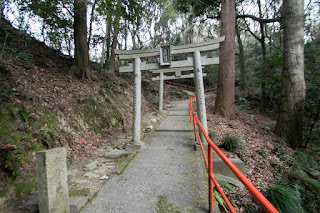 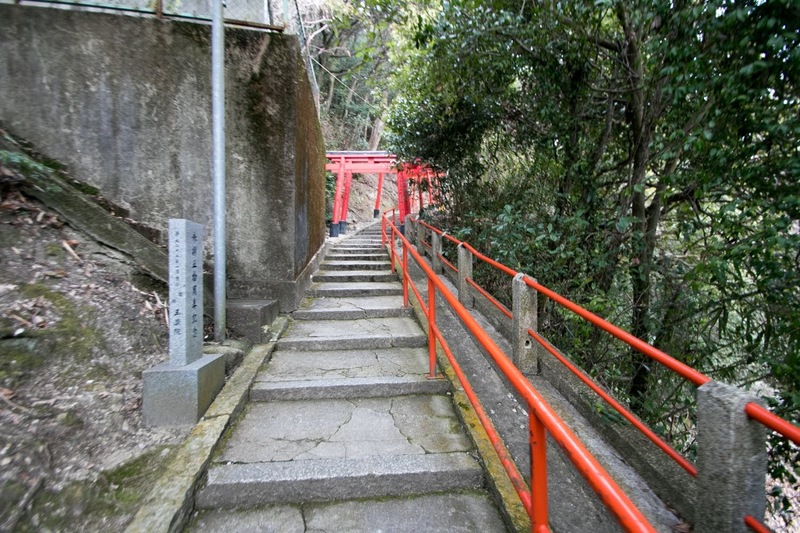 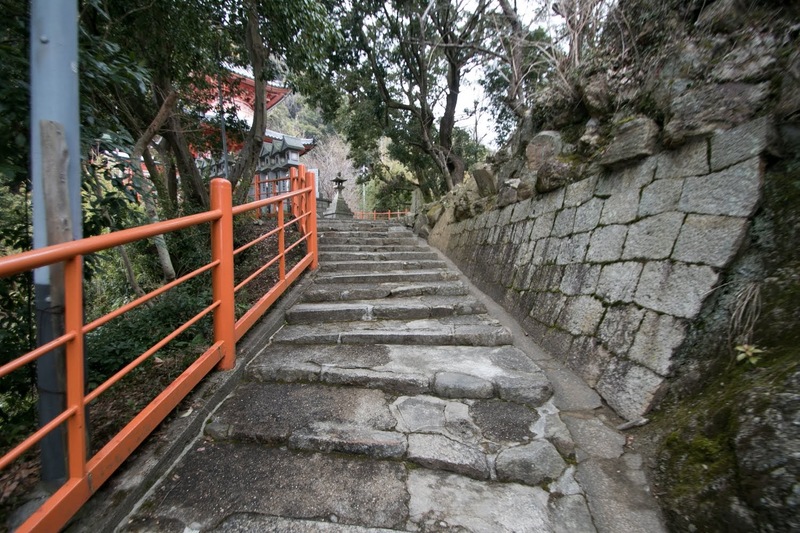 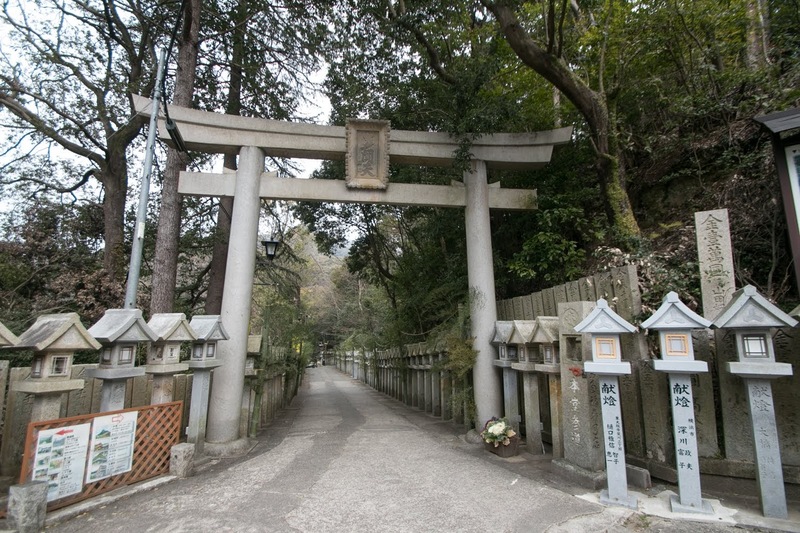 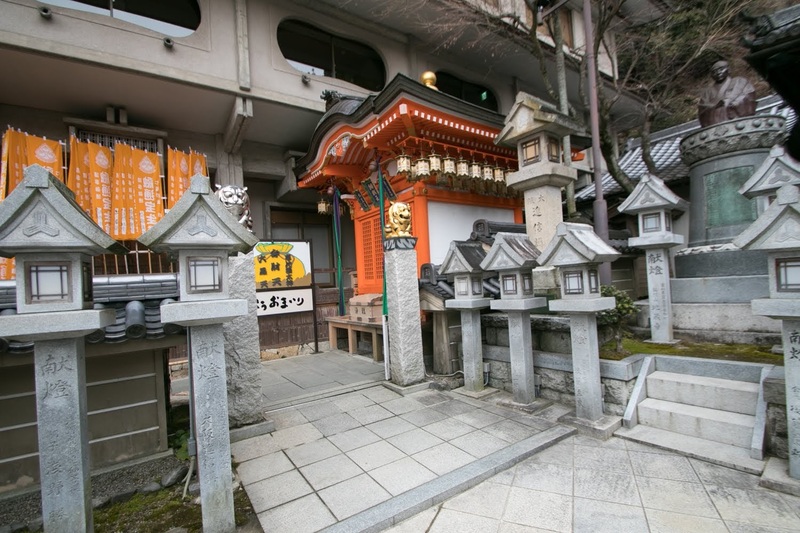 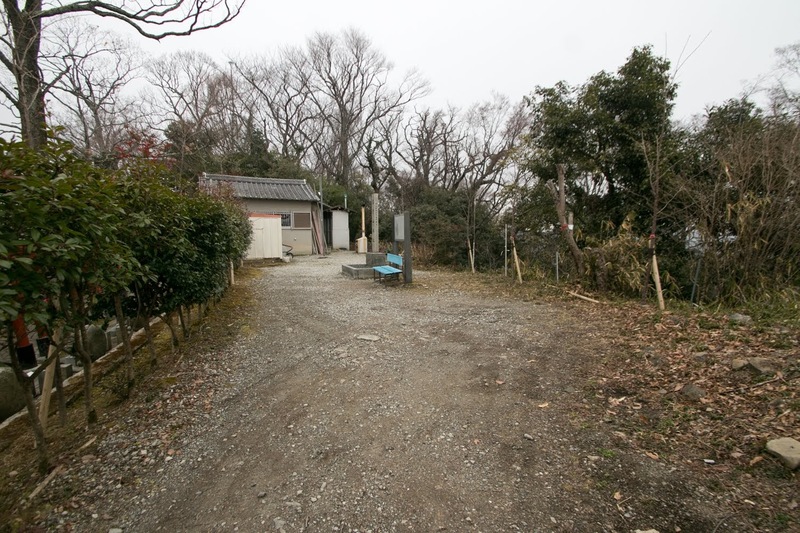 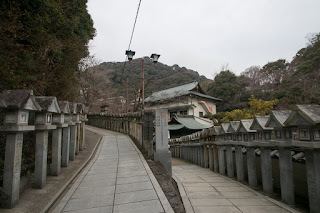 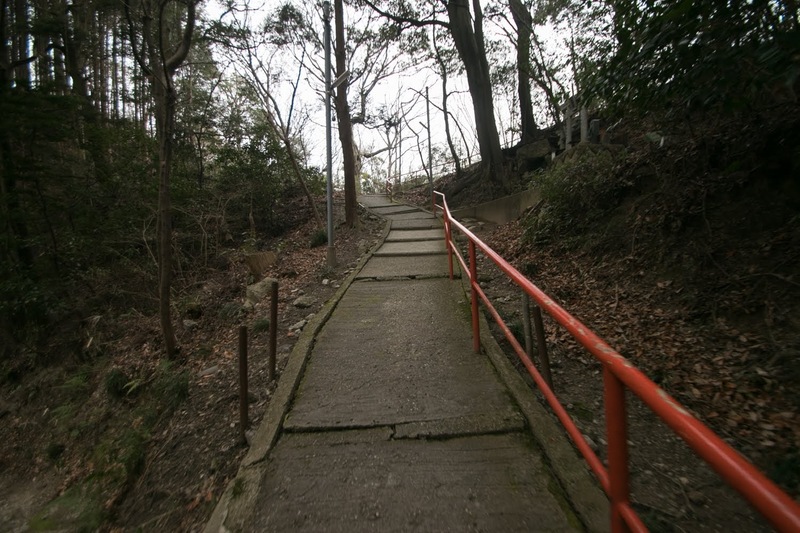 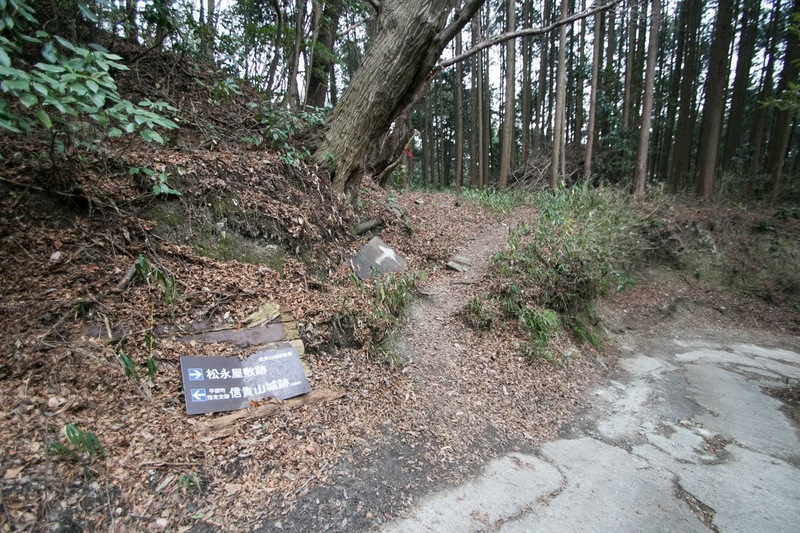 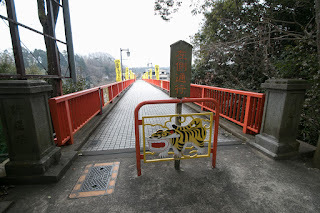 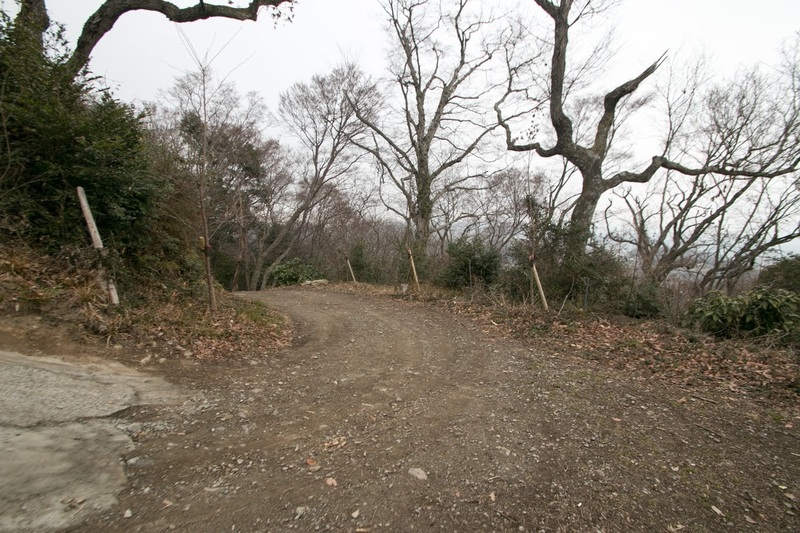 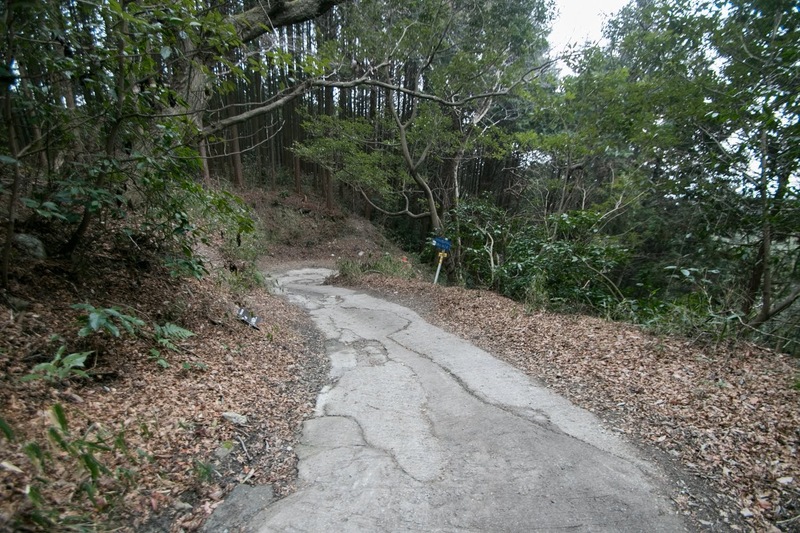 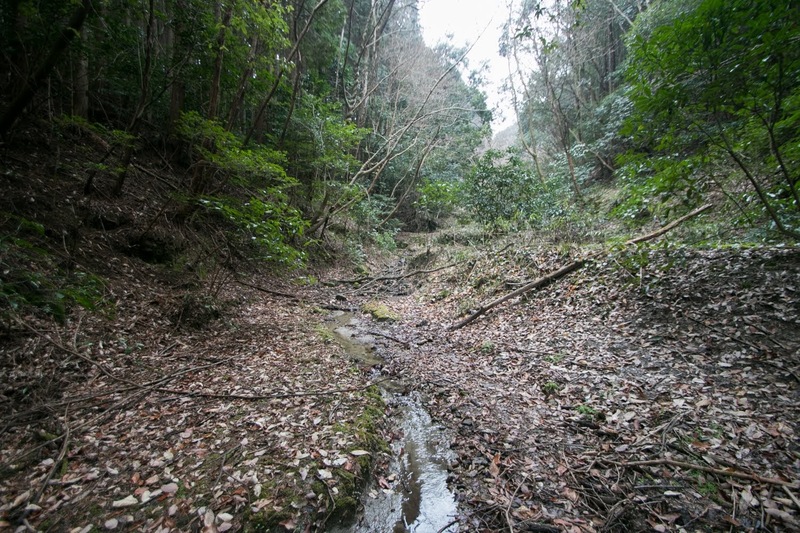 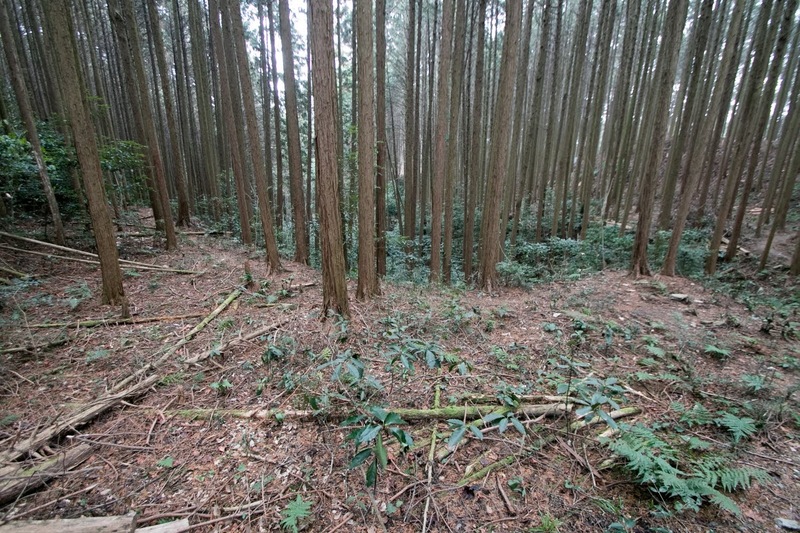 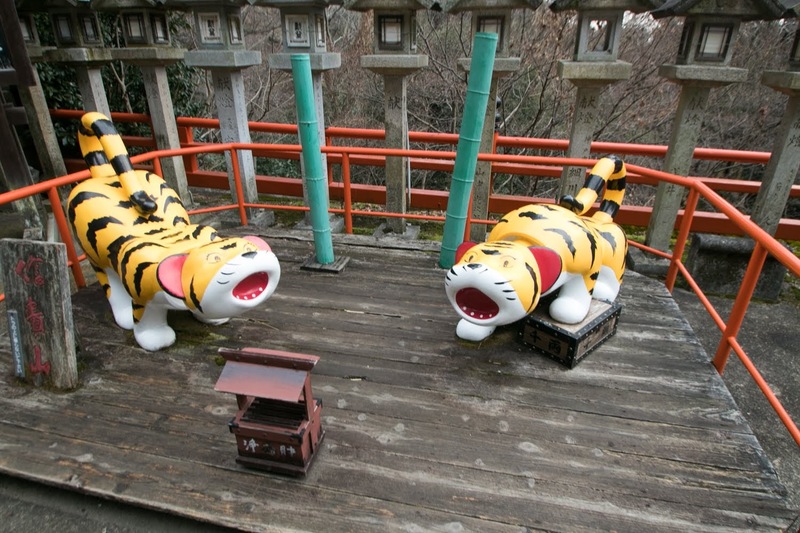 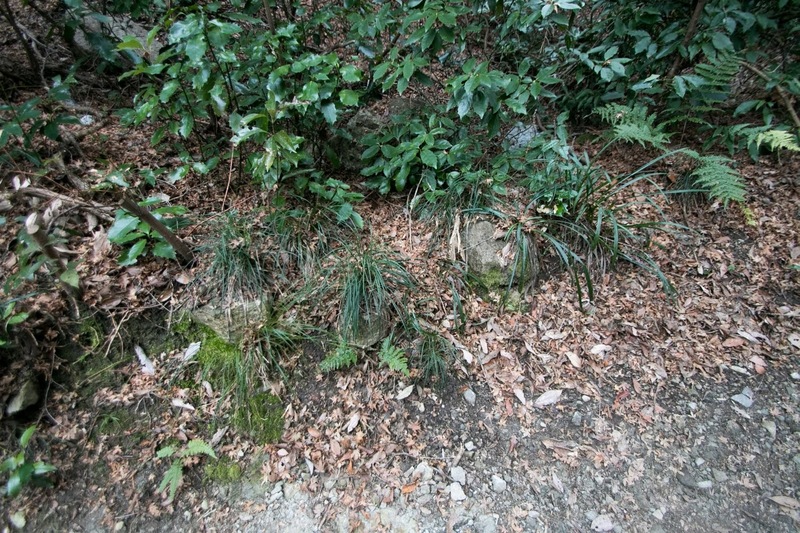 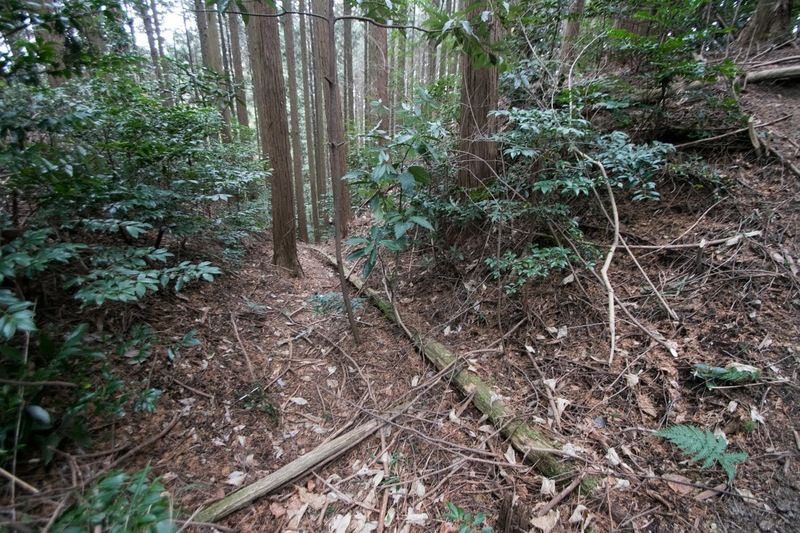 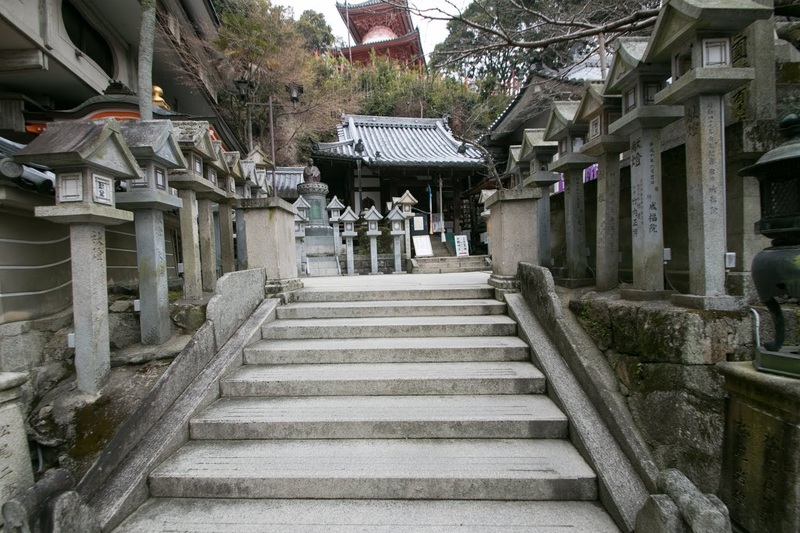 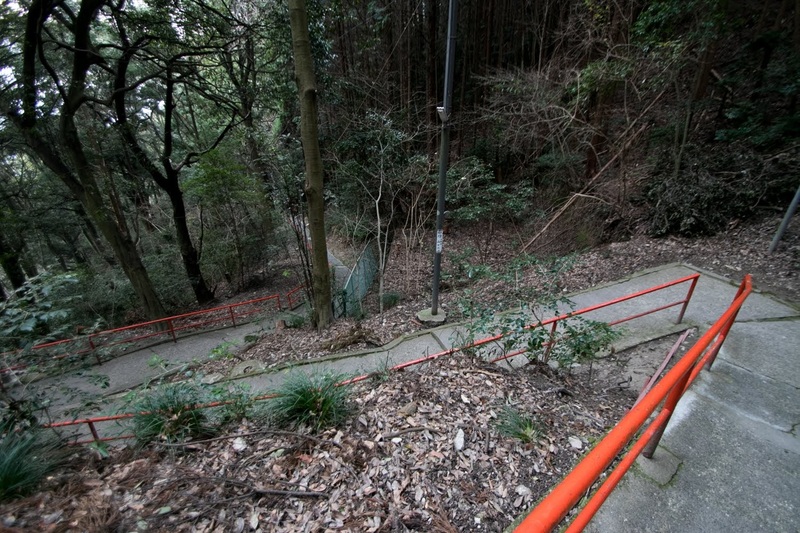 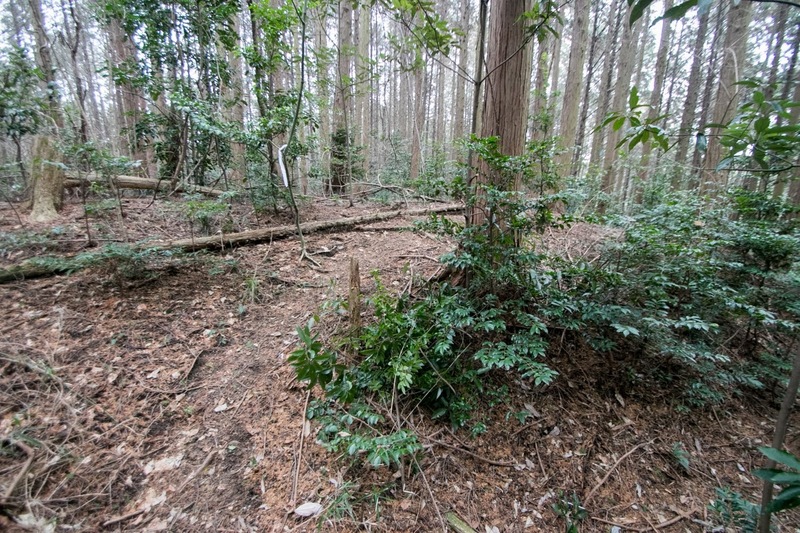 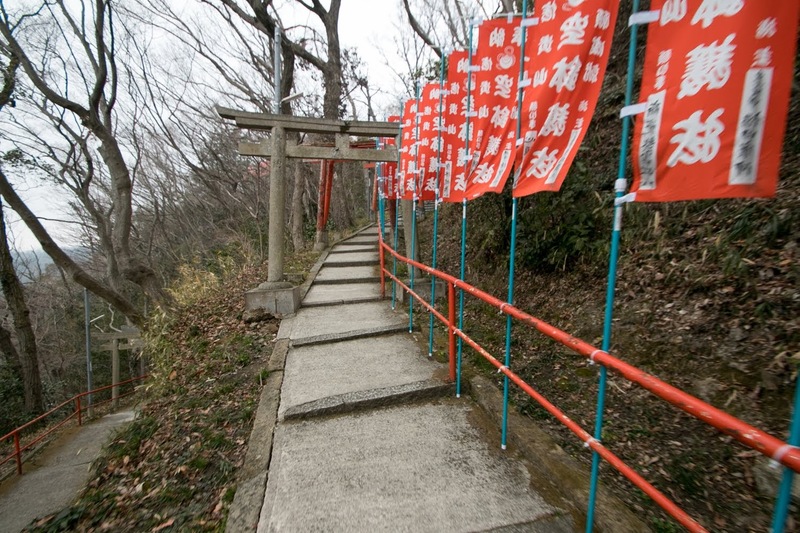 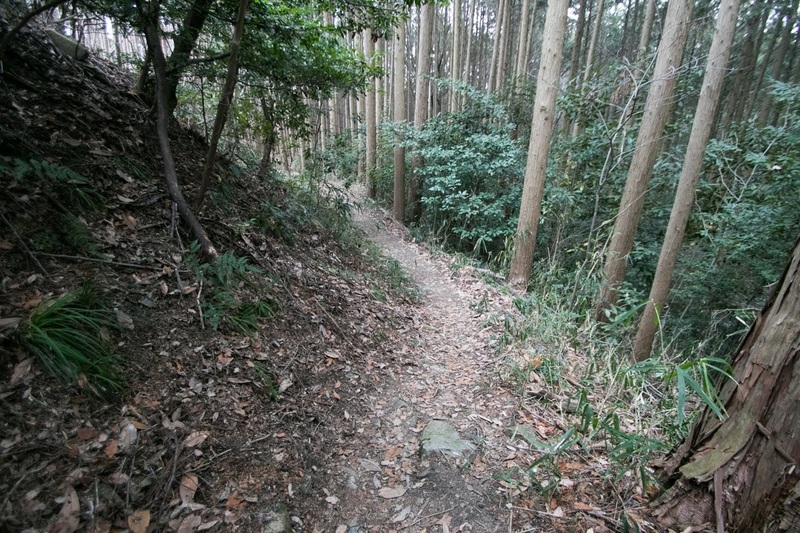 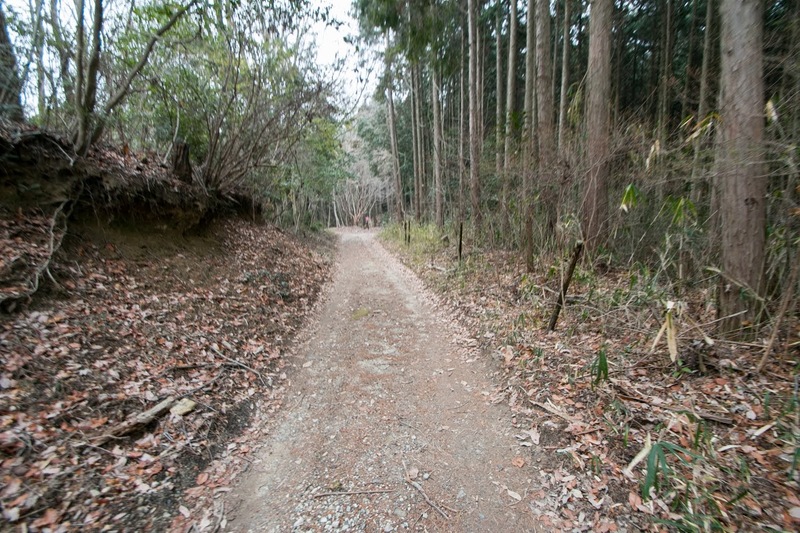 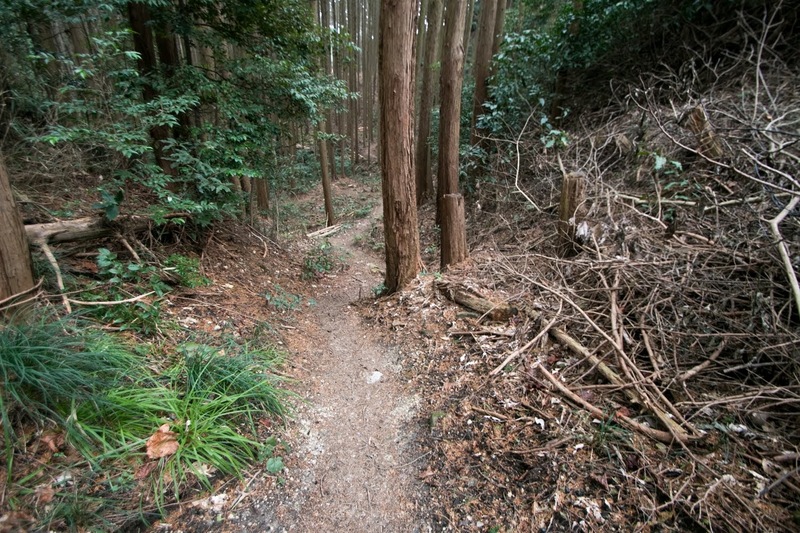 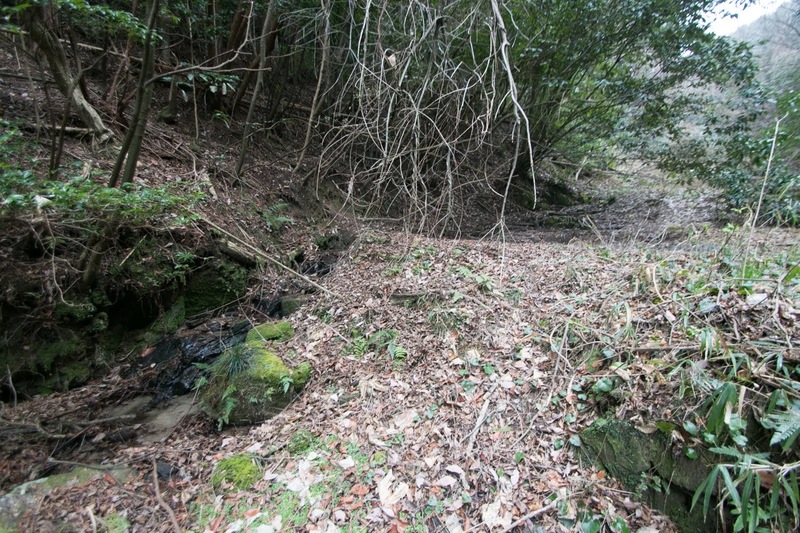 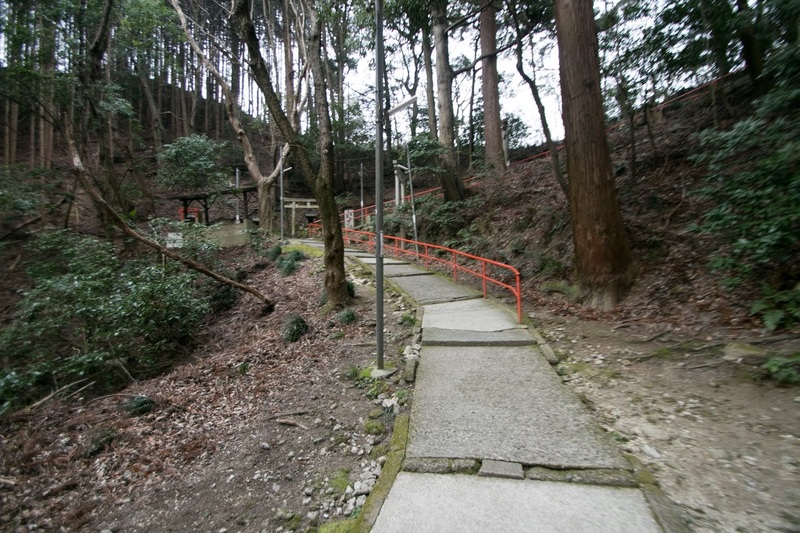 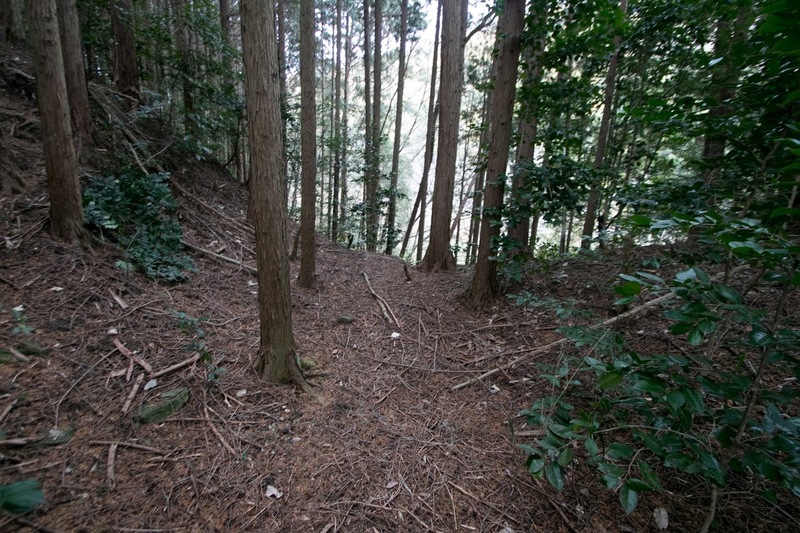 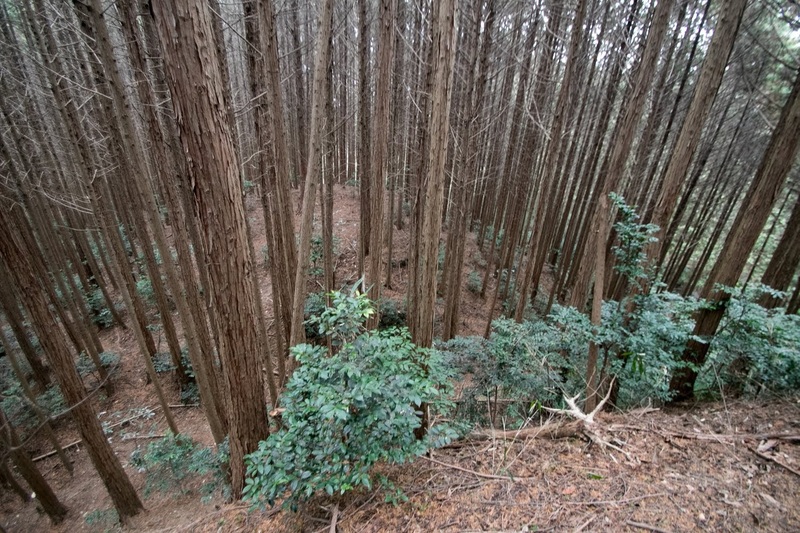 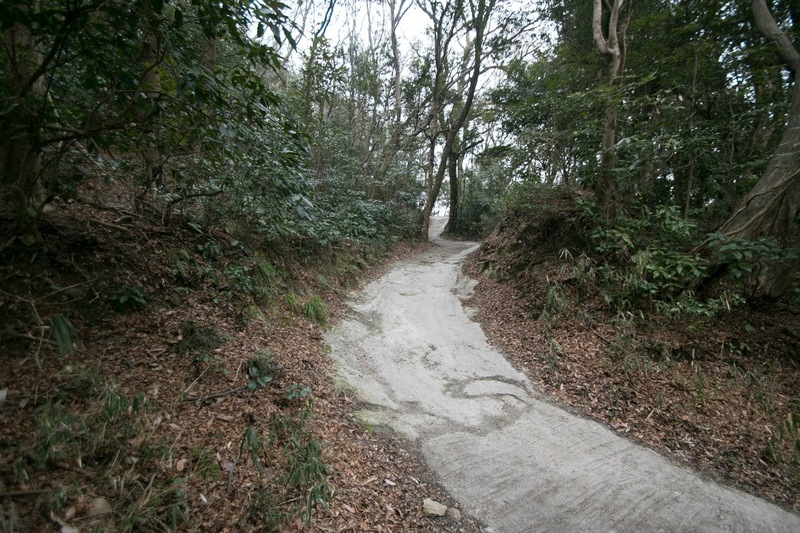 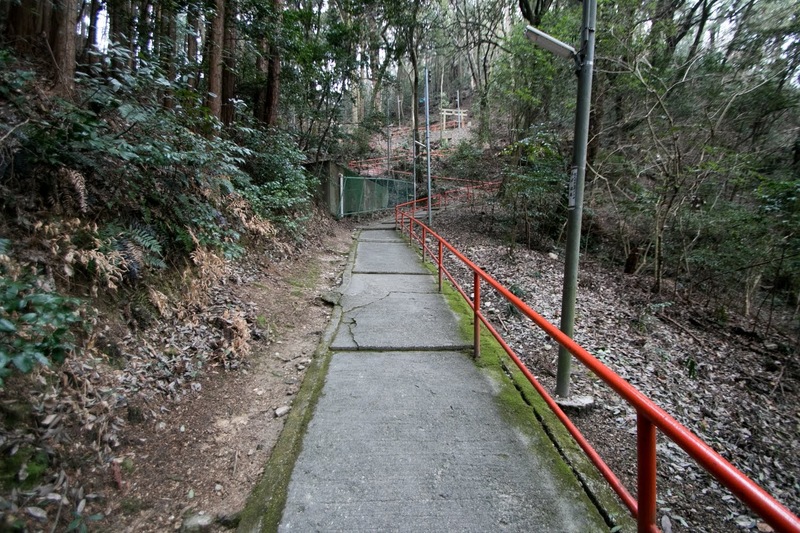 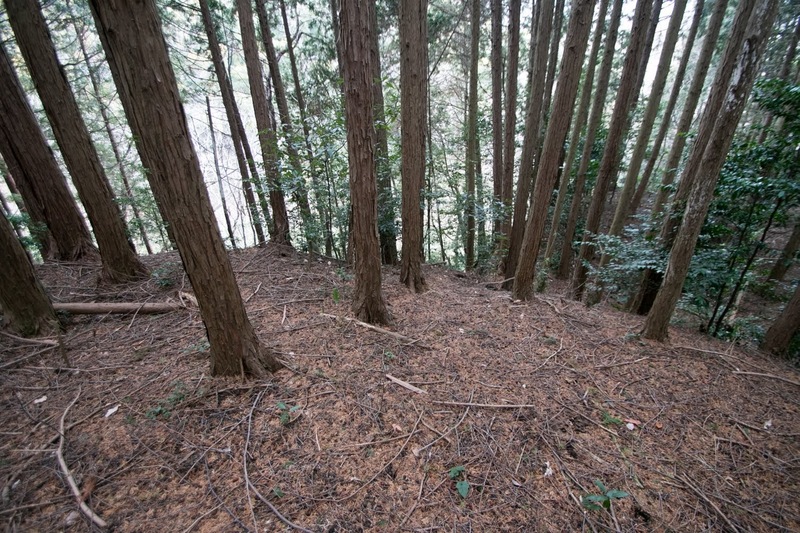 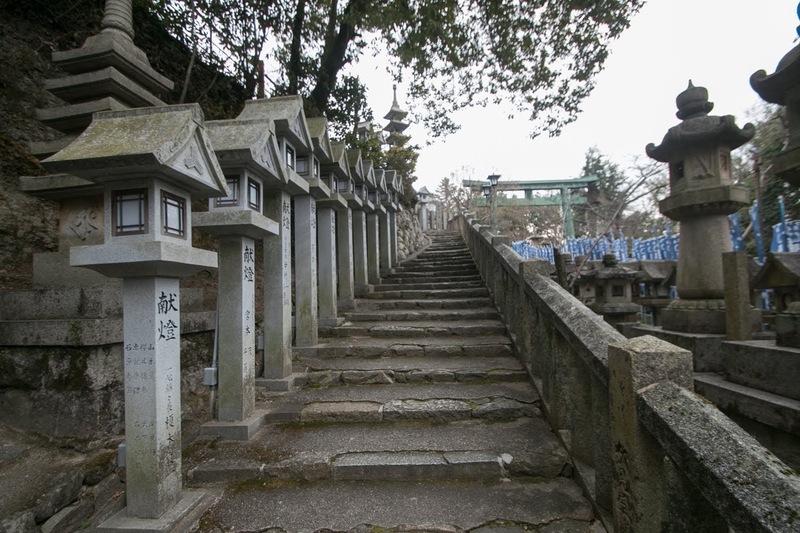 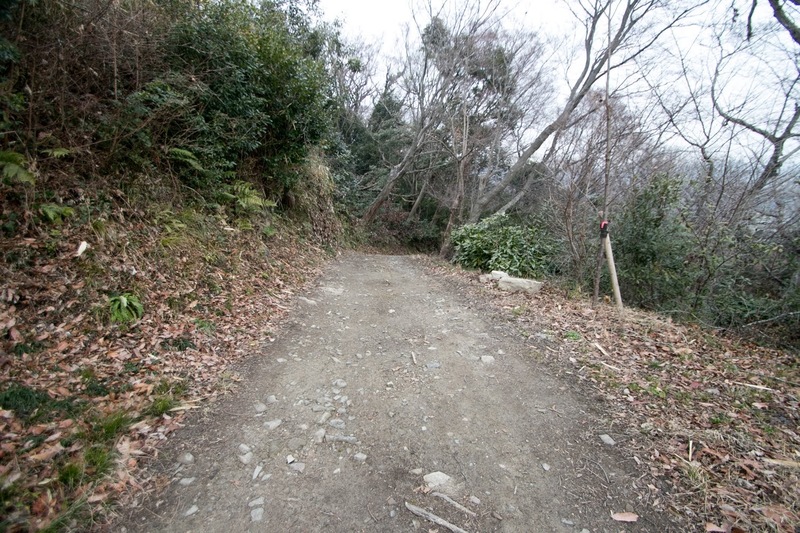 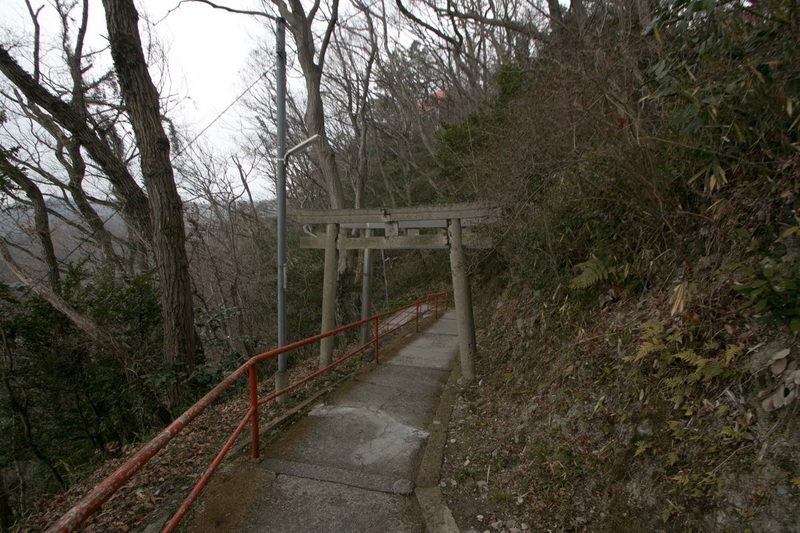 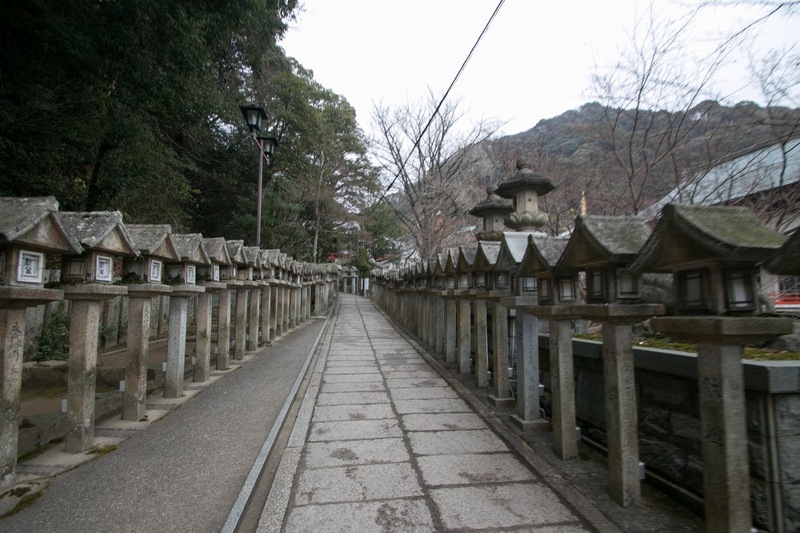 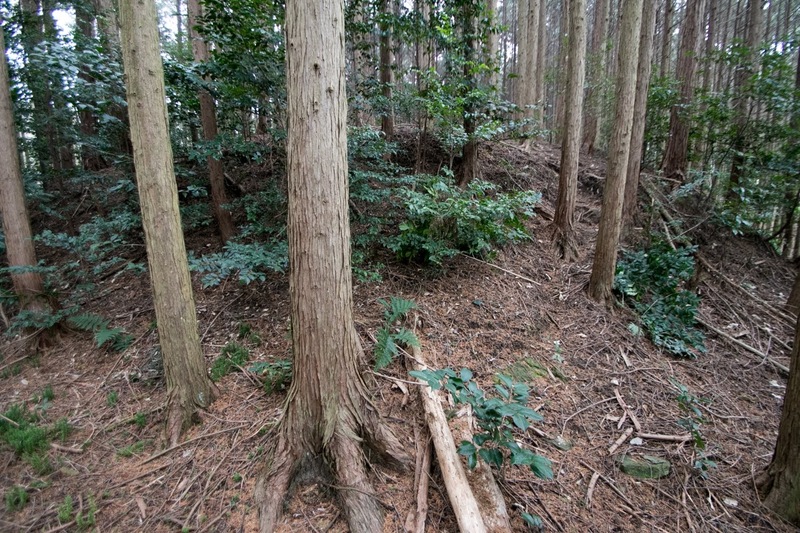 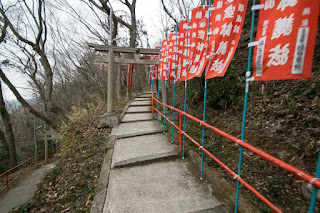 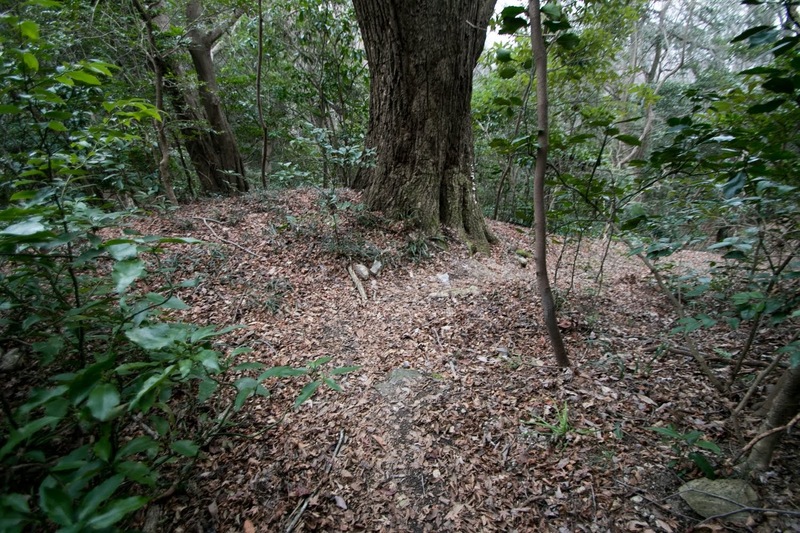 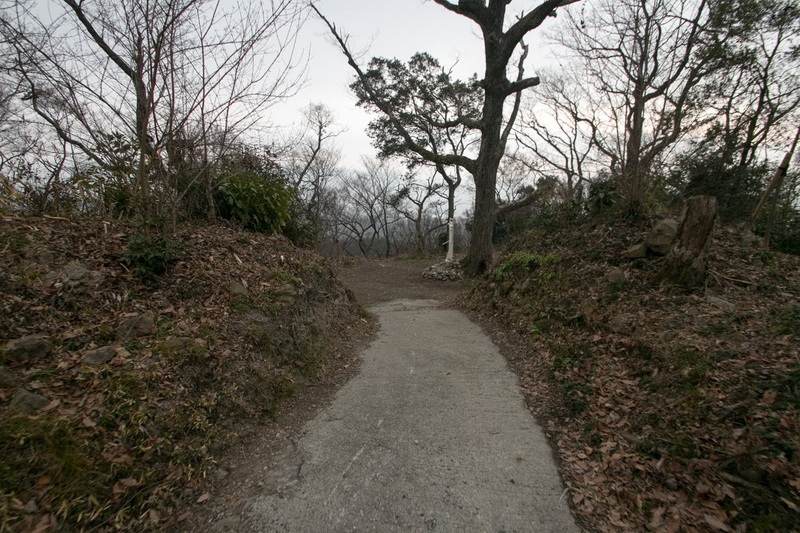 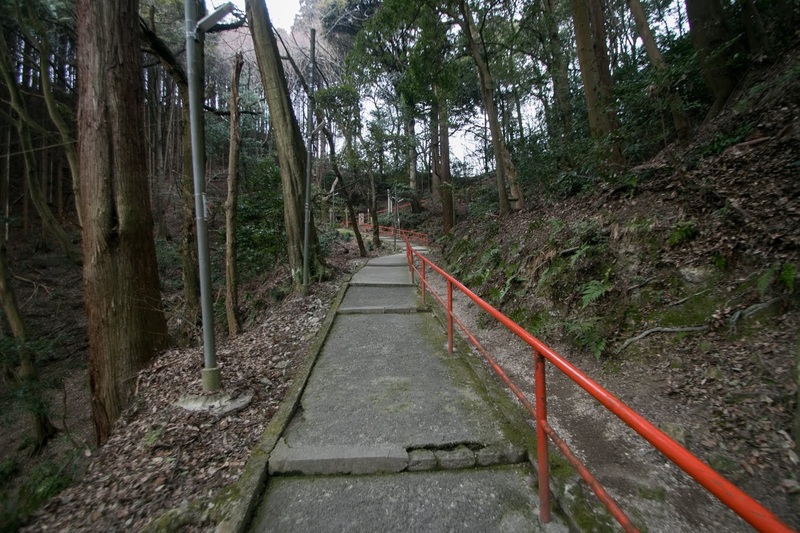 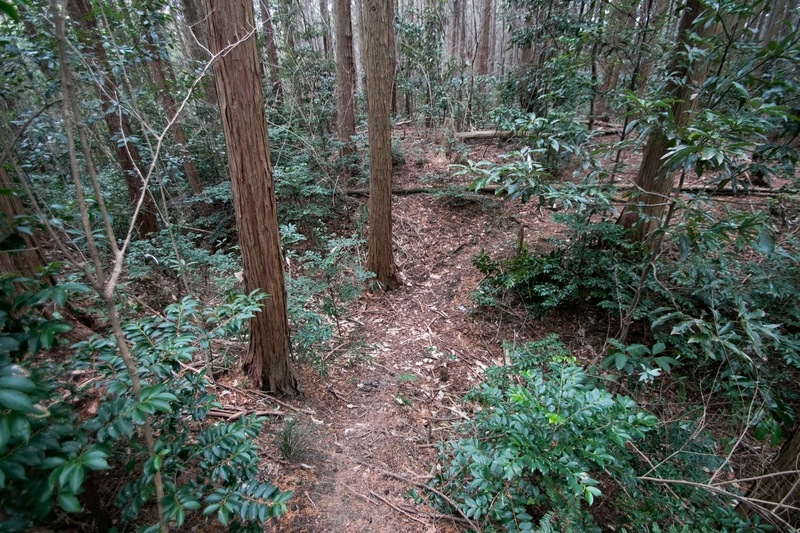 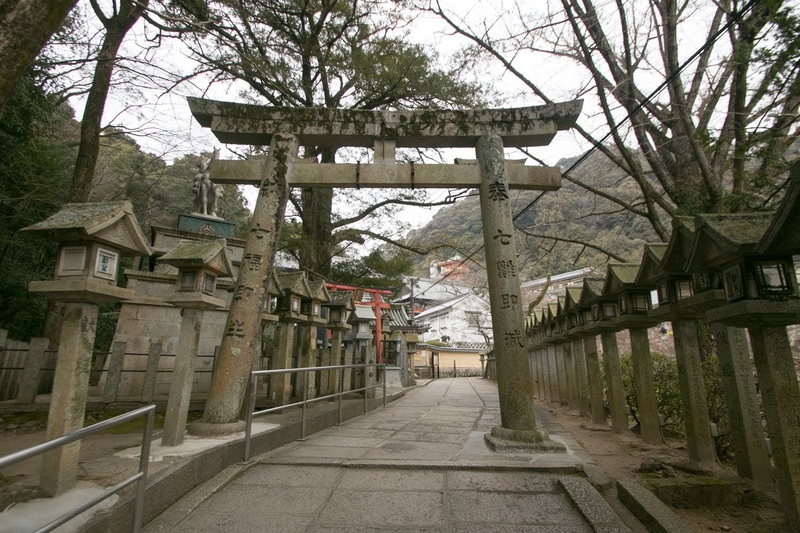 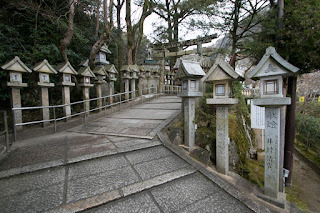 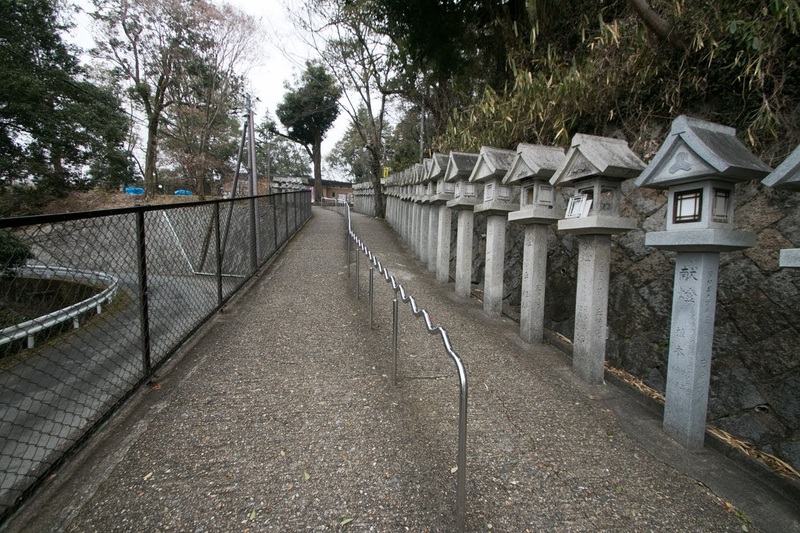 Facing this situation, Hisahide and Miyoshi Sanninshu assaulted the residence of Yoshiteru in 1565. 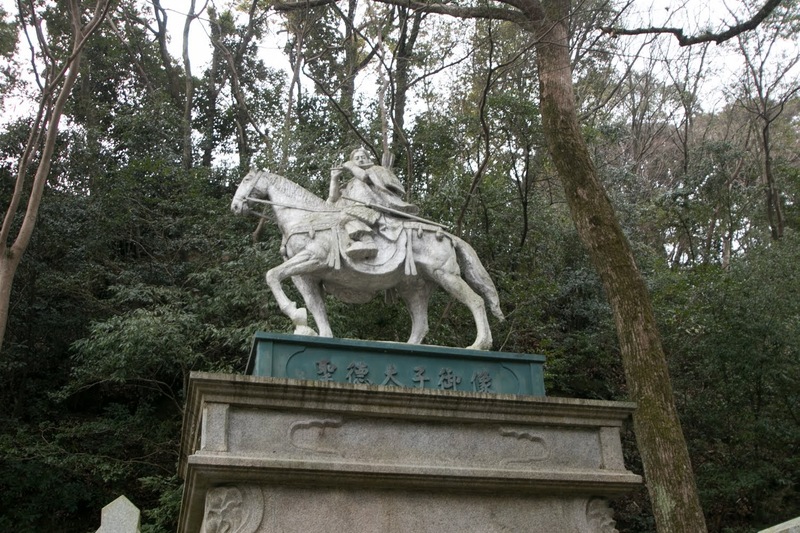 Yoshiteru was the master of sword and bravely fought against overwhelming soldiers, but was outnumbered and finally killed by Matsunaga and Miyoshi army. Shortly after that, now a conflict arose Hisahide and Miyoshi Sanninshu which kept Yoshitsugu Miyoshi (1549-1573), the son of Nagayoshi. Nagahide and Miyoshi Sanninshu army faced at Nara city, and among the battle the huge building covered great statue of Buddha (“Daibutsuden” at Todaiji temples was burnt down. The great Buddha itself was damaged and had been exposed to rain and wind for long time after that. The truth is unclear but as above Hisahide is said to perform three deadly sins of killing his master, killing Shogun and attack to Great Buddha, thus Hisahide is regarded as the most notorious bandit in Sengoku era until now. But seen from opposite side, Hisahide was a innovative general who did not stick to old authority. 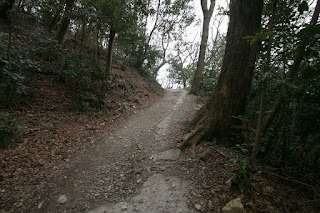 The situation became stuck between both side but an external strong power totally changed situation. 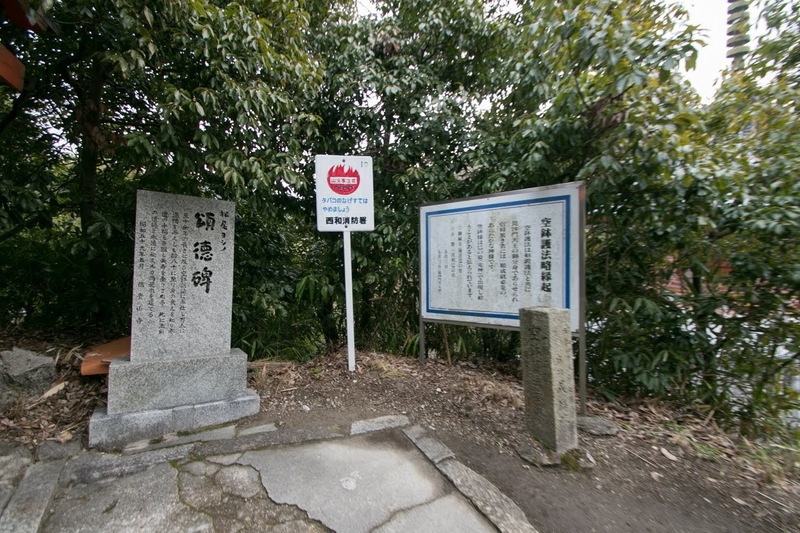 Nobunaga Oda (1534-1582), a warlord of Owari country and now seized current Chubu area, advanced to Kyoto along with Yoshiaki Ashikaga (1537-1597), the younger brother of assassinated 13th Shogun Yoshiteru. 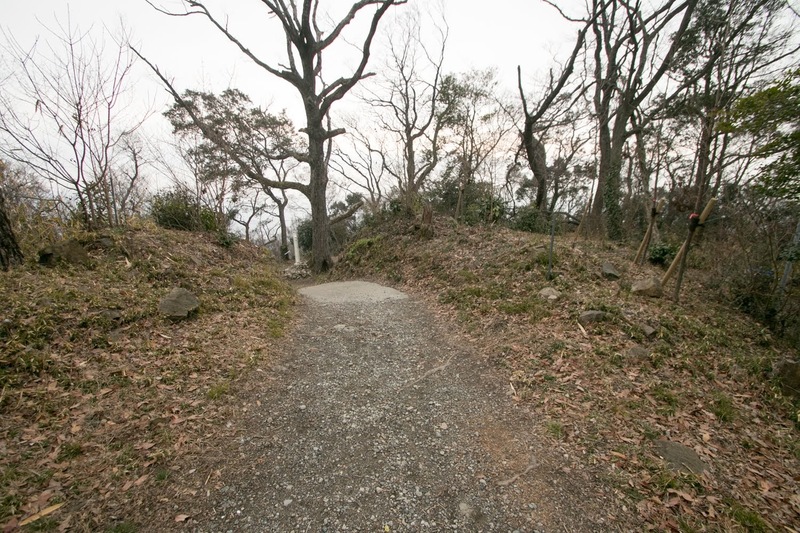 By attack of Nobunaga army, Miyoshi Sanninshu escaped from Kyoto and their government collapsed. 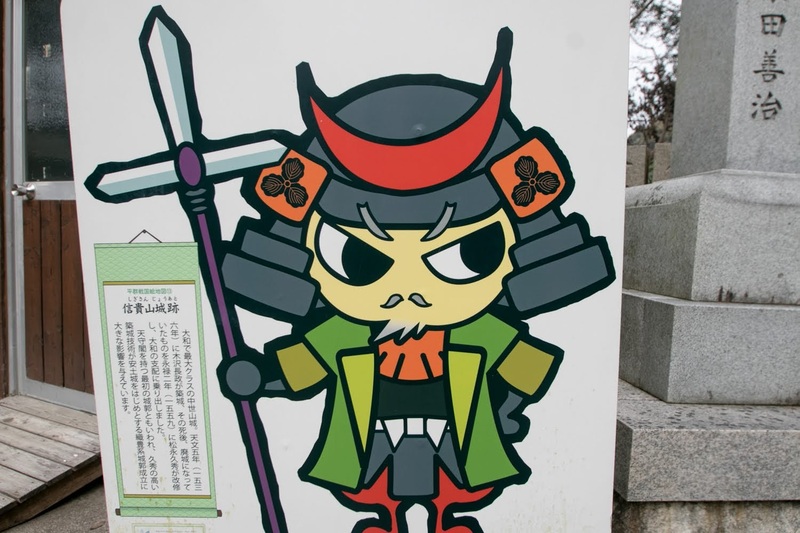 Hisahide was also originally an enemy of Nobunaga as a practitioner of assassination of Shogun, but Hisahide surrendered to Nobunaga providing a hostage and a famous tea container “Tsukumonasu”. Nobunaga evaluated talent of Hisahide, forgave him and let him govern Yamato country. According to one theory, Nobunaga evaluated castle construction of Hisahide and kept him as a general. Shigisan castle was a castle equipped stone walls from early days along with Kannonji caslte (Shiga prefecture), and also had a four story main tower. 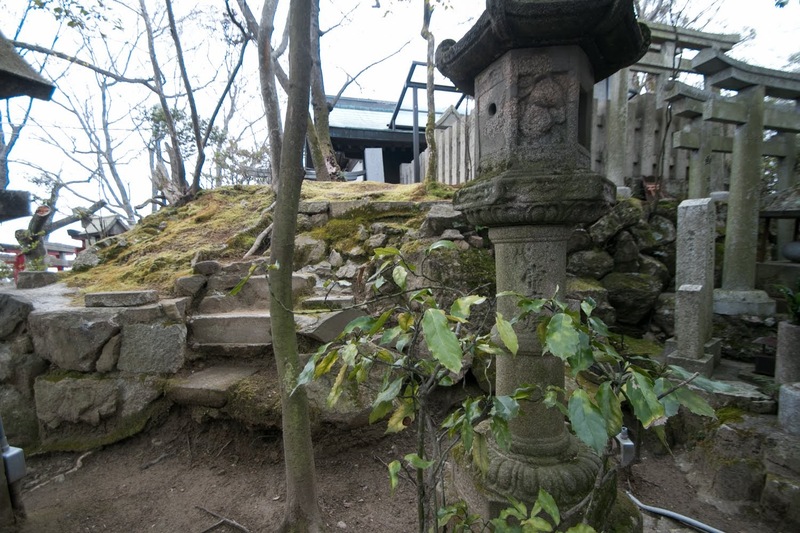 The oldest main tower is said as the one of Itami castle built in 1520’s, but the one at Shigisan castle was also innovative. Further Hisahide introduced a barrack type corridor connecting turret into Tamonyama castle, his another castle. 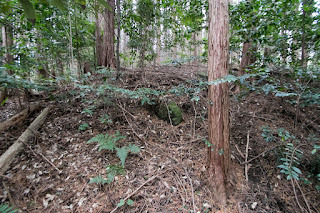 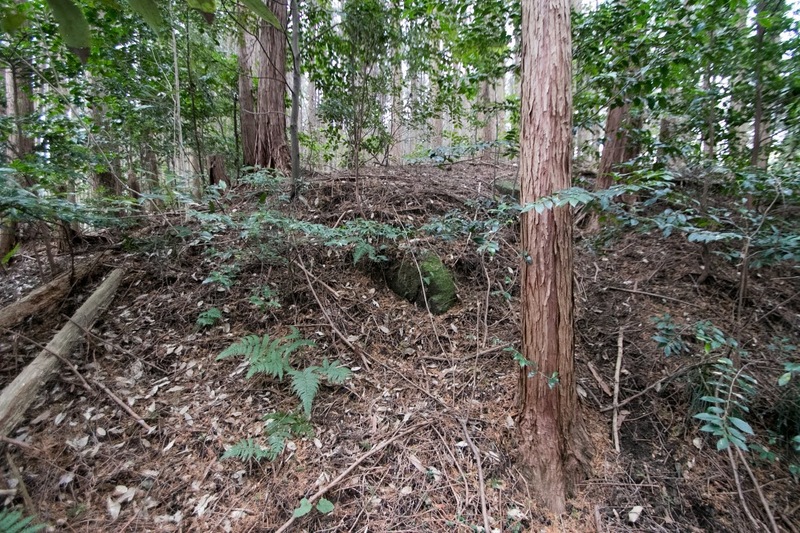 By this turret the defender constantly shut the rifle irrespective to the weather, and this type of corridor spread to all over the Japan and was named as “Tamon Yagura” (Tamon type turret”). 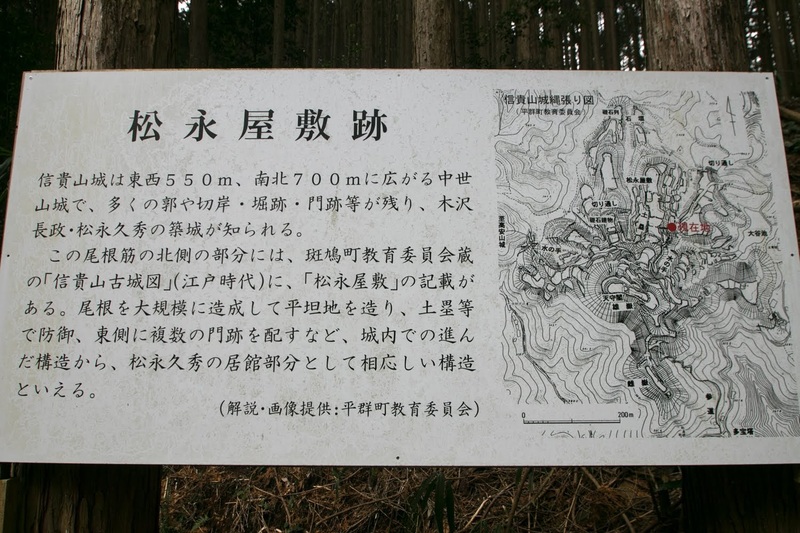 Under the support of Nobunaga, Hisahide beat Tsutsui clan and other local clans and virtually united Yamato country. 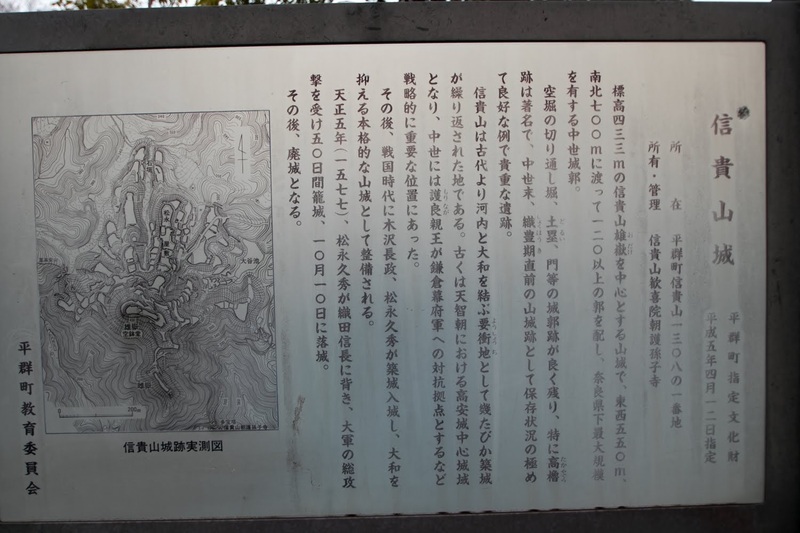 But in 1572, under the encirclement against Nobunaga lead by Yoshiaki Ashikaga, Hisahide watched inferior situation of Nobunaga and betrayed. 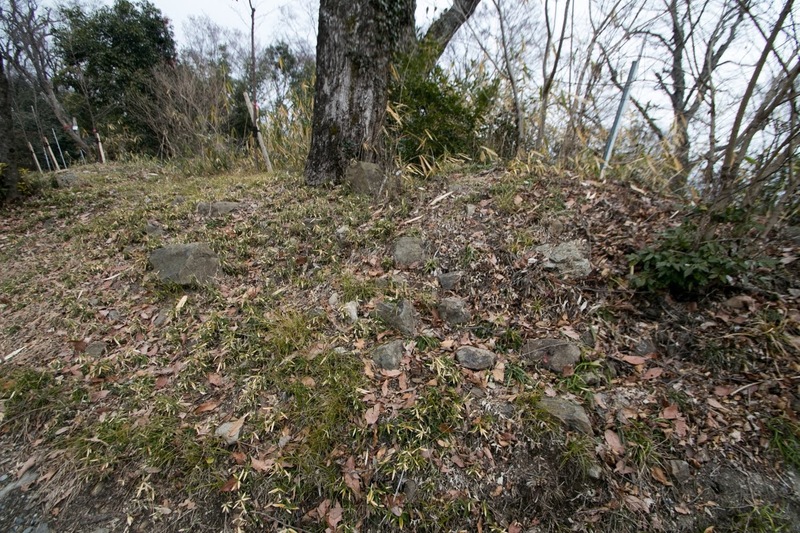 But due to the death of Shingen Takeda (1521-1573), a warlord of Kai province (Yamanashi prefecture) expected to attack Nobunaga, and extinction of Azai clan and Asakura clan, this anti-Nobunaga encirclement collapsed. Somehow surrendered Hisahide was forgiven, but Tamonyama castle was confiscated and the governor of Yamato province changed to Naomasa Hanawa (?-1576). 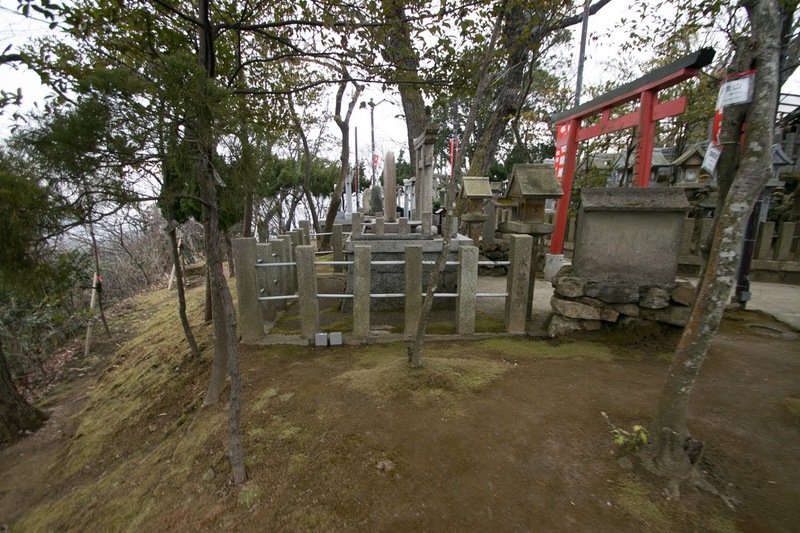 After the death of Naomasa, the governor of Yamato country changed to Junkei Tsutsui (1549-1584), an old rival of Hisahide. 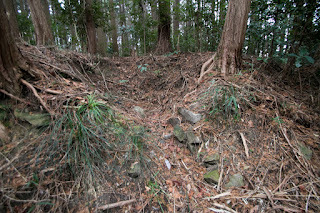 Dissatisfied Hisahide made another revolt to Nobunaga cooperating with Kenshin Uesugi (1530-1578), a warlord of Echigo country. 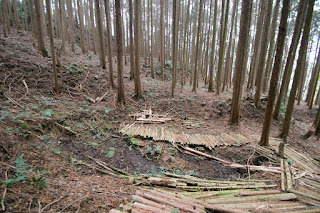 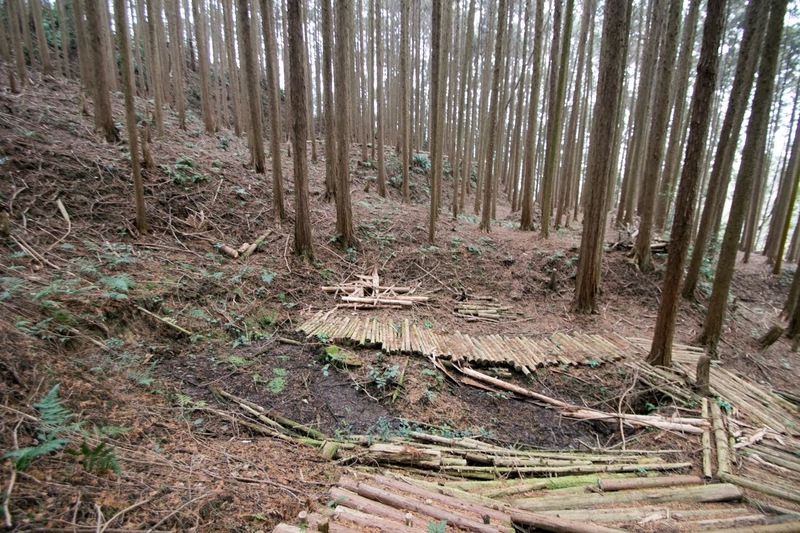 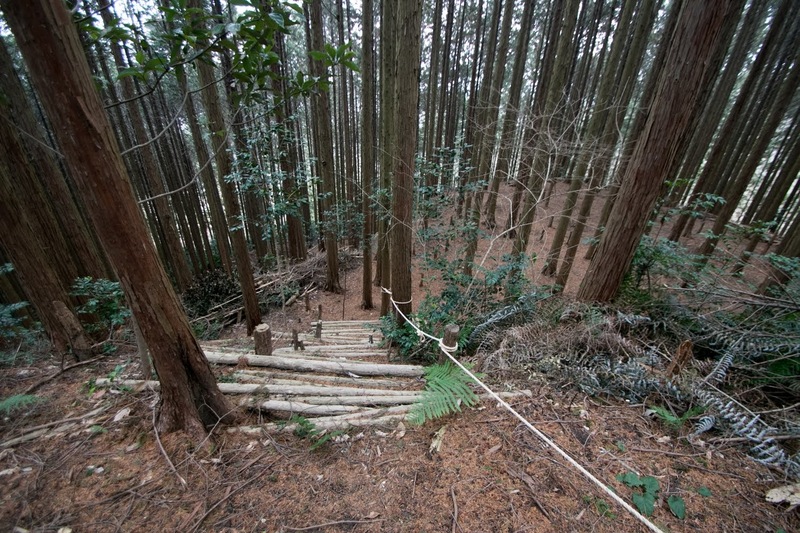 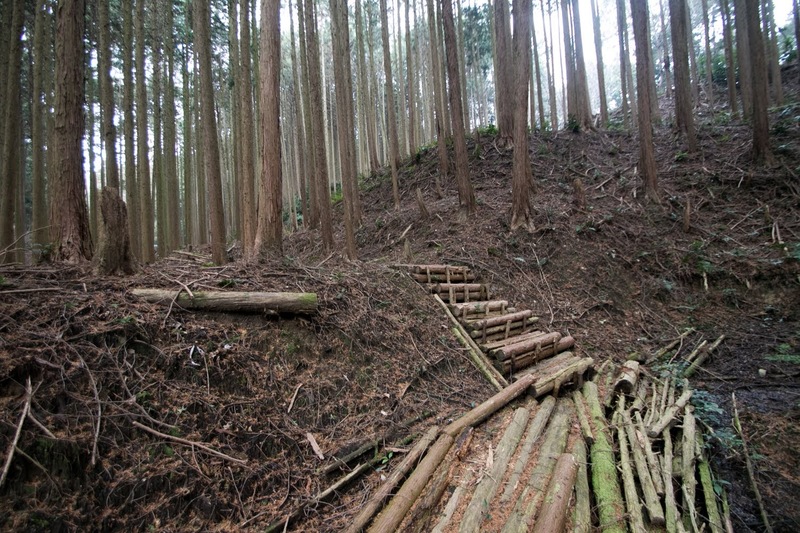 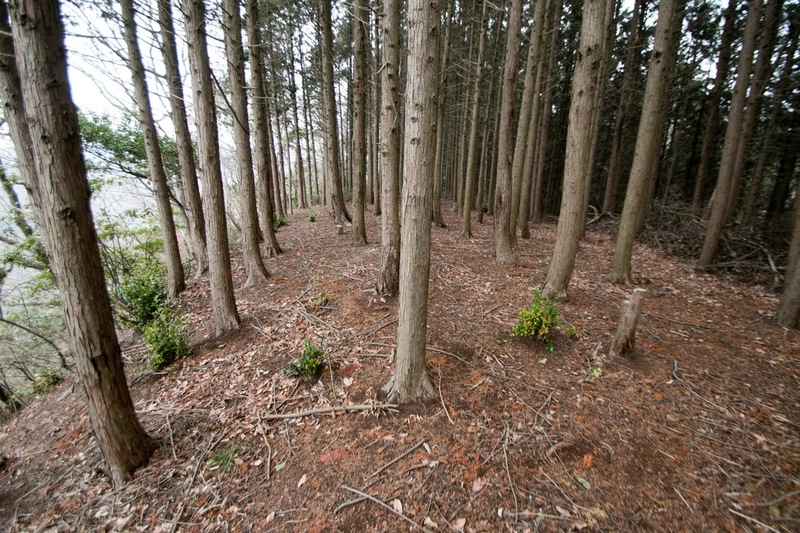 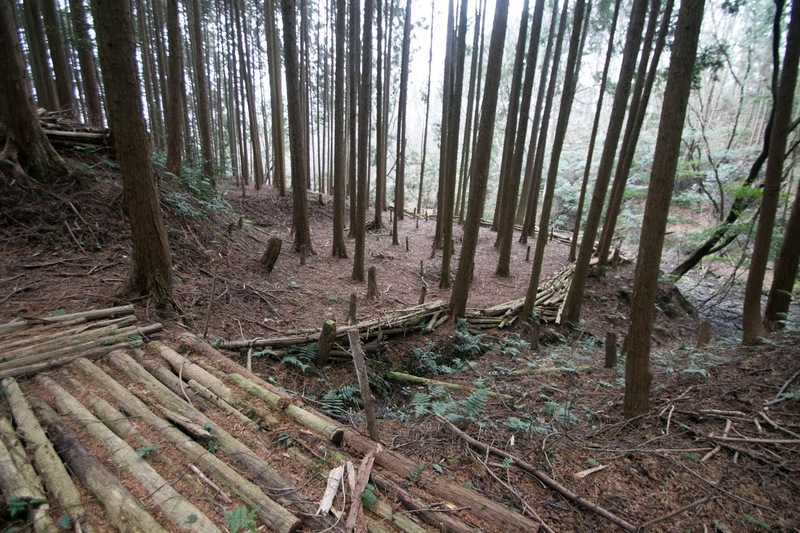 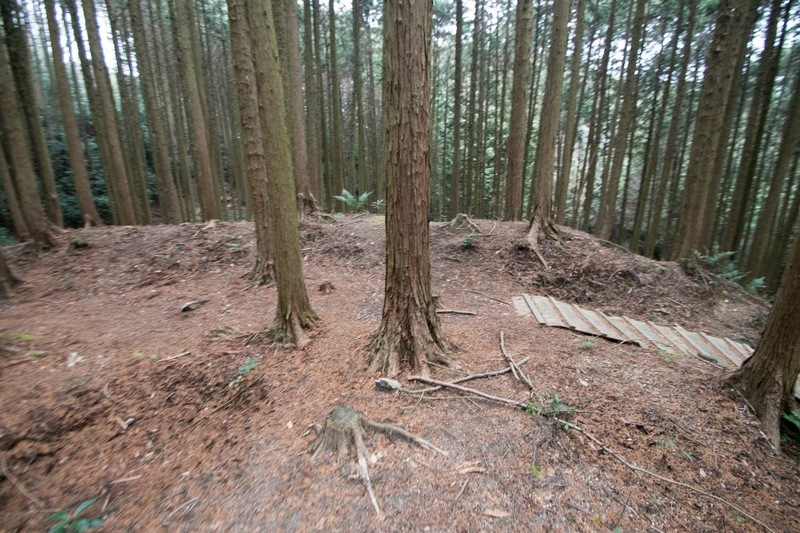 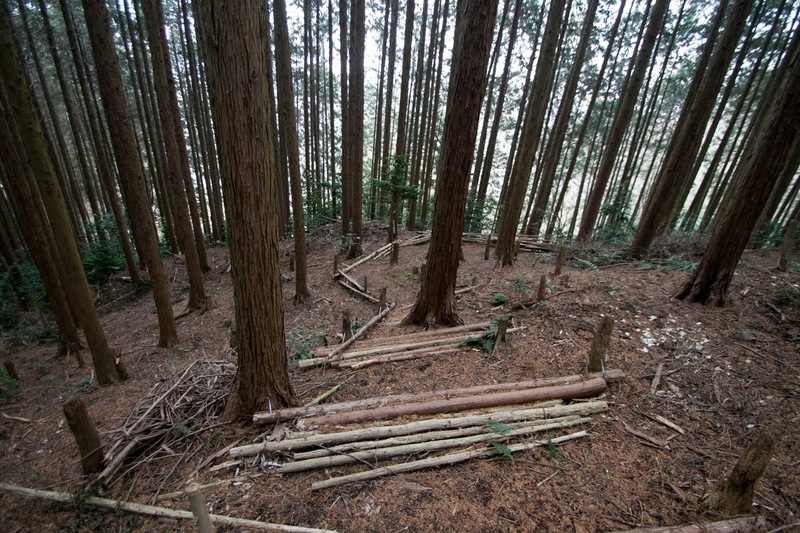 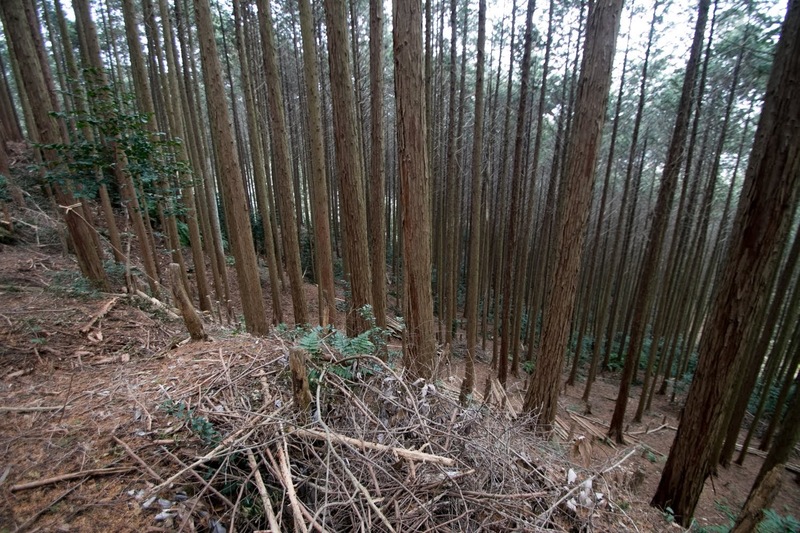 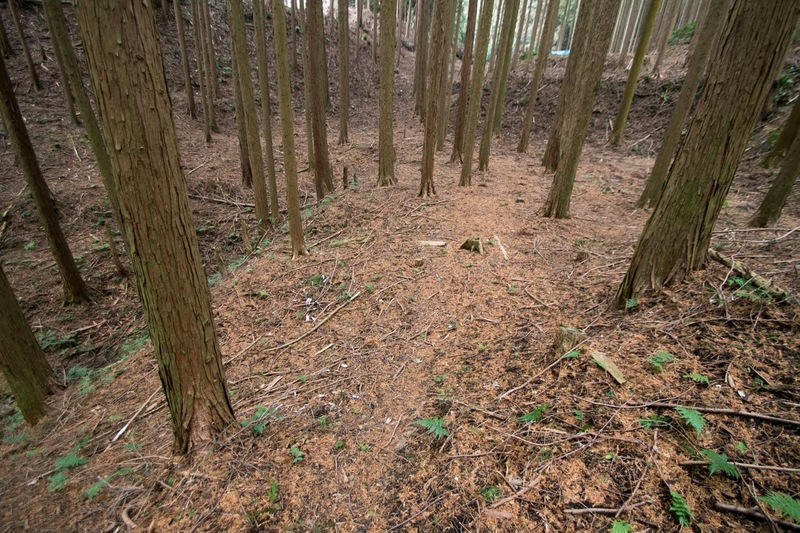 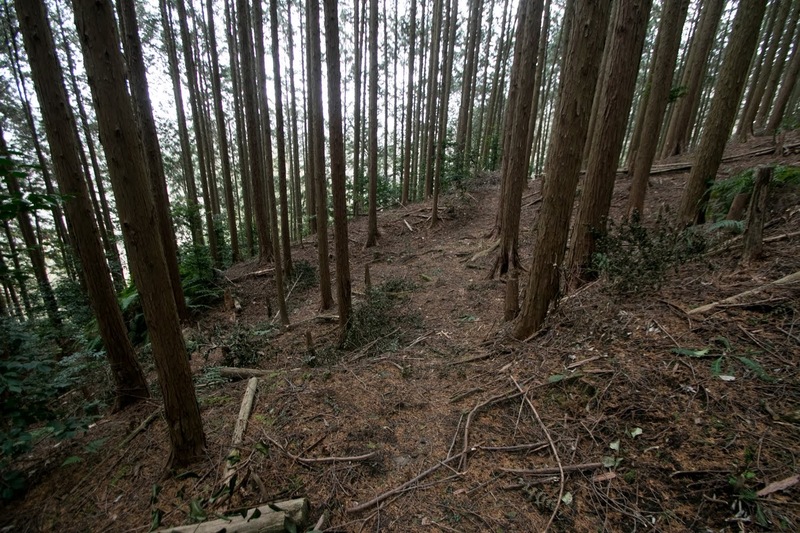 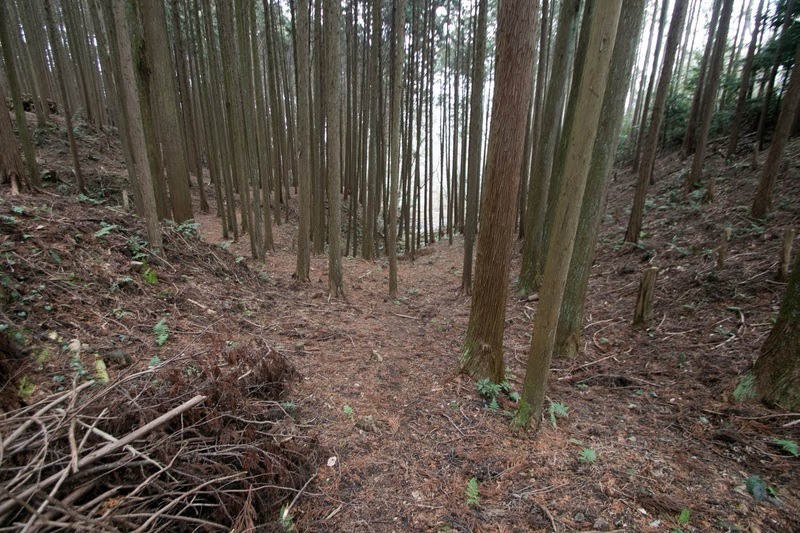 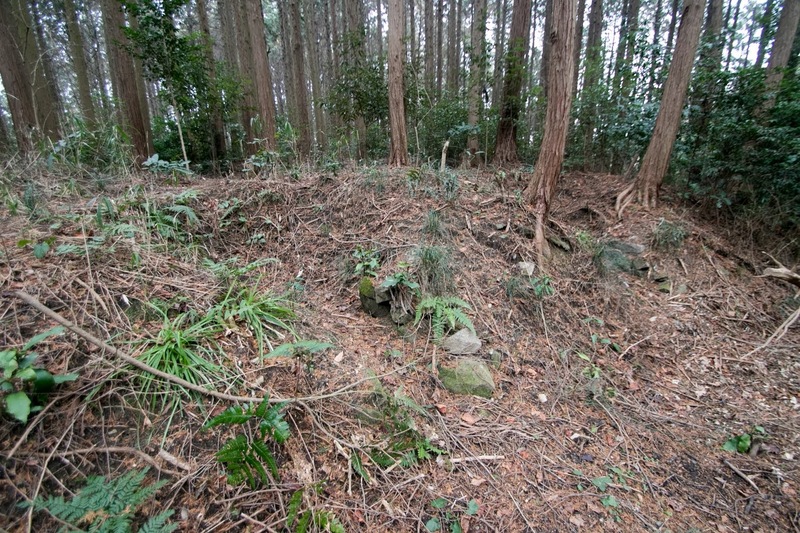 But there was no assistance to Hisahide and a large army of Oda clan surrounded Shigisan castle. Hisahide was told to forgive him if he provides another famous tea equipment named “Hiragumo no Kama” (teakettle of flat spider), but Hisahide declined it and put the gunpowder in the kettle, and finally exploded himself with the kettle. 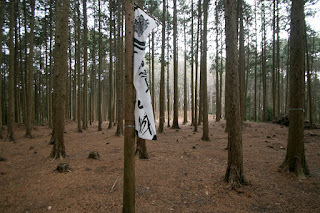 It was the becoming style for the general called as a bandit. 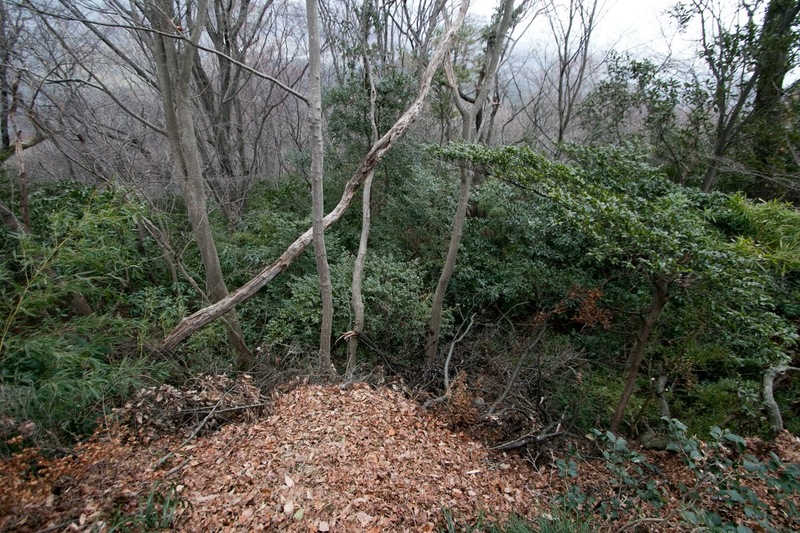 After the fall, Shigisan castle was abolished. 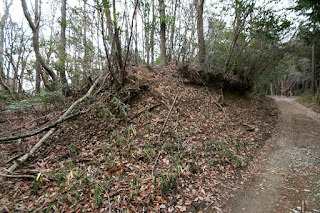 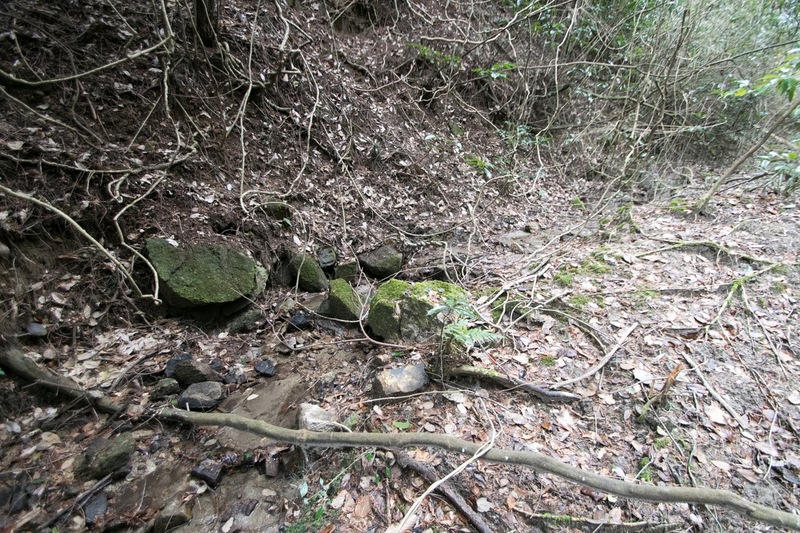 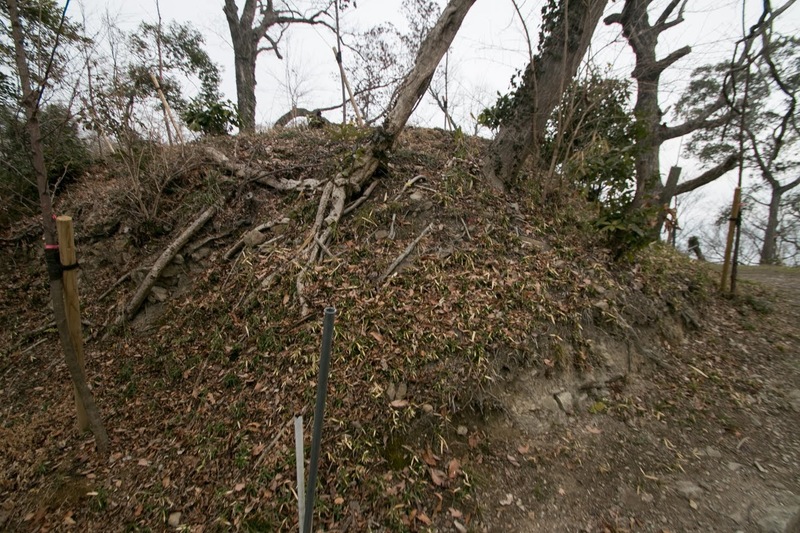 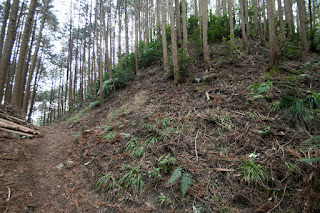 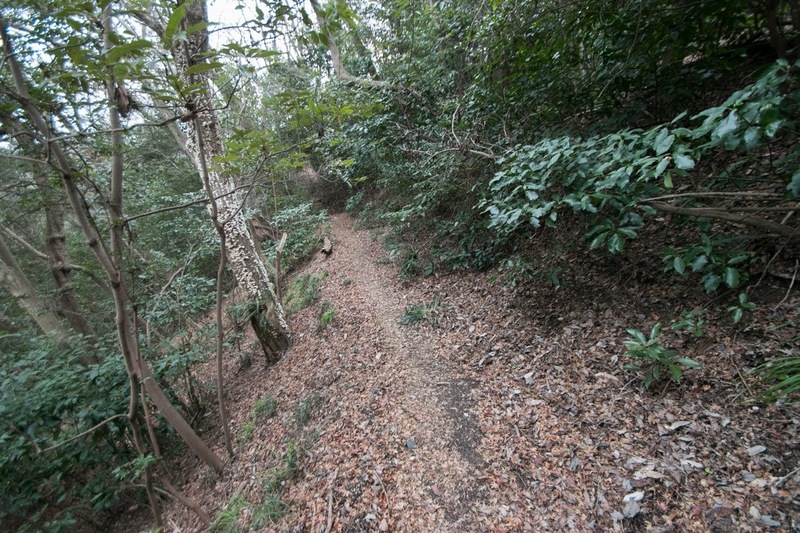 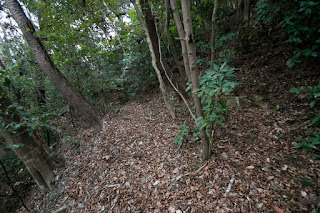 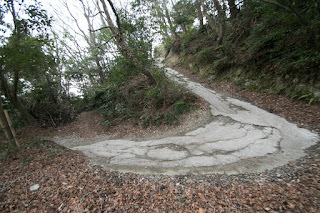 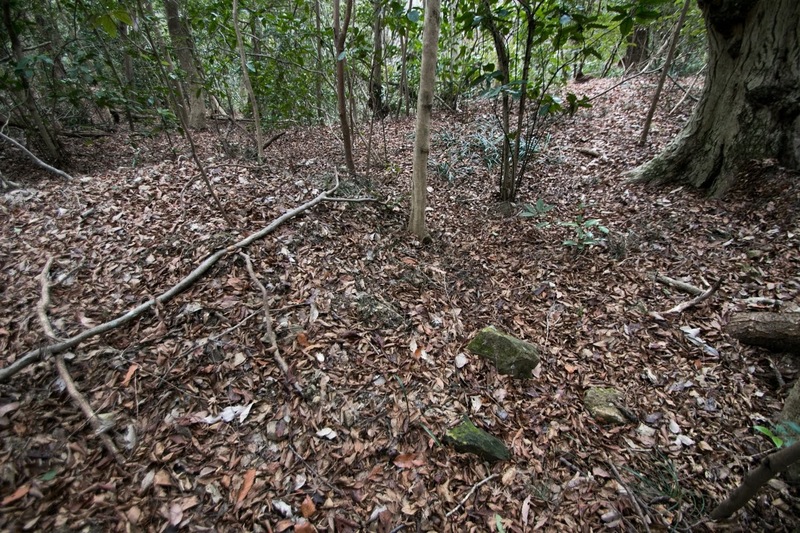 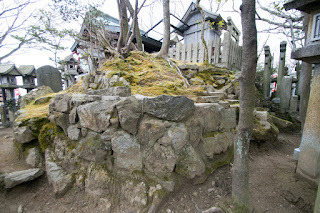 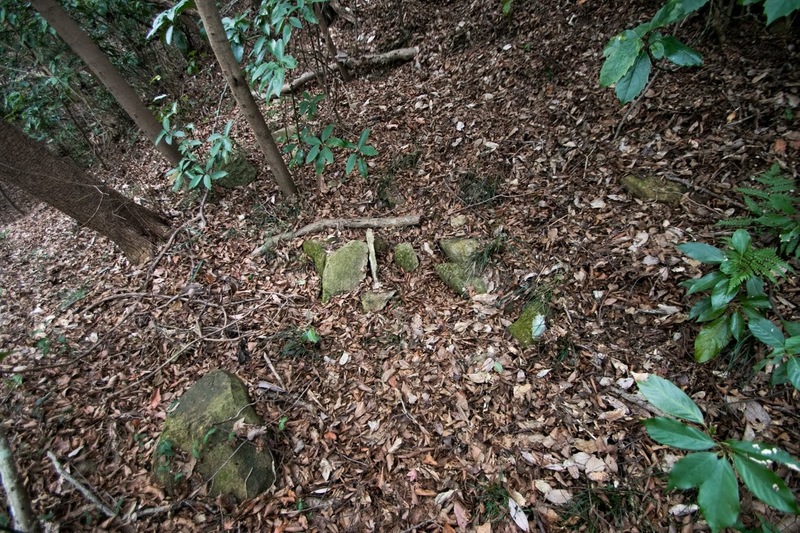 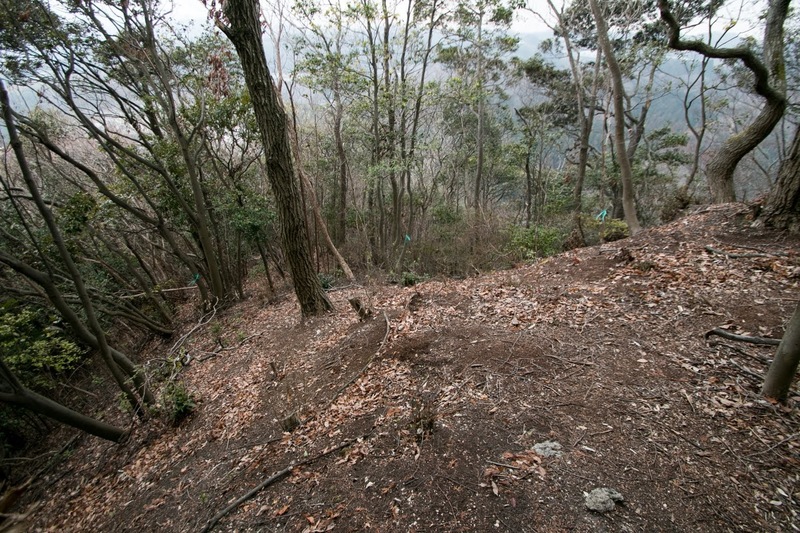 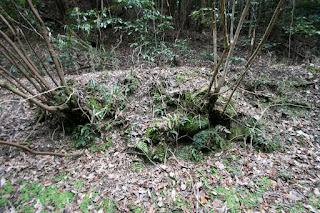 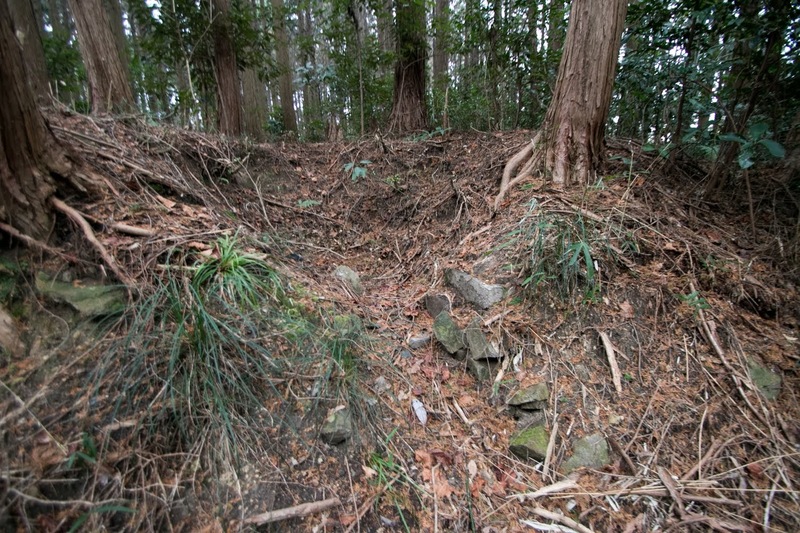 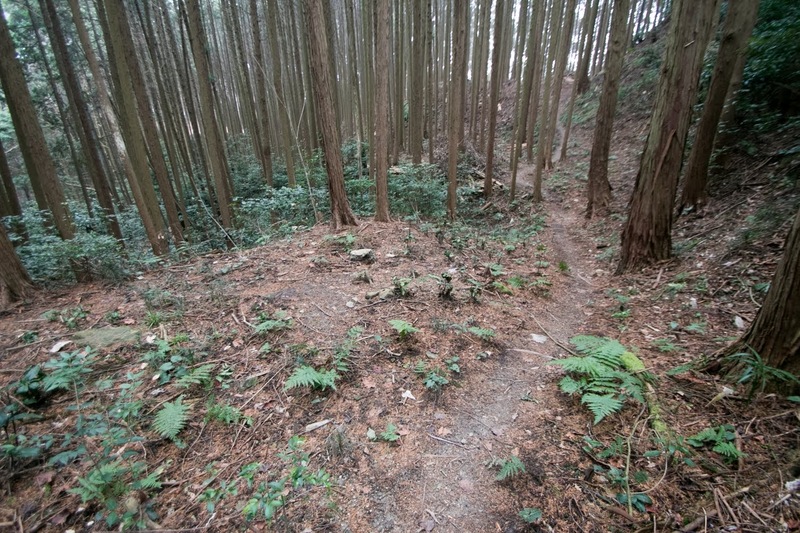 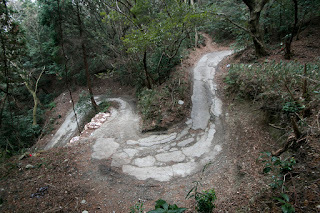 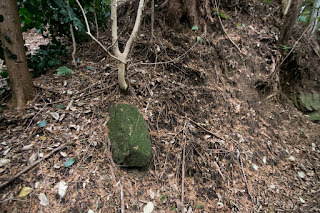 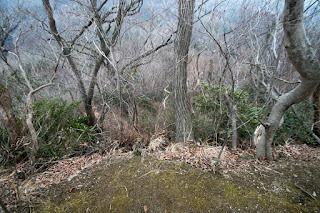 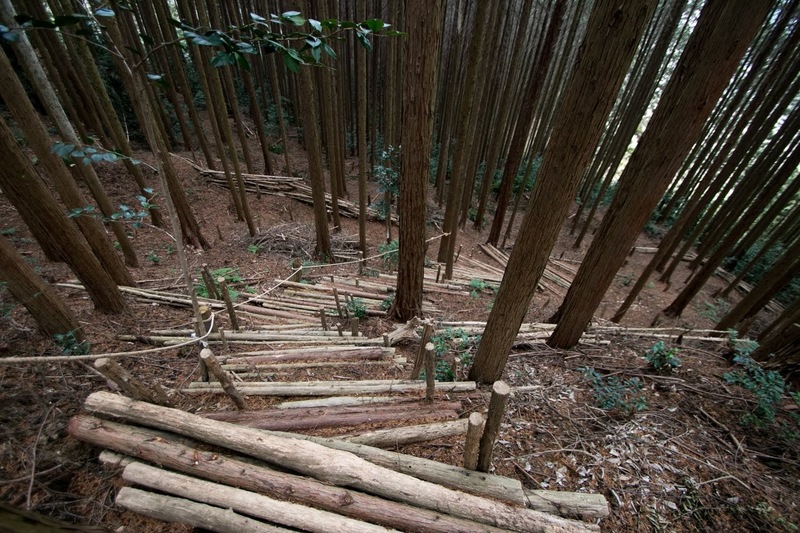 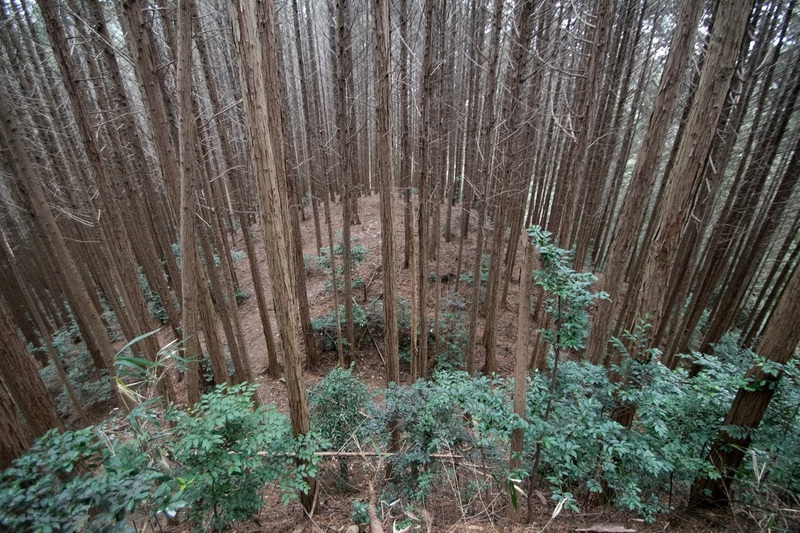 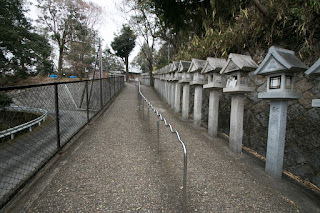 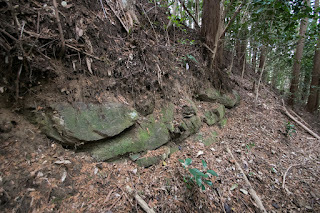 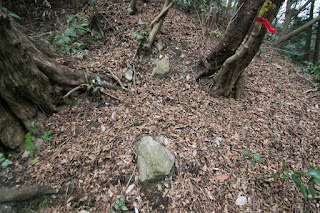 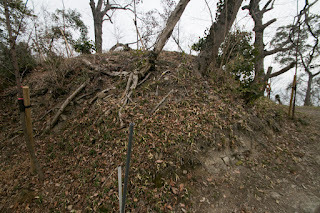 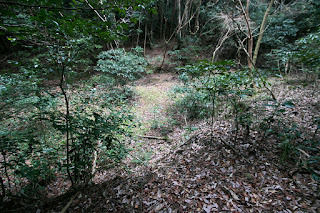 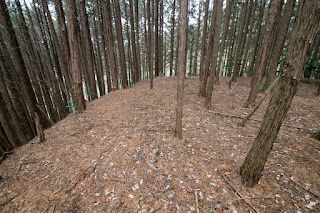 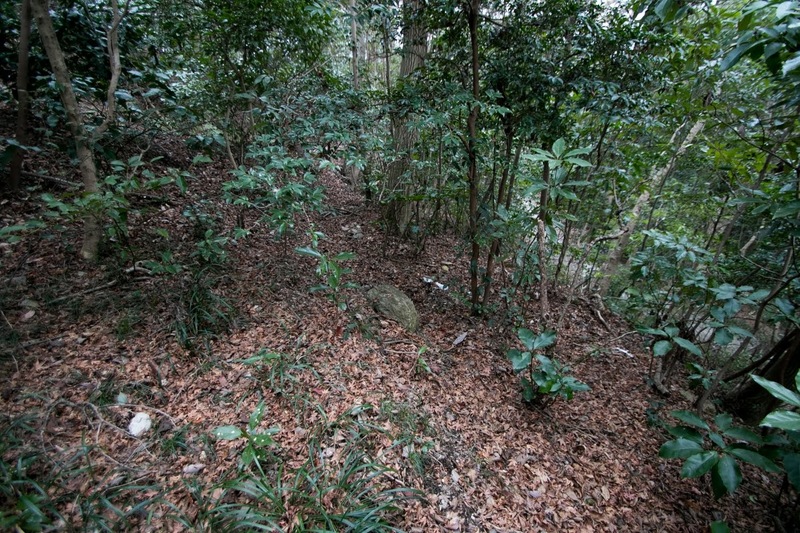 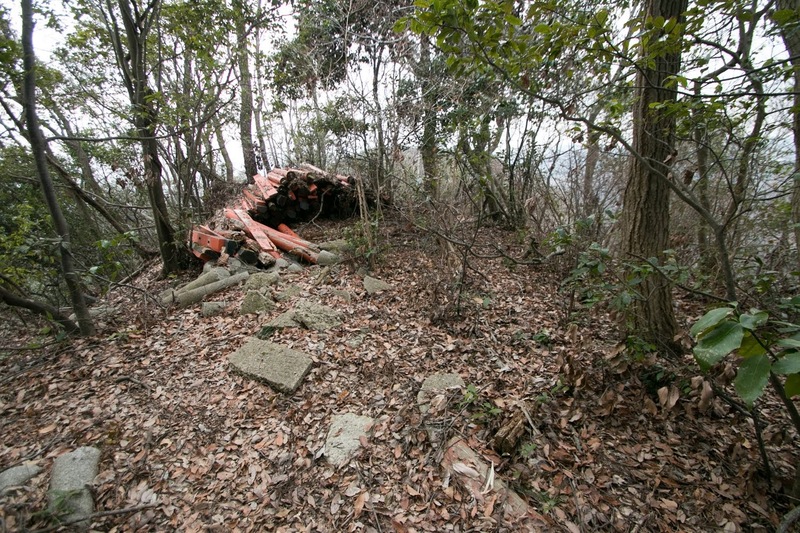 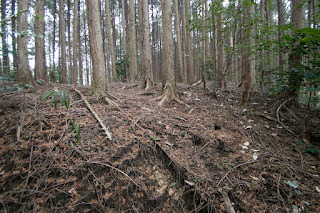 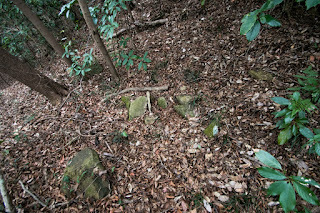 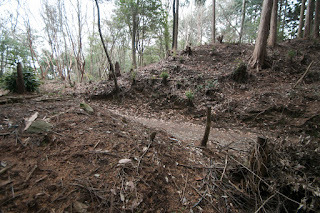 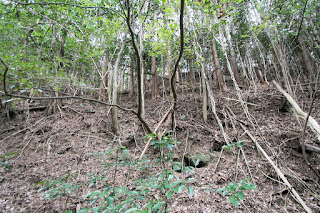 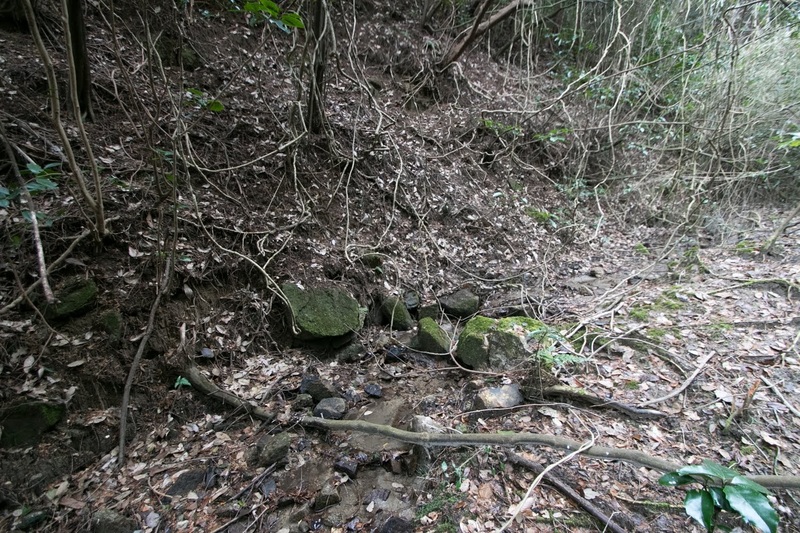 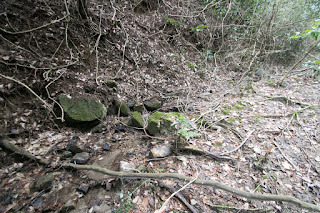 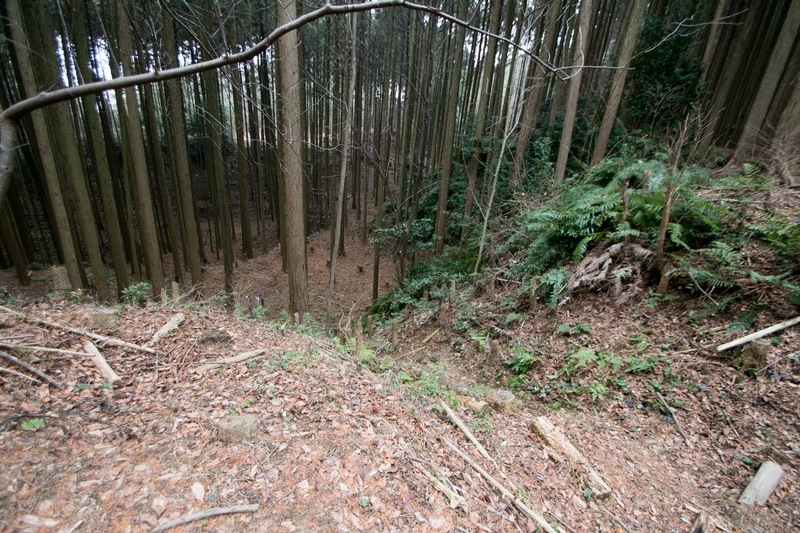 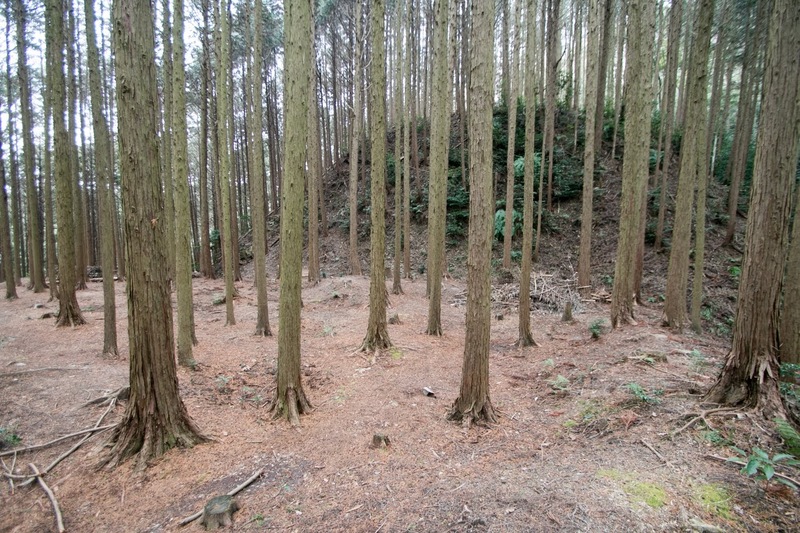 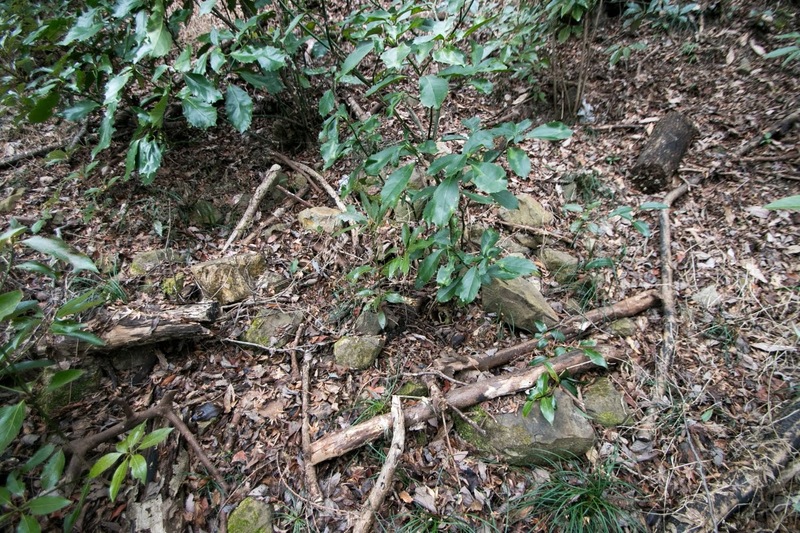 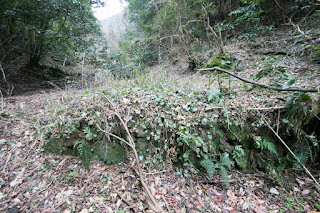 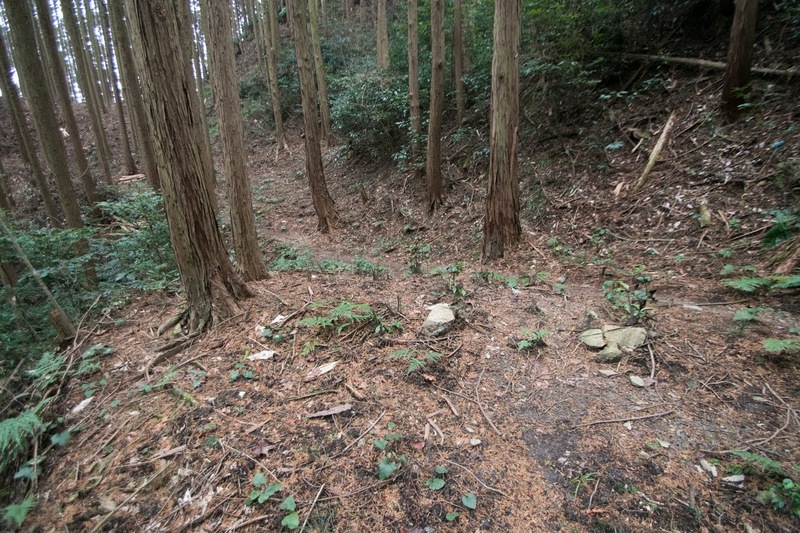 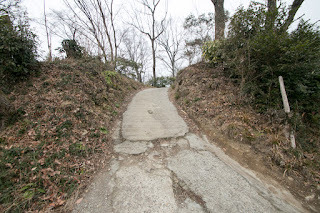 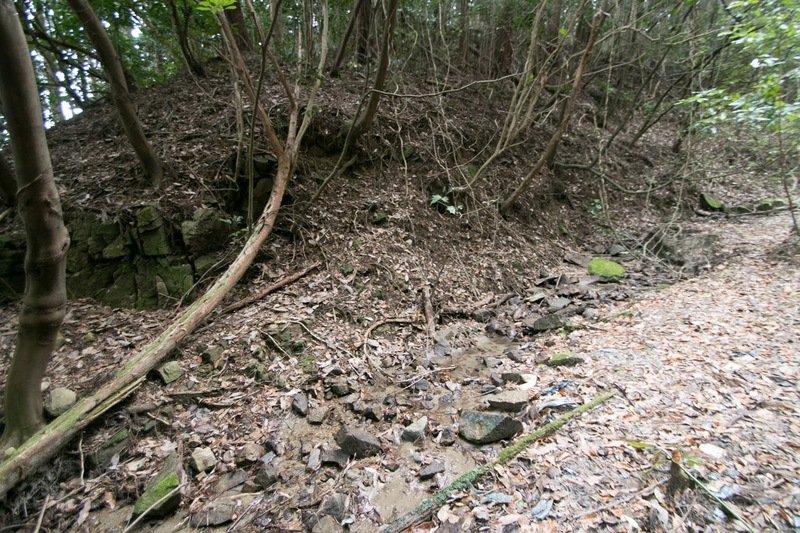 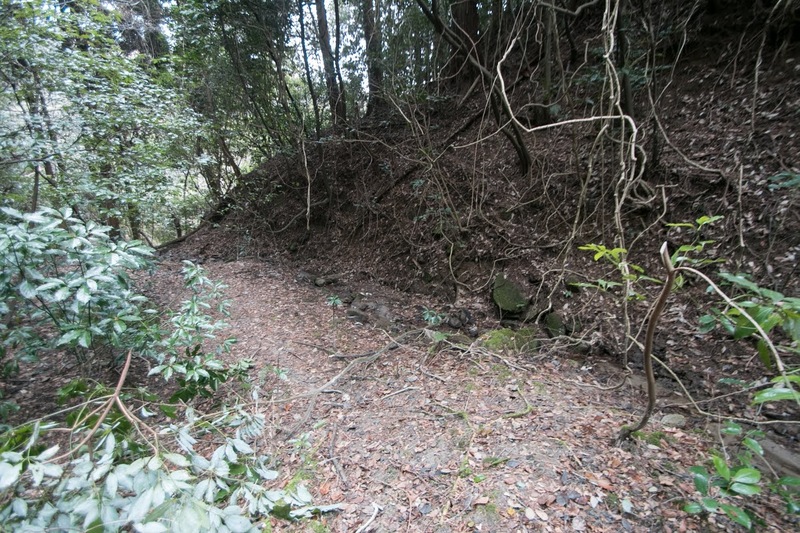 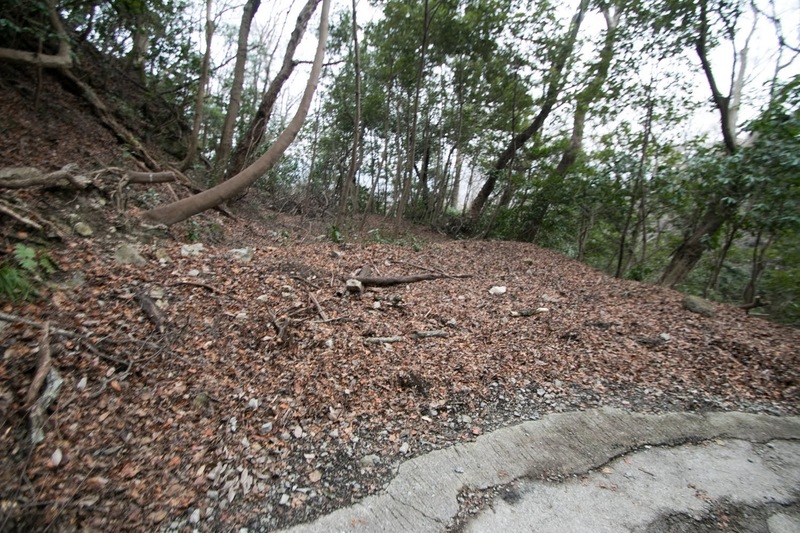 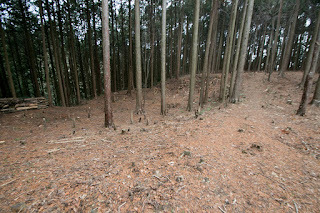 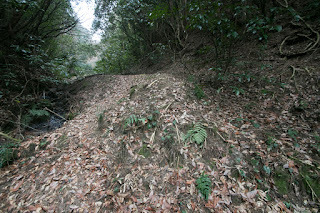 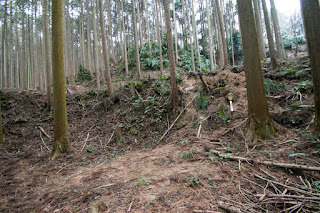 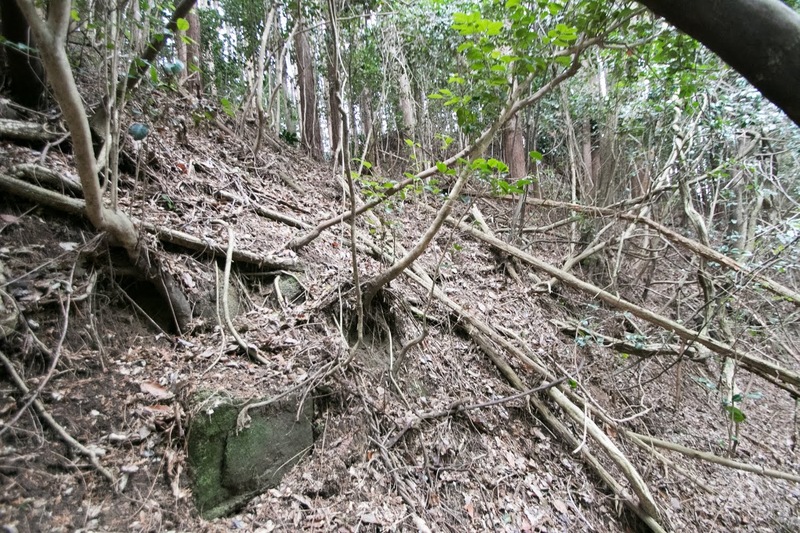 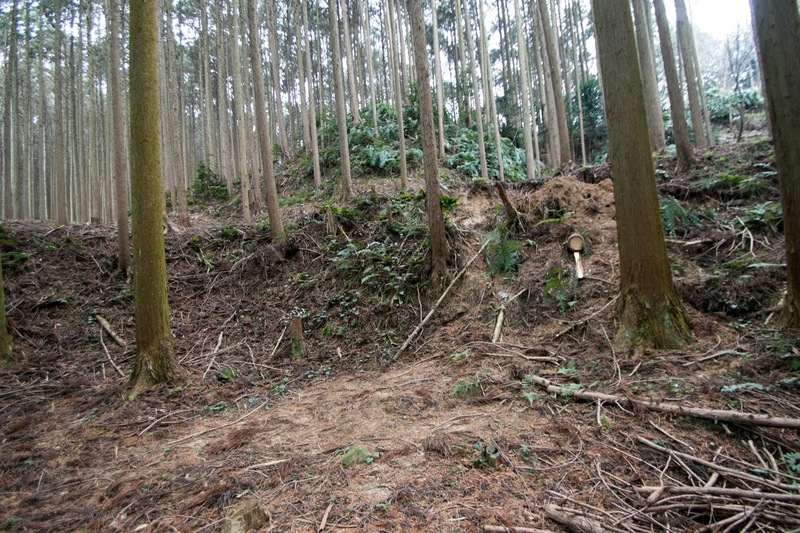 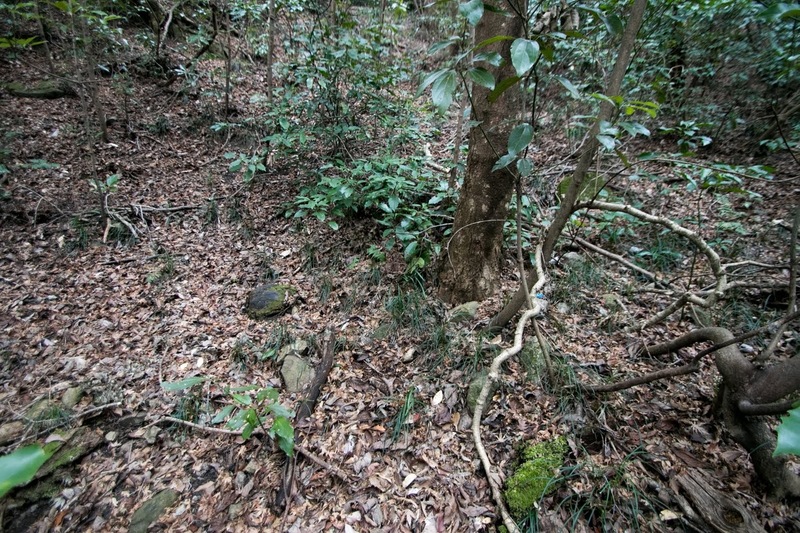 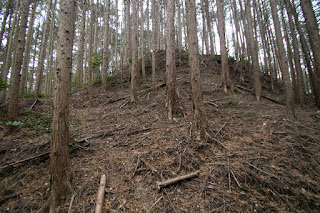 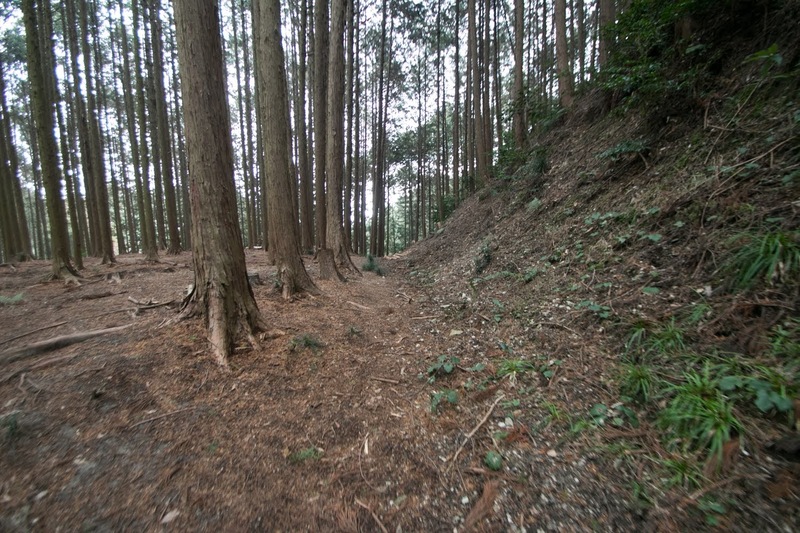 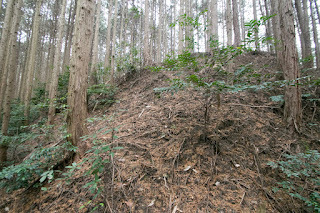 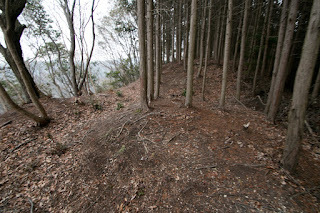 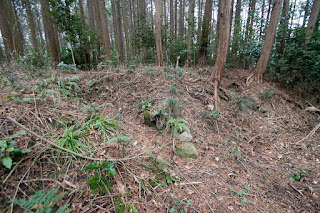 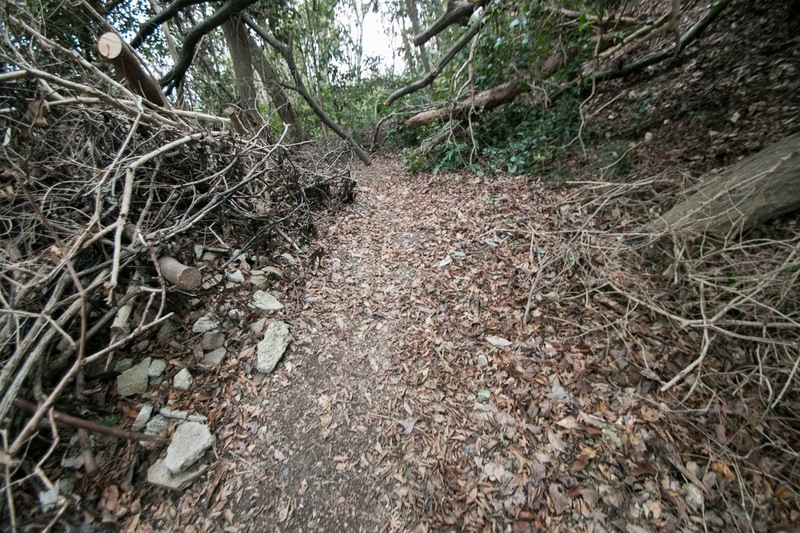 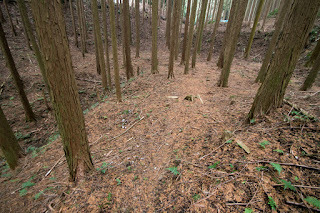 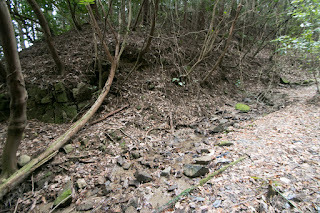 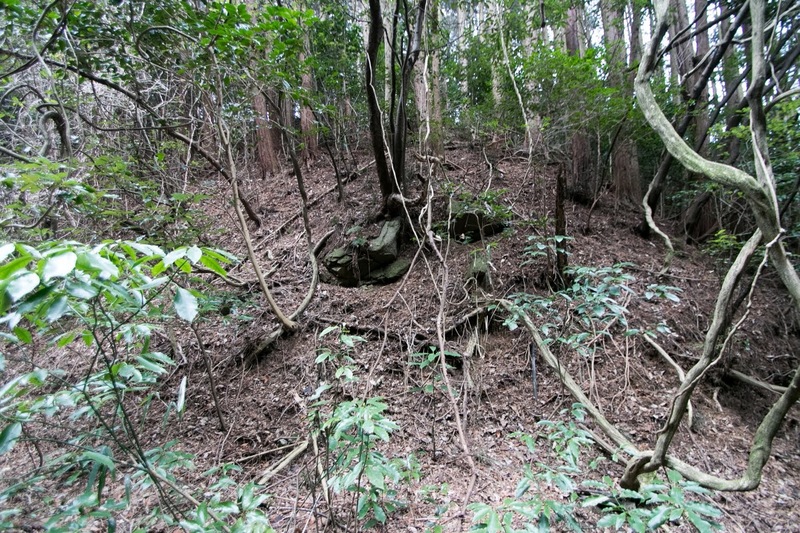 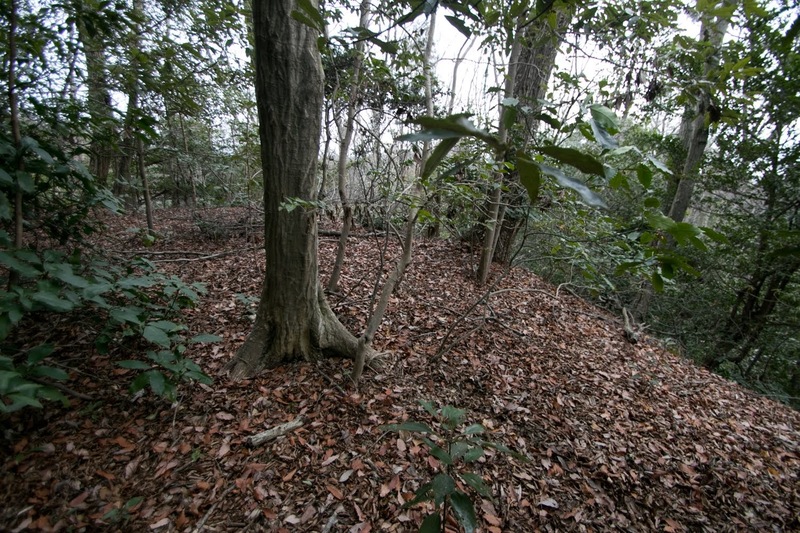 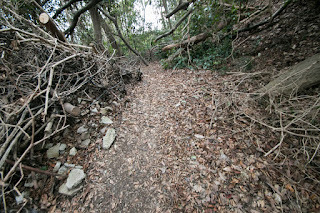 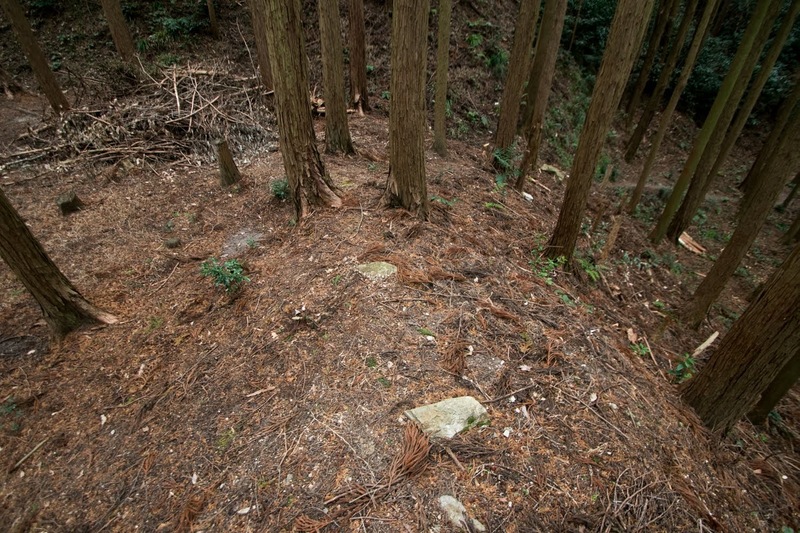 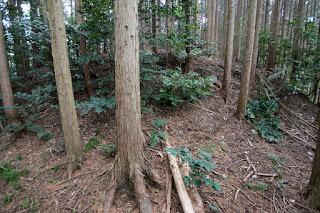 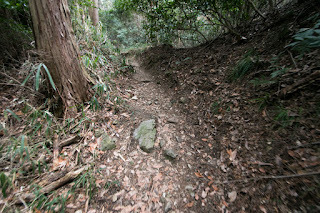 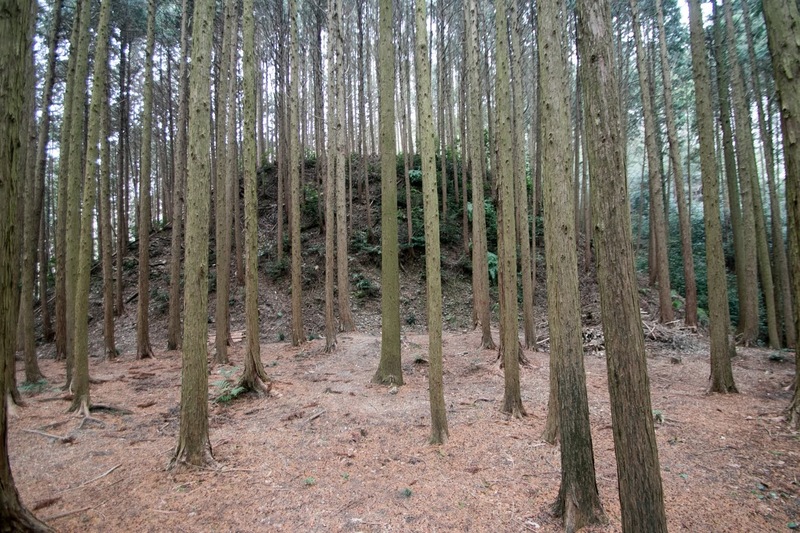 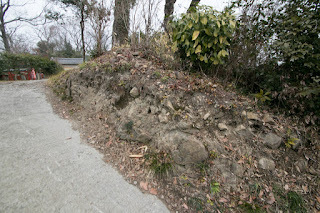 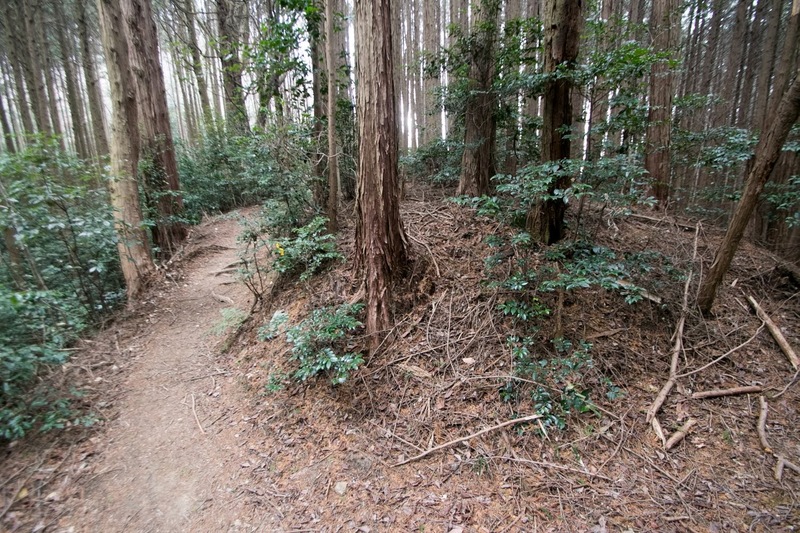 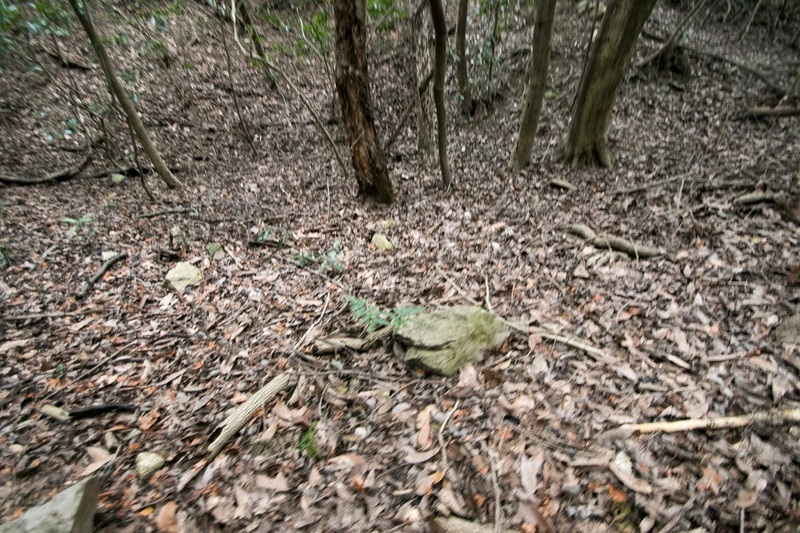 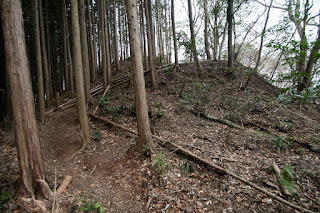 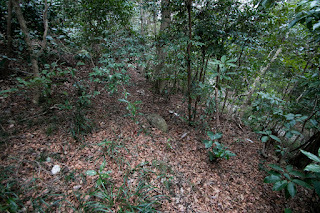 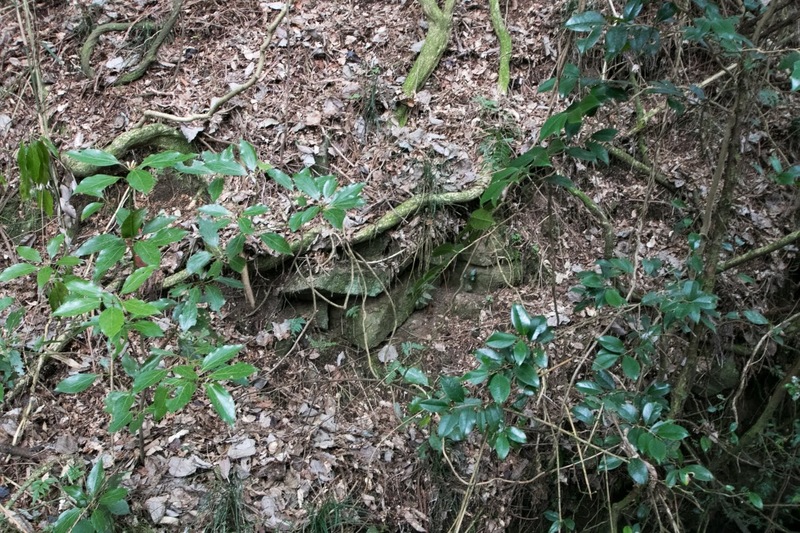 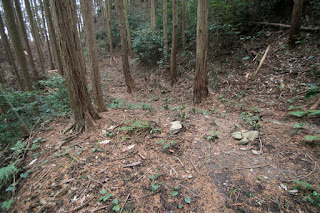 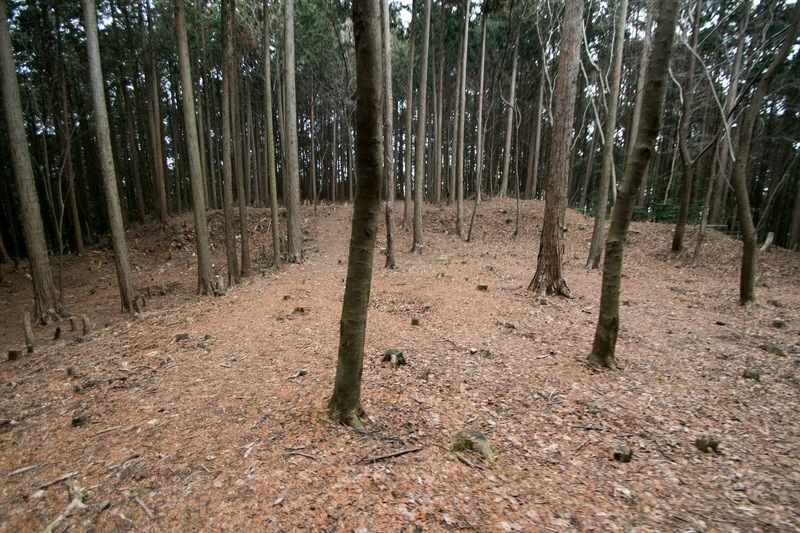 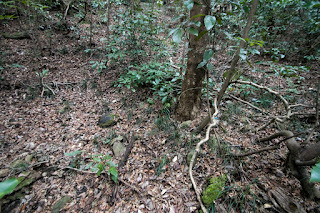 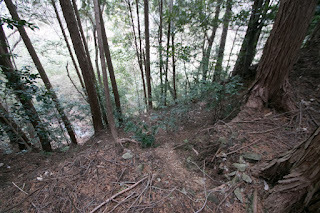 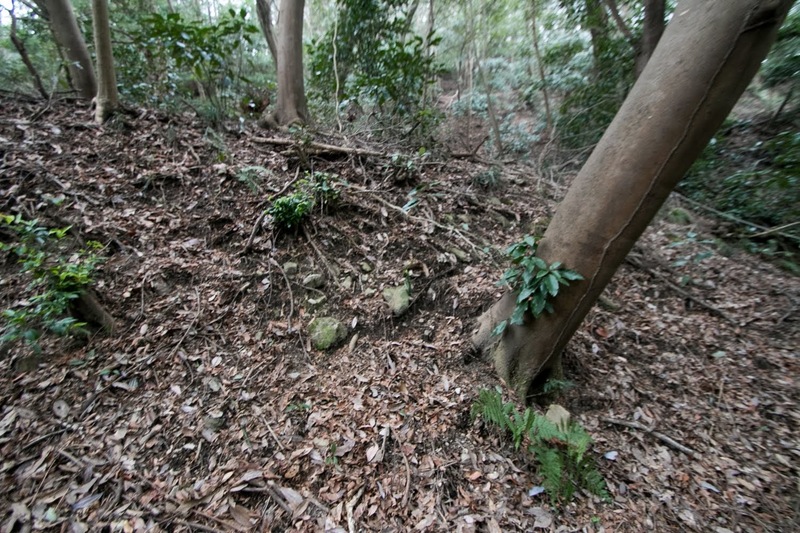 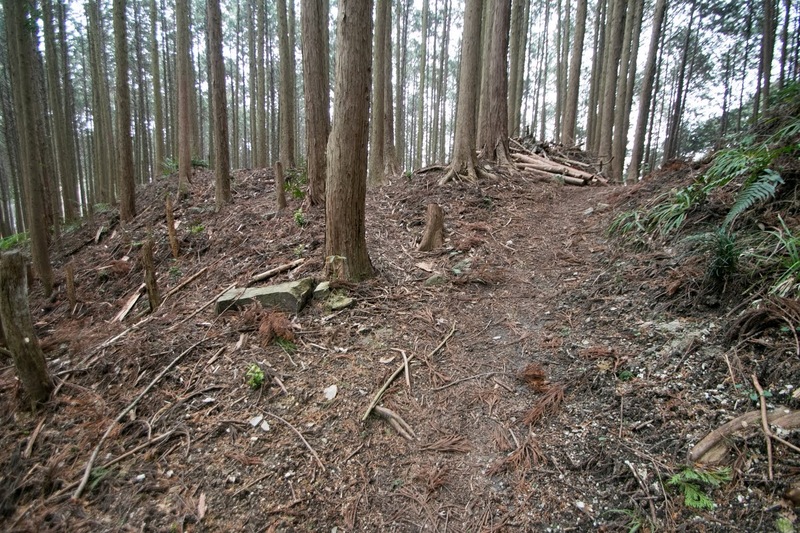 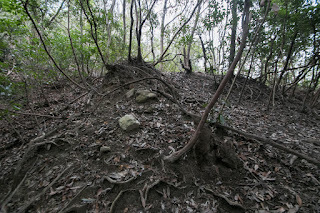 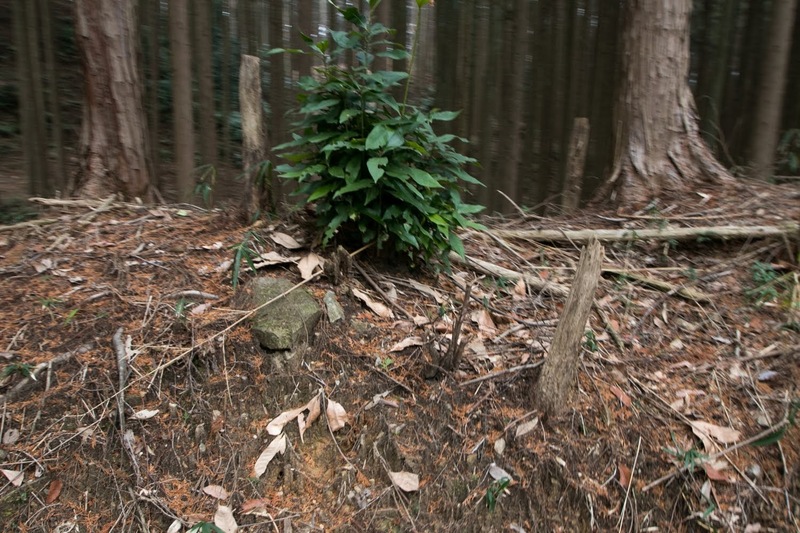 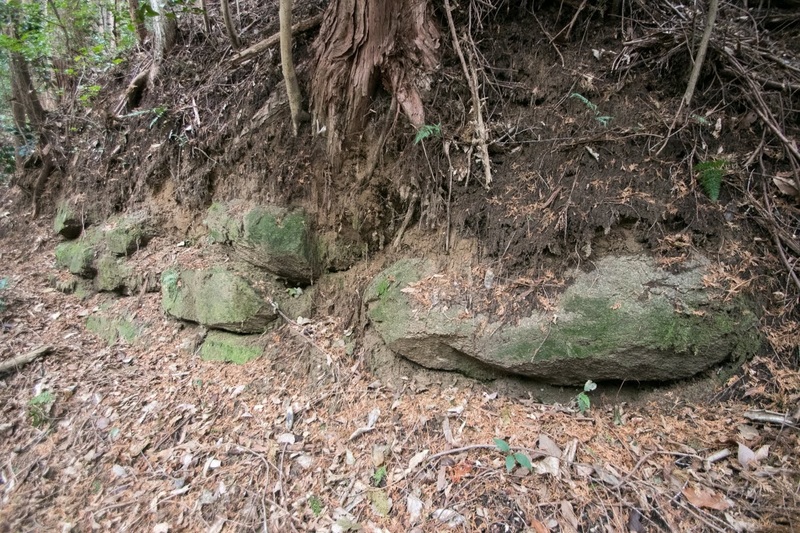 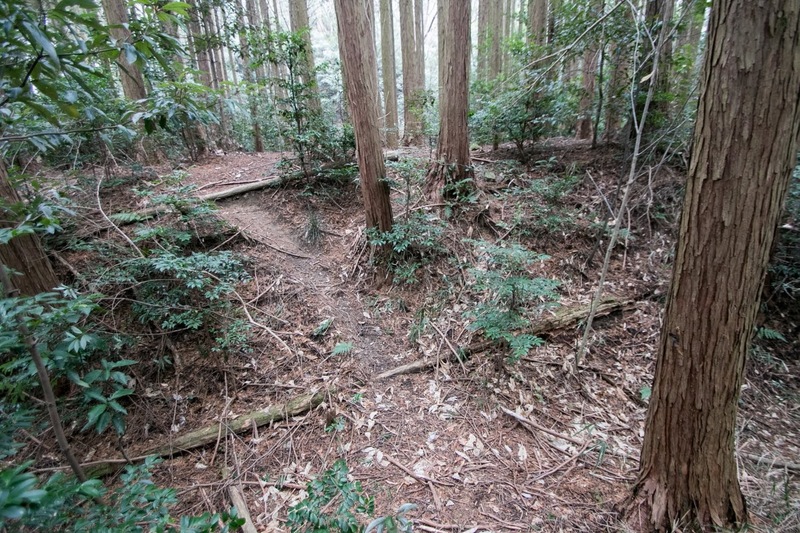 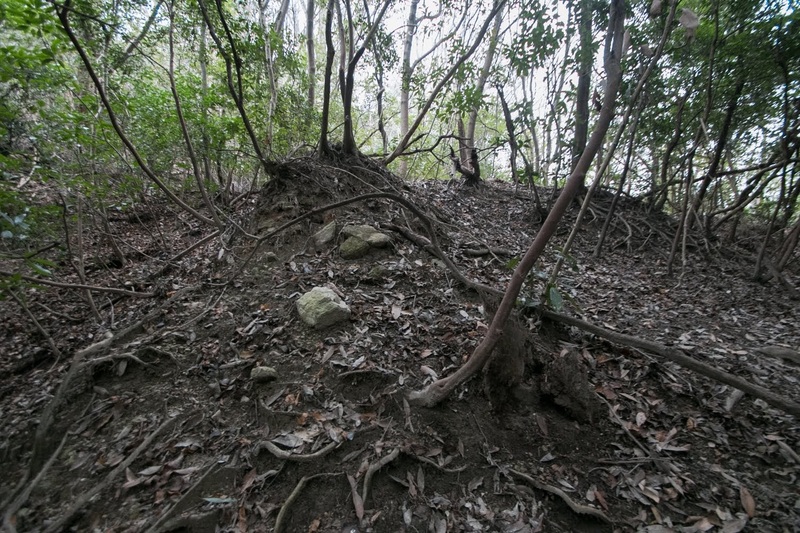 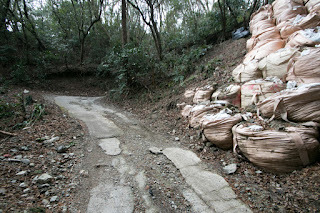 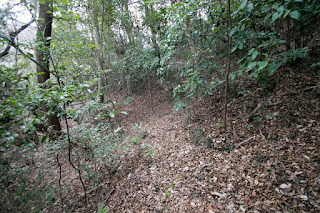 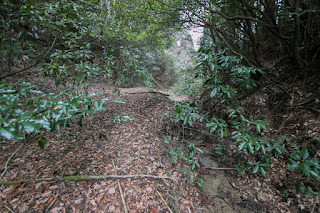 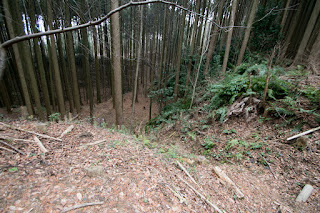 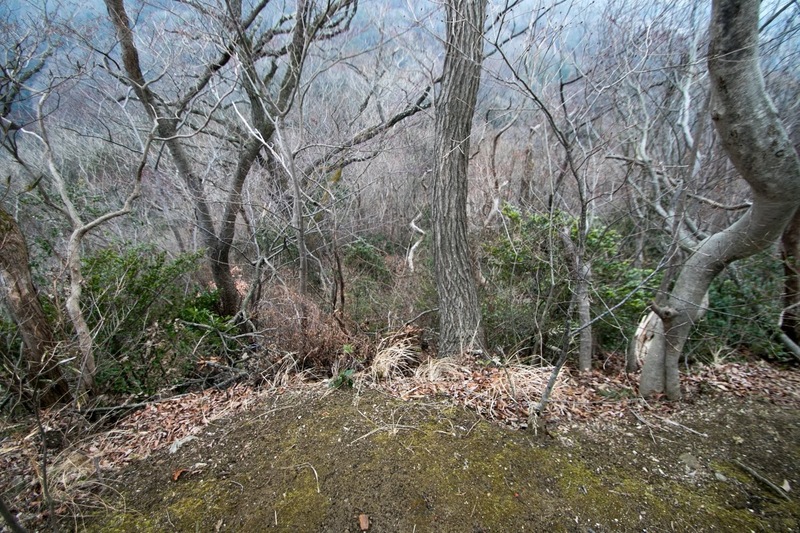 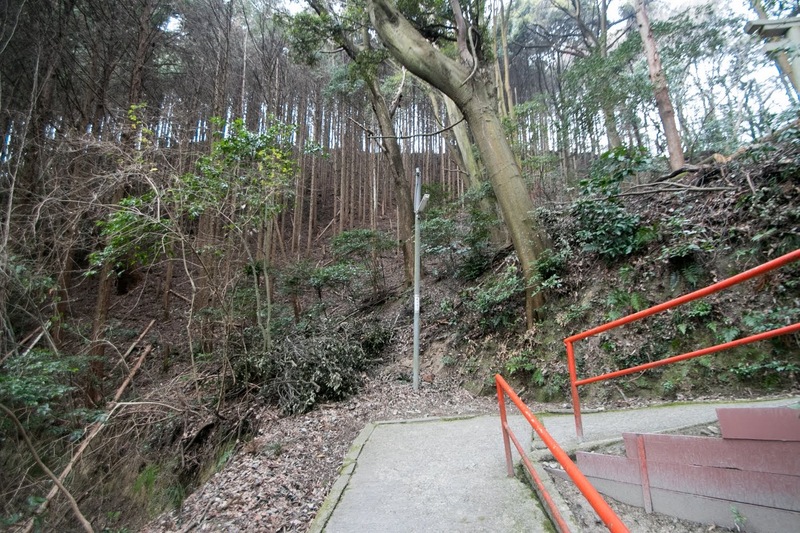 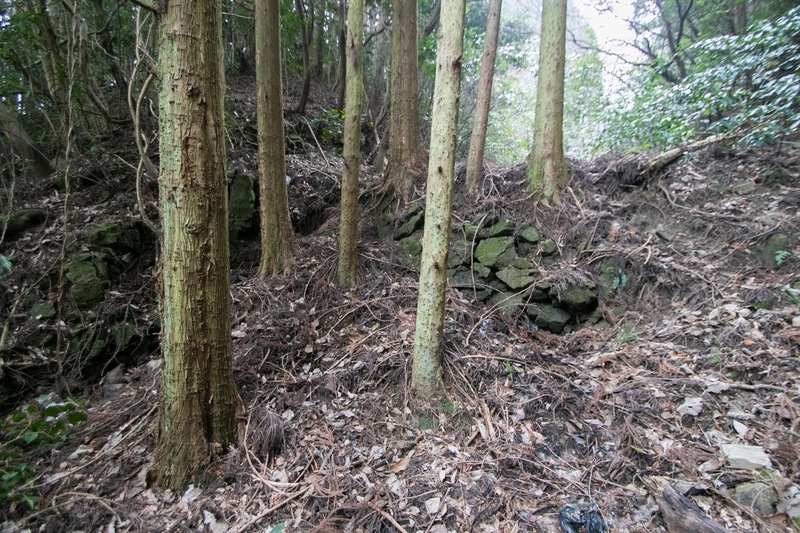 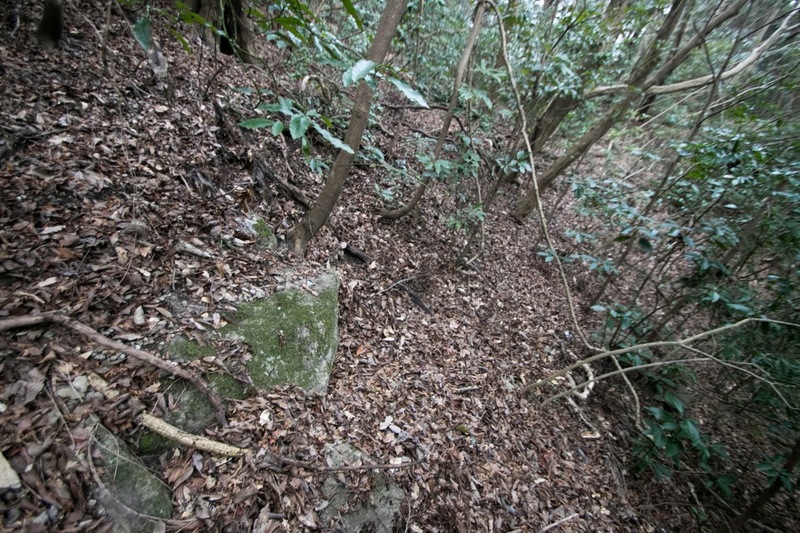 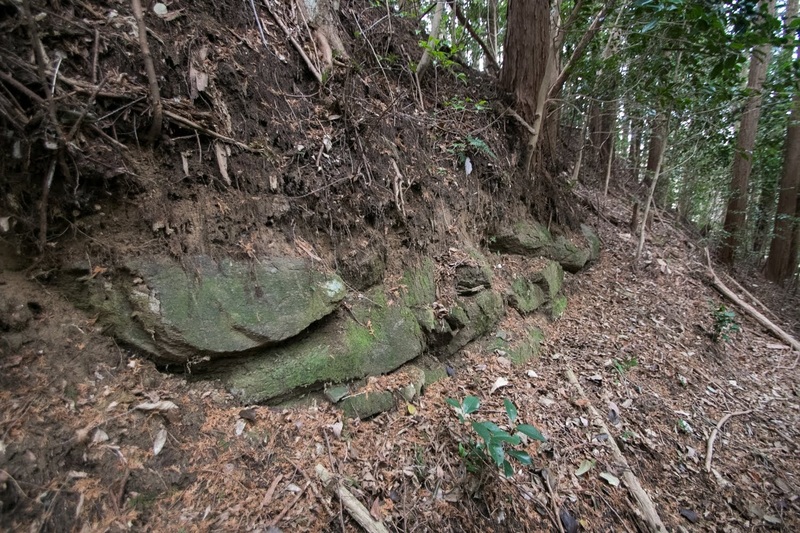 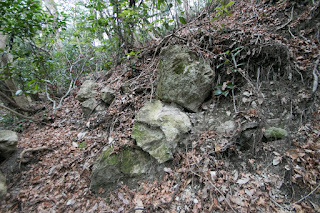 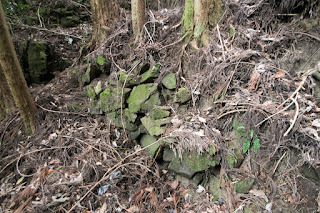 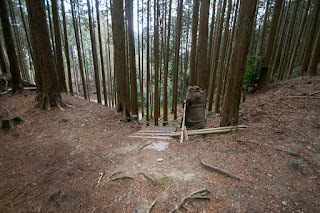 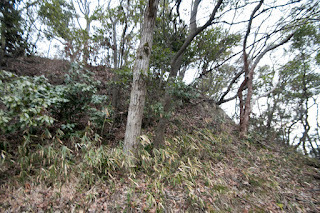 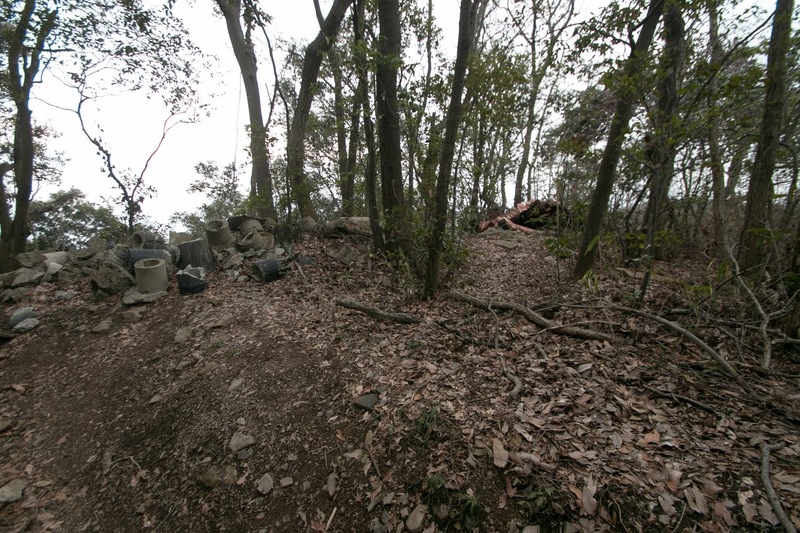 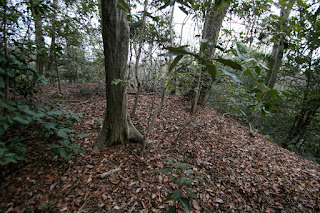 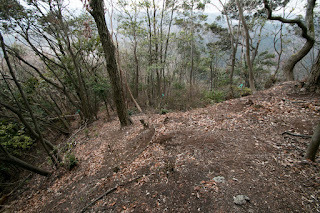 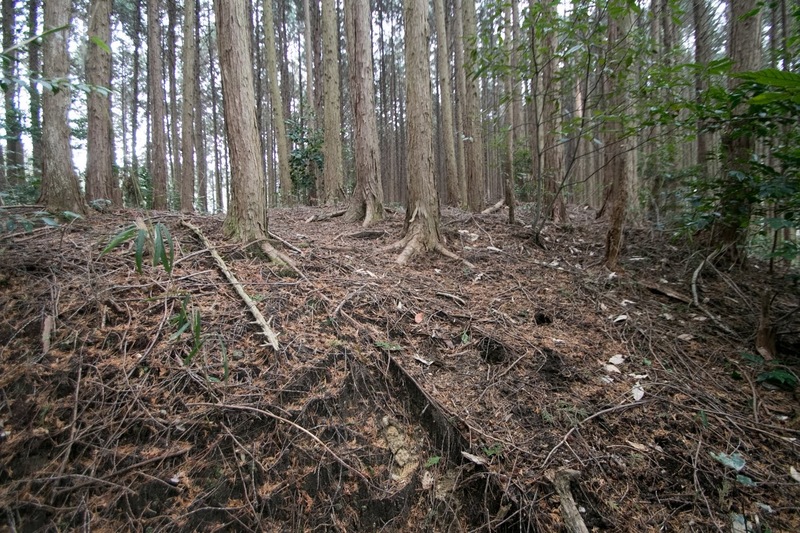 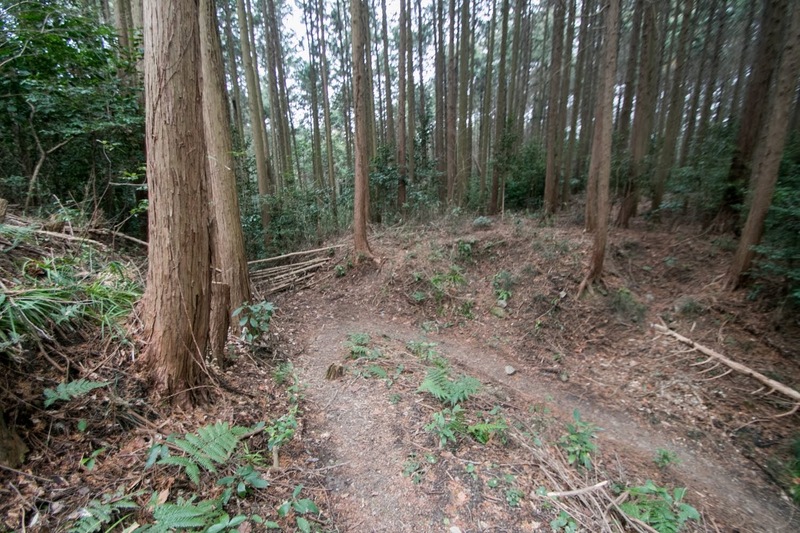 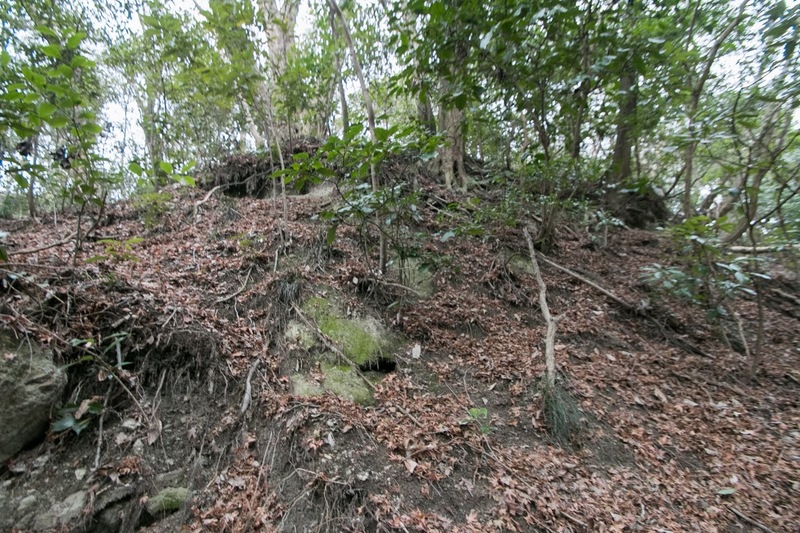 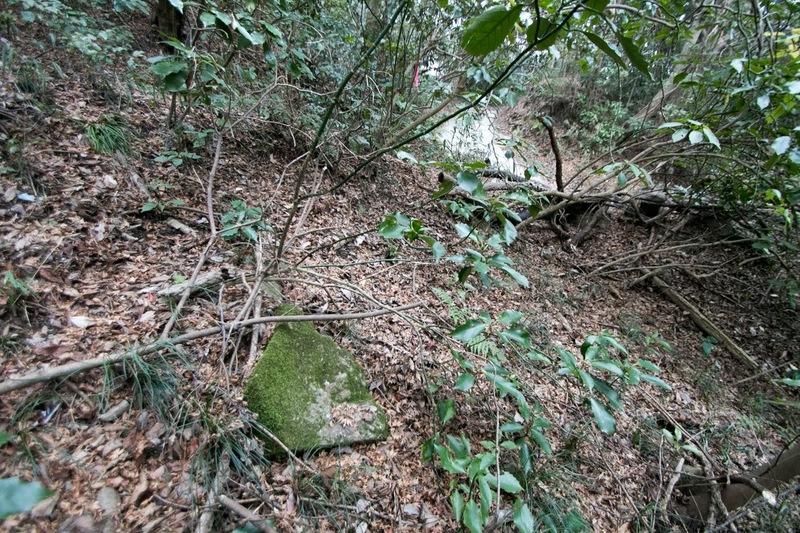 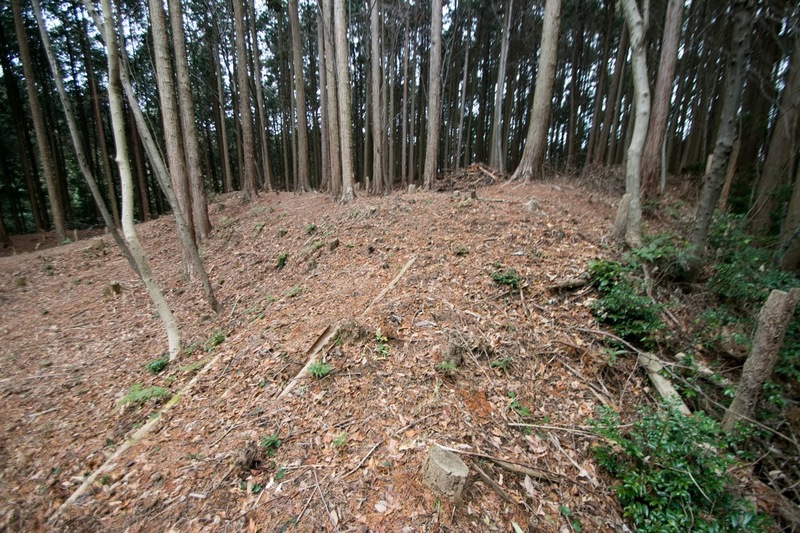 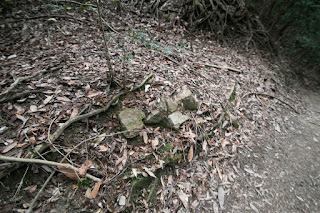 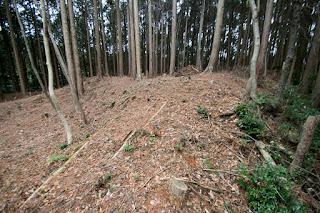 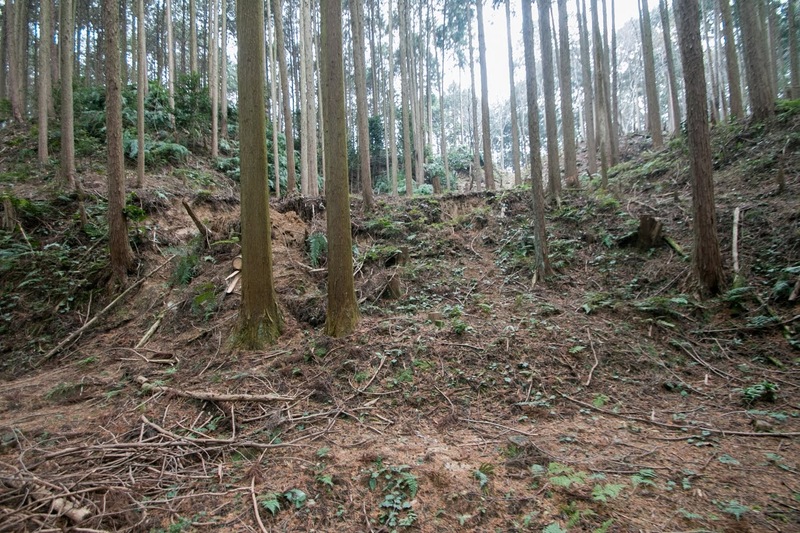 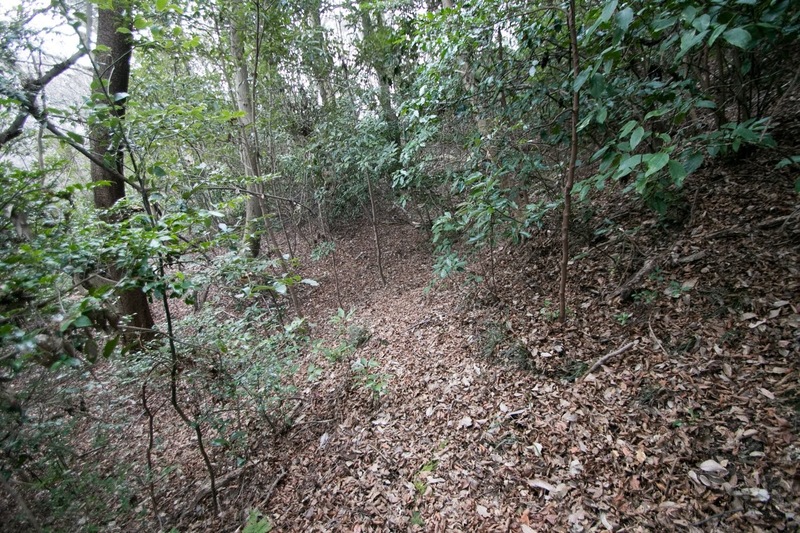 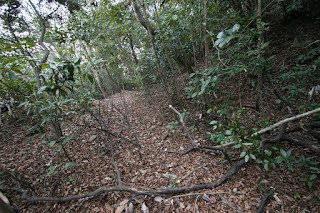 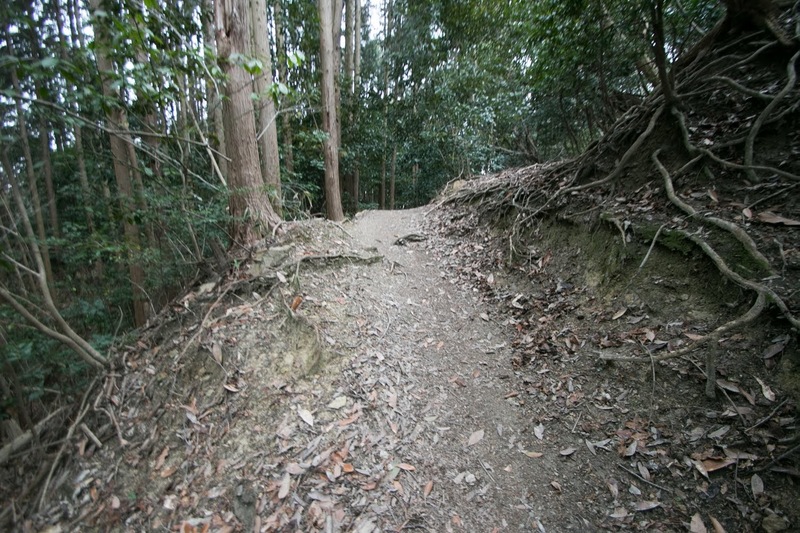 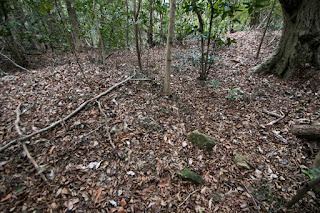 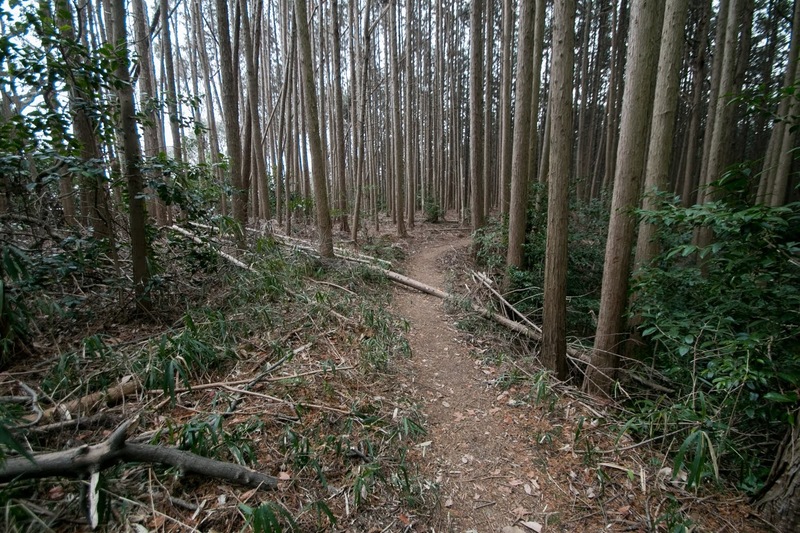 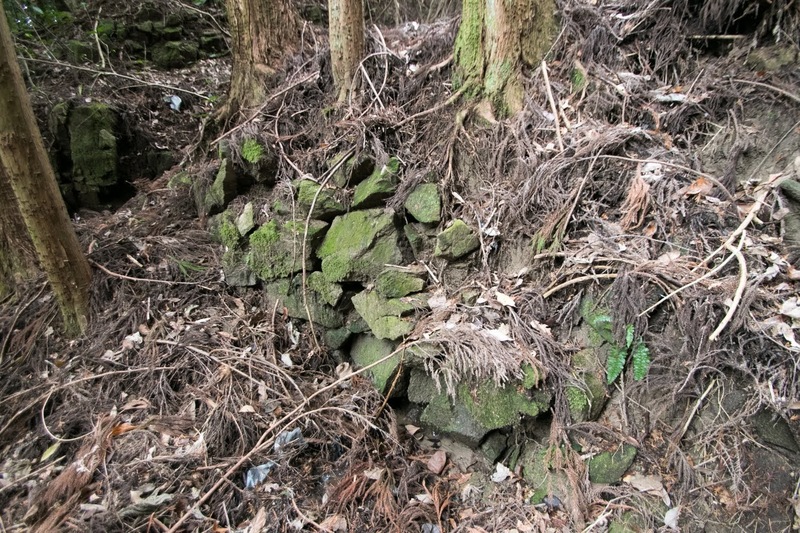 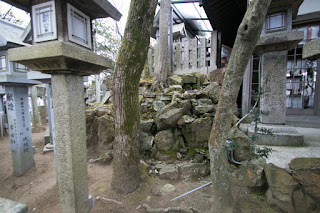 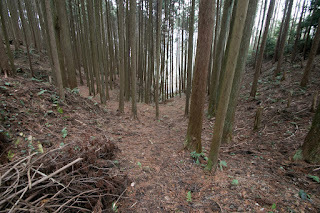 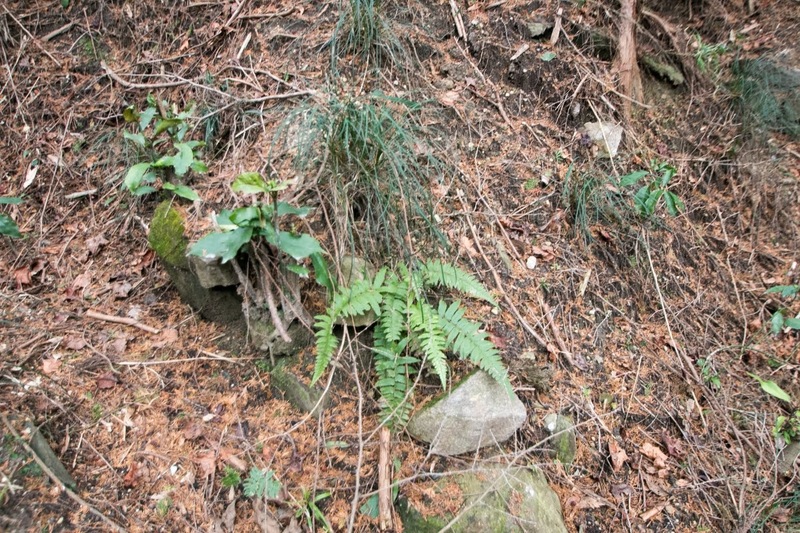 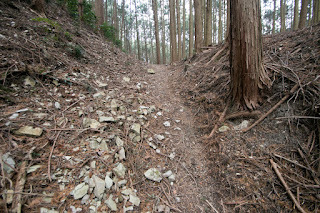 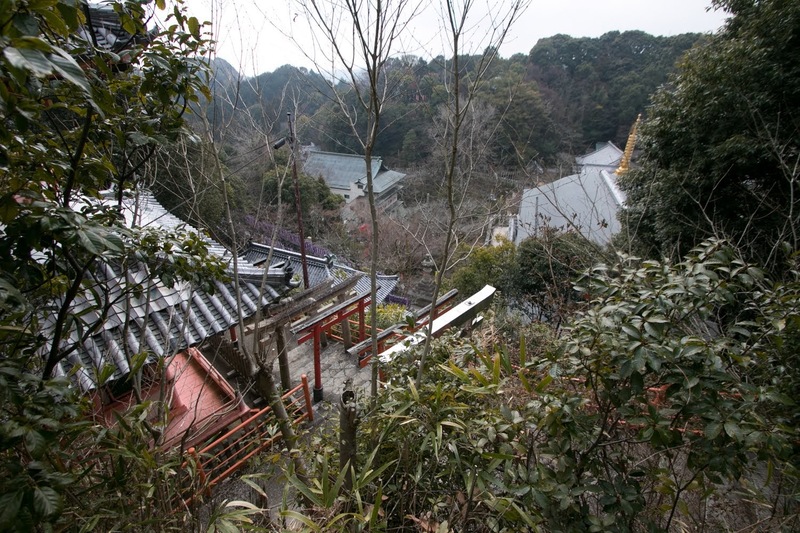 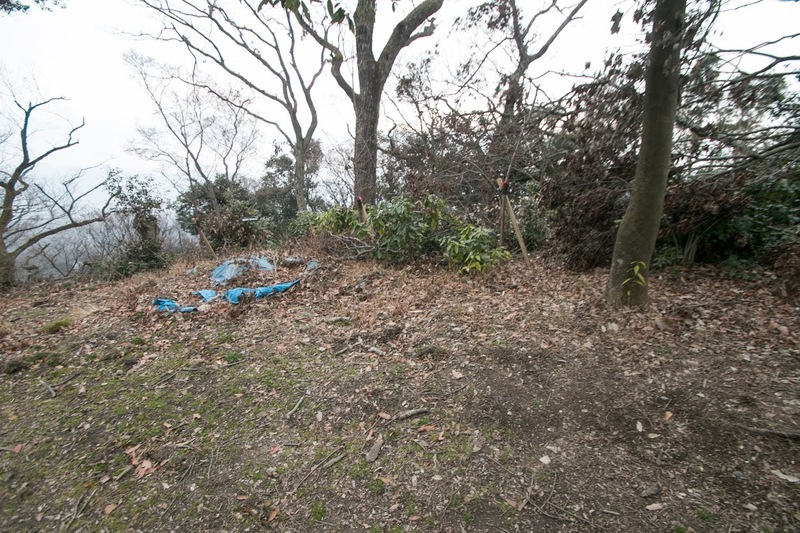 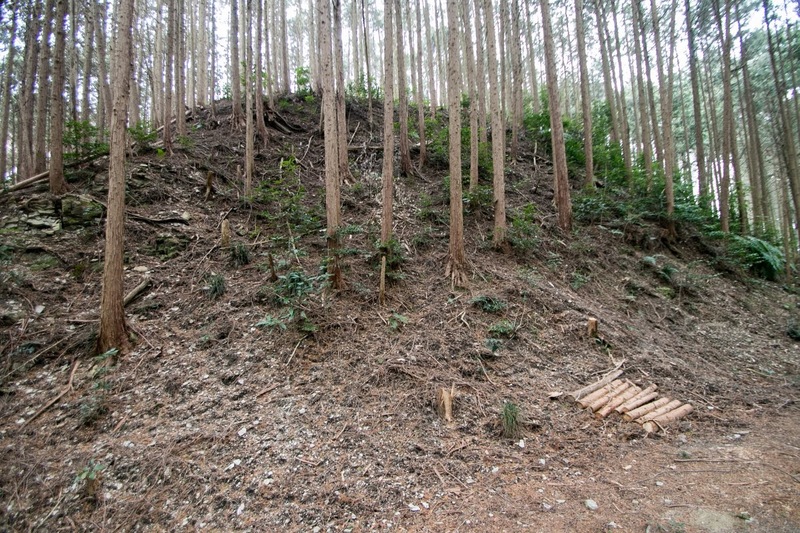 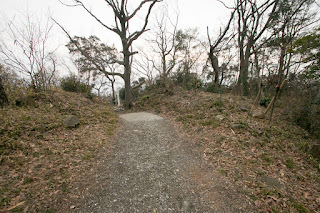 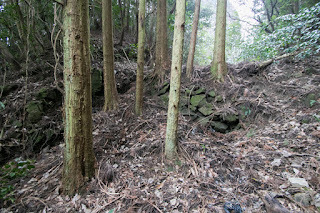 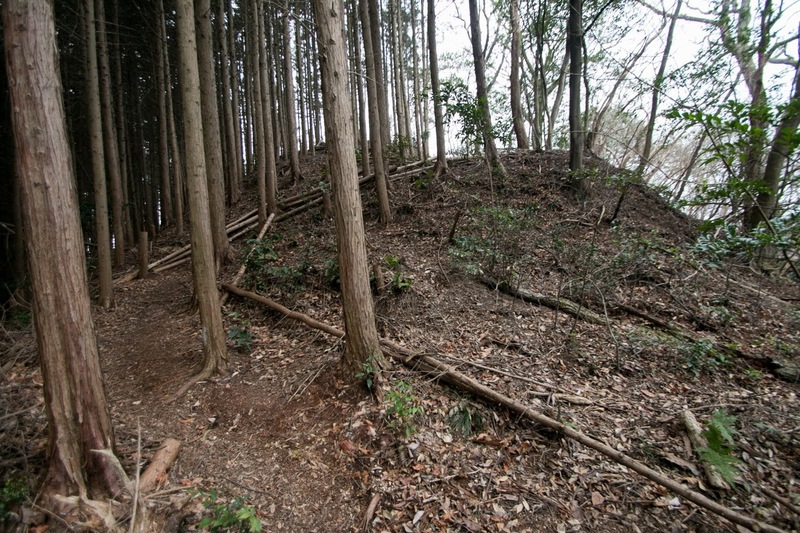 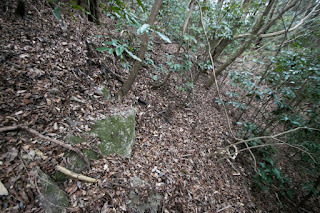 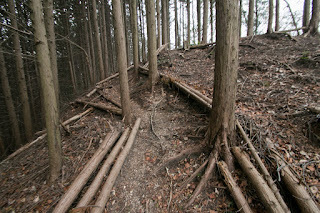 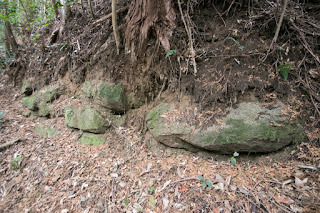 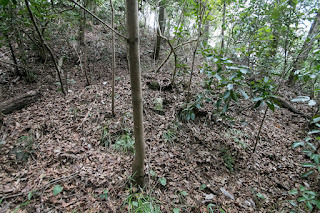 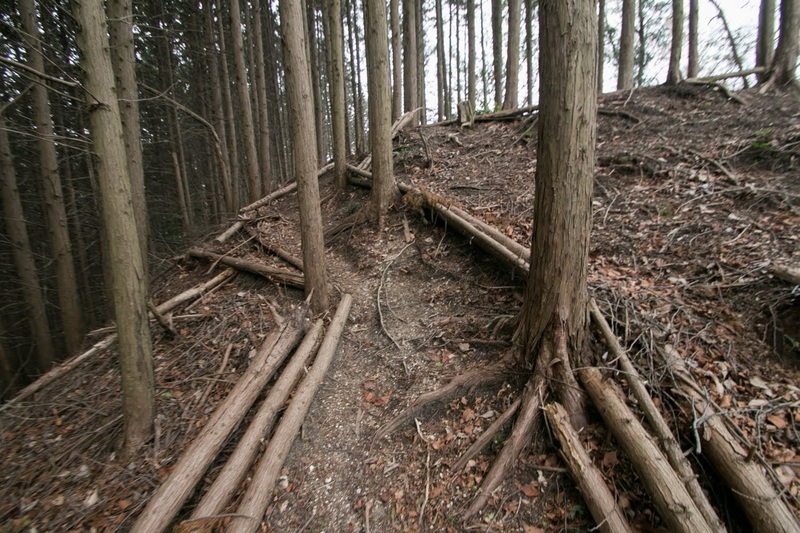 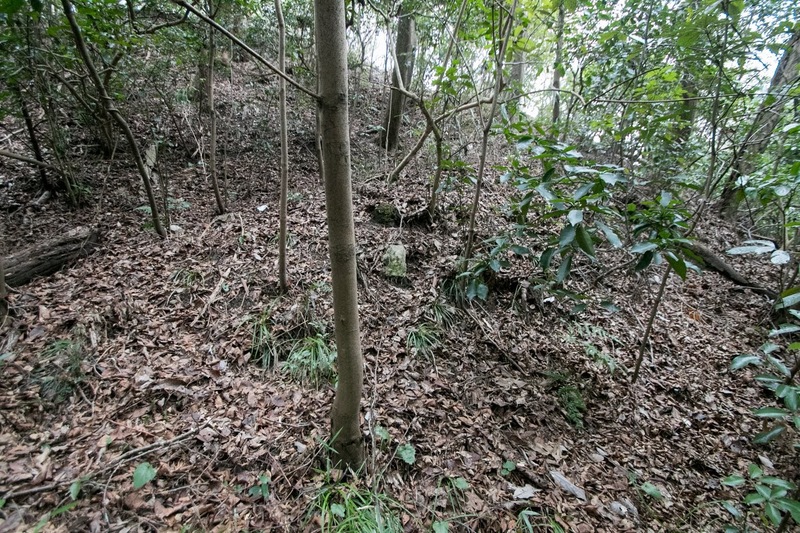 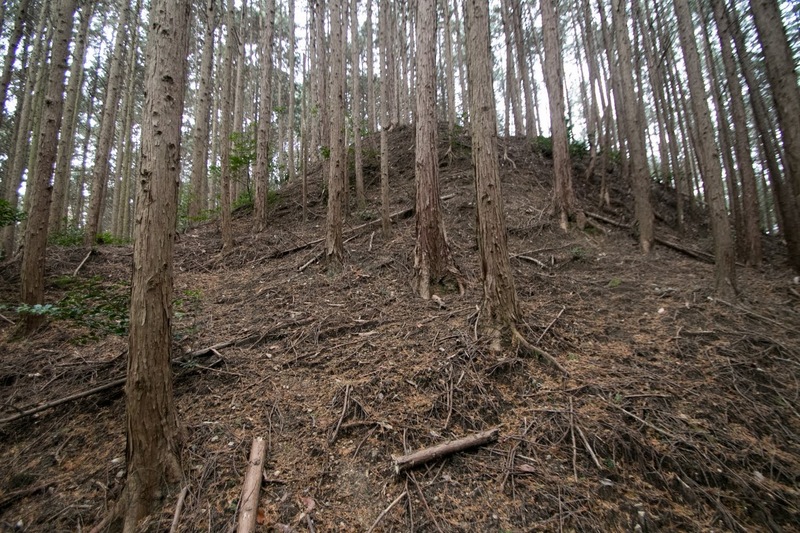 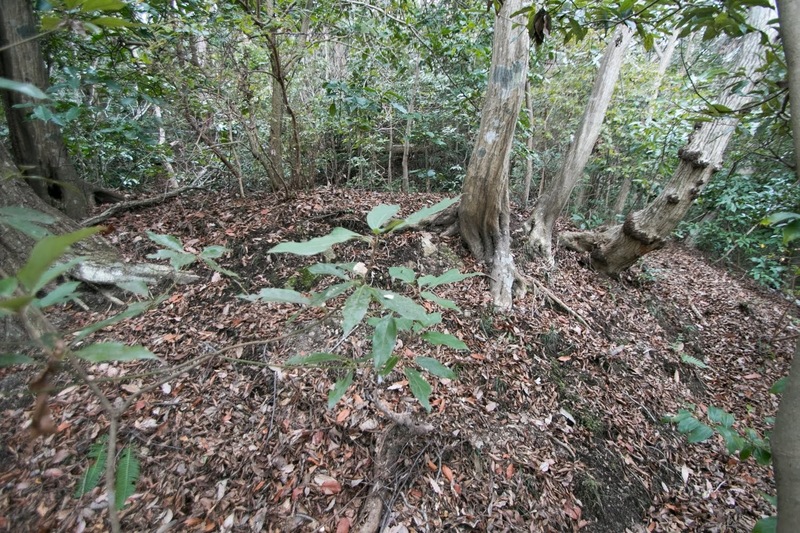 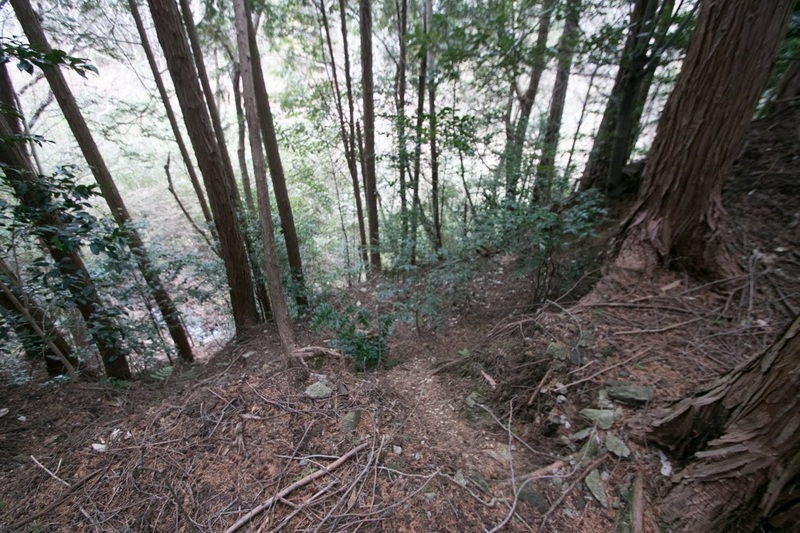 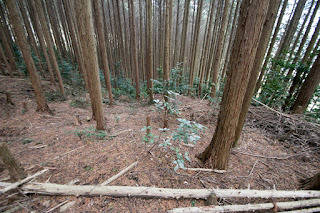 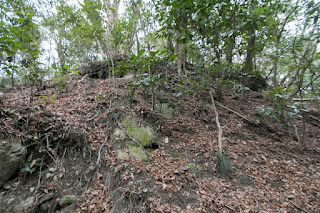 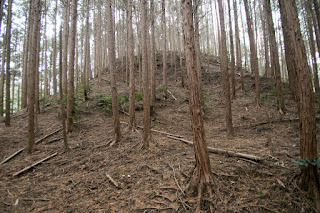 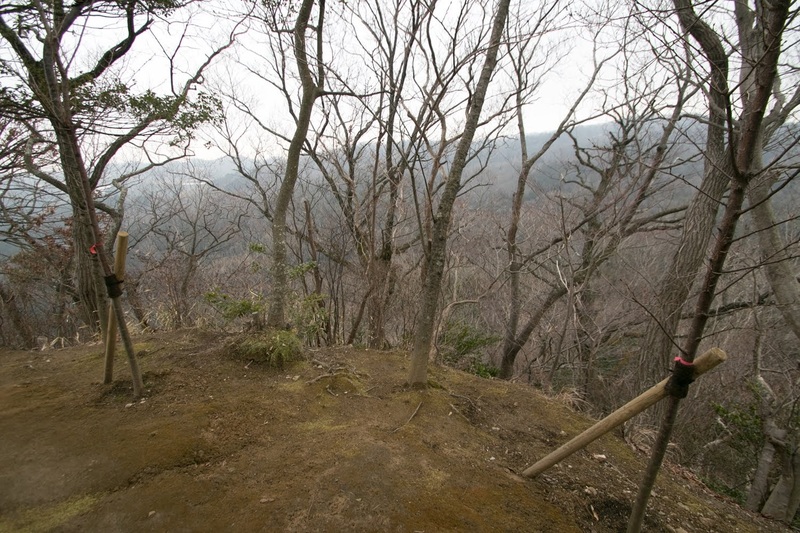 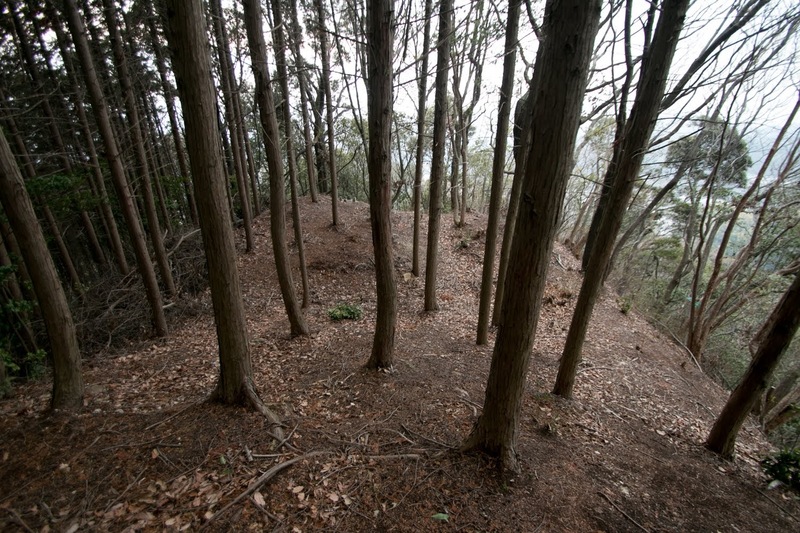 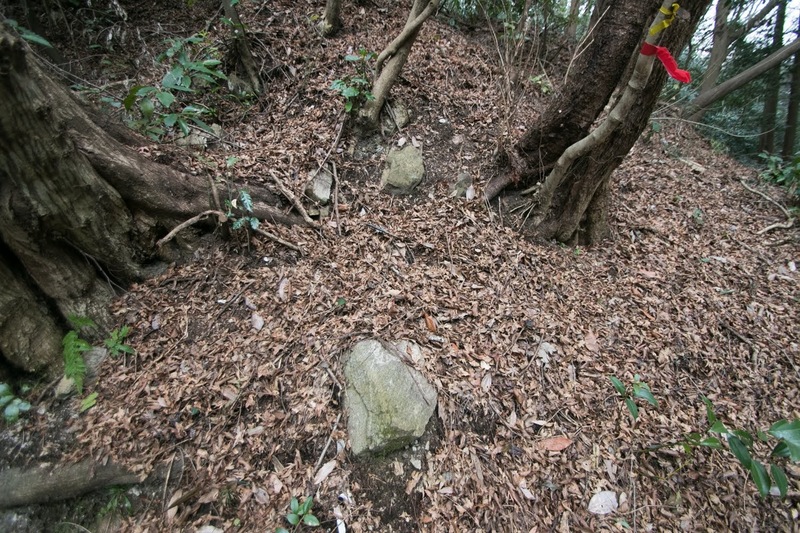 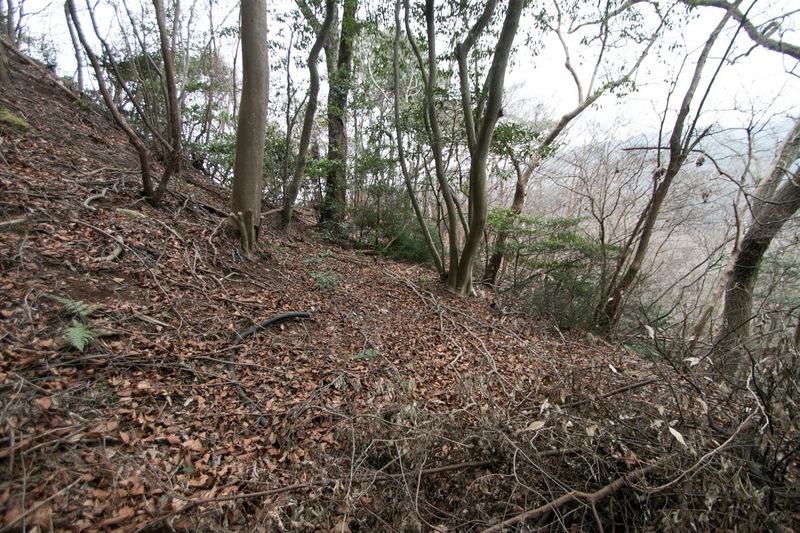 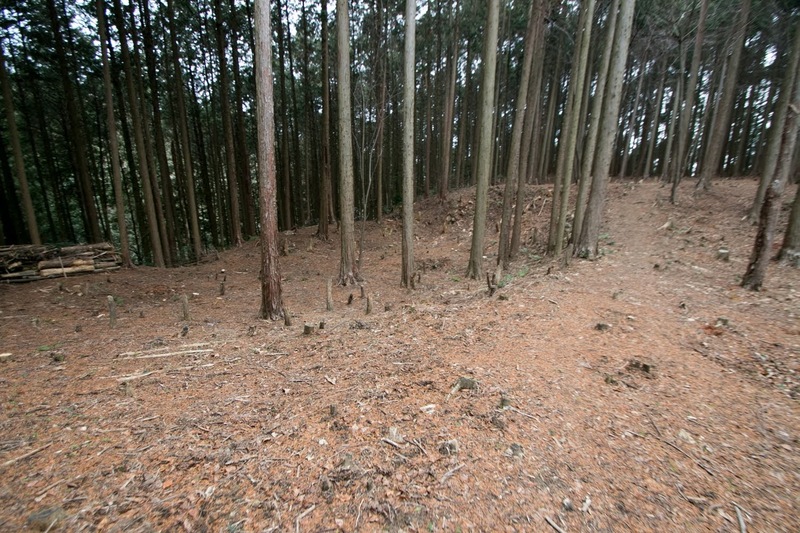 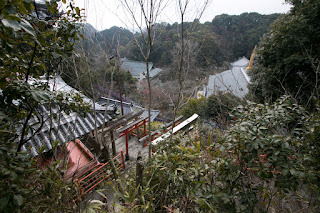 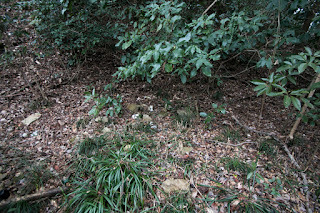 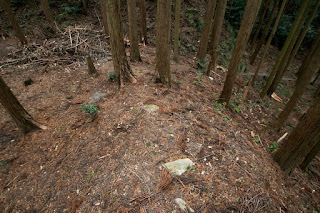 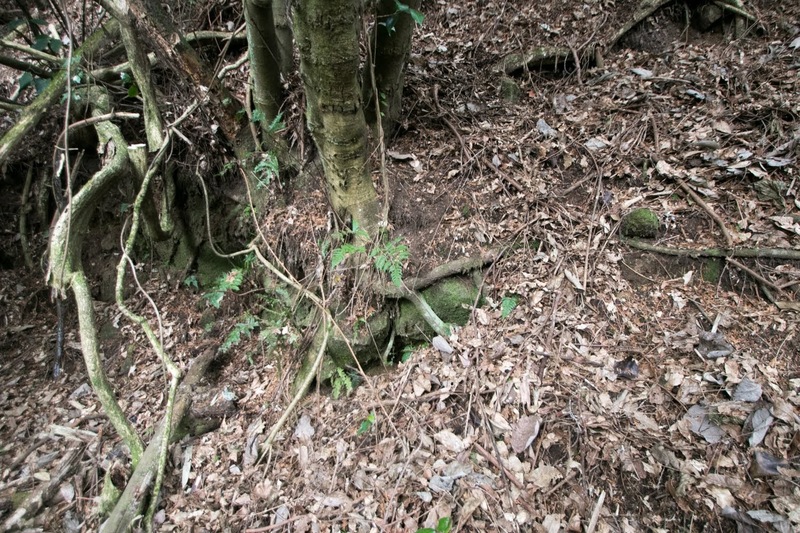 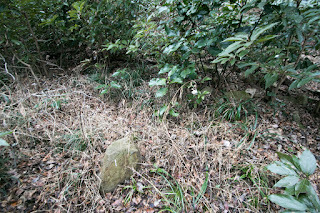 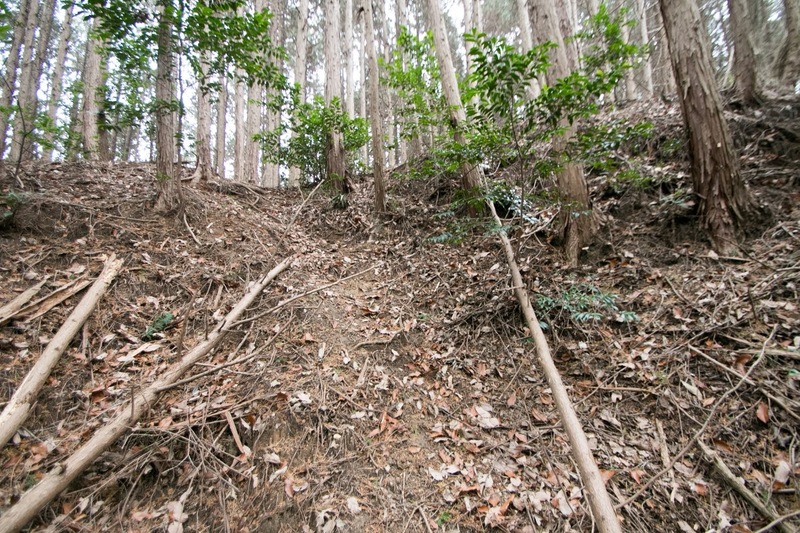 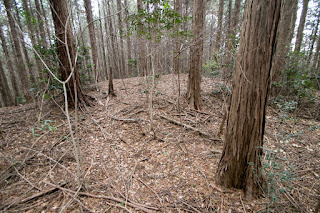 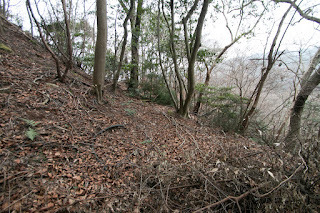 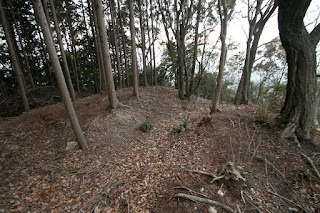 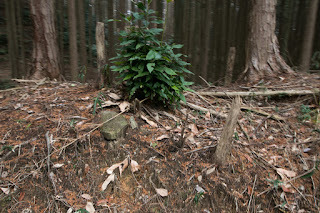 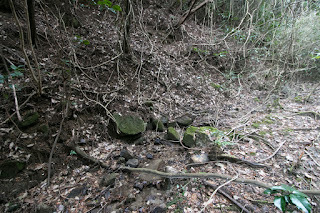 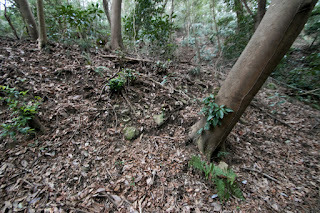 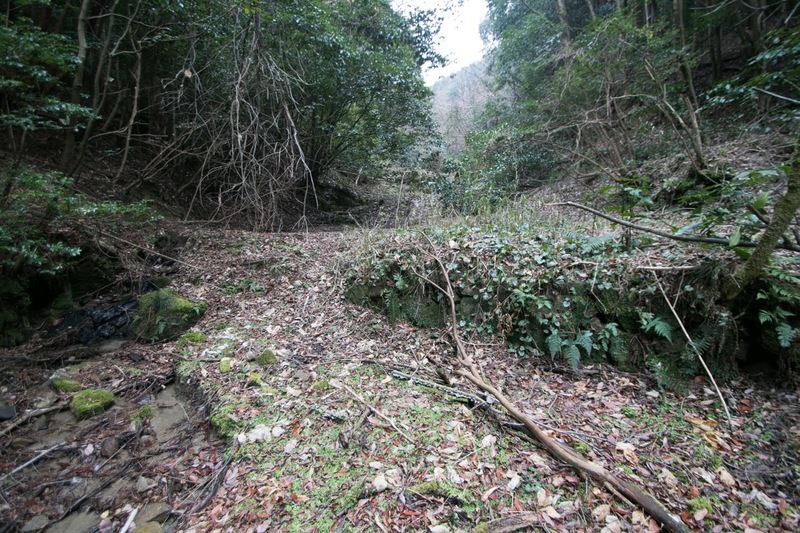 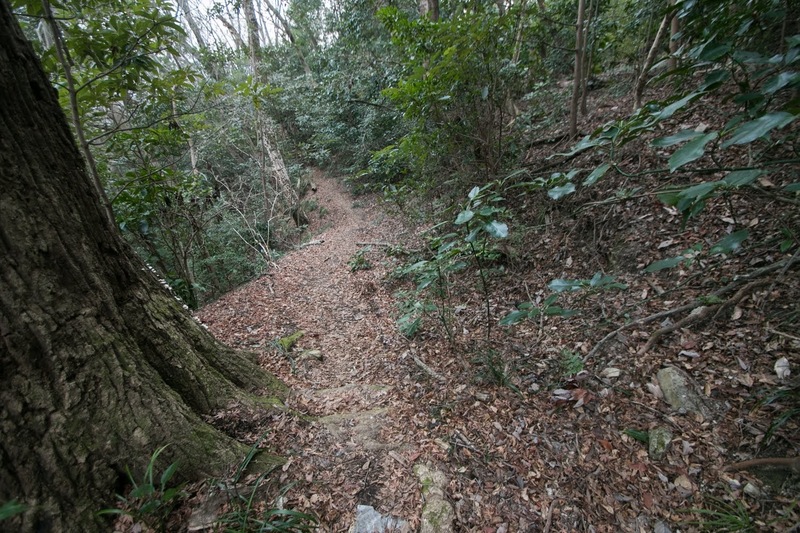 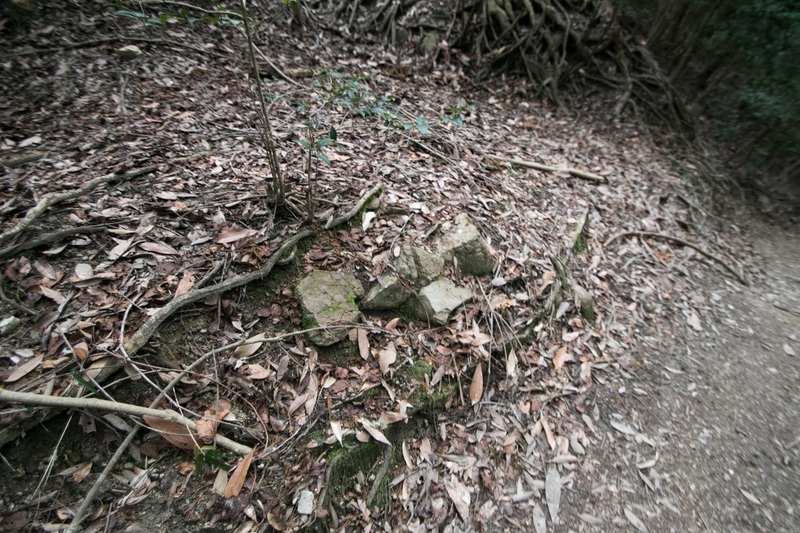 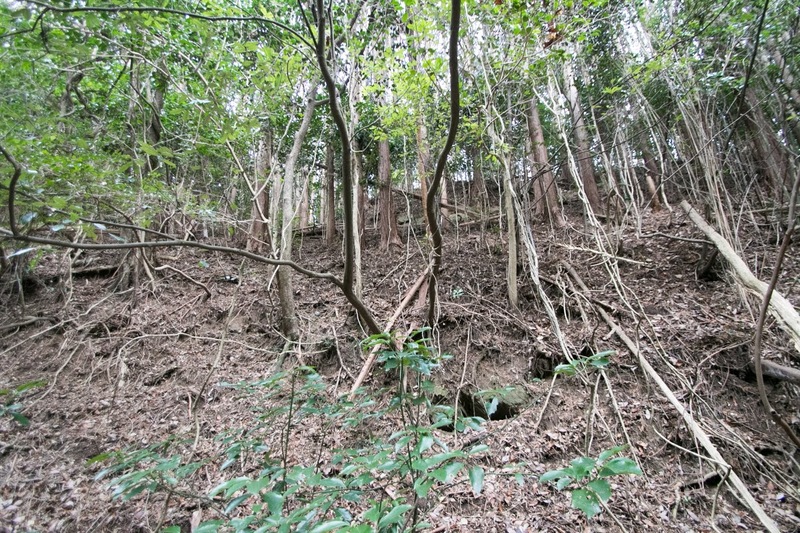 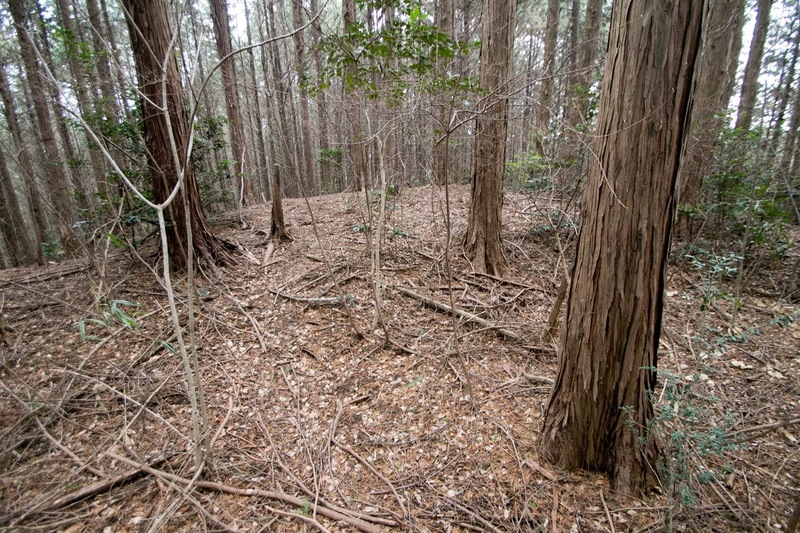 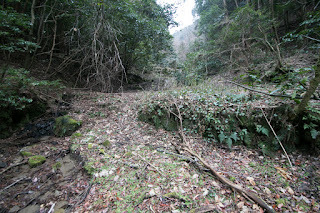 The central area is used as the inner temple of Chogosonji temple and modified, but at the backward slope there still remain many terraces, and small parts of broken stone walls. 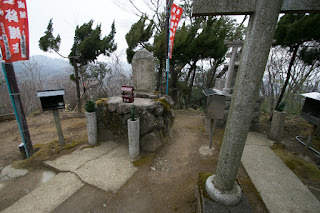 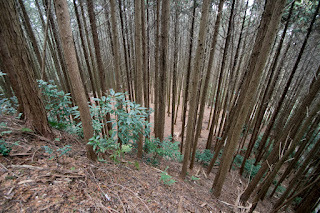 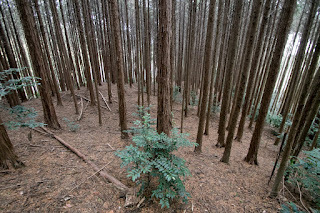 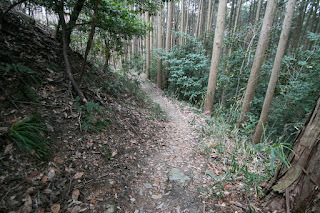 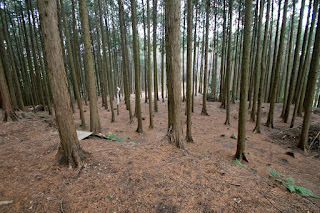 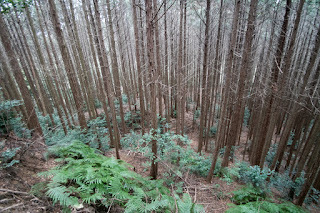 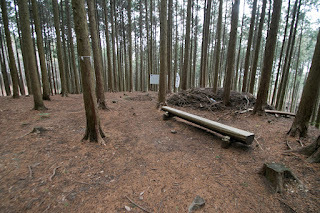 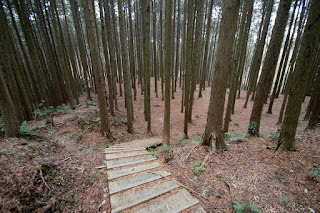 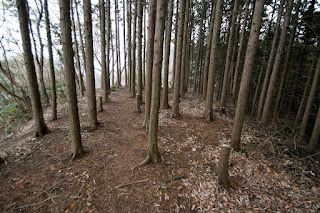 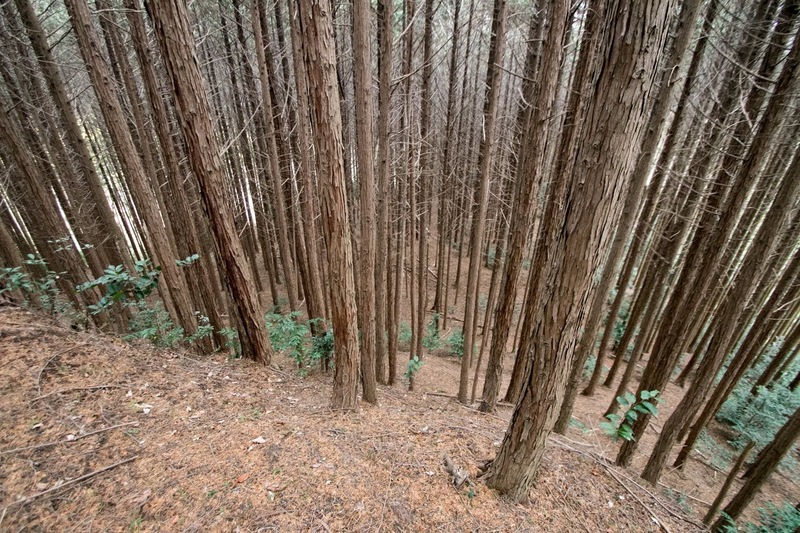 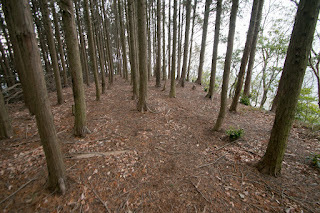 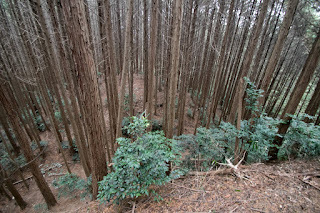 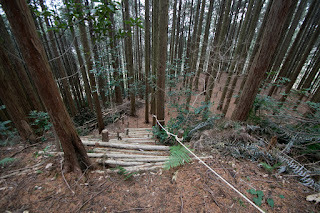 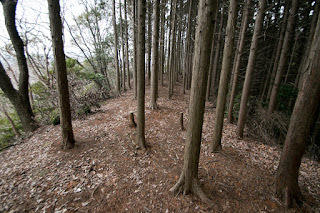 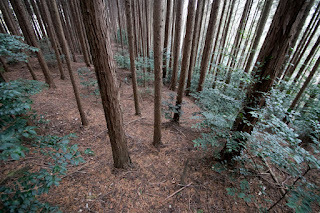 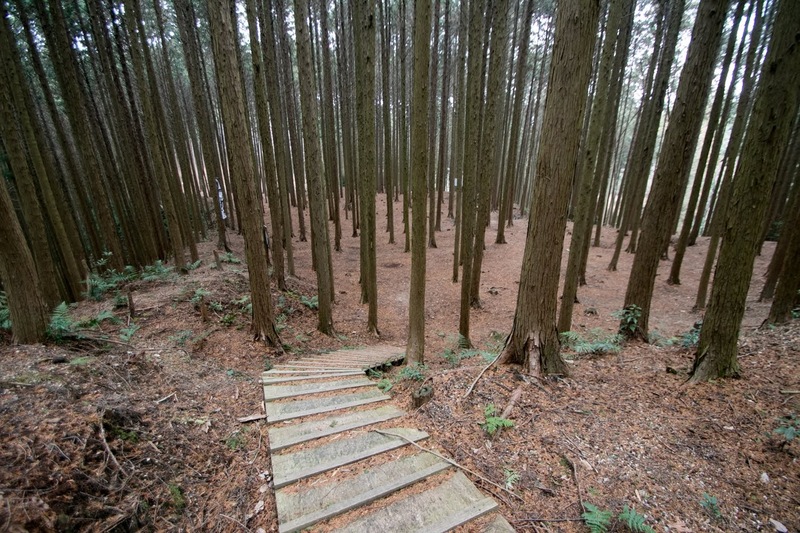 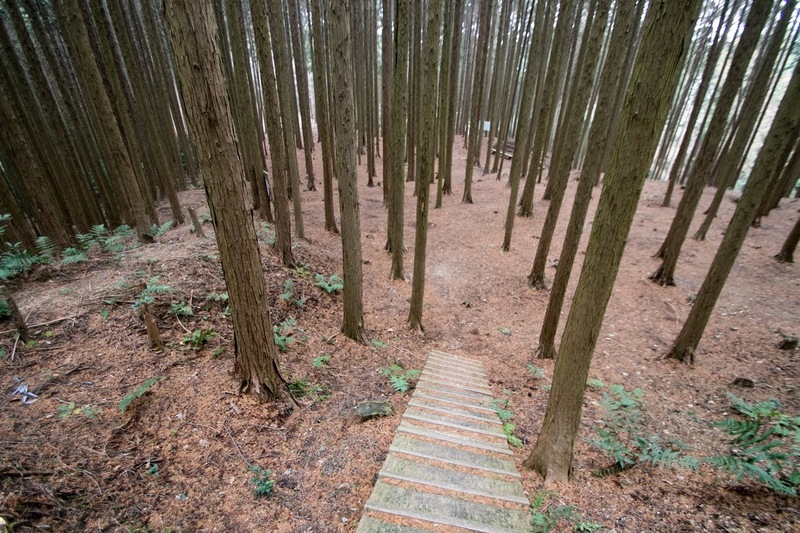 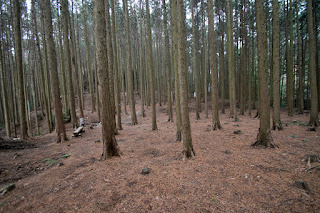 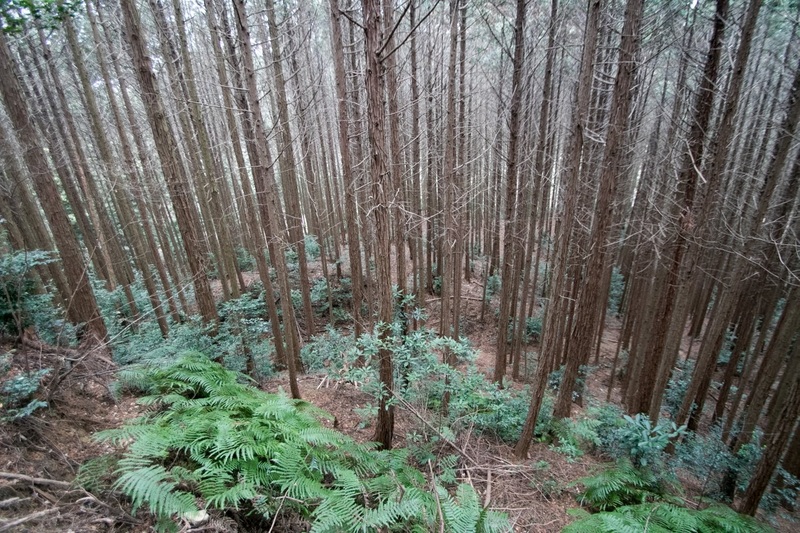 From the top of the mountain the scenery of Nara plain is well seen, same as 500 years ago. Bus ride to Shigisan temple from JR West Yamatoji line Oji station. 30 minutes drive from Nishi-Meihan Expressway Horyuji interchange.